With a hat-tip to the 2004 TV mini-series from Ewan McGregor and Charley Boorman. 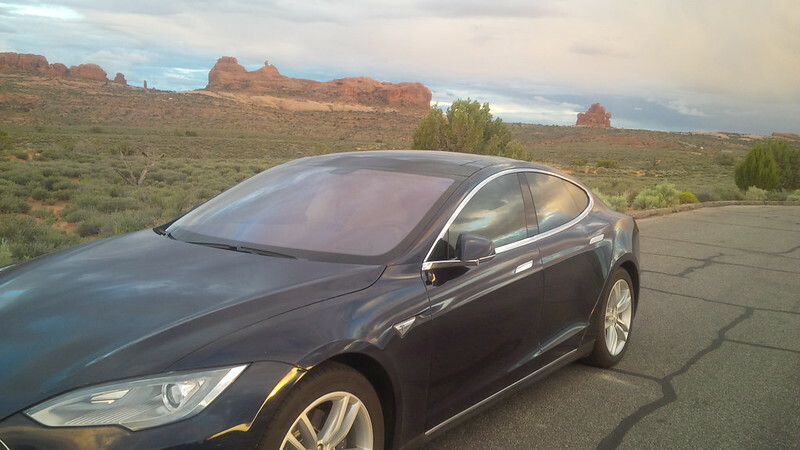 This is the fifth day in a series of posts written about our 2016 EV Roadtrip written in the same manner as our 2015 trip. Here, There, and EVerywhere Trip – Day 01, i.e. summaries written for each day of the trip, published each day, this time two months from the day of the trip. It may seem funny to some to have a summer trip published at the start of the Fall, think of it as some daily entertainment for those that are back in their offices thinking about their past summer trips that could have been or thinking about their next trip. Missed the previous day’s post, click here to read Day 4 of this trip. You’re just joining us on this trip? Click here for Day 1 and start from the beginning! So, what do we have in store today? 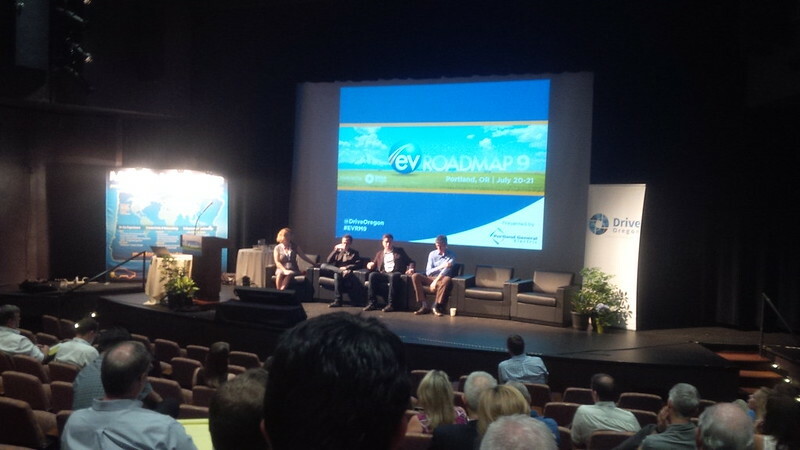 We’ve achieved our intermediate goal and attended EV Roadmap 9 conference at Portland’s World Trade Center. 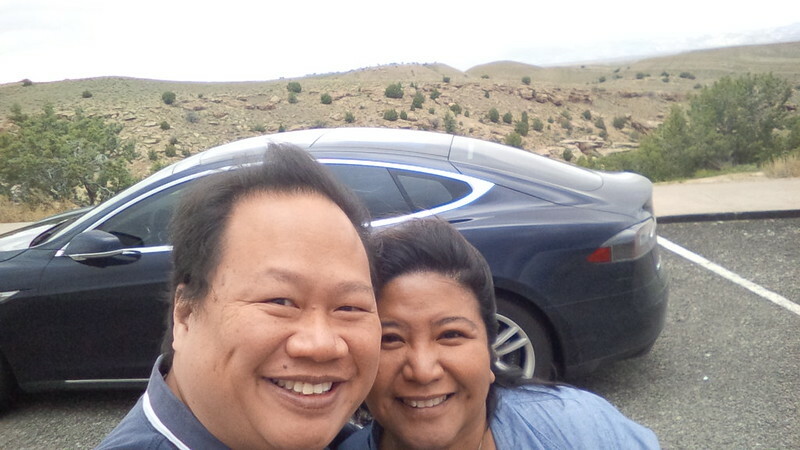 So, we’re now on our way to the Gigafactory… After we visit family in the Seattle area and Vancouver, BC area. Interestingly enough, it looks like we had no vampire drain last night. 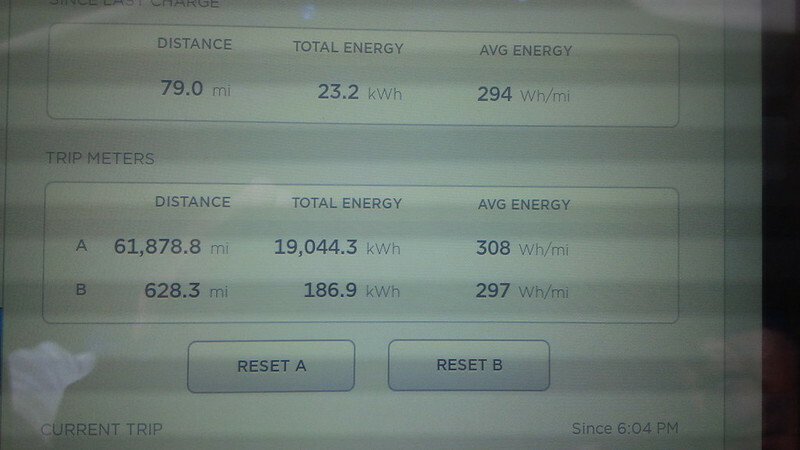 We rolled in with 195 miles of range and rolled out with 195 miles of range. 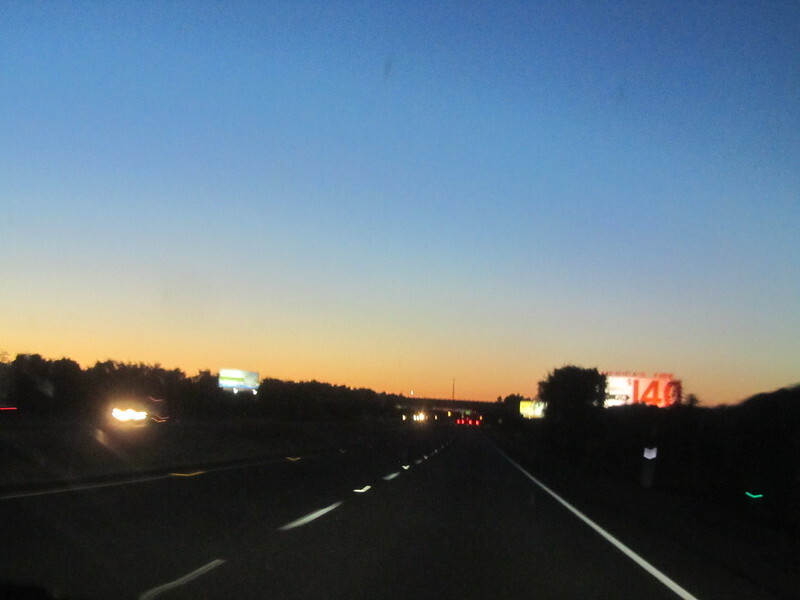 We had a little bit of a late start for our drive to Seattle. 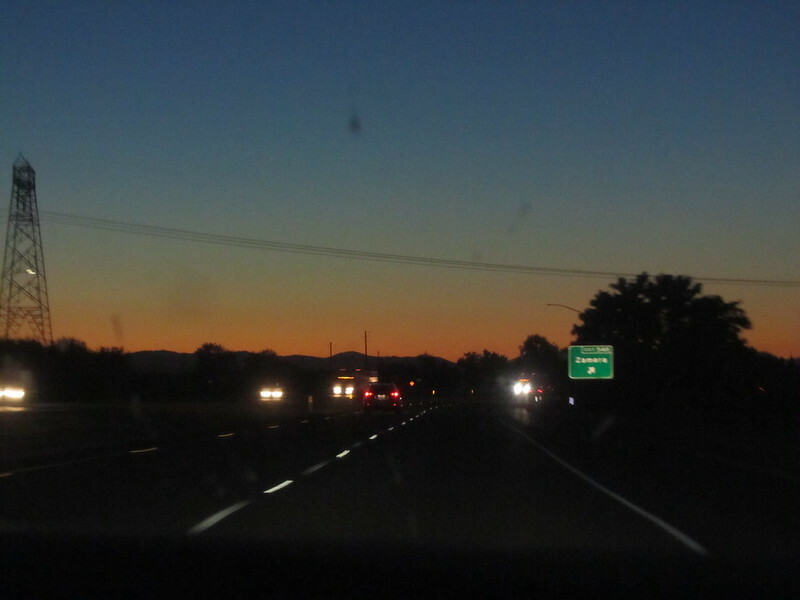 The distance between the two cities is rather short compared to our other drives that we figured that we should be fine even with the late start. 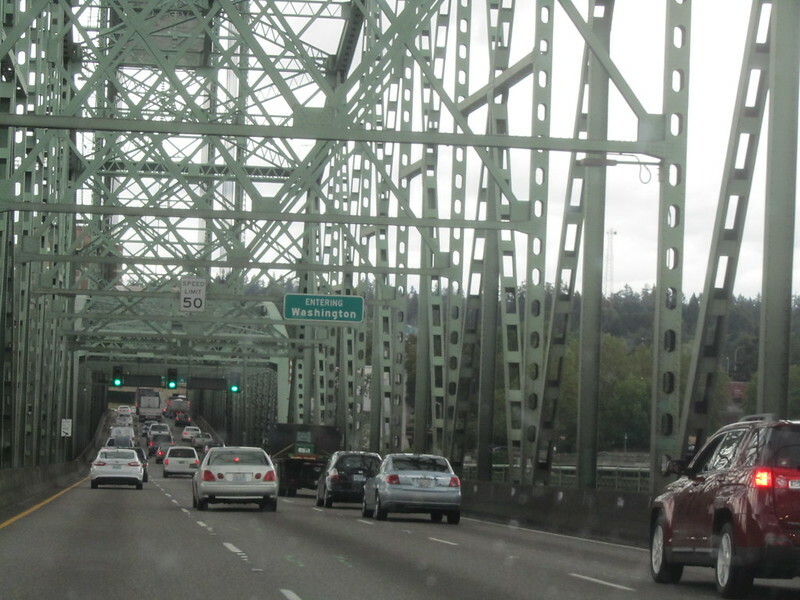 For those unfamiliar, Portland, OR is actually very close to the border with Washington State. 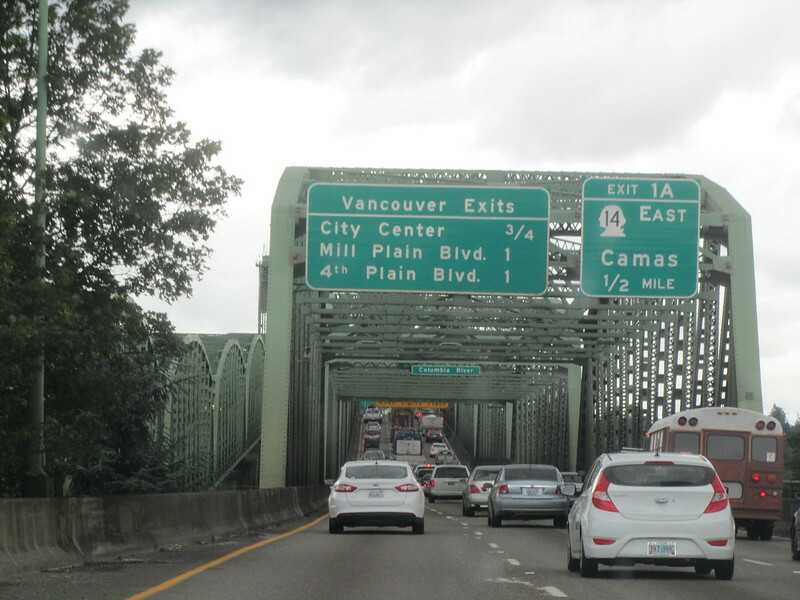 So, when we headed North from our hotel toward Seattle, it wasn’t long until we saw the following sign on our bridge crossing. 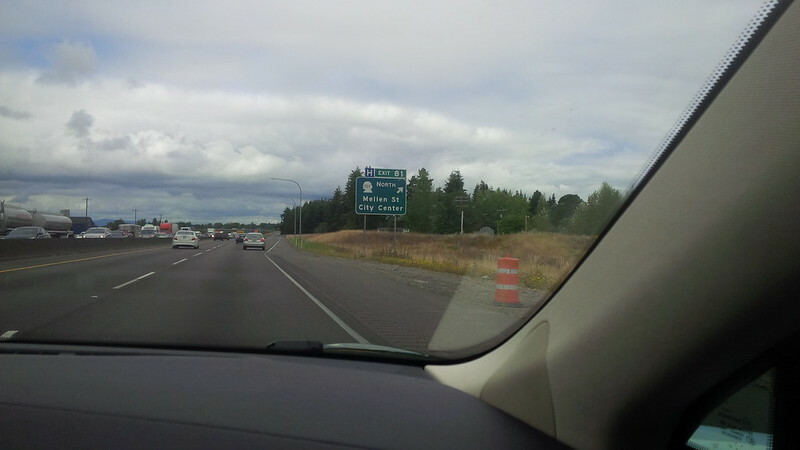 And we were greeted with signs for Vancouver… Washington. 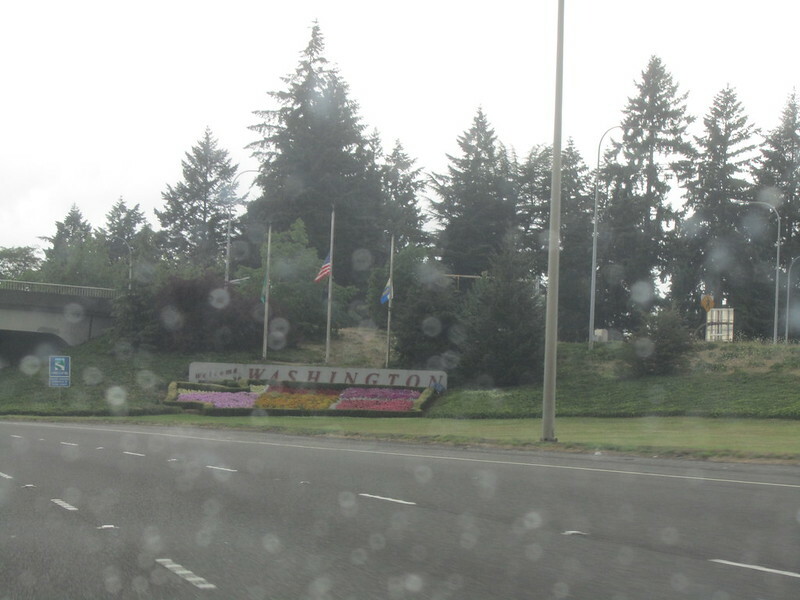 You know that the border crossing occurs often when the state sign is pretty understated. 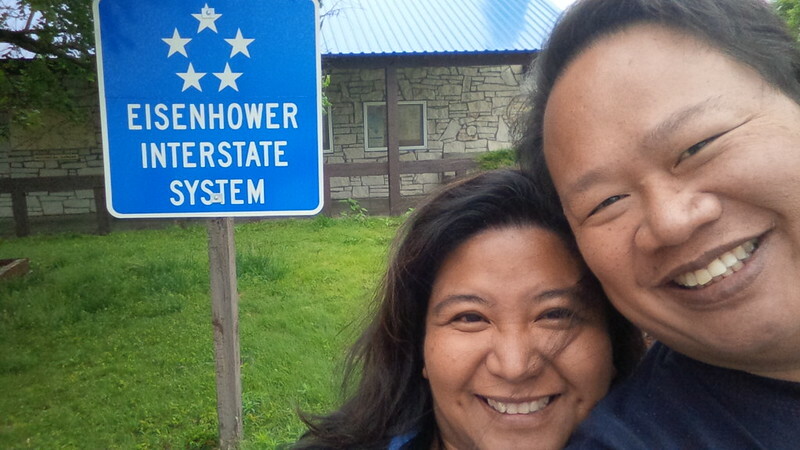 Not quite at the border, there was a better state sign. But the border was where the understated sign was. We actually encountered some rain on this part of the drive and were quite happy about that. 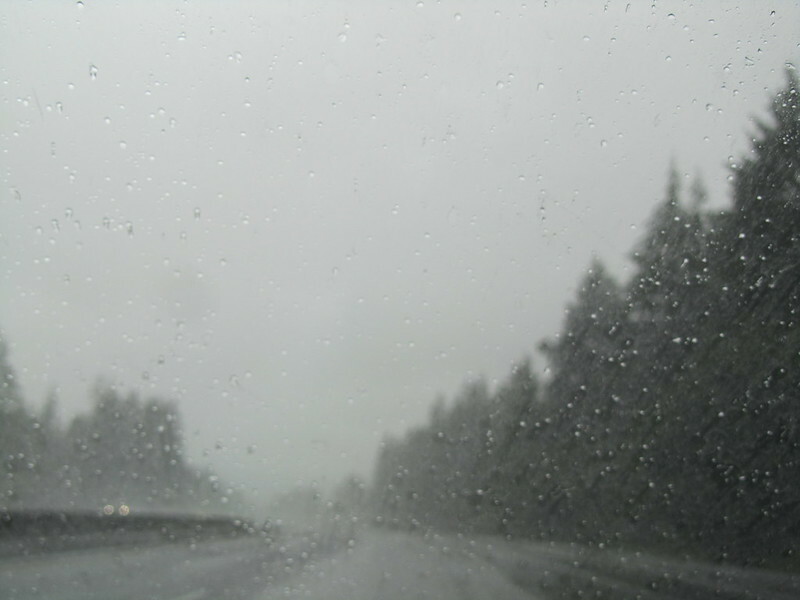 My expectations for a trip to the Pacific Northwest is to have some rain. As it was, we’ve had nothing but perfect weather. 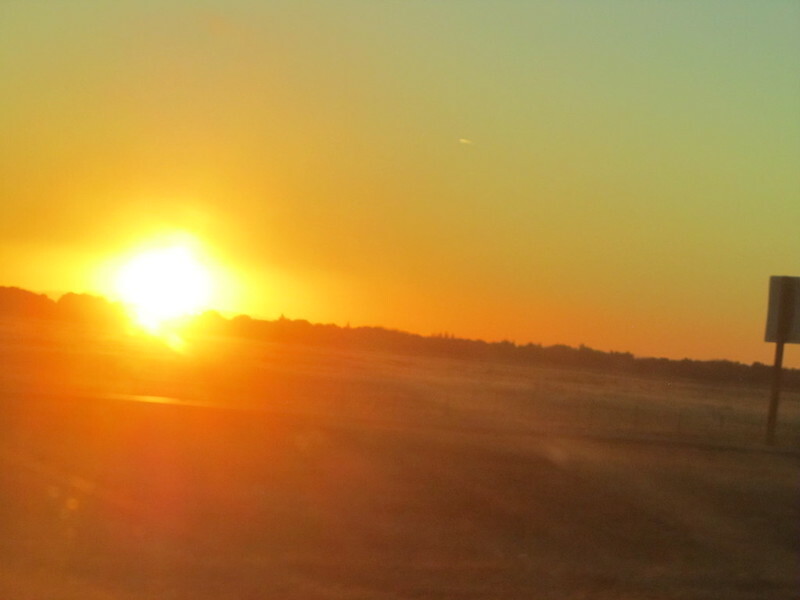 Apparently the rest of the country was suffering from a terrible heat wave. We were being chased down by a Red Leaf in Vancouver, WA. 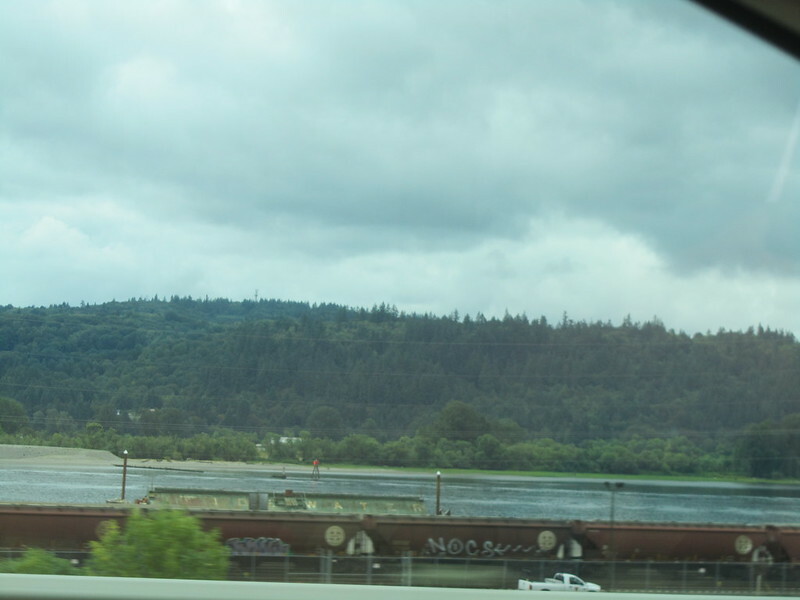 Still driving along the Columbia River, I think.. 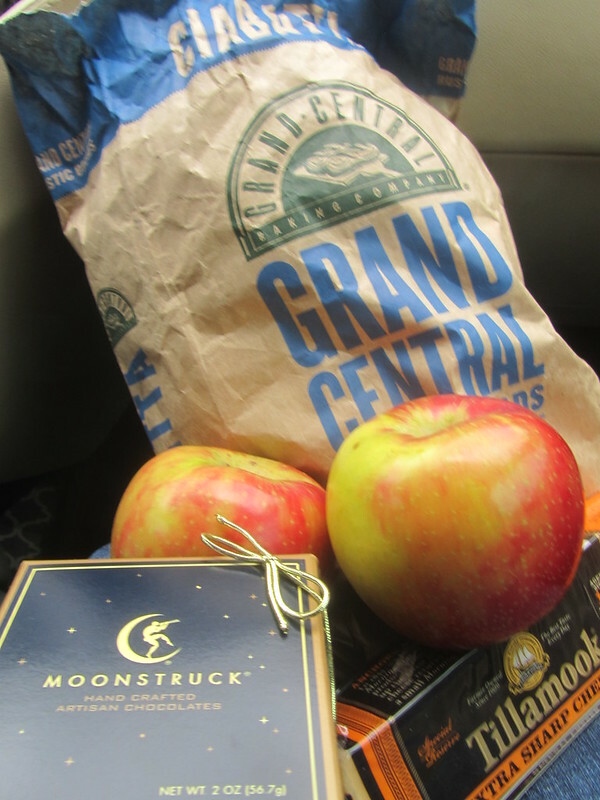 Thanks to MelindaV, we had some good local provisions to hold us in place during this drive. And we hit weather again. 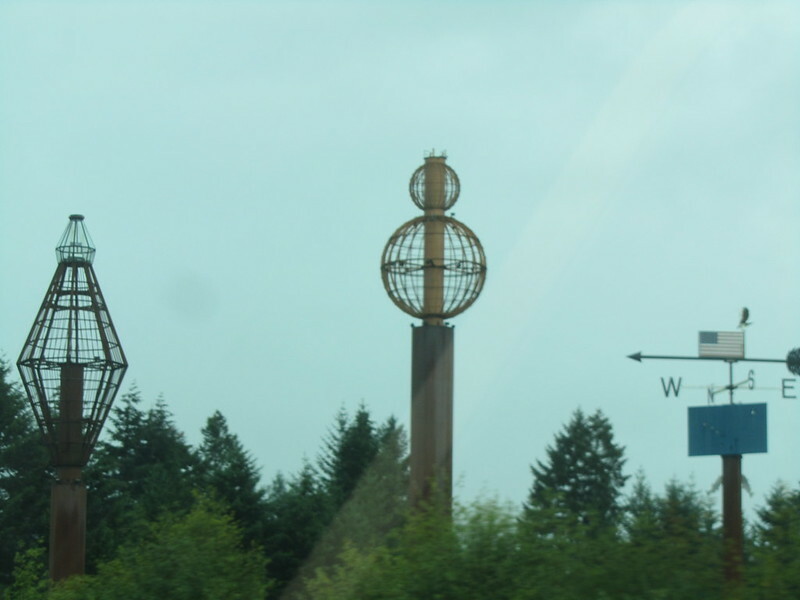 On the way to Centralia, spotted these interesting sculpture. Not sure whether it’s just aesthetic or functional, but looked cool. 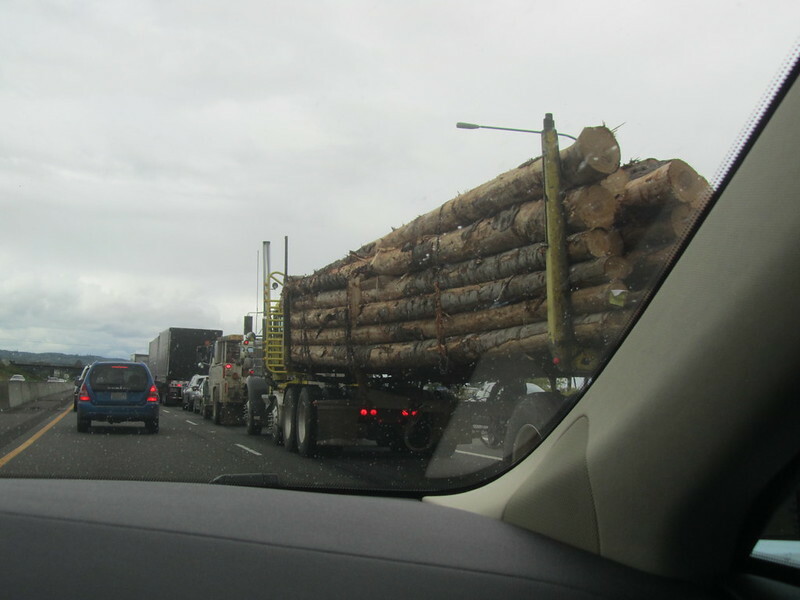 Logging trucks are not one of the things that we often see around Southern California. 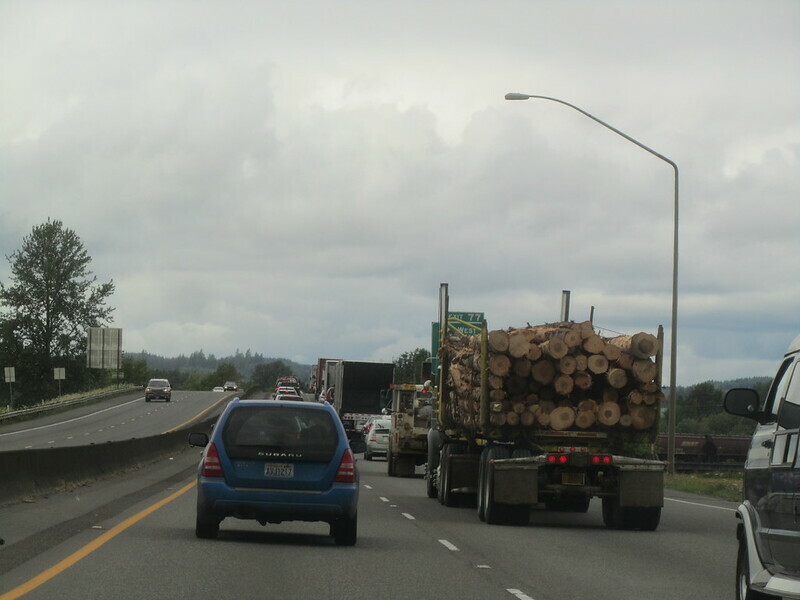 My better half made it her goal to try to follow the “logging industry” life-cycle on what we spot on the road. 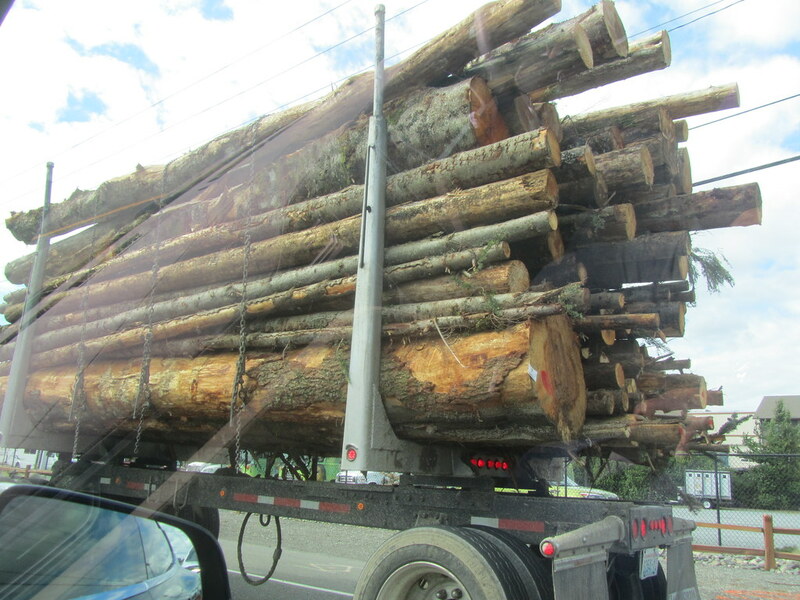 So, let’s consider this truck of cut trees as step one on this life-cycle plan. 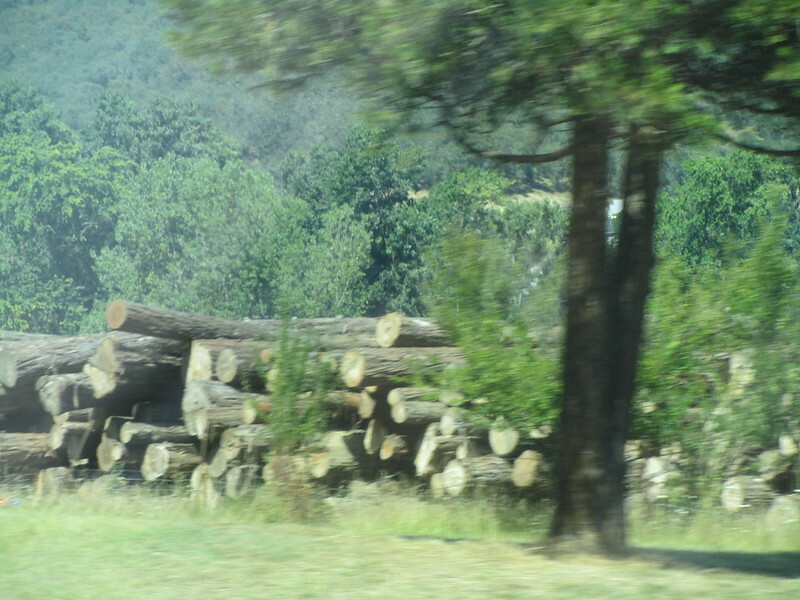 Our goal is to follow the wood through its process. In the meantime, though we had some provisions from MelindaV, we were nearing one of the places that Chef Jenn Louis recommended. 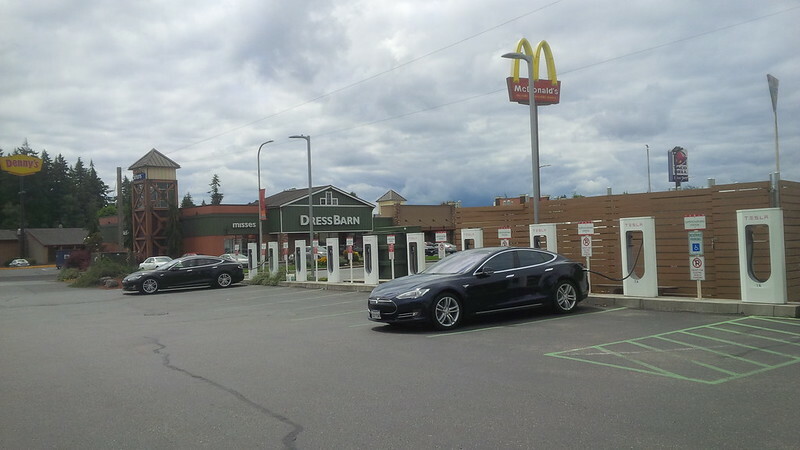 It was a Mexican restaurant in Centralia, WA that was about a mile from the superchargers. 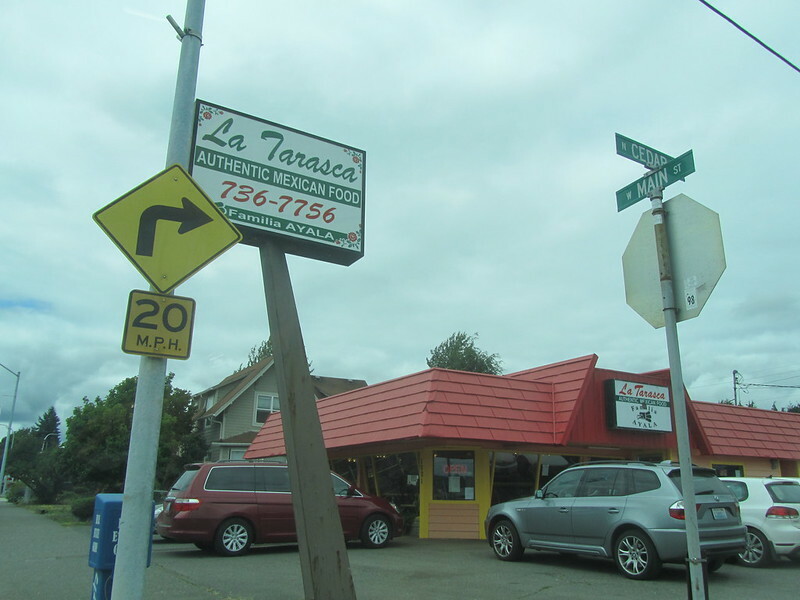 As I wrote about yesterday, Chef’s usually know good places to eat, so we took her suggestion and headed to Downtown Centralia, WA. 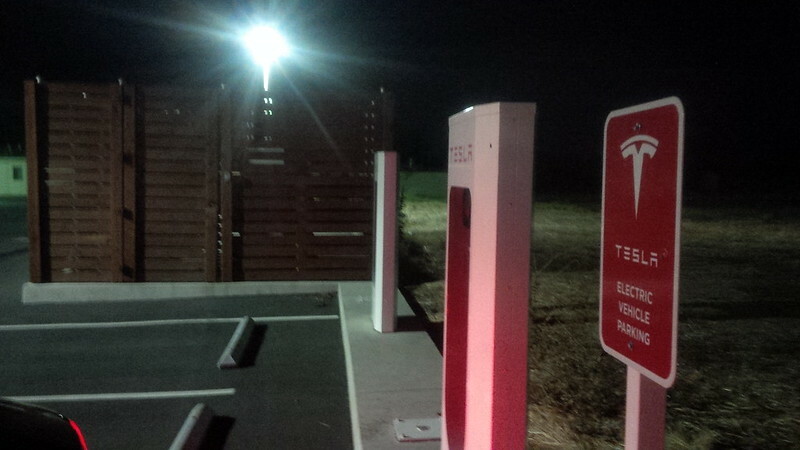 The exit was one before the Tesla Supercharger in the same town. 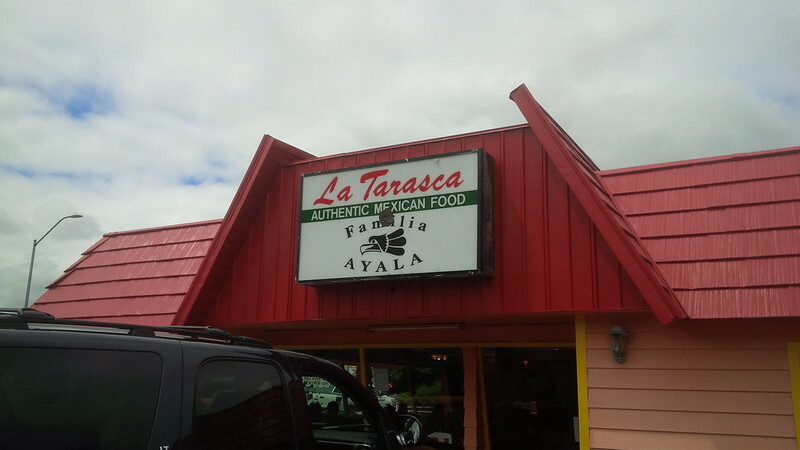 La Tarasca is apparently an institution in Centralia (1001 W Main St, Centralia, WA 98531.) They’ve been open since 1997 and only a little over a mile away from the supercharger, a must stop. 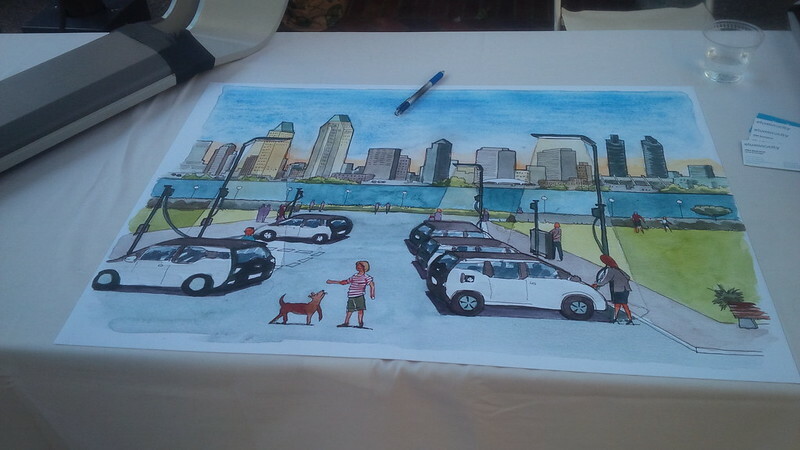 Some may supercharge and take local transportation to the restaurant and back. 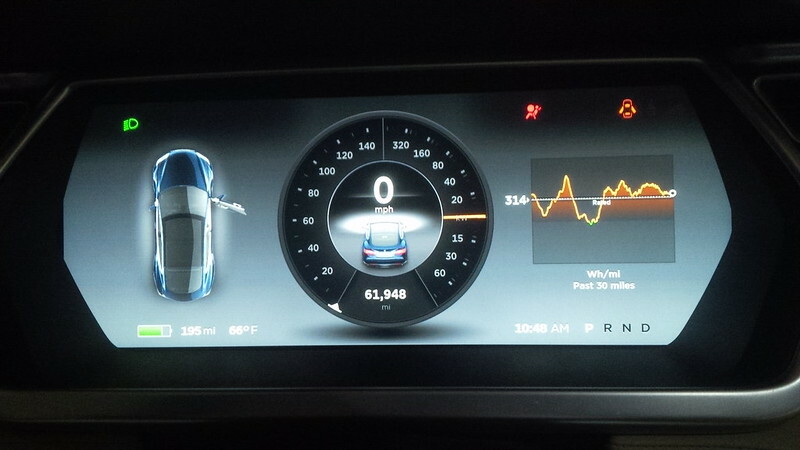 I would suggest to just stop, enjoy the meal, and then head over to the supercharger. 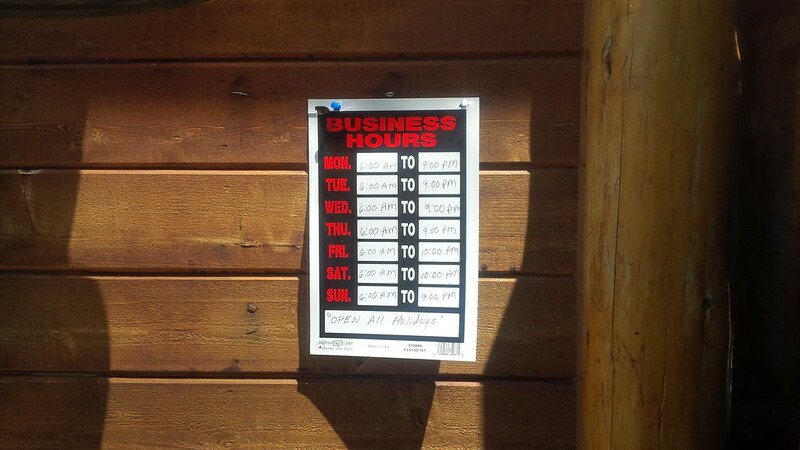 Here are the hours of operation for La Tarasca. It was good that we decided to have lunch here on Friday rather than try to squeeze them into the return drive. 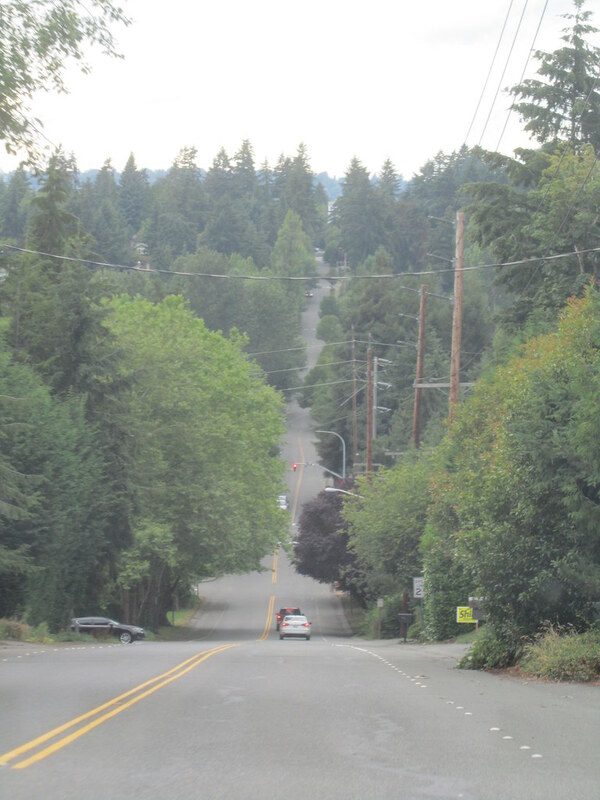 We plan on leaving Vancouver and head South on or around Tuesday and expect to pass Centralia on that day. 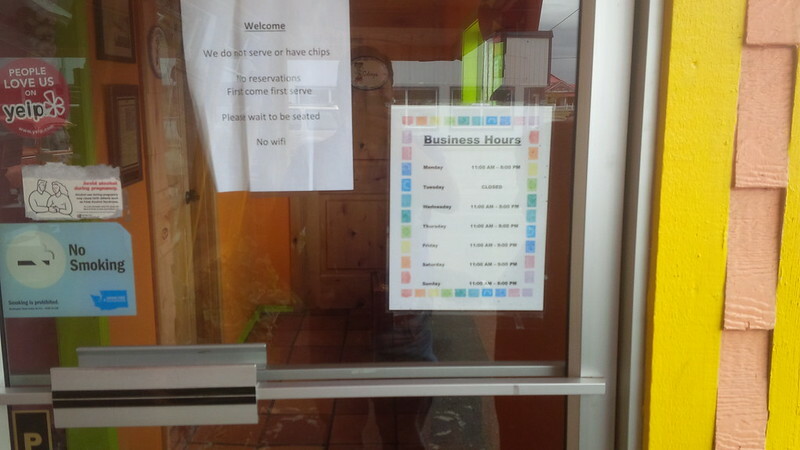 It’s also important to note the sign that lets customers know that they do not serve “chips”. 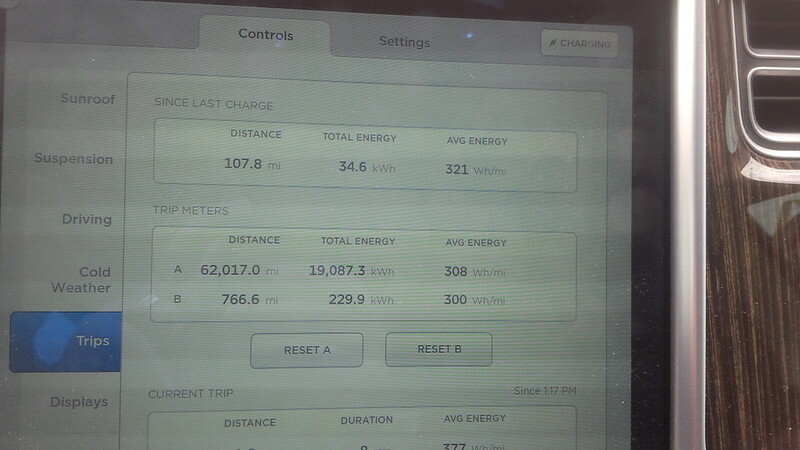 We parked at the restaurant to eat lunch with plenty of range left on the battery. 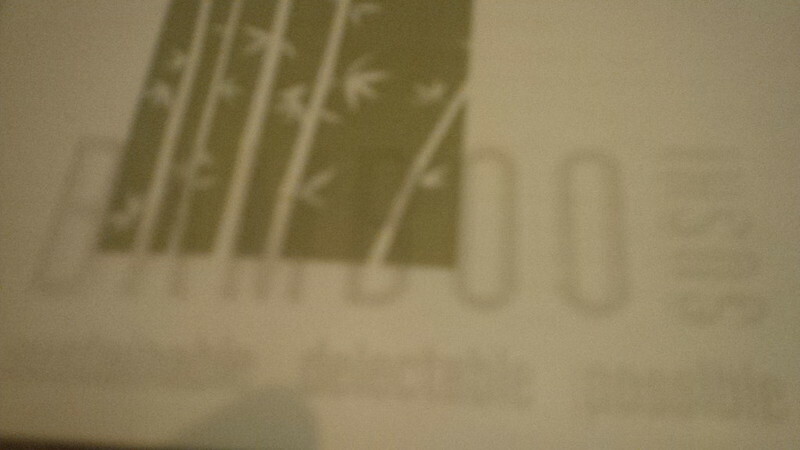 So, we ordered our meal. 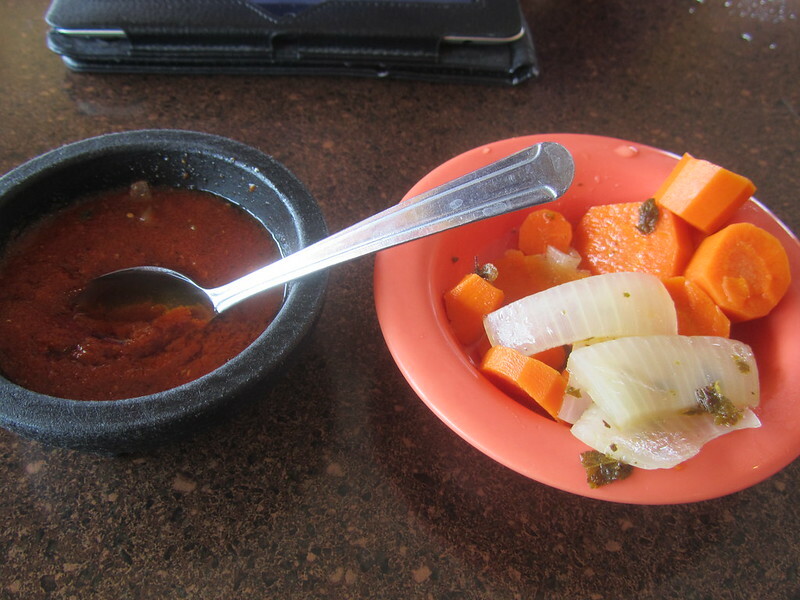 Instead of chips, they brought out these pickled vegetables. 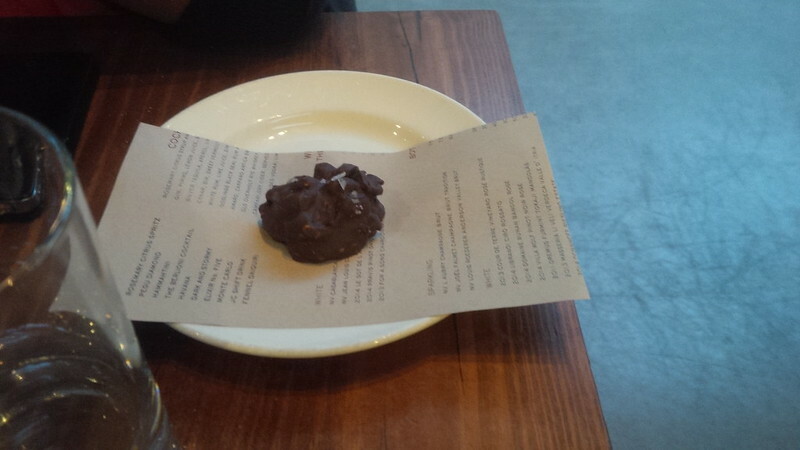 I tried one, it was ok, but it gets a big thumbs up from the better half. 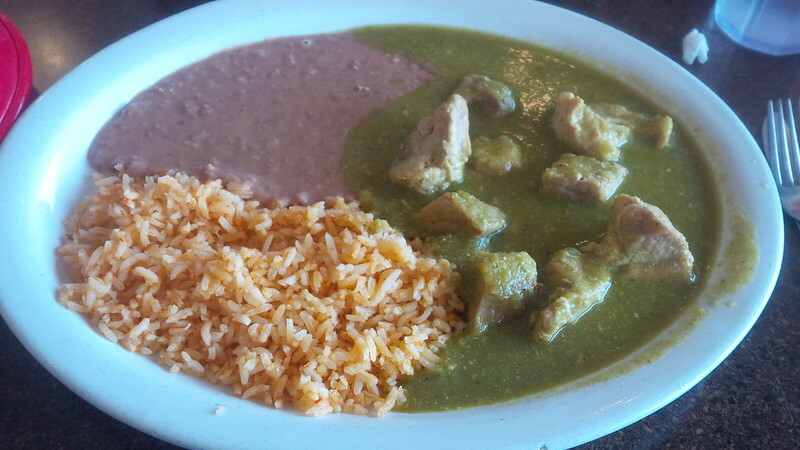 These are provided with freshly made corn tortillas, and not flour ones. 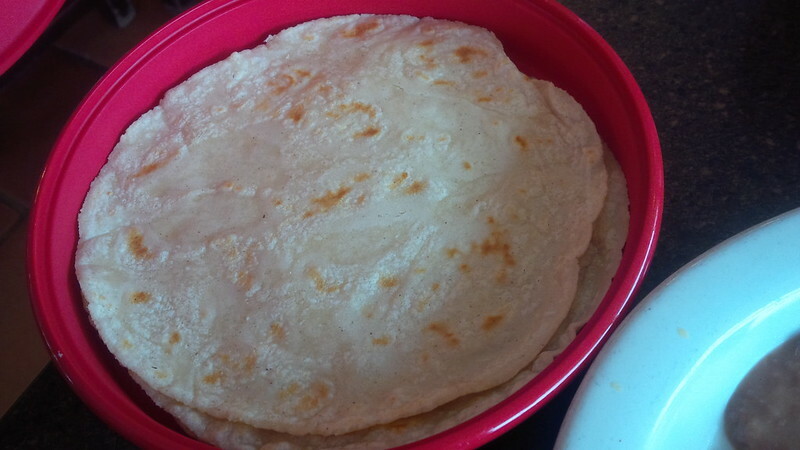 Another “house rule”, no flour tortillas. 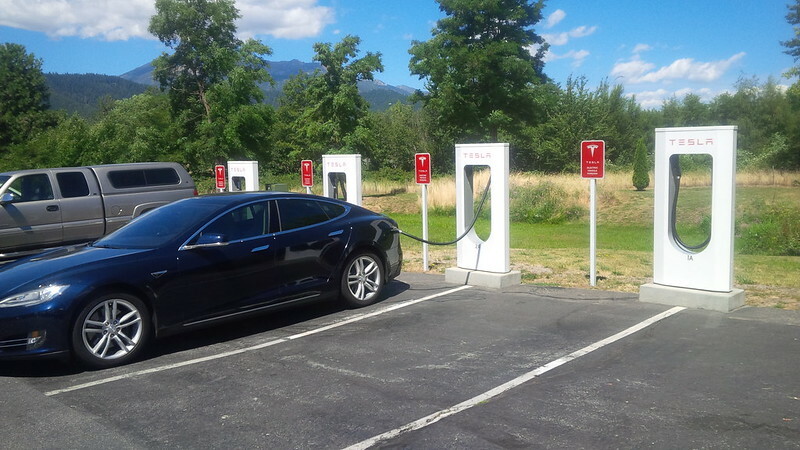 It was a filling meal and after fueling ourselves, we headed to the superchargers at Centralia (located at the outlet mall). 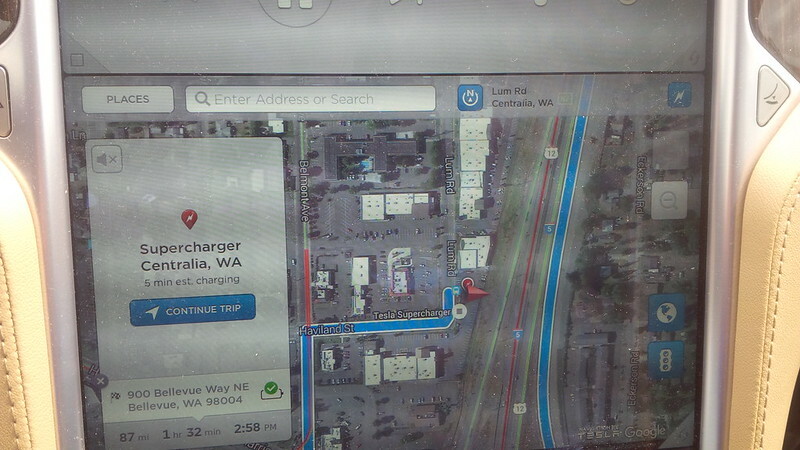 We took local roads to the Centralia Supercharger as it was about a mile away from where La Tarasca was located. We had enough charge to get to our next stop, which was our hotel for the night. 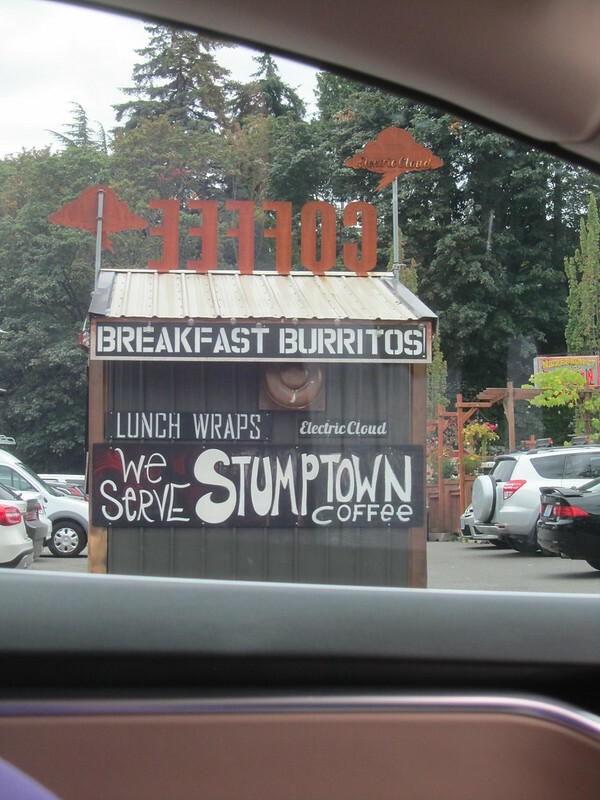 But not enough to do our driving around the Seattle area. 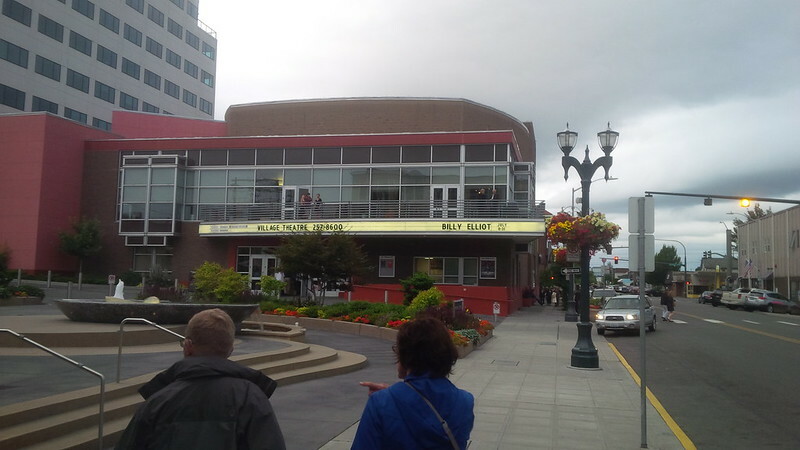 We had a schedule to keep and wanted to have enough time to check in to our hotel in Bellevue, pick up our niece from Summer Camp in Seattle, and then drive up to Everett to see Billy Elliot, the Musical. 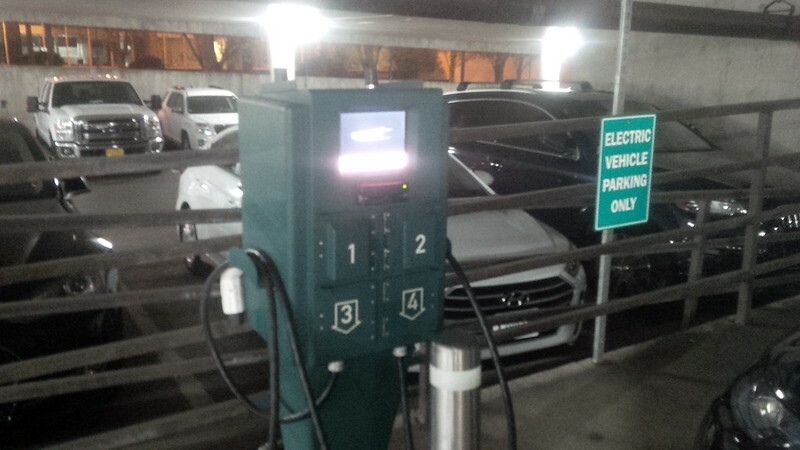 We chose our hotel in Bellevue, the Hyatt Regency Bellevue, for the evening because it had some J1772 chargers according to Plugshare. 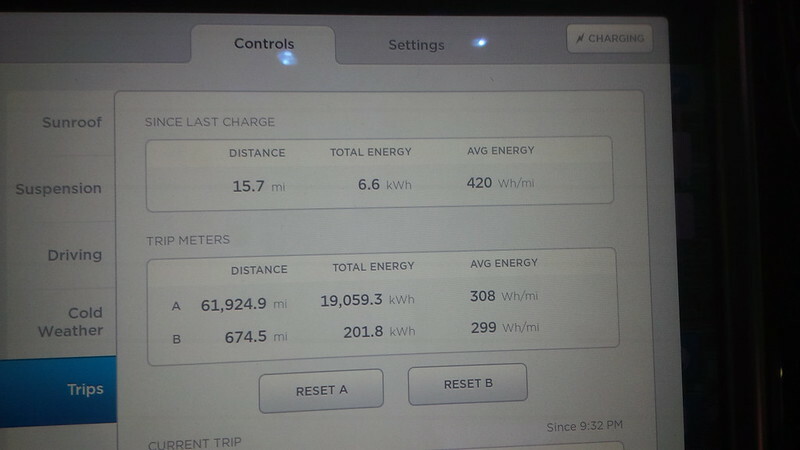 The difference in cost for the hotel stay versus hotels on Tesla’s destination charger network made it worth it to pick our hotel, even though we would have to pay fees to charge on the J1772 at that location. 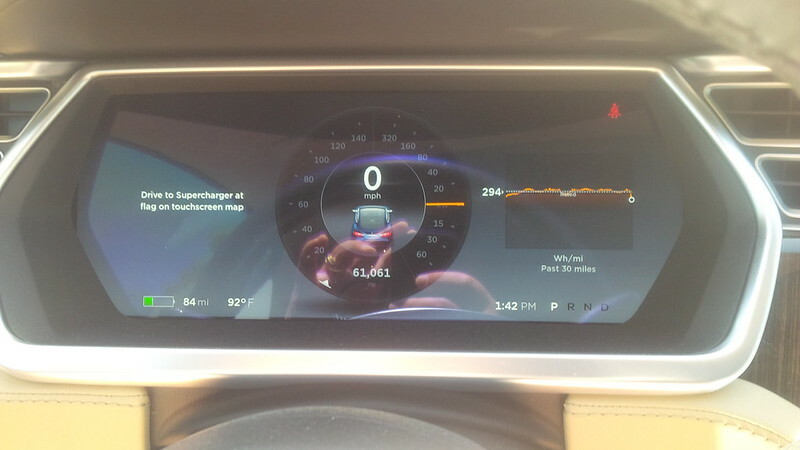 Since this was the start of a Summer Weekend, We noticed that this was a busy supercharger and we were joined briefly by a fellow Californian in a Signature Red Model X. 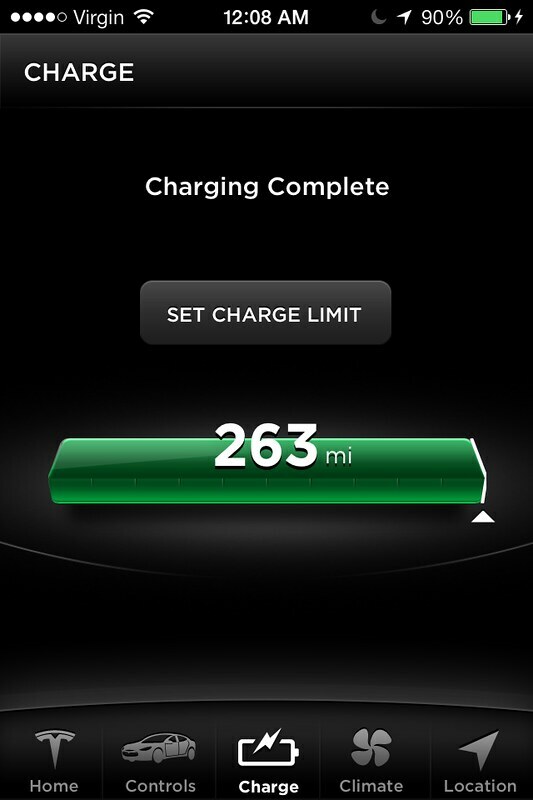 To minimize the Level 2 charging and to ensure that we have enough “driving around town” charge when we got to the Seattle area, we range charged at this supercharger. As we mentioned earlier, we need to travel between Bellevue, Seattle, and Everett for our evening plans. 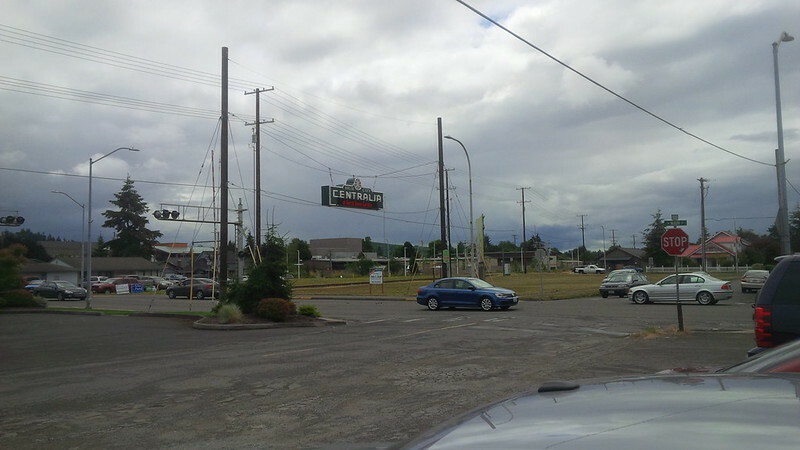 We did a little outlet shopping at Centralia while the car charged. We were going to be hanging out with our niece for a few days and picked up a present for her and a few things for us. 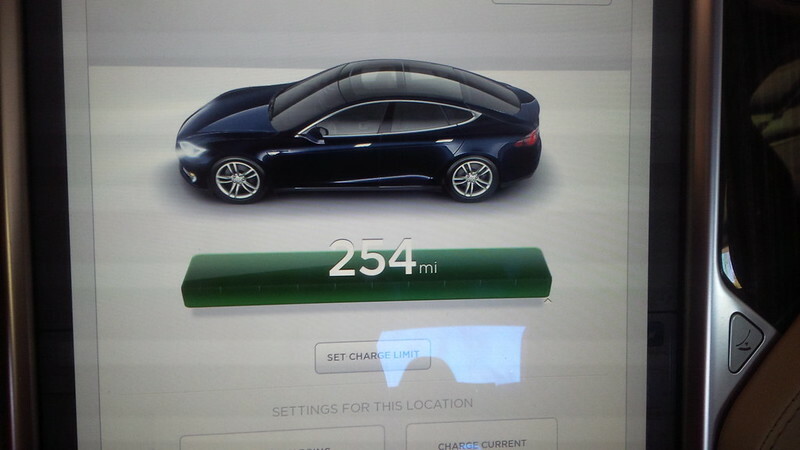 So, with our battery near capacity, we rolled out of the supercharger to Bellevue. 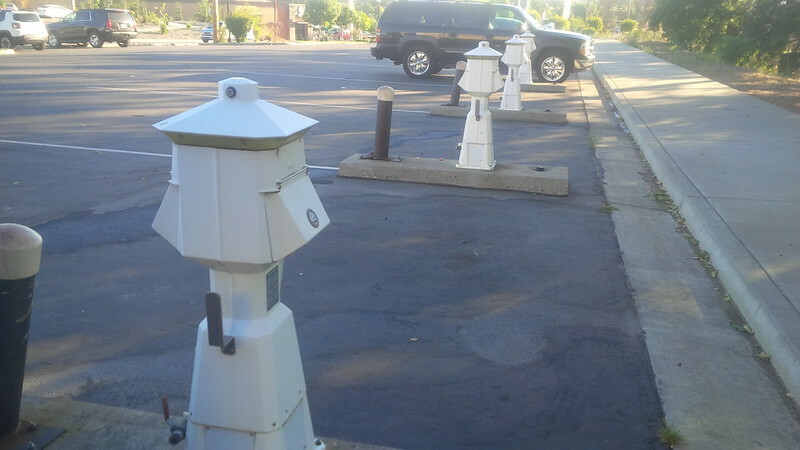 We meet up with traffic in Olympia, Washington. Spot a California Jedi of presumably Hispanic origin. 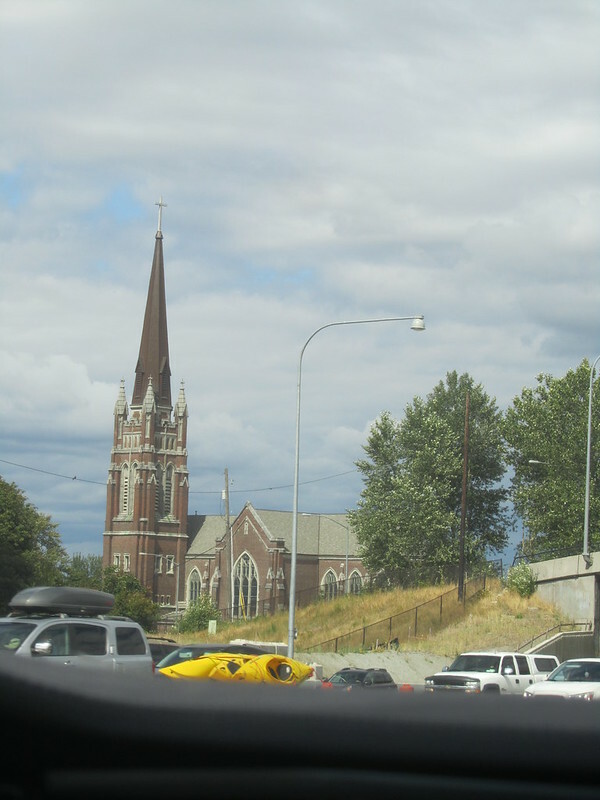 And this beautiful church on the other side of the freeway. 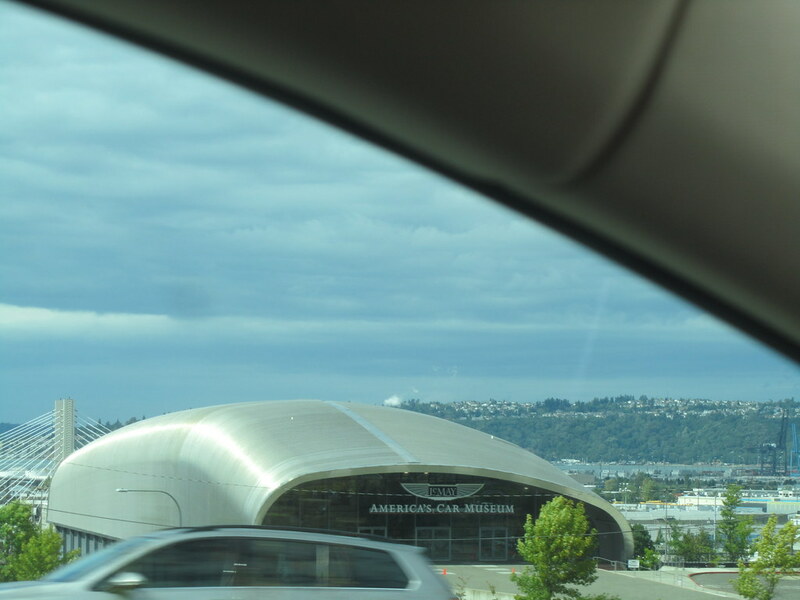 We pass the Tacoma Dome, the now departed Seattle Supersonics (now the Oklahoma City Thunder), had played there for a season while the Key Arena was renovated or built, I don’t remember my Sonics’ history. Looks like there’s a cool museum that we’re skipping. Another lumber truck for the “logging industry” life-cycle project. 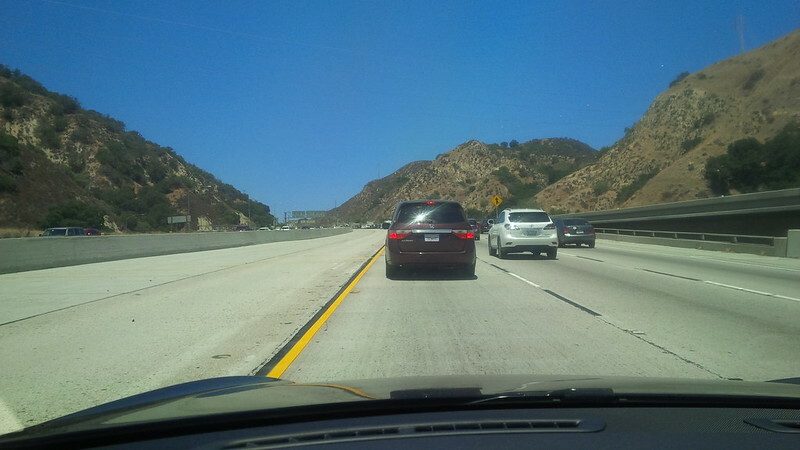 We were lucky because it looked like a lot of the traffic was headed South and not North. 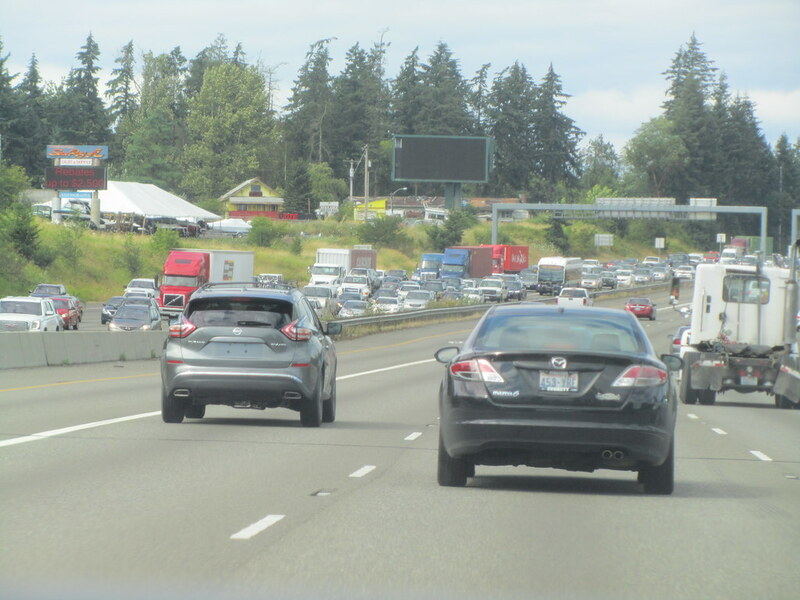 We did hit some traffic, but luckily Washington also use HOV lanes with a 2+ person count like California, so I used those lanes. We made it to Bellevue. Seems like a nice looking city. I’m not sure if I’ve ever been here before, but now I can say that I have. 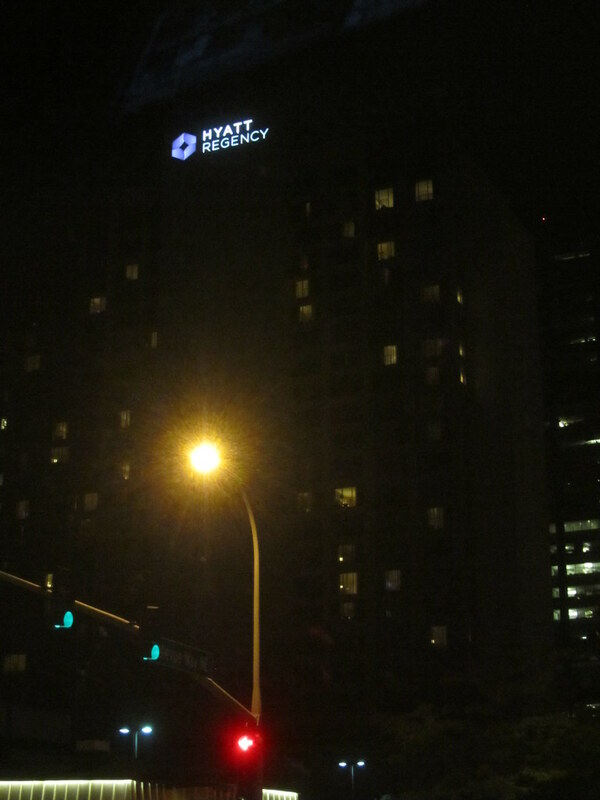 We arrived at our hotel in Bellevue with enough time to check in and get our room assigned. 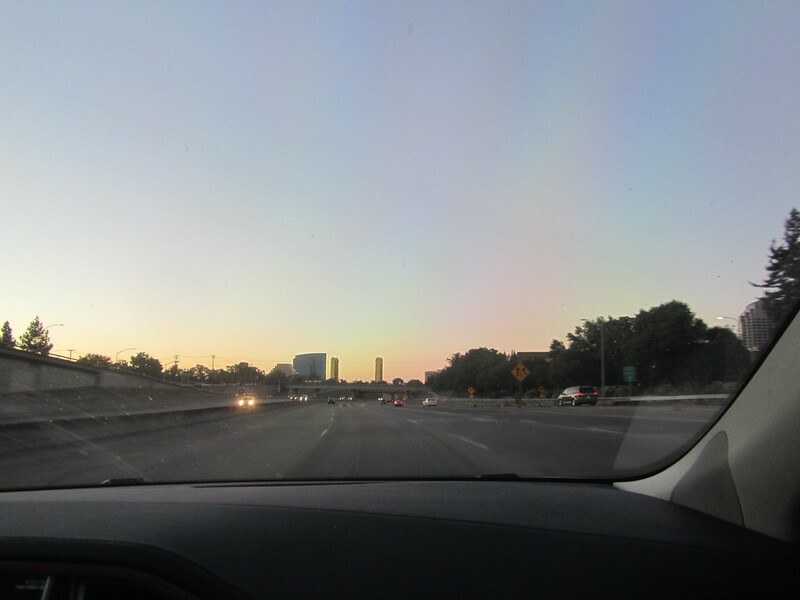 But we were nearing the time we needed to depart to pick up our niece from her dorm. 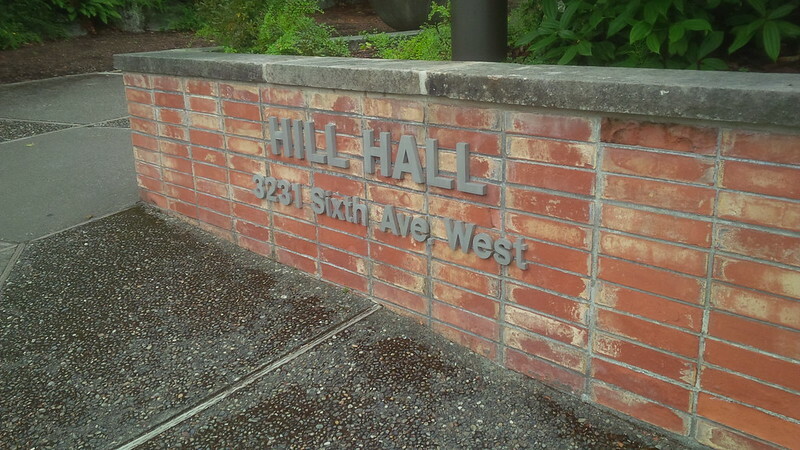 We headed to her camp which was using a dorm from Seattle Pacific University. 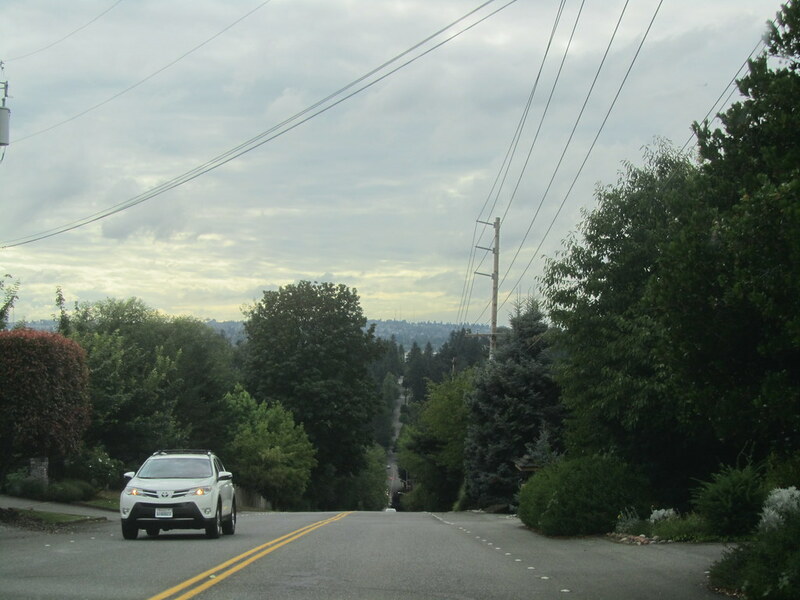 First we had to traverse Bellevue and it’s interesting to see so many trees interspersed with the city. 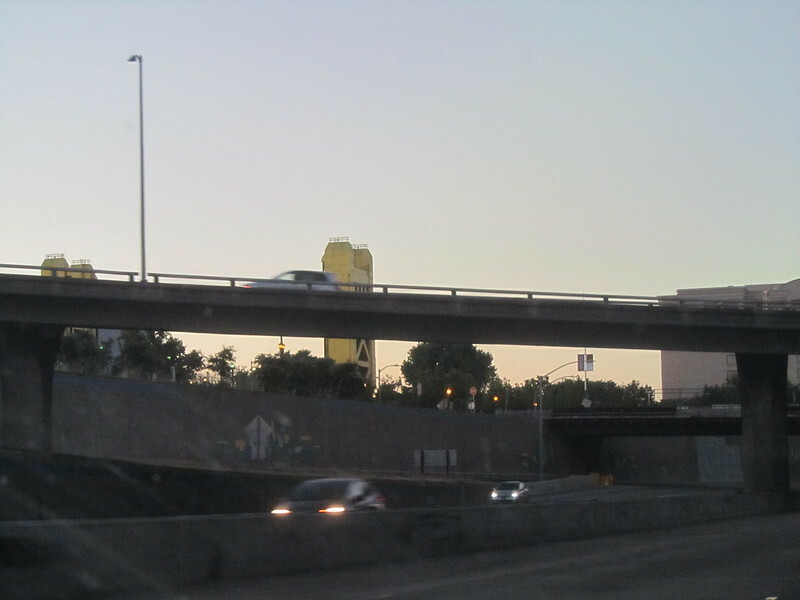 Considering all the building off the freeway, I didn’t expect this much foliage. 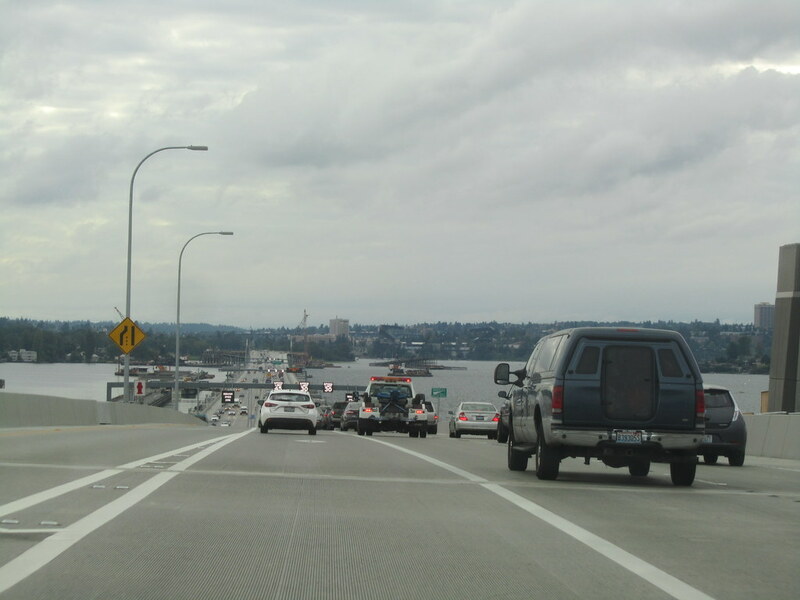 Original estimates had the drive at a leisurely 30 minutes or so, but the estimates changed drastically when we were getting on the bridge connecting Everett with Seattle, we ended up taking about an hour longer to traverse the distance because of an accident on the bridge. 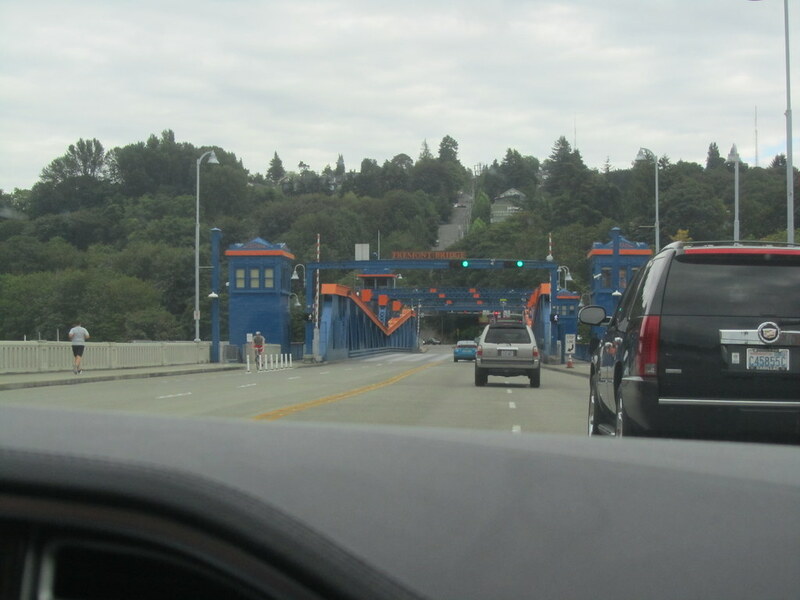 Additionally, this was a toll bridge, now there was a way to sign up as a visitor in the area to at least pay for the tolls like a resident before getting a fine. So I made a mental note to fill that out. The system was called GoodToGo and one should consider signing up for a visitor account before heading in, that minimizes your toll costs. 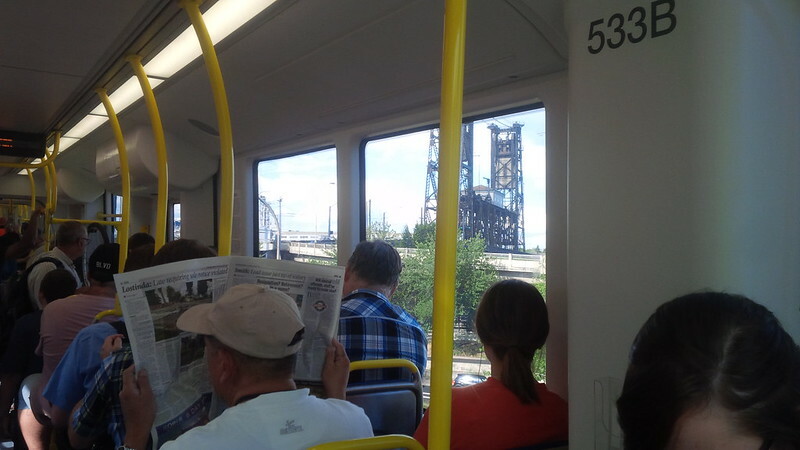 Seattle traffic was pretty bad. 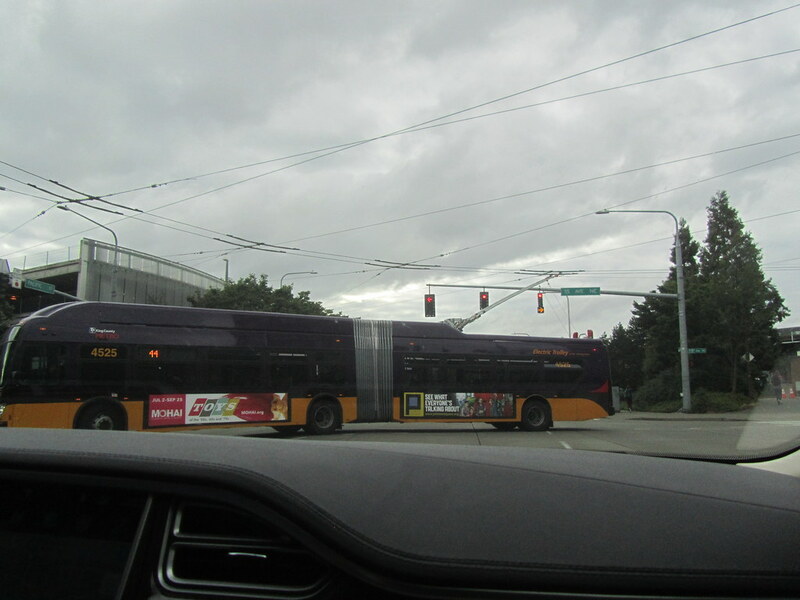 Spotted traditional electric trolley buses with the constant power connected overhead rather than full EV buses with its own battery pack like the BYD ones at the conference the other day. 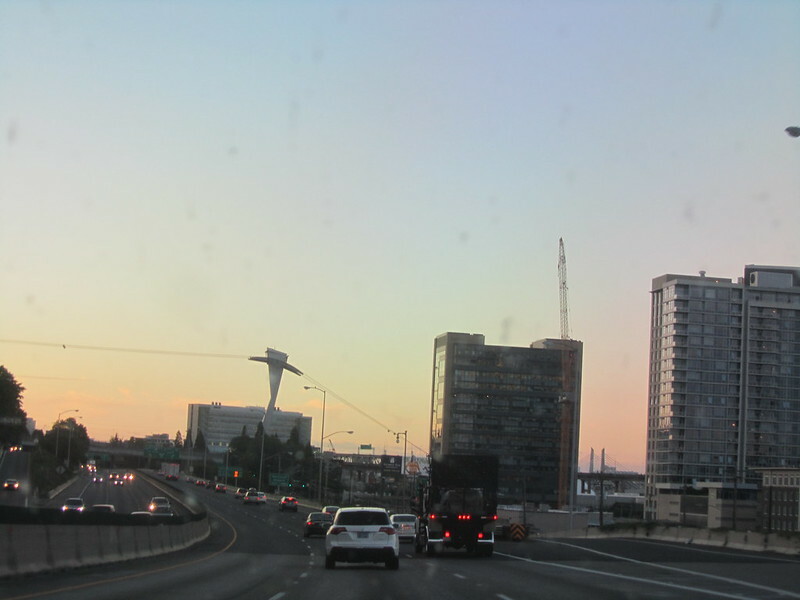 We pass through some interesting parts of Seattle to get to our niece’s dorms. 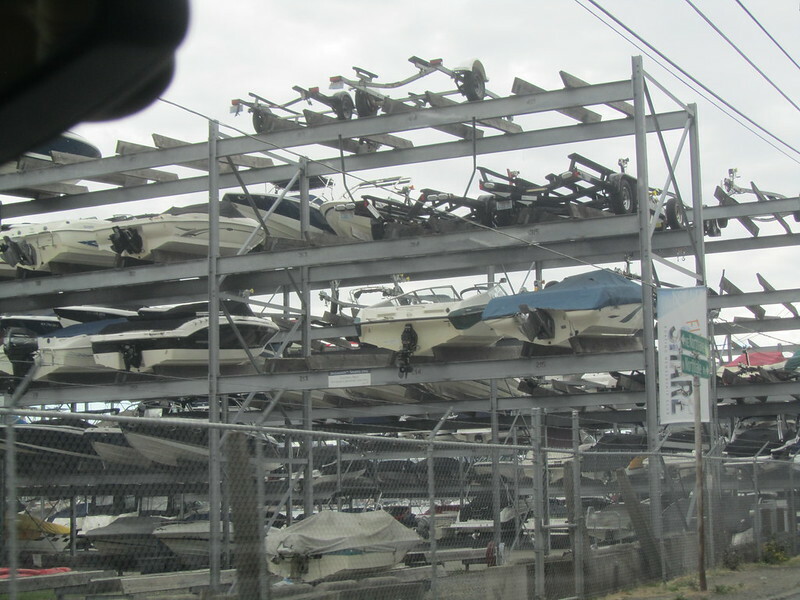 Looks like some boats are parked above ground. And after the traffic filled journey, we make it to her dorm. 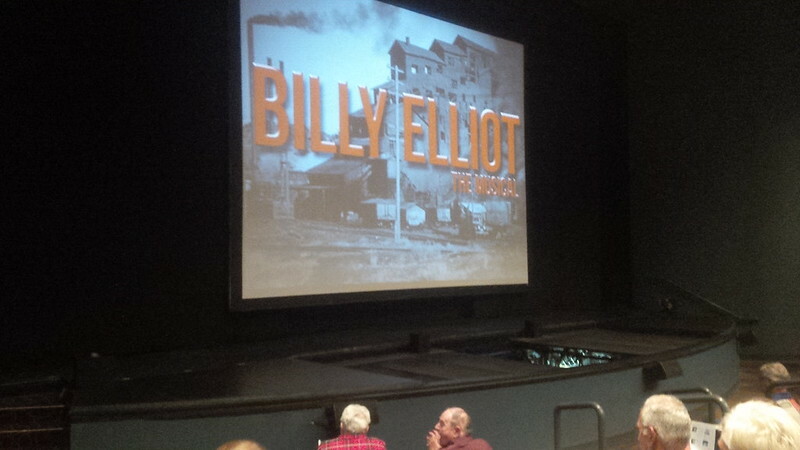 Our plans for the Seattle area for this evening is to catch a musical, Billy Elliot at Everett Washington. Still a little bit of a drive from her dorm, but we can make it. We’re not proud of it, but we fed her (and ourselves) burgers and fries. I’m a big fan of the spicy fries that Five Guys Burgers produces and am glad to see the quality is the same all over the country. 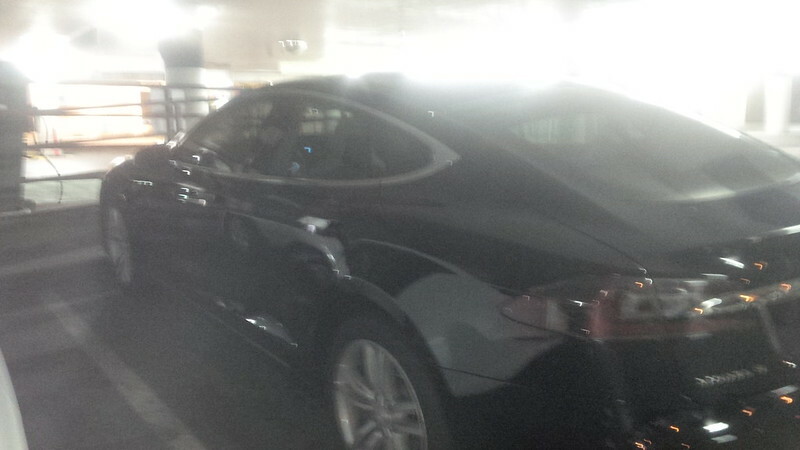 At the parking structure for the play, we found our WA state twin for our Model S and parked beside it. 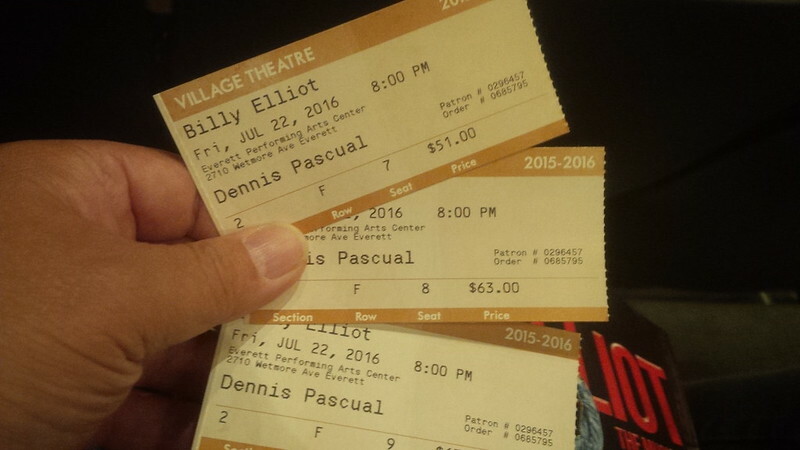 Crossed the street in Downtown Everett to the Village Theater and found our seats with ten minutes to spare. We figured to take our niece out for a nice musical on her night of freedom from her summer camp. 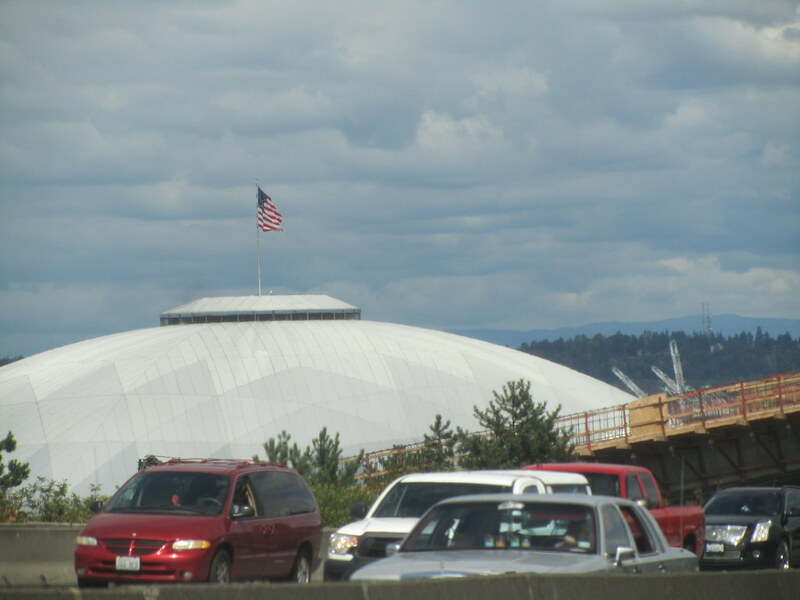 I was impressed with the production in Everett. It wasn’t Broadway, but it was a high quality traveling production. The acting and direction was entertaining and the singing and dancing were superb. We were going to take our niece for Ice Cream after the show, but she was tired and it was time to take her back to the hotel. 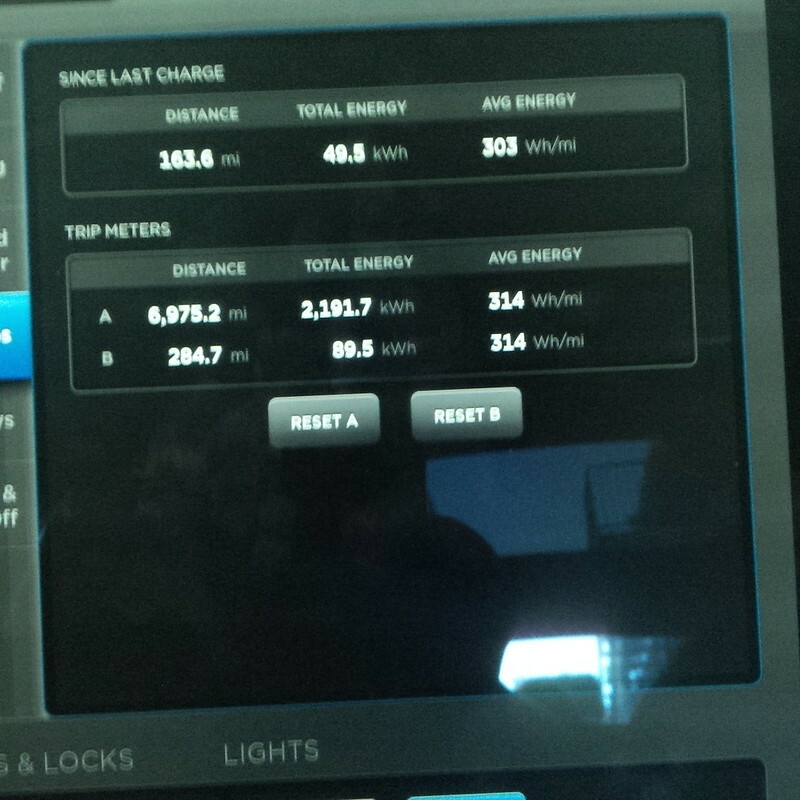 After all the driving for the day, we parked at the hotel with 78 miles of range. Had to do a little driving around the hotel parking lot, but figured a 200V/30A feed would be fine for an overnight charge. 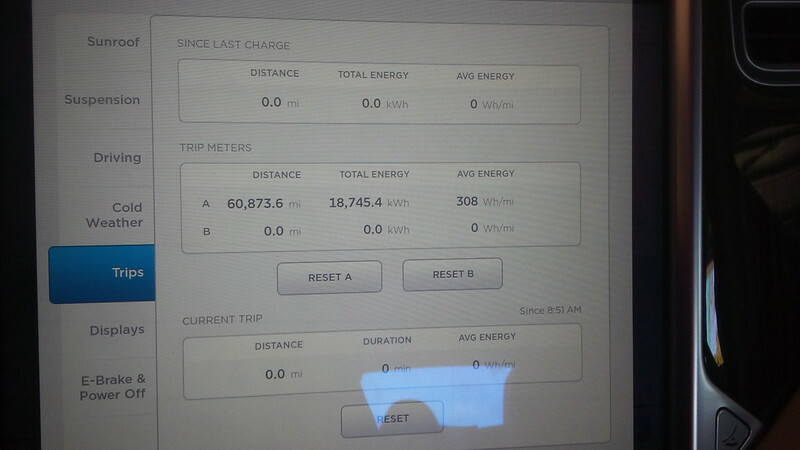 We’re not going to charge it up to full, but at least have enough to do our driving around Seattle area day on Saturday. 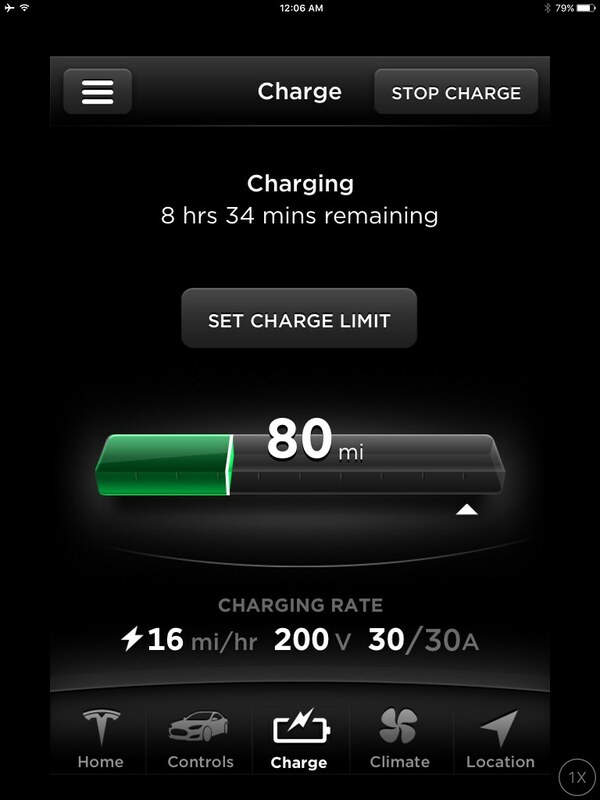 The charge rate improved a little when I checked on the App and we went to bed. The next day of this series, Day 6, can be found here. With a hat-tip to the 2004 TV mini-series from Ewan McGregor and Charley Boorman. 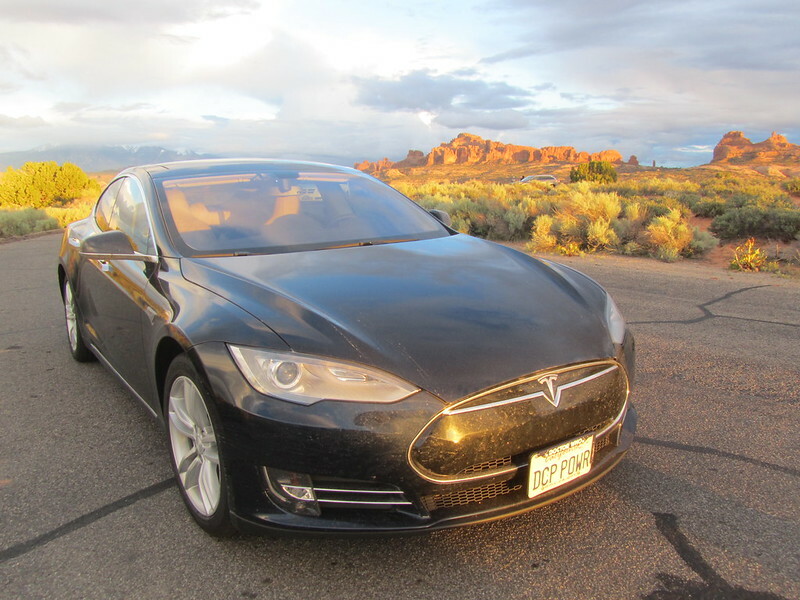 This is the fourth day in a series of posts written about our 2016 EV Roadtrip written in the same manner as our 2015 trip. Here, There, and EVerywhere Trip – Day 01, i.e. summaries written for each day of the trip, published each day, this time two months from the day of the trip. It may seem funny to some to have a summer trip published at the start of the Fall, think of it as some daily entertainment for those that are back in their offices thinking about their past summer trips that could have been or thinking about their next trip. Missed the previous day’s post, click here to read Day 3 of this trip. You’re just joining us on this trip? Click here for Day 1 and start from the beginning! So, what do we have in store today? 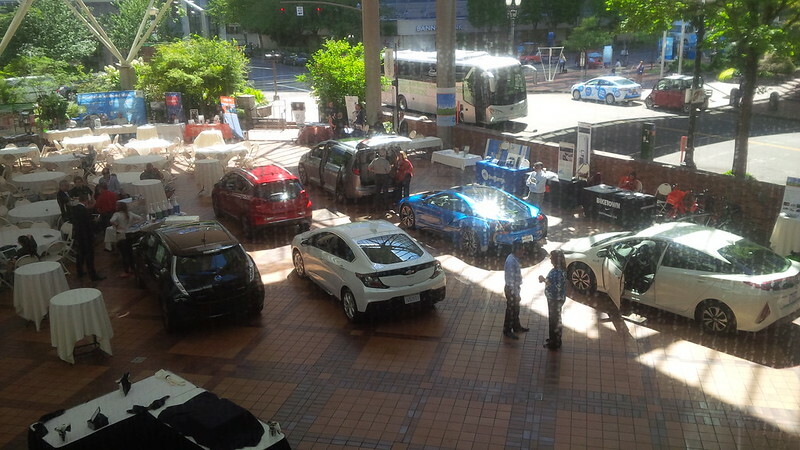 We’re still in Portland attending the second day of EV Roadmap 9 conference at Portland’s World Trade Center. So, we have the intermediate goal to complete. 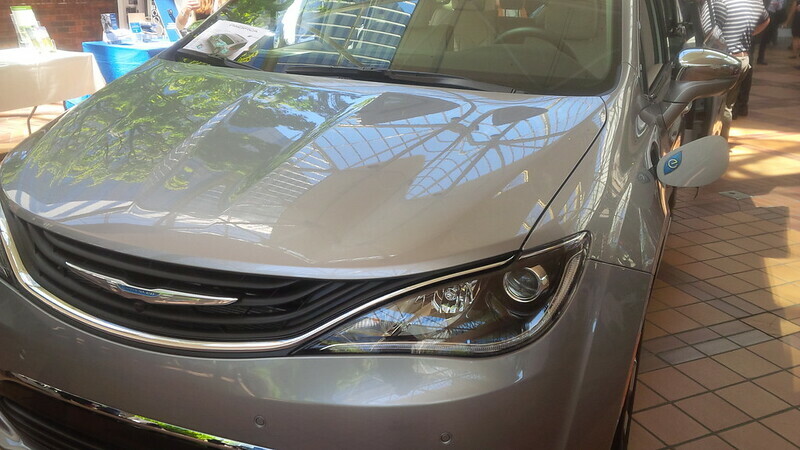 Though we have In and Out privileges for our car at the hotel for the conference, I opted to use other means to get from our hotel to the EV Roadmap 2016 conference. I still had a few Lyft credits left, but felt it wasteful to use this because all the cars that came out to help us in Portland have all been ICE. As cool as it was to have someone else drive us around and as cheap as it was because of the credits from T-Mobile, I figured to do something different. So, for day two of the conference (or day three, depending on how you look at the agenda, considering the previous day was “by invitation only”, I’m counting that as zero.) 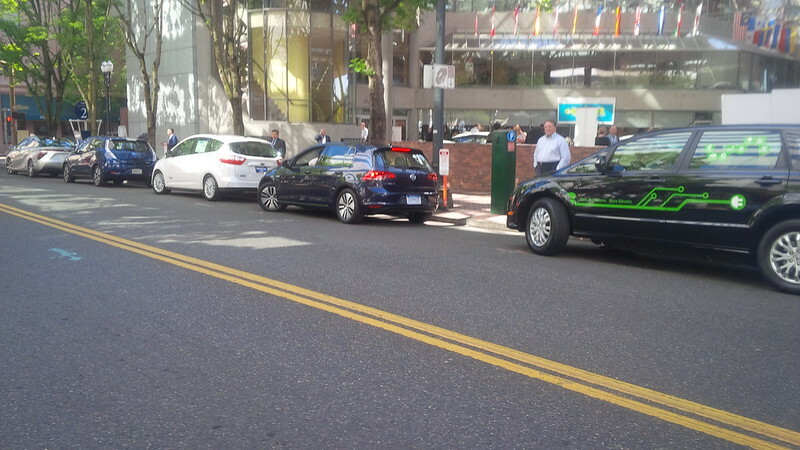 I decided to forego the high cost of downtown Portland parking AND gasoline. 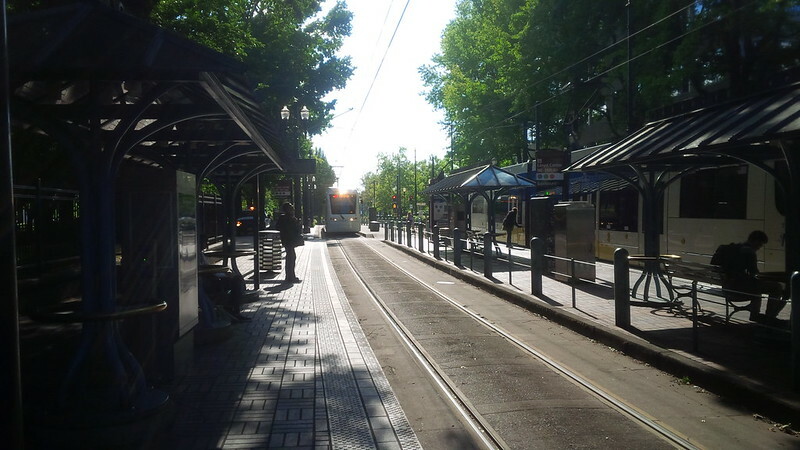 I decided to take the Trimet Trolley system. This method of transport was actually $1 more for me than Lyft because of the credits and the $2.00 tip versus $2.50 each way pass, but I thought why not. 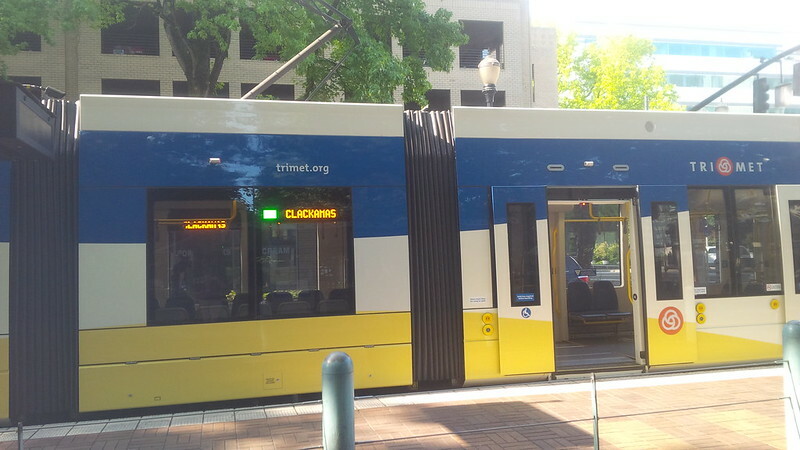 The Trimet station was just across the street from my hotel and a few blocks away from the conference. 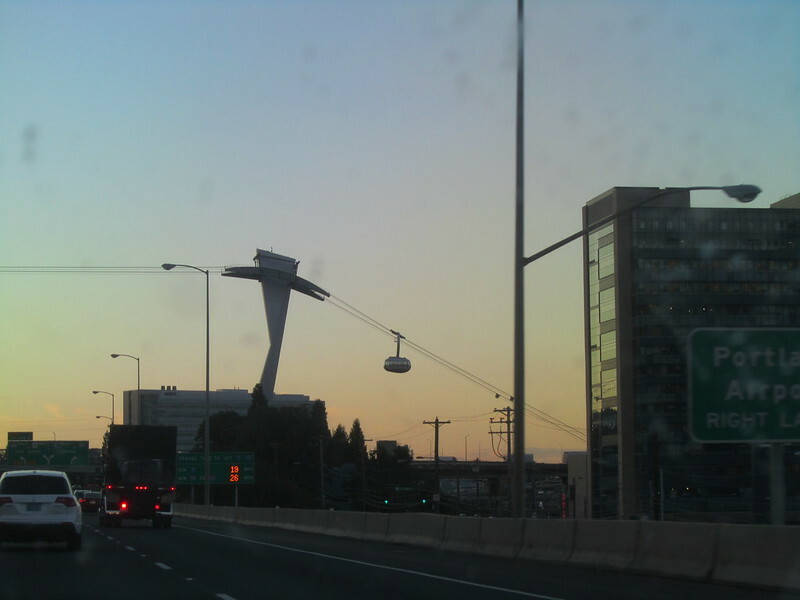 The first tram to stop was going the other way, so I took a photo and waited for the one toward City Center. It wasn’t a long wait. 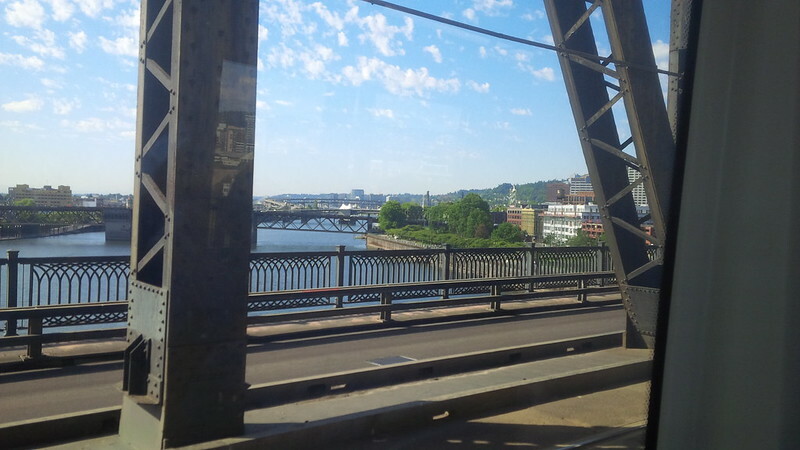 The Trimet tram is similar to the Blue Line/Red Line in Los Angeles, but had the additional cool factor of crossing over water on the bridge. 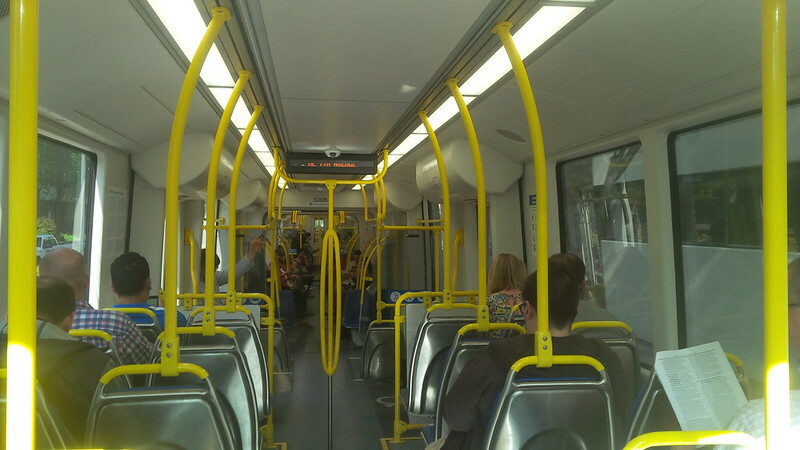 The few times I took the Metro in LA, none of my trains did that. So, for a little longer than what the Lyft ride took me, but a lot cleaner transport, I found myself back at the conference. 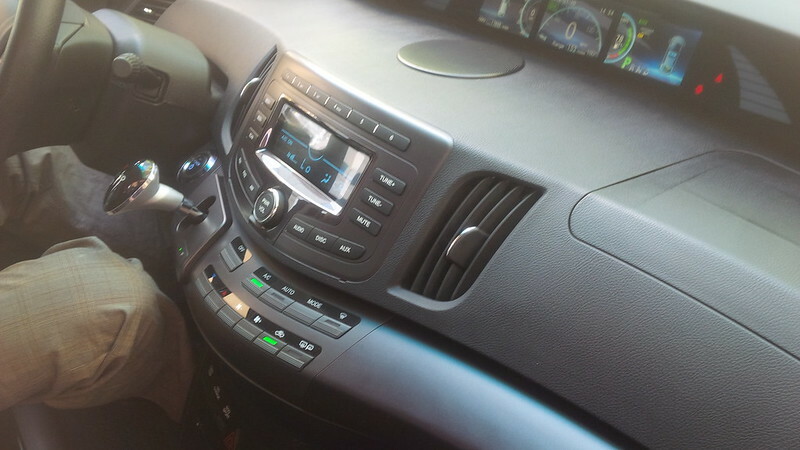 One of the drawbacks with commuting to the conference is missing some of the earlier parts, I missed some of the earlier sessions, but I was able to make the session from the auto manufacturers. 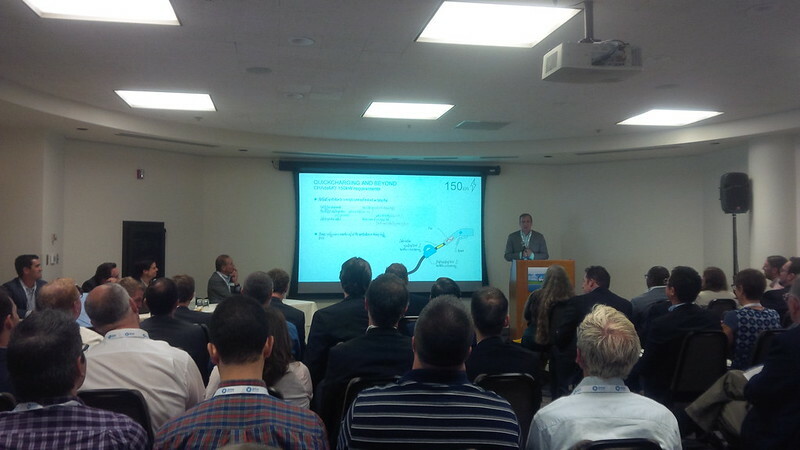 I then continued to the sessions on deploying Fast Charging networks. At lunch, I ended up with a table full of many of the same folks that I have had the pleasure of talking with the previous day. There was an award presentation for employers regarding Workplace Charging. 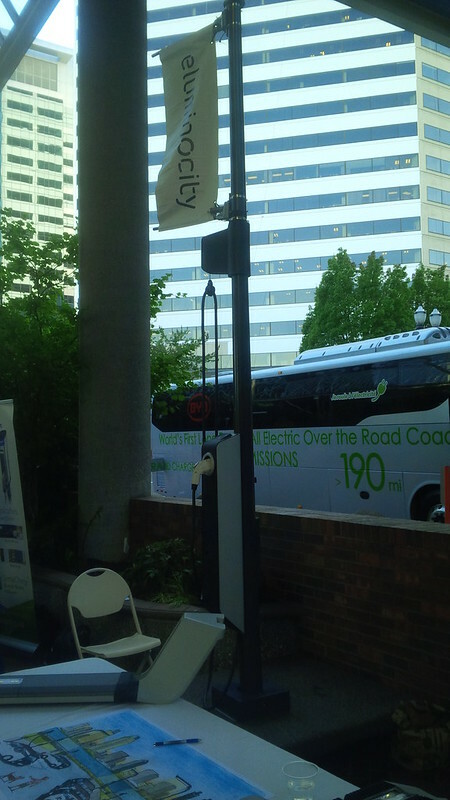 Even though EV Roadmap is one of the premiere North American conferences for the EV industry, it is still focused on Oregon and I believe all the awards were for local businesses. After lunch there were several more sessions that I attended. 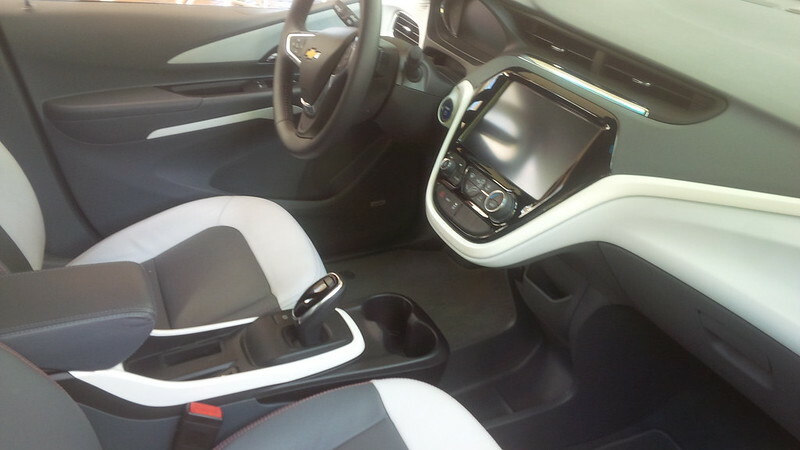 The most interesting one was the one for Electric Vehicles in the Media. I had hoped to meet Nikki Gordon-Bloomfield of Transport Evolved as she was originally scheduled to be in that session, but had to bow out for personal reasons. Nevertheless, the three presenters and moderator did a good job being one of the more entertaining sessions. 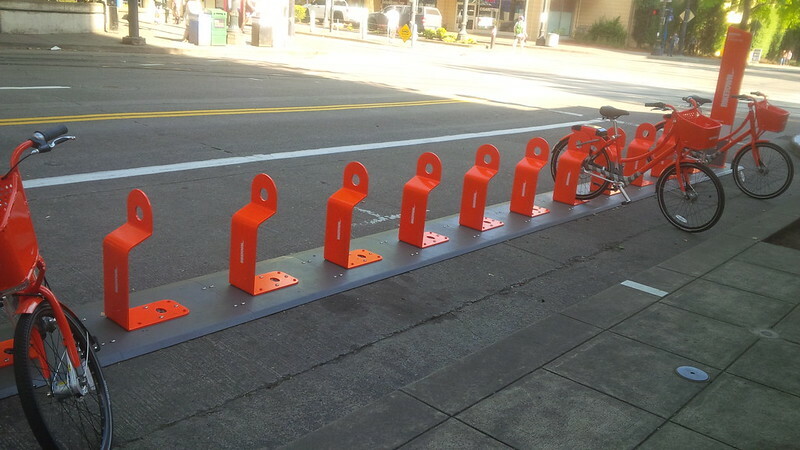 I walked by a full Electric Avenue charging location on my way back to the Trimet Trolley. 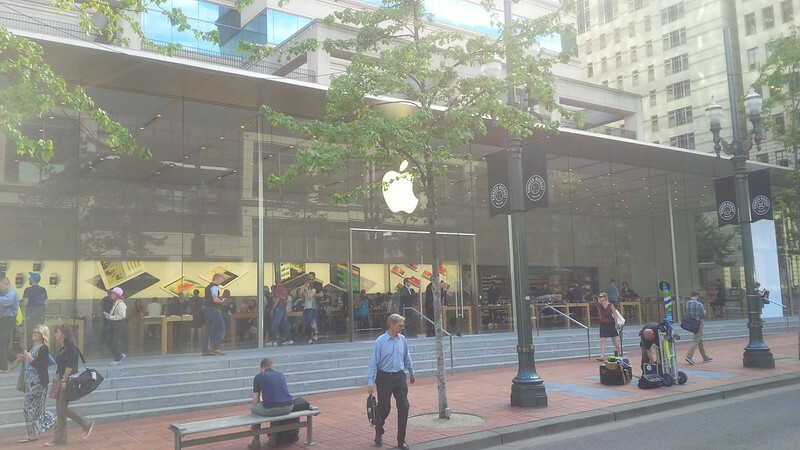 I caught the train across from the Apple Store in Downtown Portland. 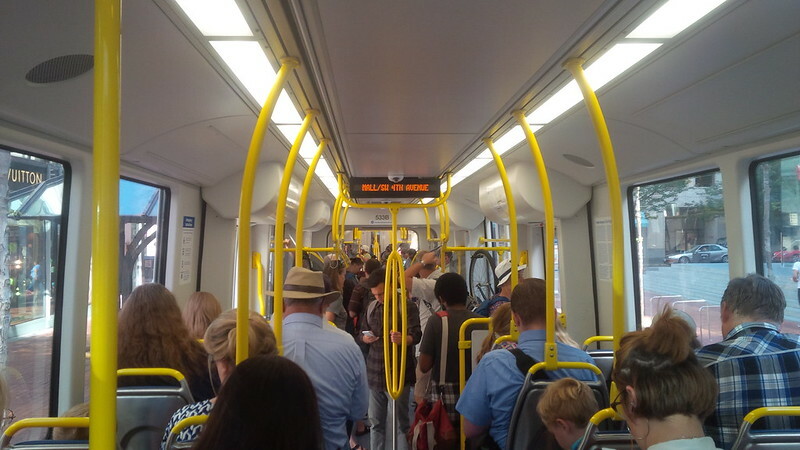 Not as packed as a London or New York train in the middle of Rush Hour, but definitely a good sign of a well received public transport system. Besides, it’s an EV. 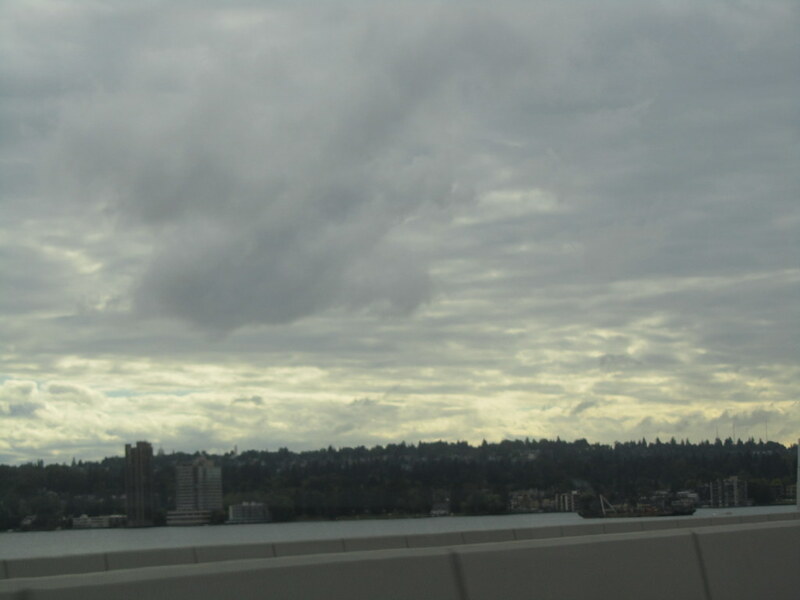 Another crossing of the bridge. 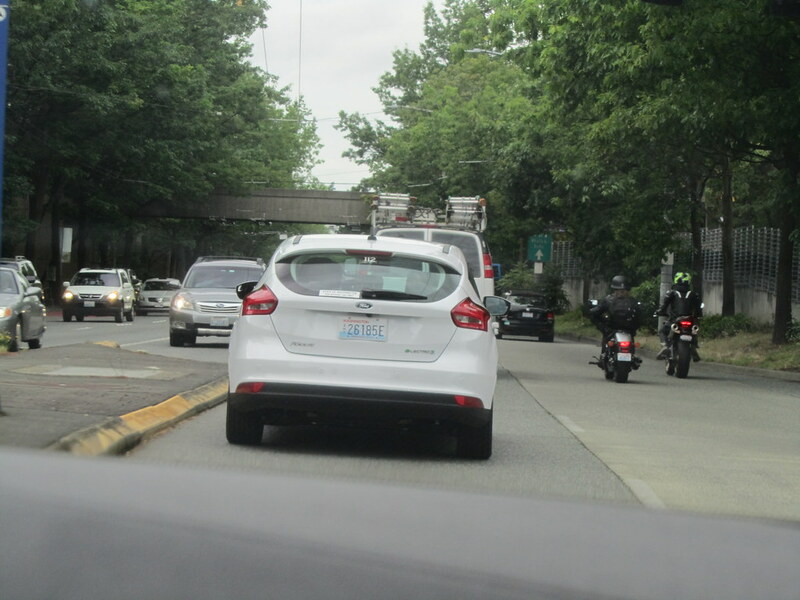 Biketown actually sponsored the conference and could have been an option to try for my commute back to the hotel, but decided to have someone else drive. Though I know how to ride a bike, I haven’t done so in a while, and riding a bike in a busy downtown area may not be the best way to re-introduce myself to the pleasures of cycling. 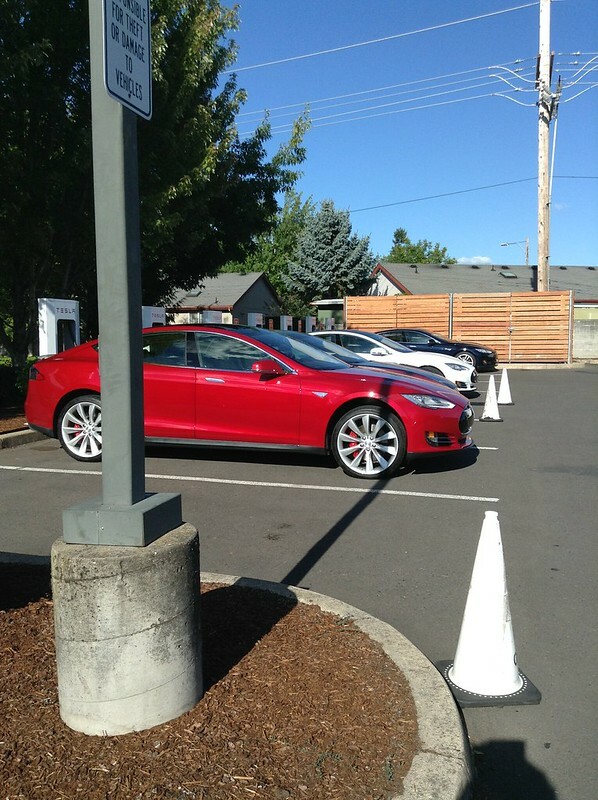 We had plans to return to Lincoln Restaurant for our last dinner in Portland on this leg of the trip and took our Model S back out for the drive. 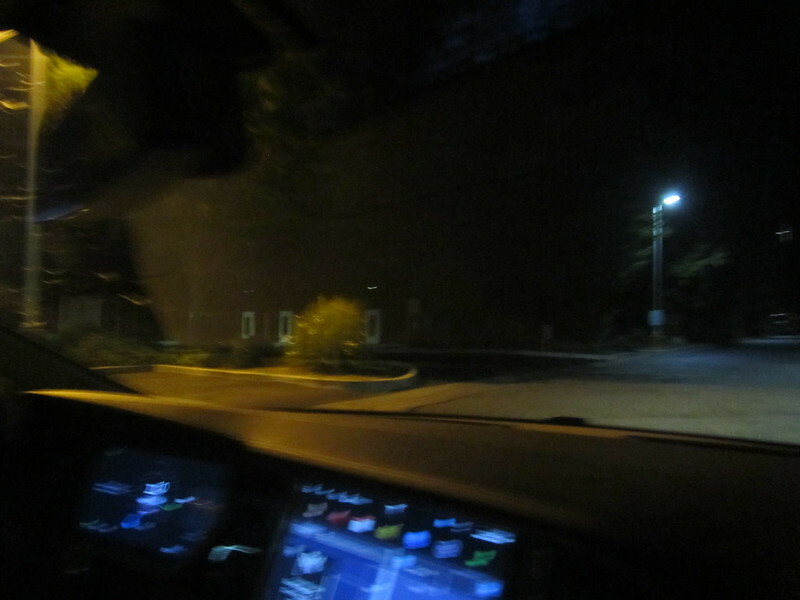 It looks like we started the drive to the restaurant at 208 miles, so that’s another seven miles of vampire loss from sitting in the parking lot all day. 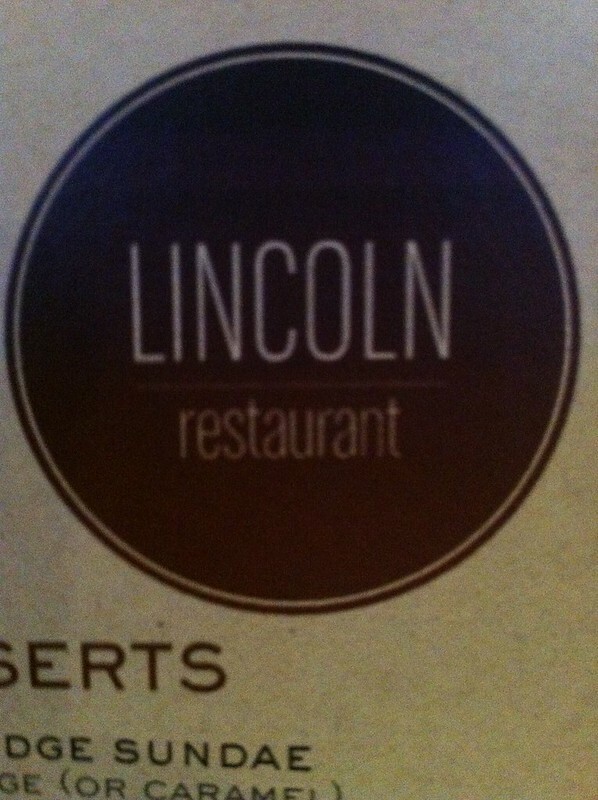 Lincoln is a wonderful restaurant owned and operated by Chef Jenn Louis. This dinner would be the second time for us to visit this restaurant. The Chef is actually the sister of a high school classmate of mine and we originally dropped in a few years ago to check out the restaurant. 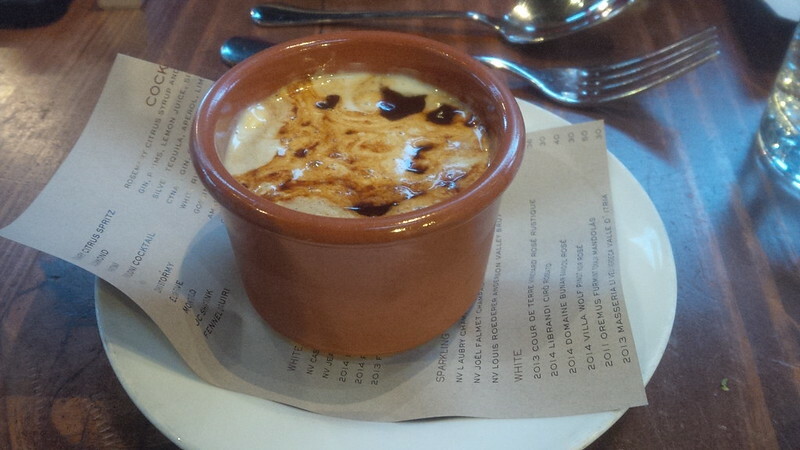 We were impressed by the entirety of our restaurant experience, from the meal to the service to the dessert, that we have added her restaurant to our list of places we “must visit” everytime we’re in her town. 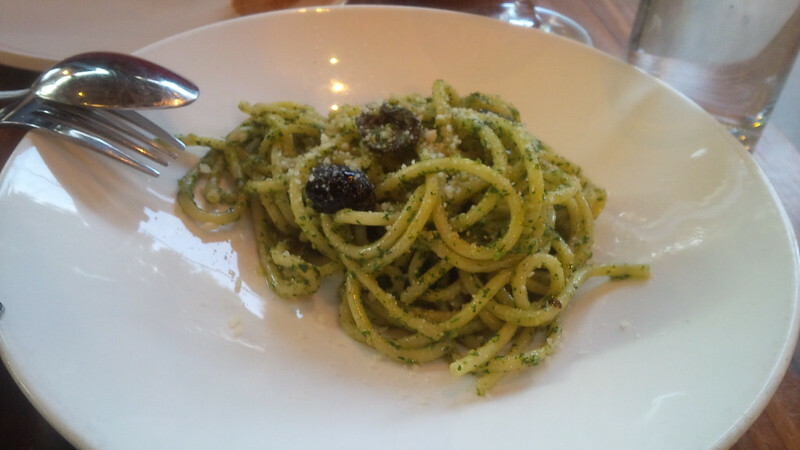 Since Jenn’s first cookbook was called Pasta by Hand, have to try her pasta (besides, I prefer to have someone else’s hands make and cook the pasta for me ;-),) and decided on the Bucatini with herb pesto, oil-cured olives, and walnut. 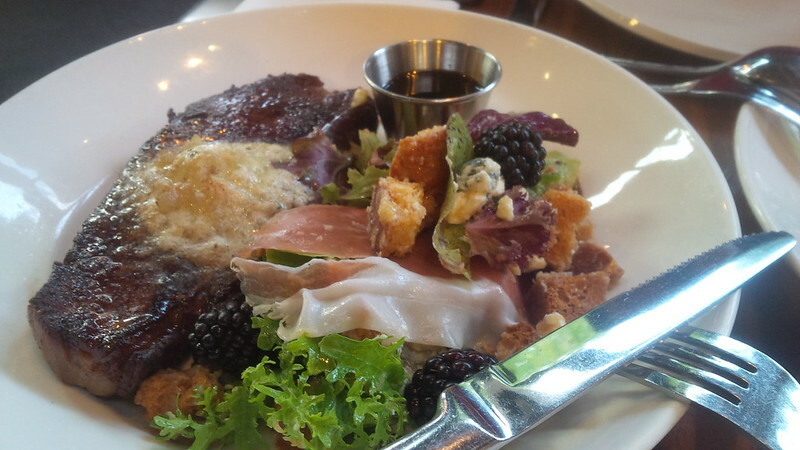 and a nice NY Steak with prosciutto, blackberries, blue cheese, and panzanella. 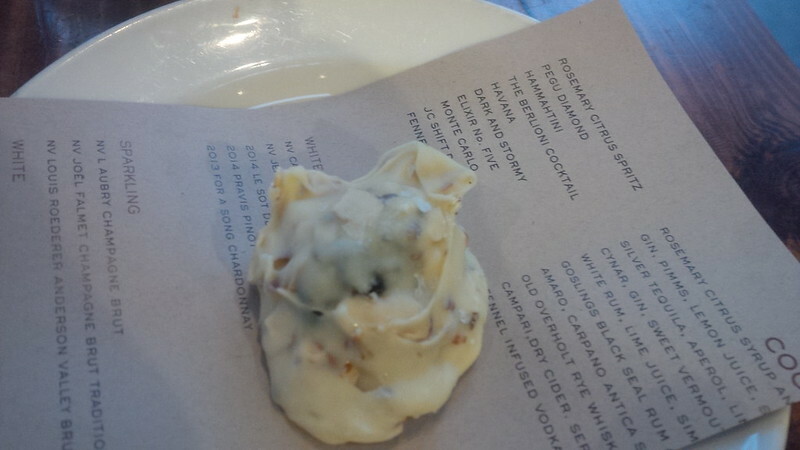 …and each had a bon bon. White chocolate. 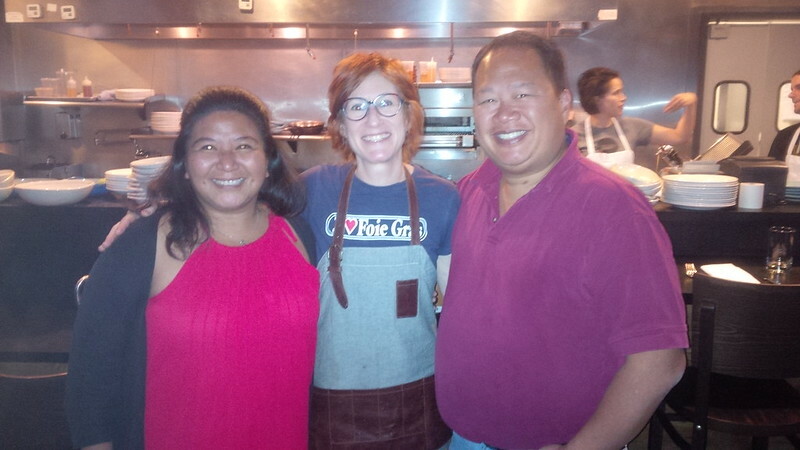 After a great meal, here’s a picture of us with Jenn. 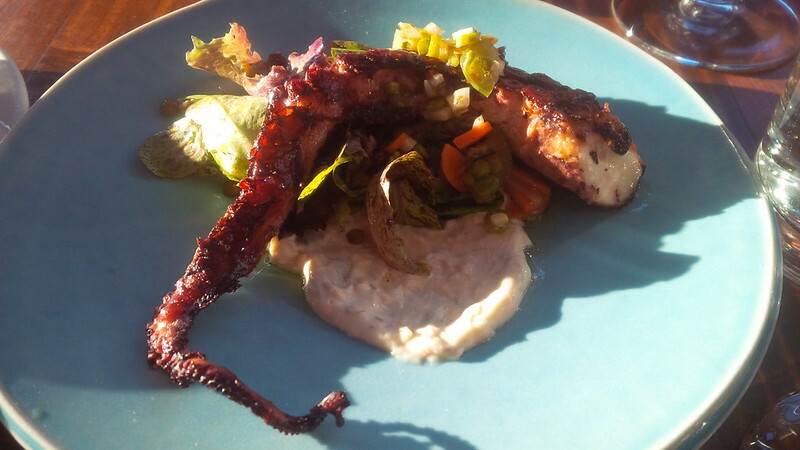 It’s good to get to know chefs because they’re a great source of information for places to eat when one travels. We talked about our plan to go to Vancouver on the way to Reno and Jenn had a few places to recommend in Washington and a restaurant to go to in Vancouver. 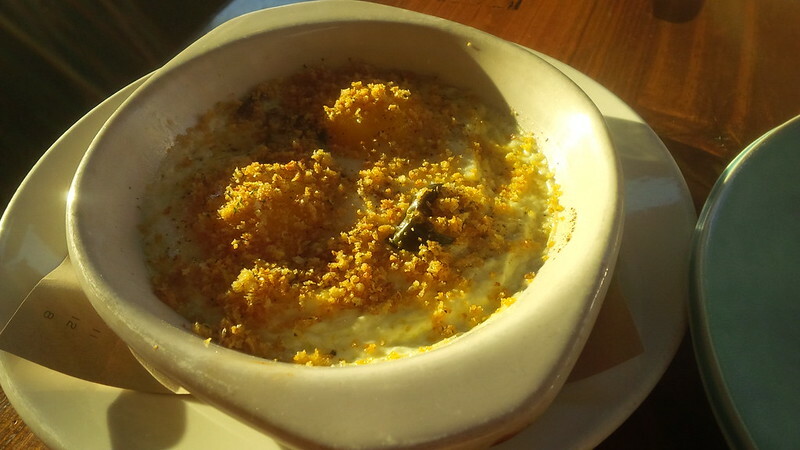 She recommended a great hole-in-the-wall restaurant in Willamette Valley a few years back that had great food, so we took notes on the restaurants to visit on our Pacific Northwest trip. 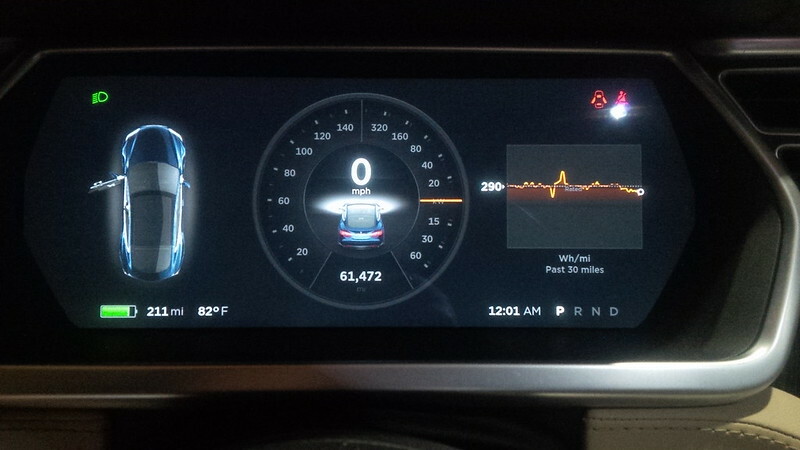 We headed back to the hotel and parked the car with a 198 miles of range overnight. 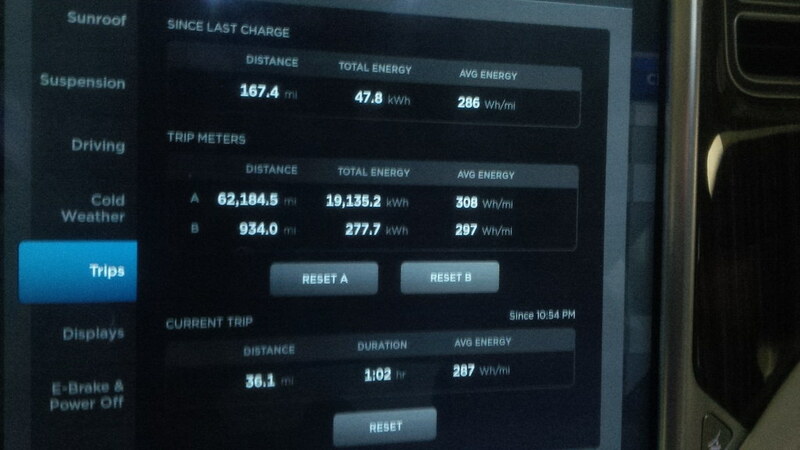 We had more than enough range to make it to our next supercharger stop at Centralia, WA tomorrow and headed back to our hotel room to rest for the drive to the Seattle, WA part of our trip. With a hat-tip to the 2004 TV mini-series from Ewan McGregor and Charley Boorman. 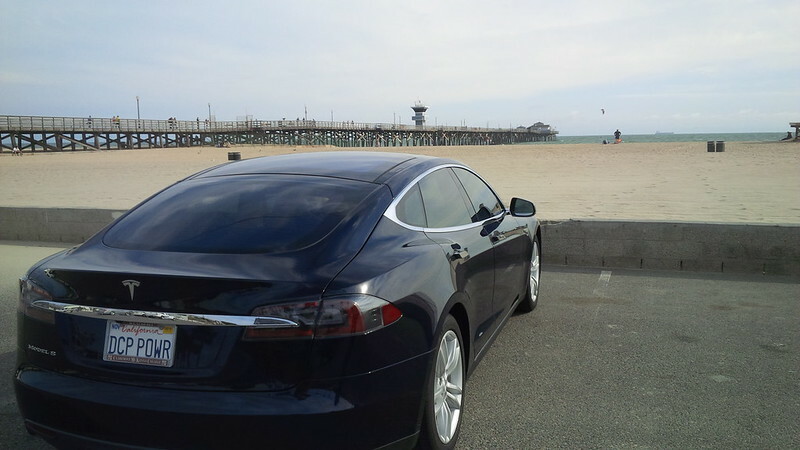 This is the third day in a series of posts written about our 2016 EV Roadtrip written in the same manner as our 2015 trip. Here, There, and EVerywhere Trip – Day 01, i.e. summaries written for each day of the trip, published each day, this time two months from the day of the trip. It may seem funny to some to have a summer trip published at the start of the Fall, think of it as some daily entertainment for those that are back in their offices thinking about their past summer trips that could have been or thinking about their next trip. Missed the previous day’s post, click here to read Day 2 of this trip. You’re just joining us on this trip? Click here for Day 1 and start from the beginning! So, what do we have in store today? 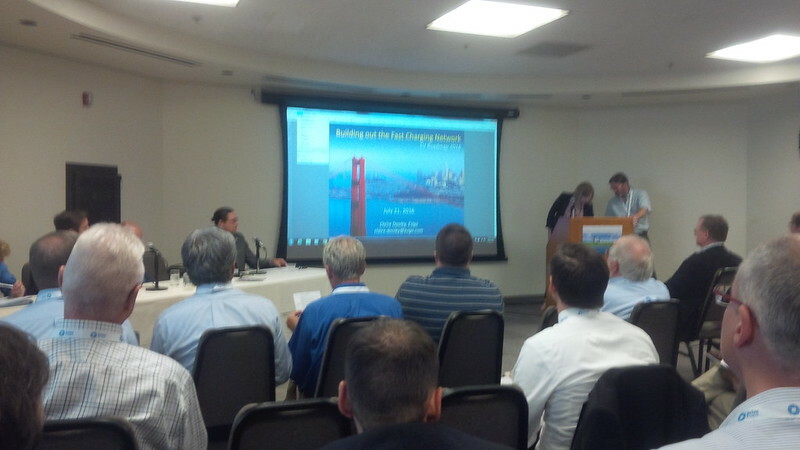 We’re in Portland attending the EV Roadmap 9 conference at Portland’s World Trade Center. So, intermediate goal started. 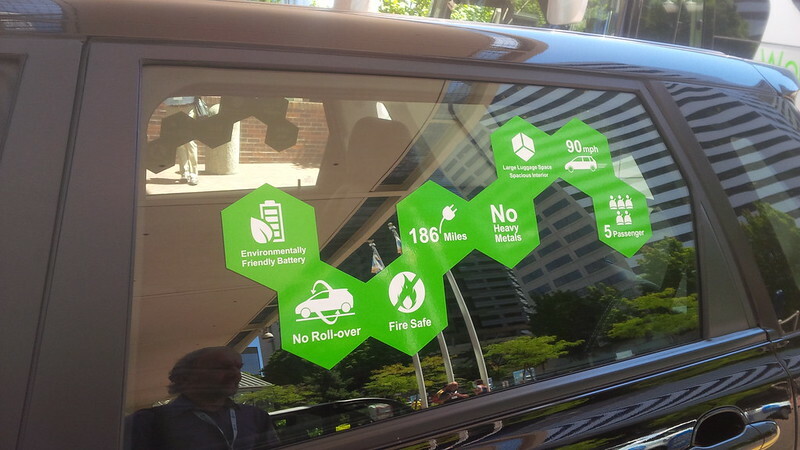 Though we have In and Out privileges for our car at the hotel for the conference, I opted to use other means to get from our hotel to the EV Roadmap 9 conference. As with many cities, downtown areas parking costs can get expensive and thanks to T-Mobile and its various T-Mobile Tuesday promotions, I had a few $15 Lyft credits on my account to use. So, I opted to do that instead. The Lyft would have cost about $10.00, but with the credit from T-Mobile, the cost was a $2.00 tip for the ride. (as well as some guilt over burning dead dinosaurs for the transport, but it’s only 2 miles attributable to MY use of Lyft.) The driver dropped me on the other side of the street and I passed an almost full Electric Avenue on my way to join the conference. 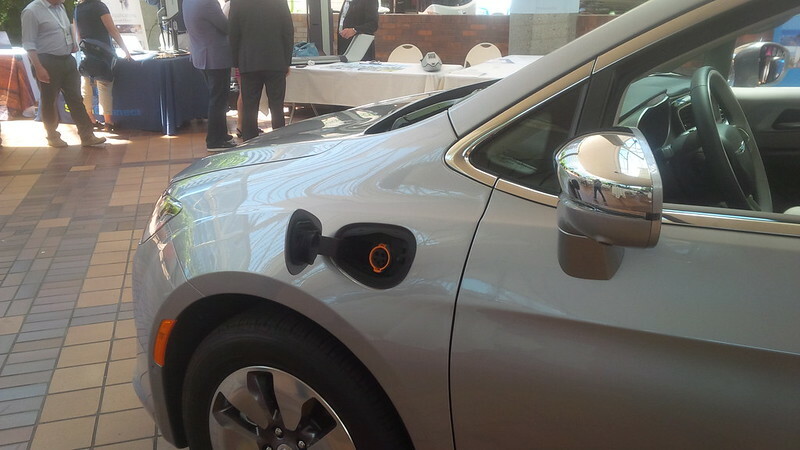 As this conference was for the EV industry, there were several auto manufacturers with their EVs on display and some even provided a Drive event during the first day. that was going to serve as the transport for the activity through the Willamette Valley wine tasting for day three that we’re opting to skip. The conference itself was very informative with a focus on the current state of the industry as well as what is coming up next. There were discussions and presentations on what the best practices are as well as what the leaders in the industry are doing. I focused on areas of interest and attended sessions on public charging network deployment and regulatory challenges and solutions. It would seem that many of the sessions I attended were filled up and some were standing room only for some. 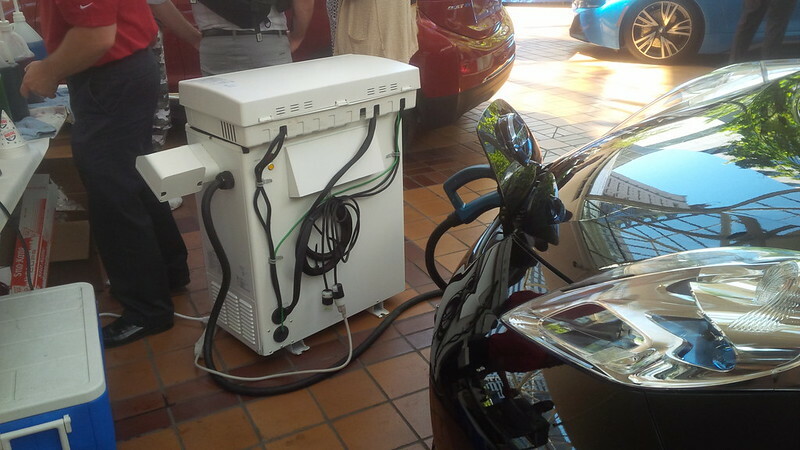 At lunch, there was a demonstration of Vehicle to Grid using a Leaf to power an Ice Machine and Ice Shaver to make Hawaiian Shaved Ice. 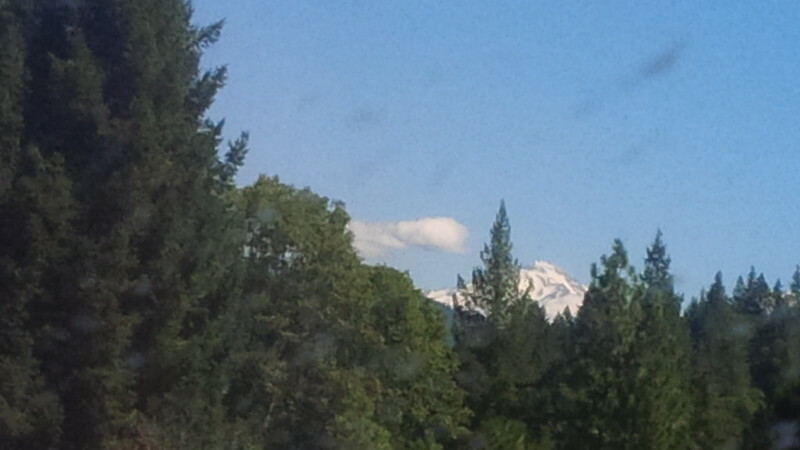 I expected cold and rain in Portland, but apparently they get nice sunny summers up there too. Aside from the vehicles available to drive, there were some that were just sitting around. 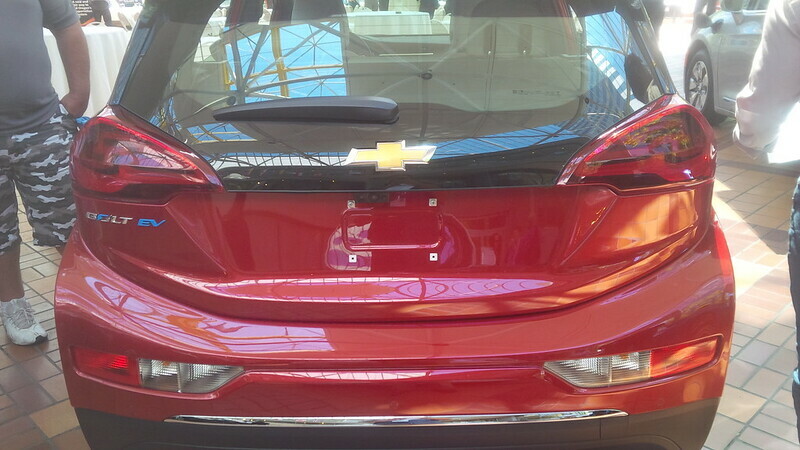 Here’s a nice red Chevy Bolt EV that looks like it’s ready for release. Nice to see these improvements by a couple of the manufacturers for their offerings. I got the pleasure of having lunch with John Voelcker (Editor in Chief of Green Car Reports) and Bengt Halvorson (of Car and Driver). We were also joined by Chelsea Sexton. 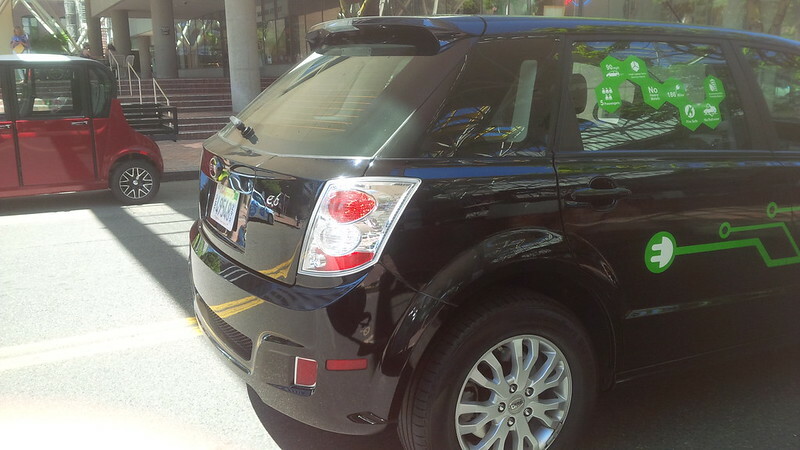 In conversation, I was alerted by Bengt of an opportunity to actually drive a car that has so far eluded me: the BYD e6. On the side of the car is some marketing of what makes the e6 an attractive car (to some). Of course, a lot of these items can also be found in other manufacturers that we know. 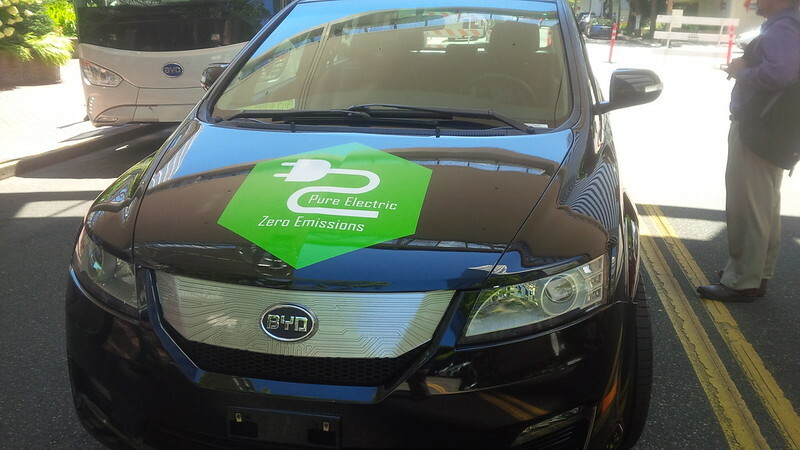 The BYD e6 is not a pretty car, nor would it ever be a car that would appeal to us I am intrigued about it because part of the strategy implemented by BYD is a lot like the one that Elon espouses with Master Plan #2. 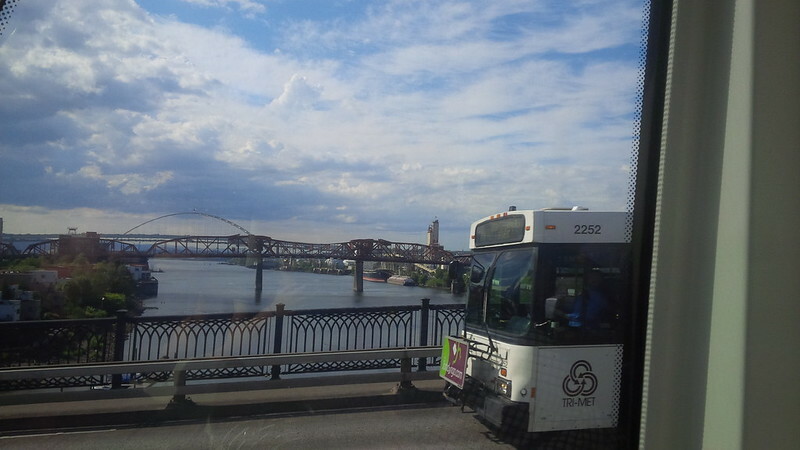 BYD is further along on the mass-transit portion of that plan than Elon (as is evidenced by the EV Bus that will be taking folks from Portland to the Willamette Valley for wine-tasting on Friday.) 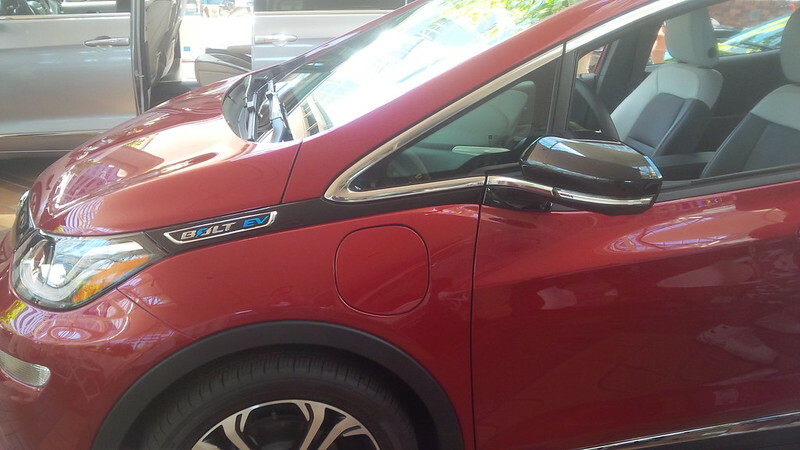 Not to say that BYD is Tesla or that Tesla is BYD only to say that they are playing in each others’ space. 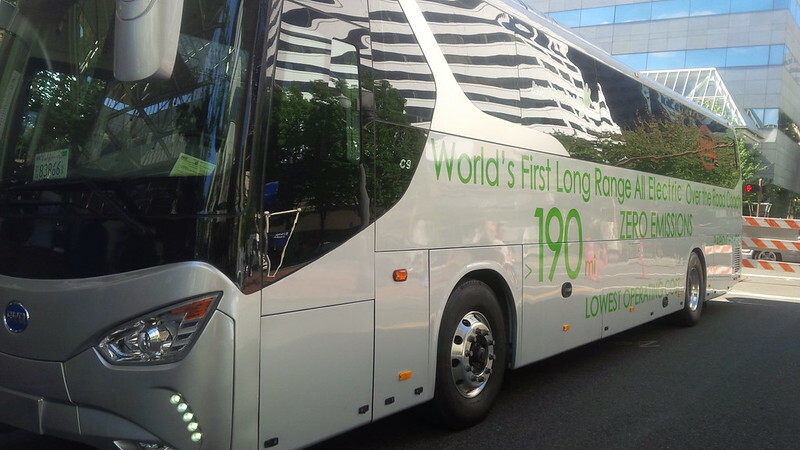 BYD is only providing the e6 in for fleet use in the US. As such, they aren’t even equipping the cars with J1772. 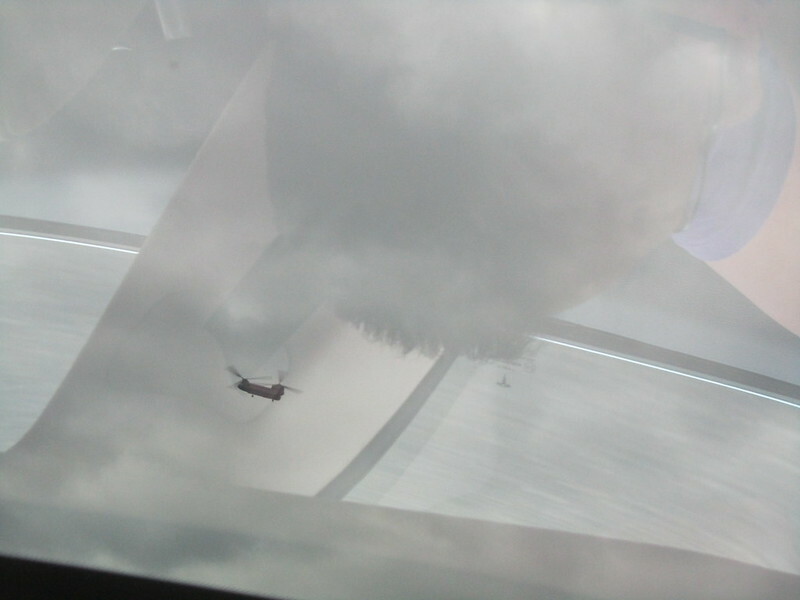 I believe that is a Mennekes connection or something that looks like it. 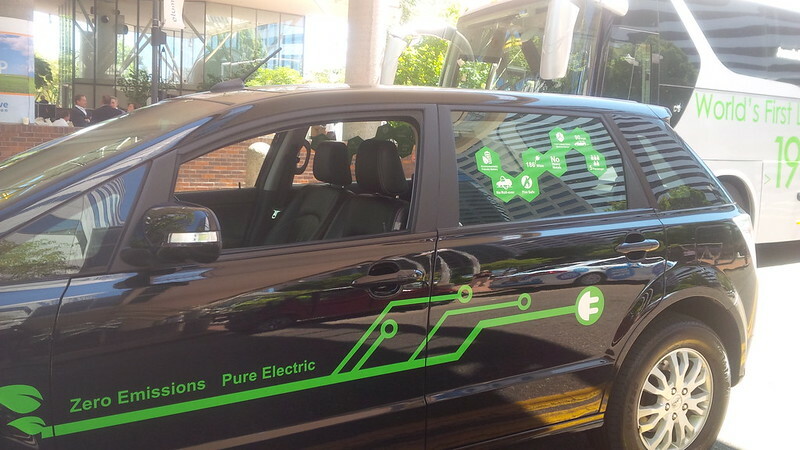 The BYD representative basically said that fleets that deploy the car will install BYD chargers because it is a fleet application, they expect users to go back to a central depot to charge. The car itself did have an adapter on it to use J1772, but this was for the demonstration vehicle only and not provided to North American fleets. A strange decision, if I say so myself. That being said, how does it drive? I would sum it up in one word: Sluggish. 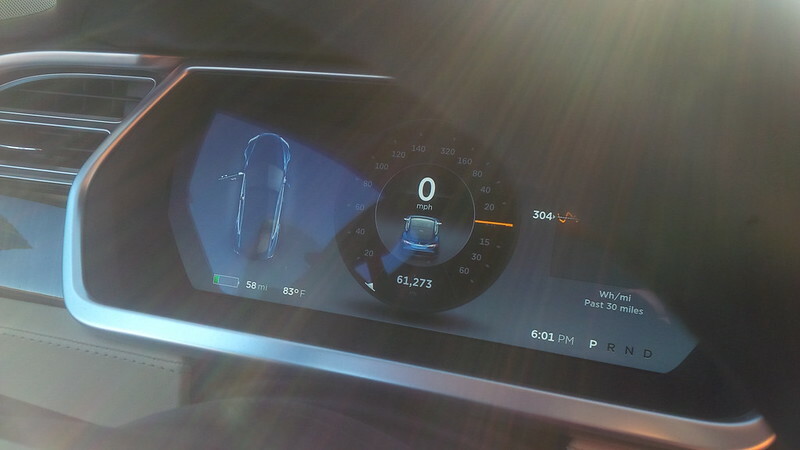 The plan for the test drive included being in the first of two modes, Eco Plus, which is the mode with the most range and slowest acceleration (if you could call it that.) I drove first and Bengt joined me as a passenger in the back. 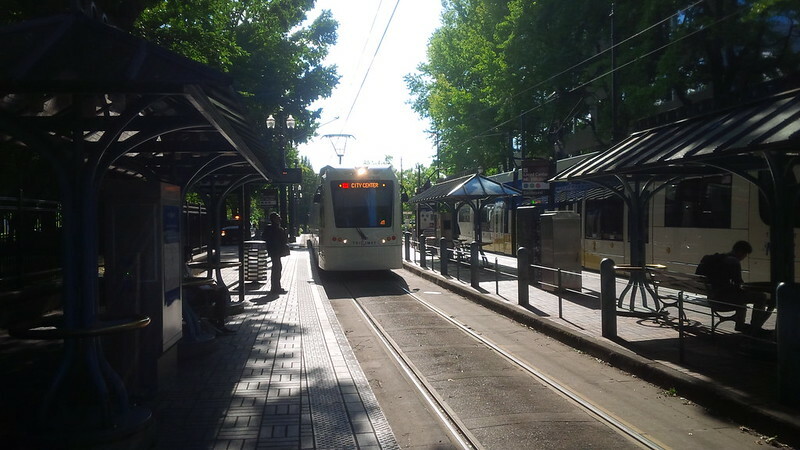 We did a loop around Downtown Portland and I was unimpressed with the acceleration. 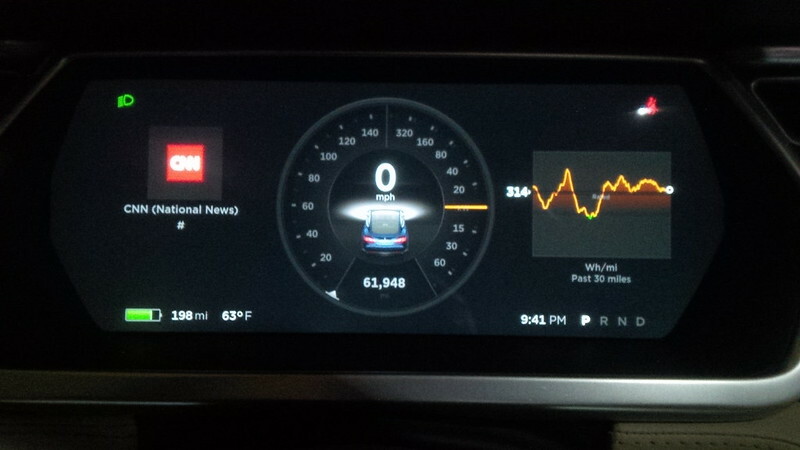 I’ve been in ICE vehicles that accelerated better. 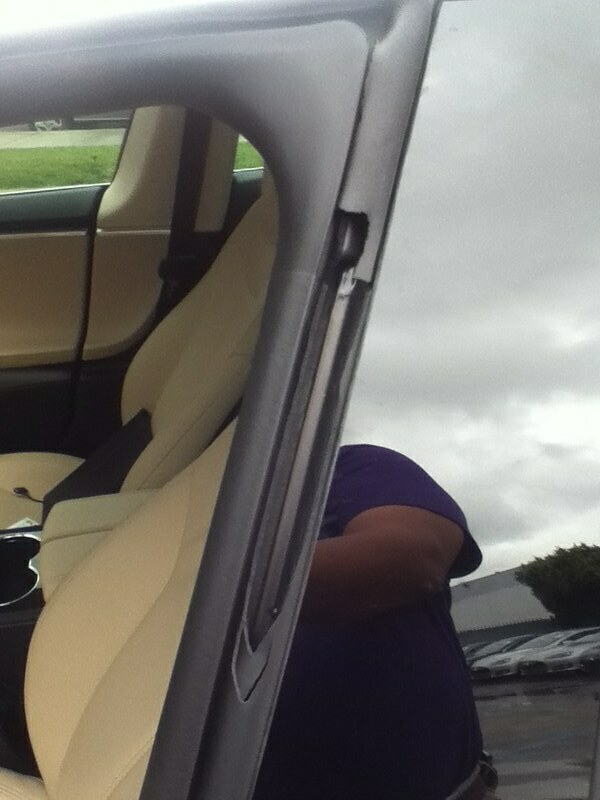 Even when the representative took the car off Eco Plus mode to the Eco mode, it was still a lumbering beast. 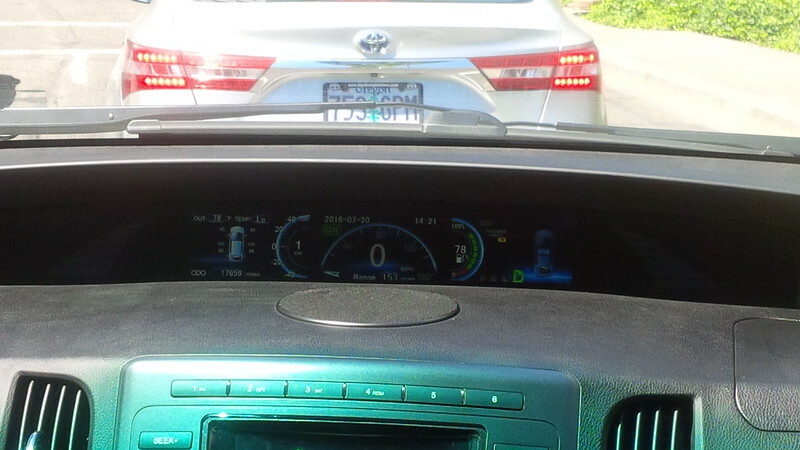 I tried to change lanes ahead of another car and was shocked at how slow the e6 was in accelerating. I felt like an iMiEV would have been quicker. 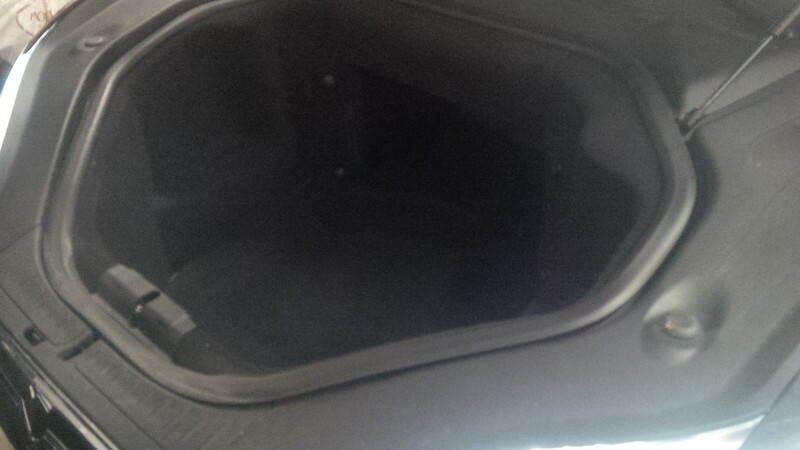 After completing my circuit, I got to go to the back and took some interior pictures. 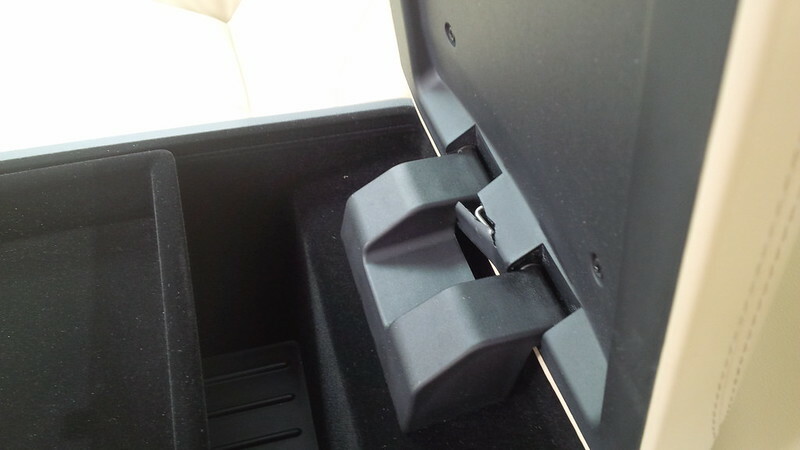 The controls, fit, and finish of the vehicle was acceptable. 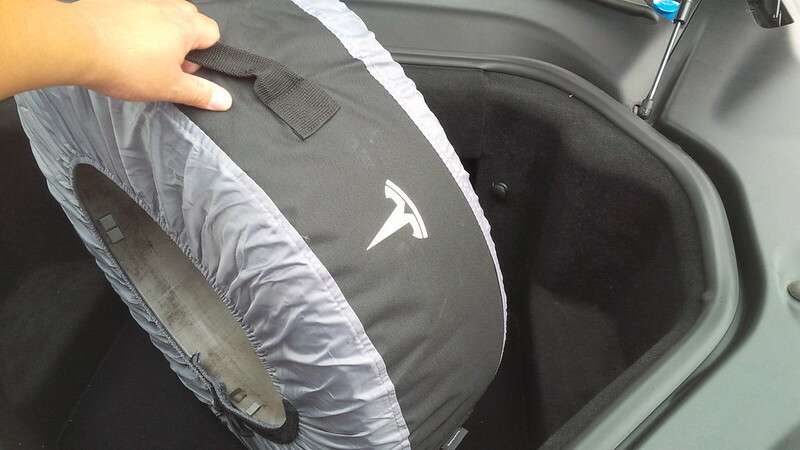 What I really did not like was the lack of “Zip” that one typically gets in an EV. 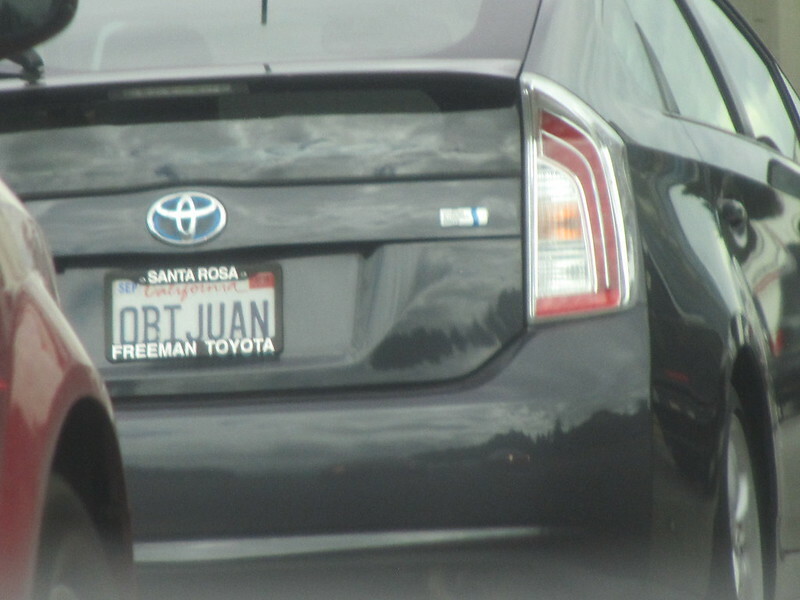 This car did not have any of that. 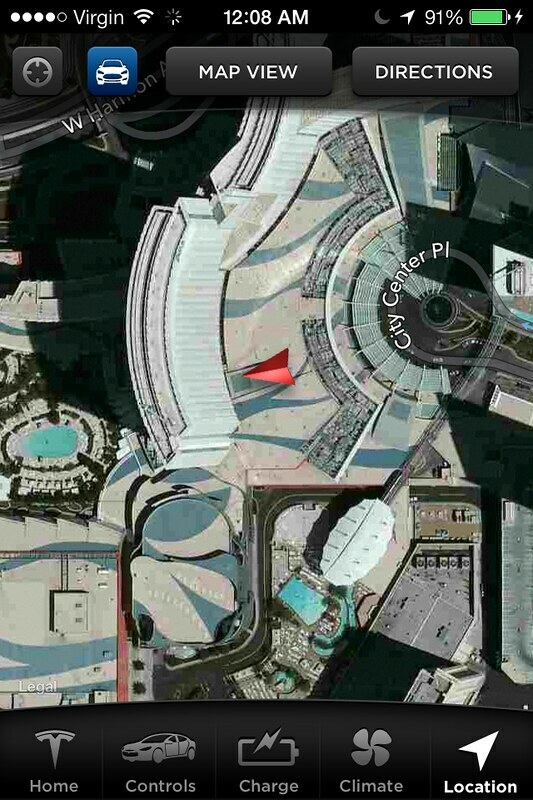 Here’s a picture from above to show the expo area. After several more sessions in the afternoon, including a very interesting live look in to a focus group of Portland public to discuss electric cars, it was time for the conference’s cocktail hour. 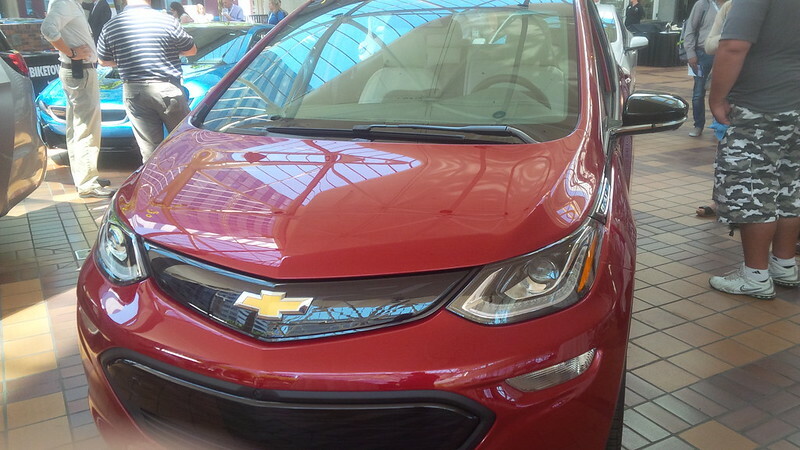 Met a few more folks throughout the day like writer (and some would say outspoken Tesla critic) Ed Niedermeyer of the Daily Kanban and Matt Teske of Drive, known for his Chevy Jolt EV fan site. Rather than have my better half putting about town, we bought tickets for her to join the cocktail hour for the conference. There were several firms at the expo during the cocktail hour and the illustration below hearkened back to some illustrations that I was familiar with during Active E days about four years ago. 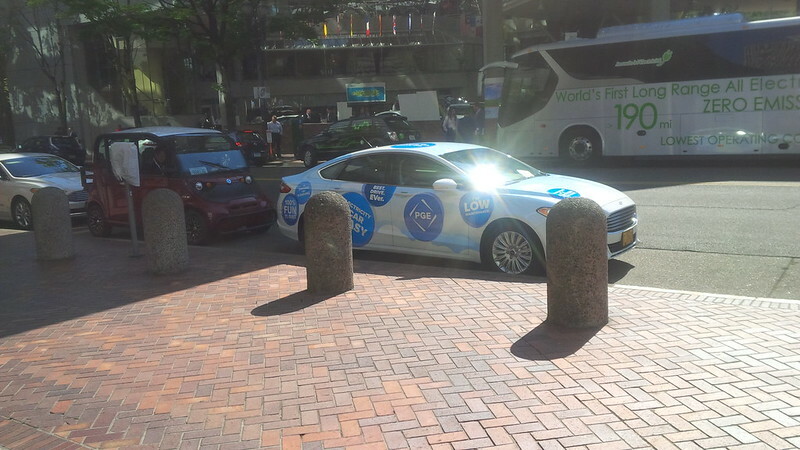 At the time BMW were postulating using lamp posts for EV charging and lo and behold, Eluminocity was at the expo. 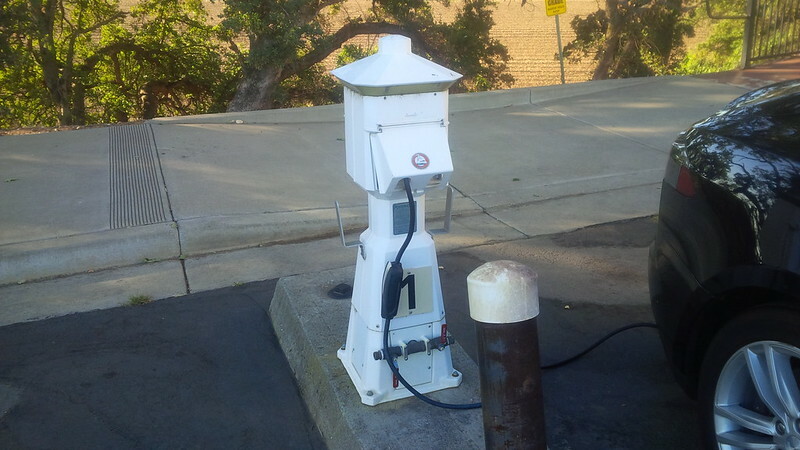 A demonstration unit was shown mounted on a pole. We spent the time at the cocktail hour exchanging information, and getting to know some of the folks that we met that day. It is fascinating to speak to some of these writers whose work I have followed over the years of getting into the rEVolution and hearing their thoughts and hopes for the industry and society. 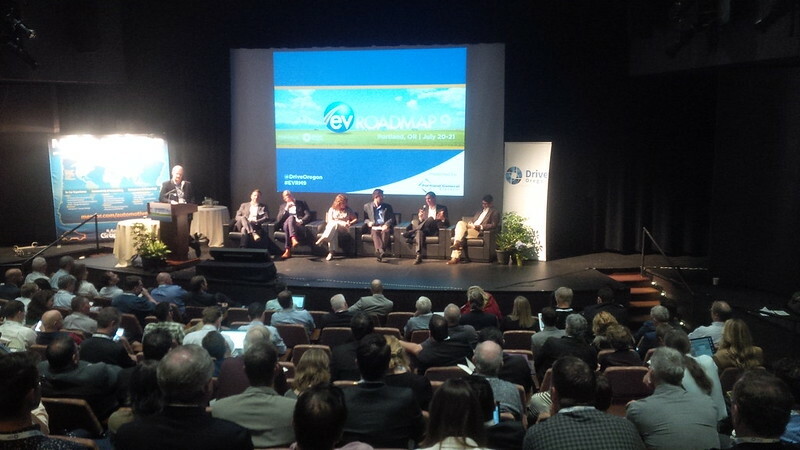 It was interesting to hear varied opinions on the challenges facing EV adoption and appreciated the candid and respectful exchange of ideas. 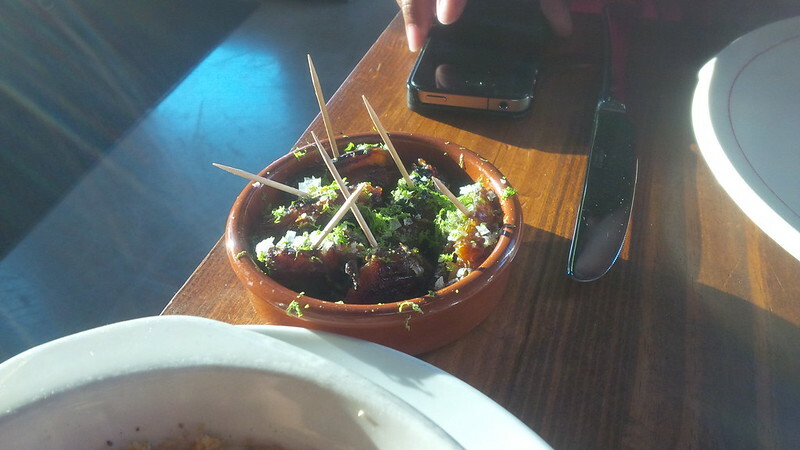 Though some finger food was provided at the cocktail hour, I’ve always found it difficult to fill up when I go to these things that I find that I often have to go to a restaurant to have a proper meal. The sushi from the night before was fine, but was not quite the quality that I expected, so we opted to go to another sushi bar for dinner that evening. 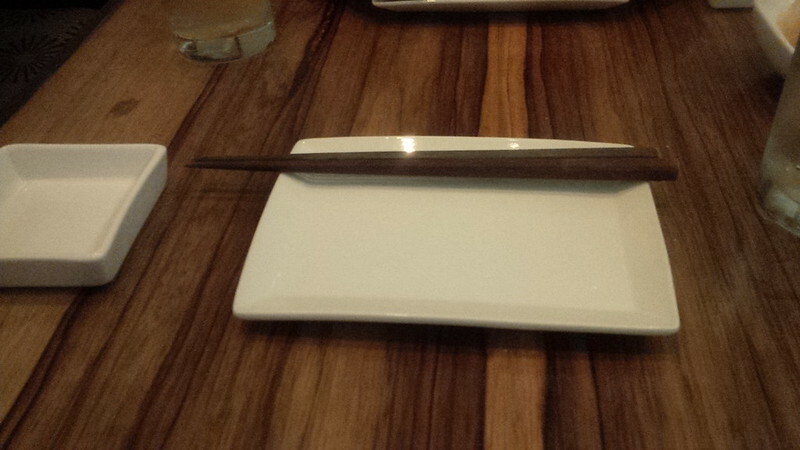 We took Lyft back to the hotel and took our car out to go to Bamboo Sushi in Portland. When I don’t know what to get at a sushi bar, I often will start with the Chirashi. 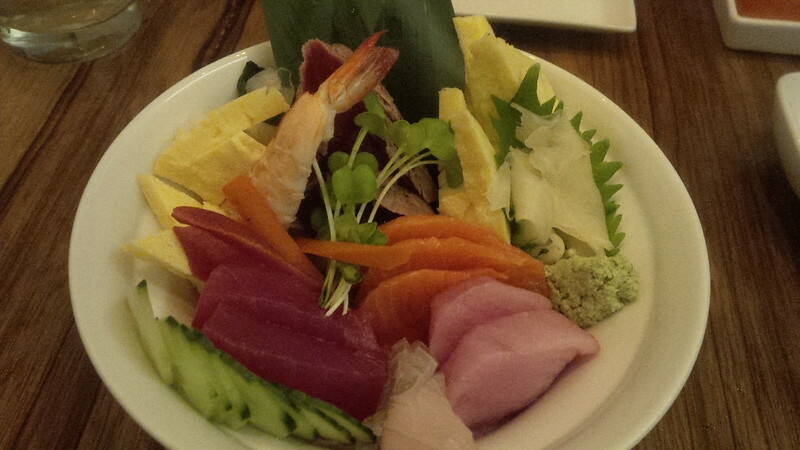 A Chirashi is basically sashimi on a bed of sushi rice. 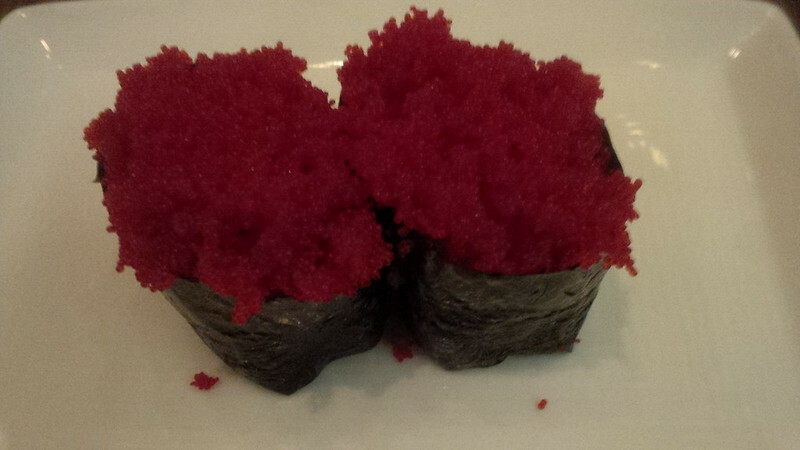 It’s a good way to have a sample of how good a sushi restaurant is in its product. 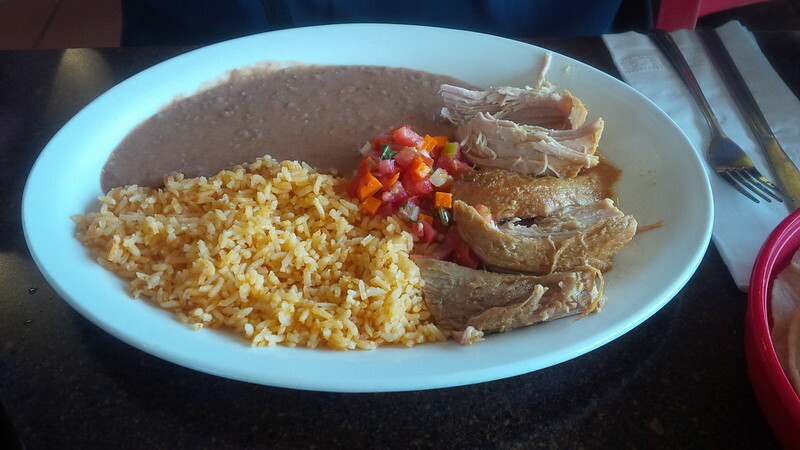 I then supplement with individual orders, if I am still hungry. 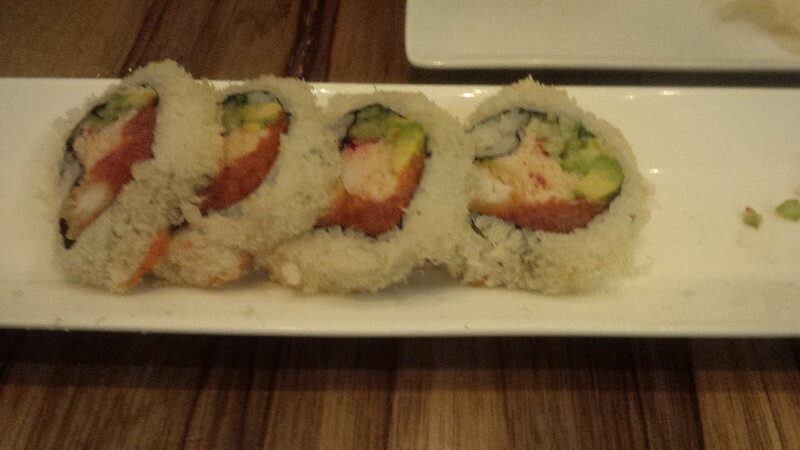 The sushi at Bamboo Sushi was very good quality. 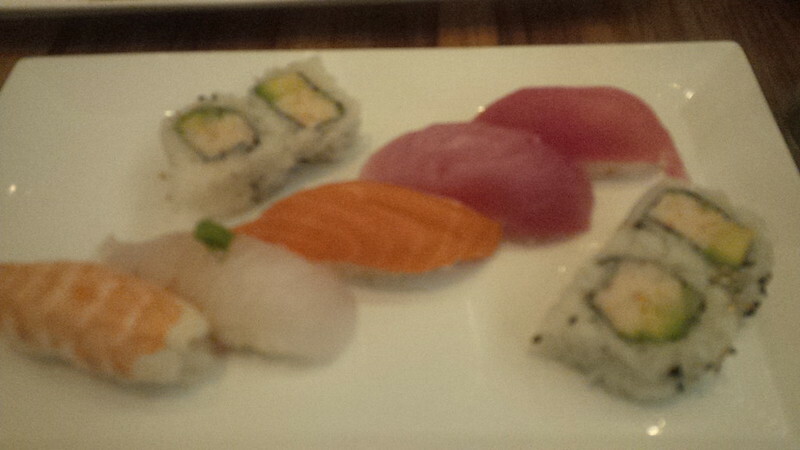 It hit the spot and I was glad to find hiqh quality sushi. 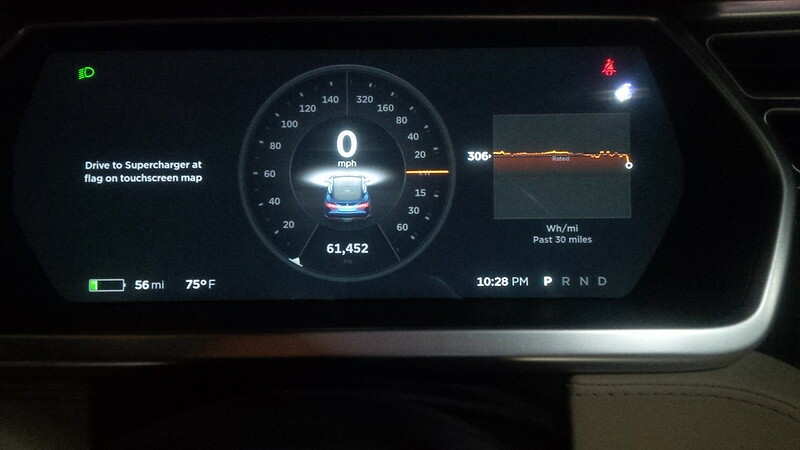 The drive from our hotel to the restaurant and back was a very short 3 miles and we parked the Model S with 215 miles left on the range. 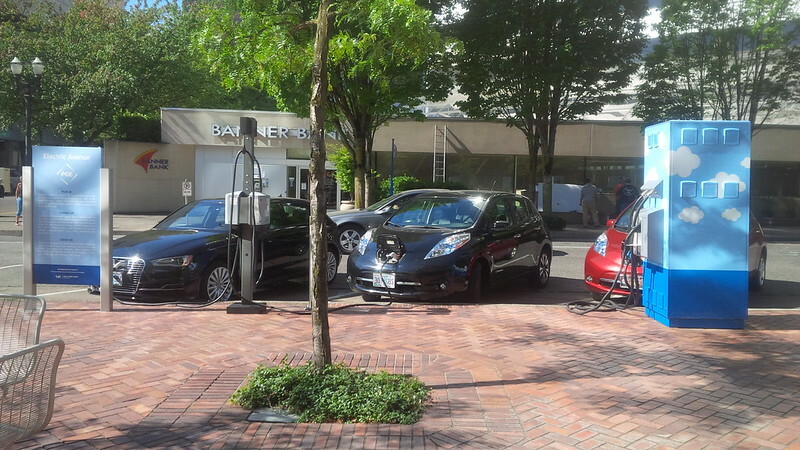 I guess it’s a sign of EV maturation when you don’t sweat the small stuff. 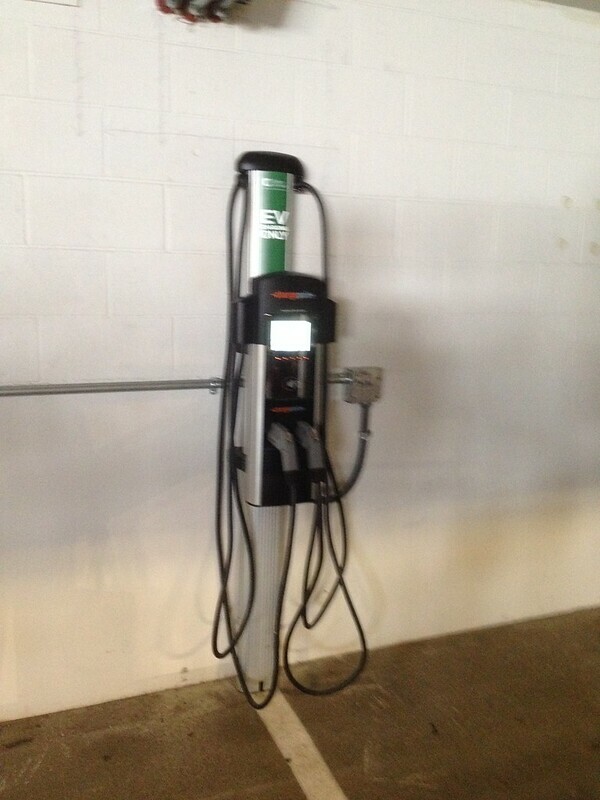 We’re only a few miles from the Electric Avenue DCFC and we have a CHAdeMO adapter, should we need it. Either way, went back to bed looking forward to the second day of the EV Roadmap 9 conference. The next day of this series, Day 4, is here. With a hat-tip to the 2004 TV mini-series from Ewan McGregor and Charley Boorman. 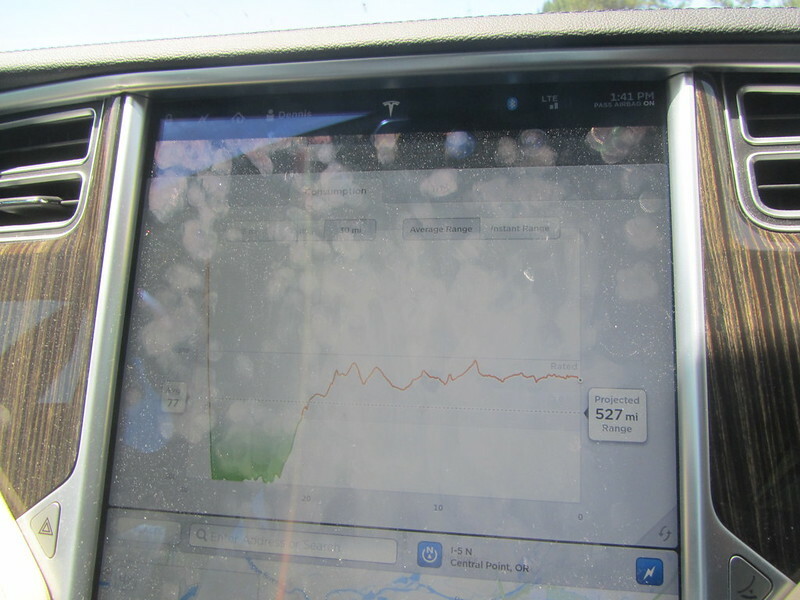 This is the second day in a series of posts written about our 2016 EV Roadtrip written in the same manner as our 2015 trip. Here, There, and EVerywhere Trip – Day 01, i.e. summaries written for each day of the trip, published each day, this time two months from the day of the trip. It may seem funny to some to have a summer trip published at the start of the Fall, think of it as some daily entertainment for those that are back in their offices thinking about their past summer trips that could have been or thinking about their next trip. Missed the previous day’s post, click here to read Day 1 of this trip. There are two goals today. 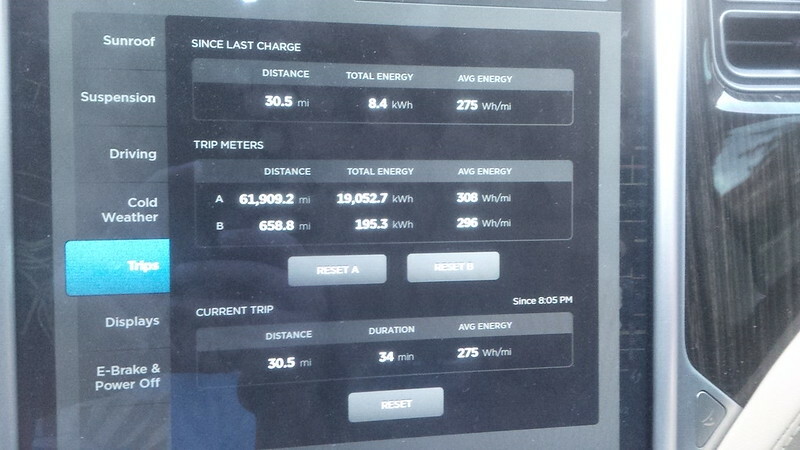 The first goal is to make it to Portland so that I can make the EV Roadmap 9 conference tomorrow morning. The second goal is to meetup with MelindaV of Model3Ownersclub.com. 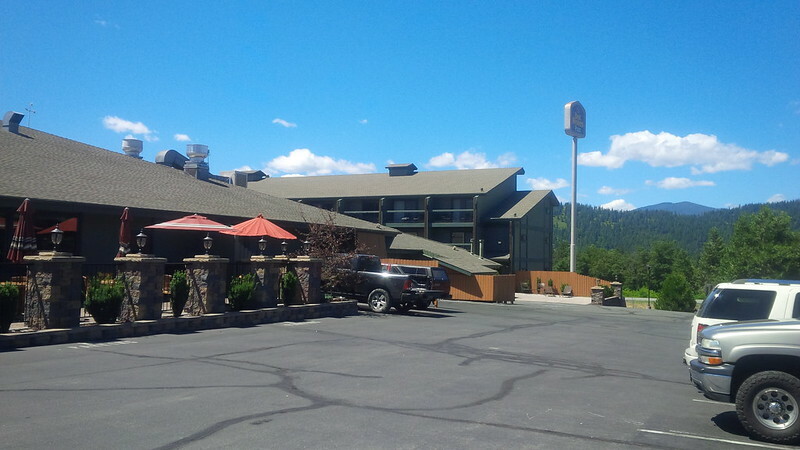 When we checked in overnight, there were no convenient parking spots left. 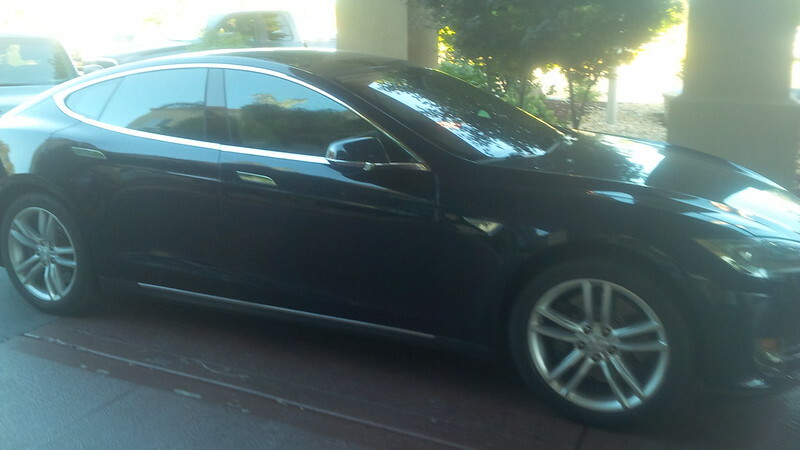 The Front Desk told us to park in its driveway. 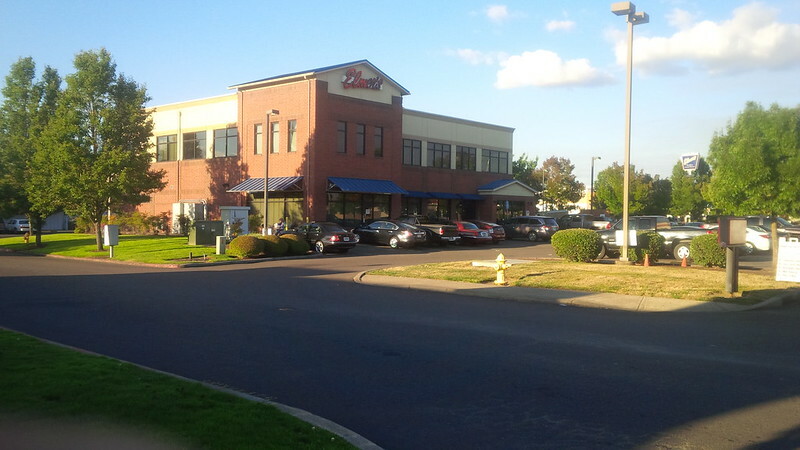 Since I wanted to charge on the NEMA 14-50 outlets that were available at the Hampton Inn and Suites at Red Bluff. I decided to move the car to the RV stalls in the morning. 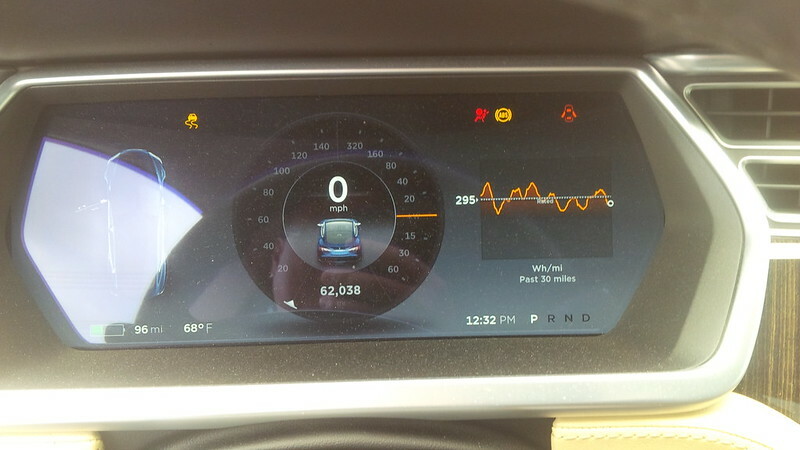 The range left on the battery in the morning was 210 miles and we parked the car with 211 miles, so it looks like we only lost 1 mile overnight. We had enough charge left to reach the Mt. 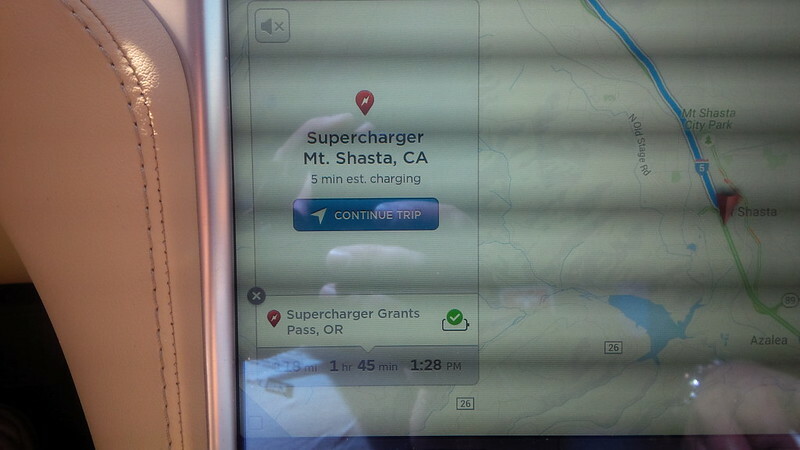 Shasta Supercharger which was only 89 miles away. 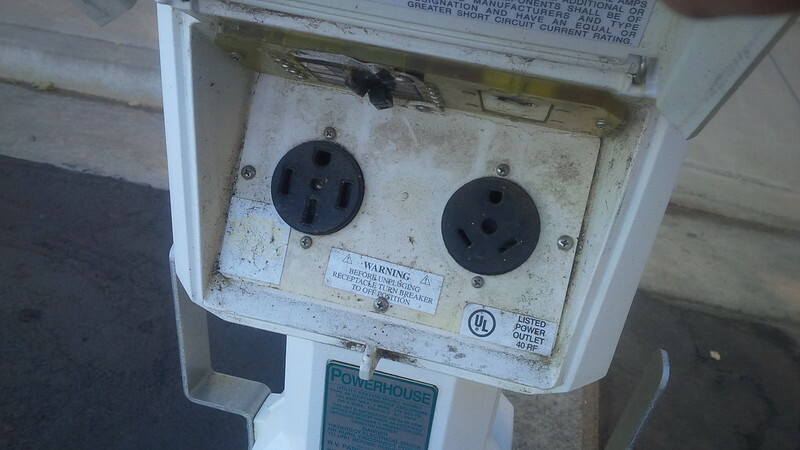 My desire to charge at this location was so that I can add it to my “places that I have charged” list than anything else. 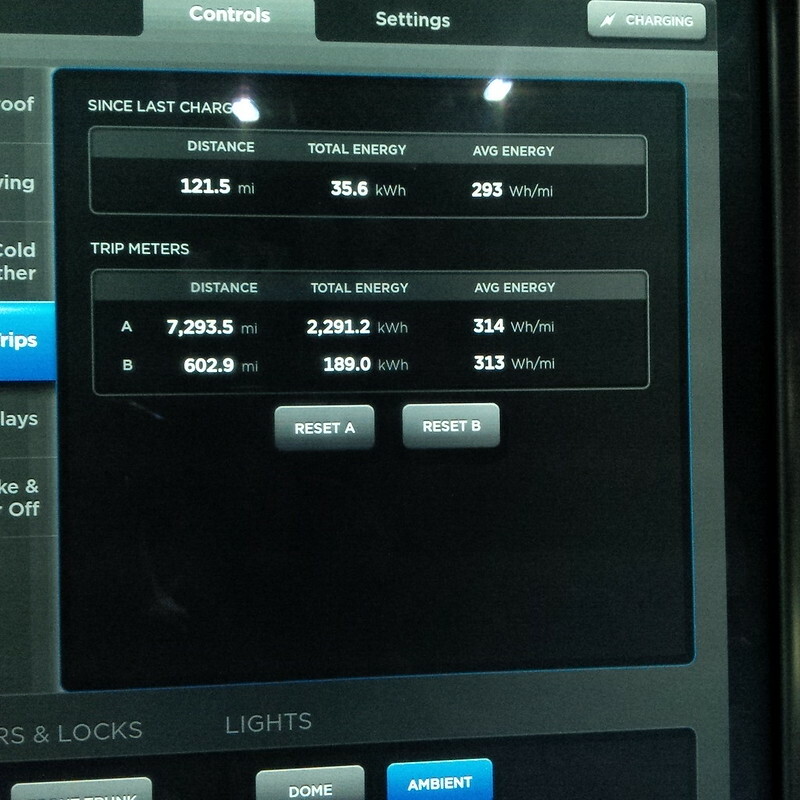 Furthermore, I wanted to see what speed the NEMA 14-50 outlets would take to recharge a Model S at this hotel. 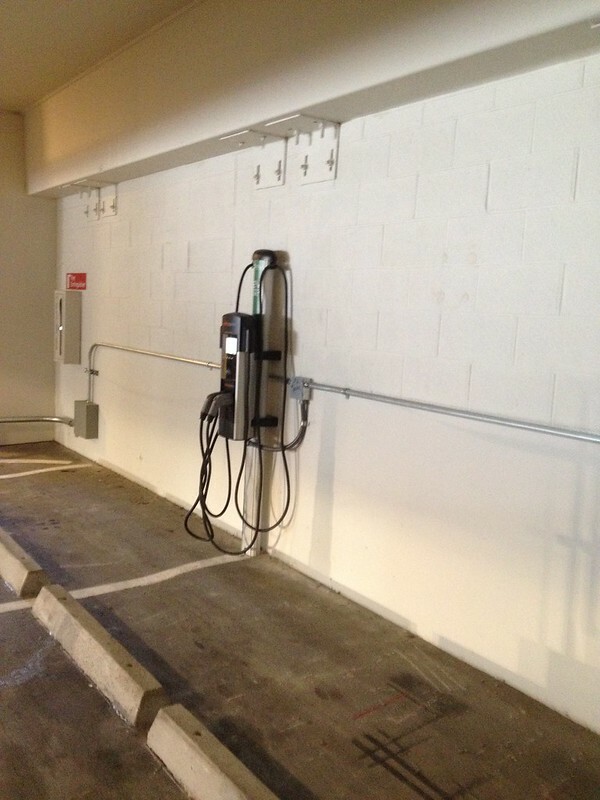 And the NEMA 14-50 is easily accessible, there was also another outlet there (pictured below) that kinda looks like a NEMA 10-30. 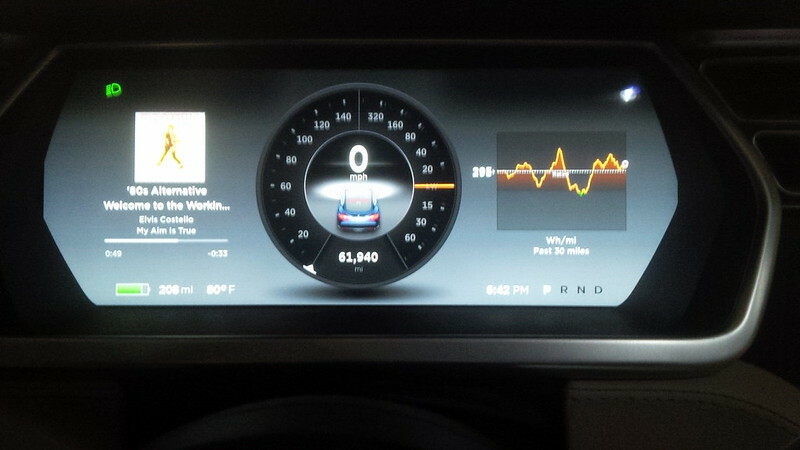 So, plugged in, and headed back to get ready for today’s drive. It looks like the location is getting a good 25 miles per hour. 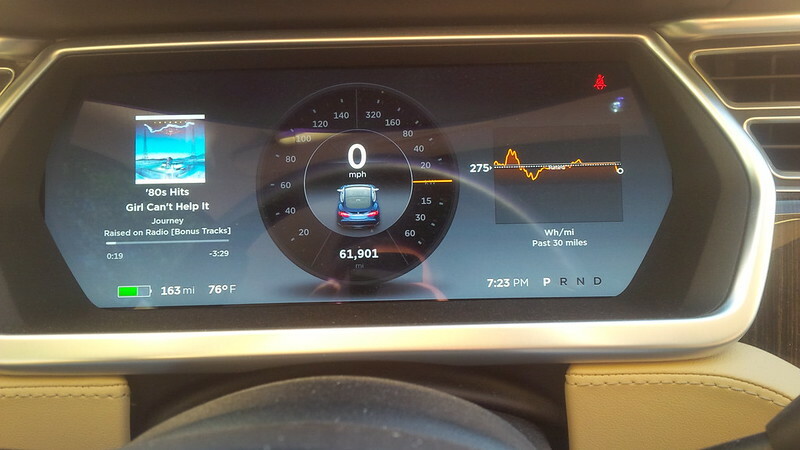 That’s a good rate and will make this location a possible stopping point on the way back to Reno on the trip to the Gigafactory. 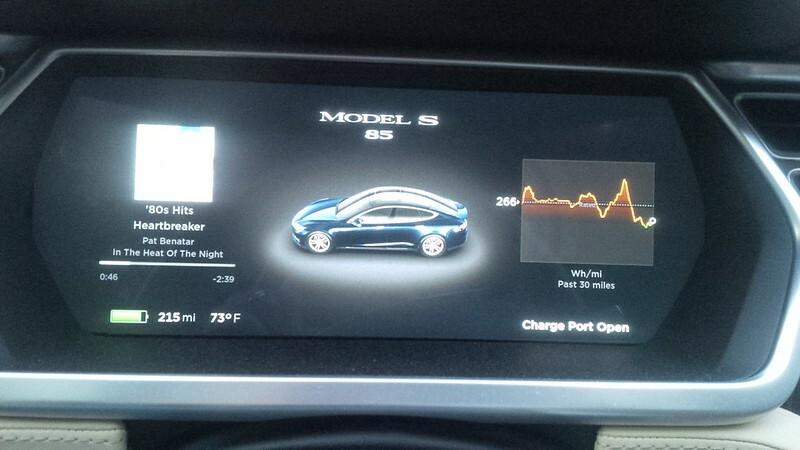 So, after breakfast and a few minutes to charge the car, we’re off to head to Portland. 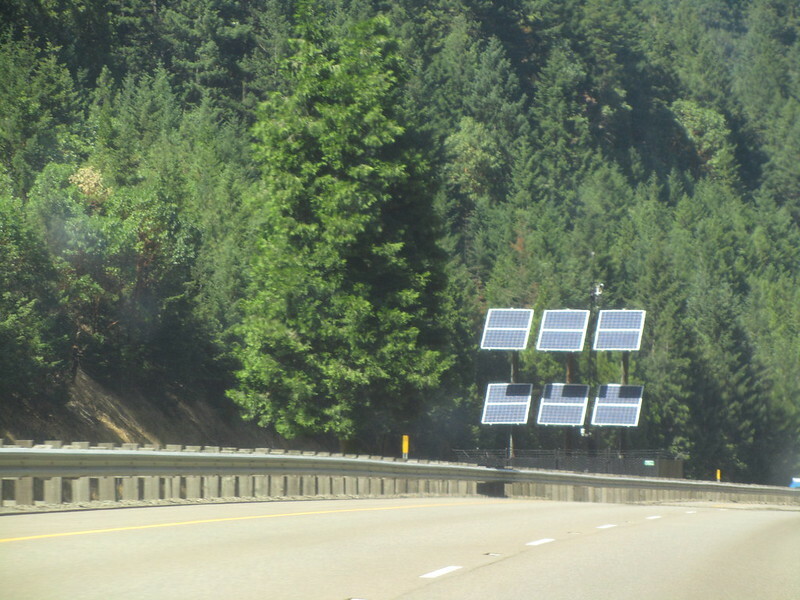 Looks like the Deer Crossing signs in California are more common in the Northern part of the state. 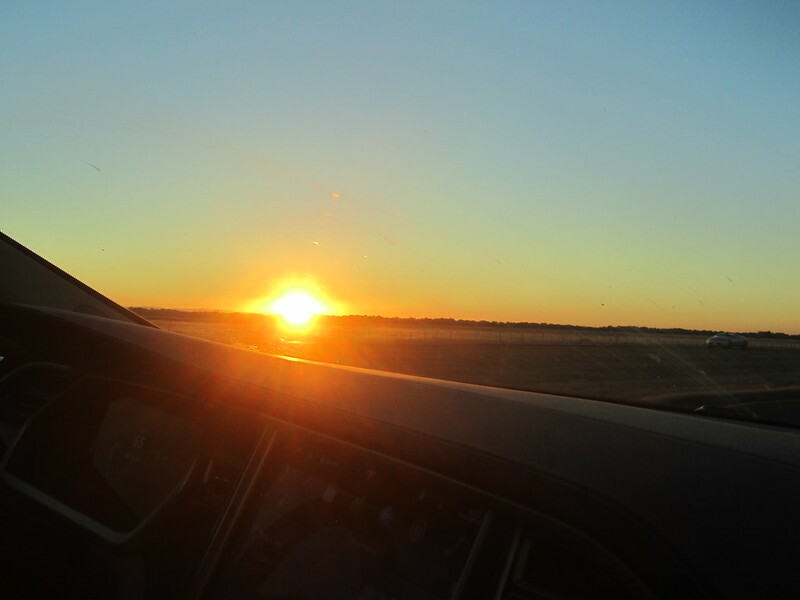 We’re still nervous about driving in areas where the wildlife is big enough to damage the car, but had planned on mitigating that challenge by minimizing the amount of night-time driving. 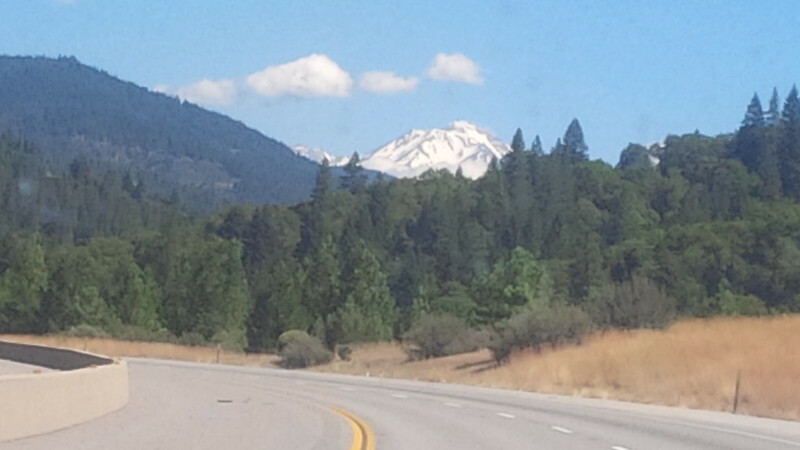 As we continued on our drive, we see a snow covered peak ahead – we’re guessing that’s Mt Shasta. 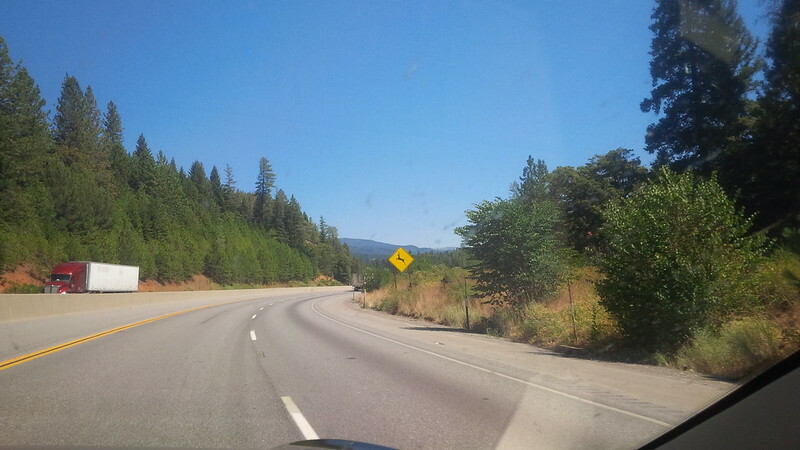 We spotted another wildlife sign on this drive. 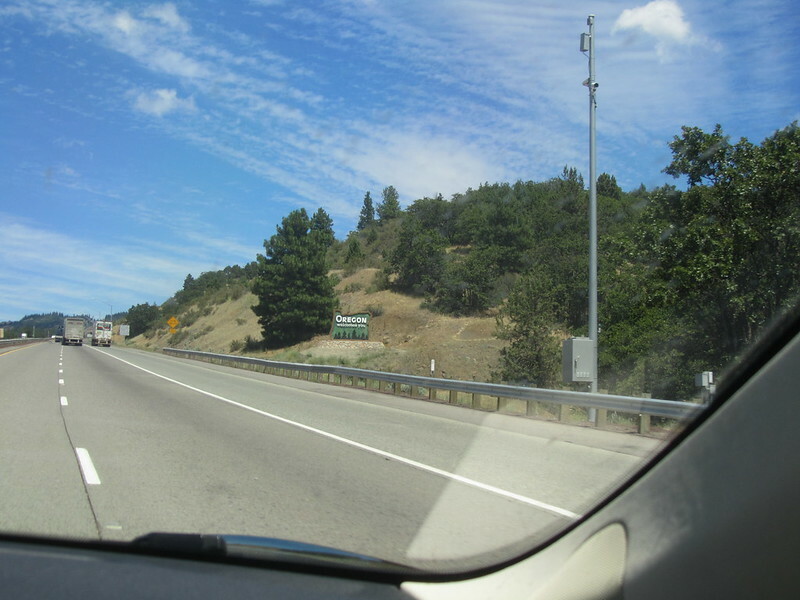 I must admit, the Bear Crossing signs in California are a little cuter than other states. We saw an interesting scenic overlook, and thought to get a nice picture. 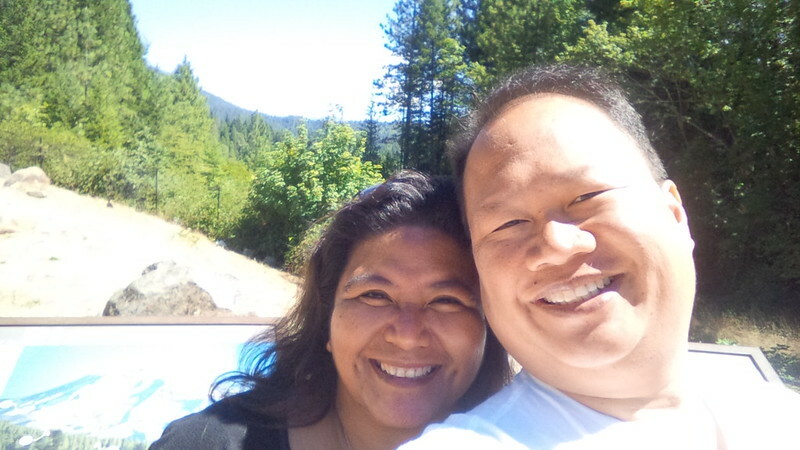 Here’s a great shot of us… Mount Shasta was supposed to be behind us, but the sun was a little too sunny. 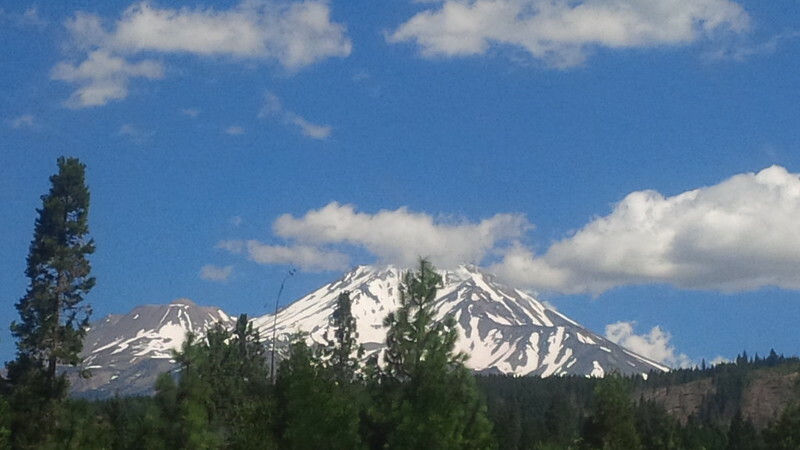 The drive was a little bit of a climb, but nothing we couldn’t manage with over 210 miles of range at the start (and more since we convenience charged on the NEMA 14-50 at our hotel) we find ourselves at the Mount Shasta Supercharger. 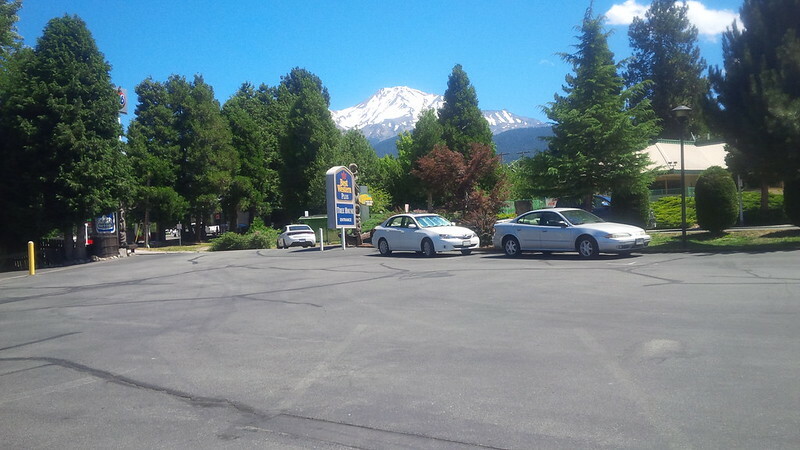 The Mount Shasta Supercharger is one of the earliest supercharger locations and is located at the Best Western in Mount Shasta. 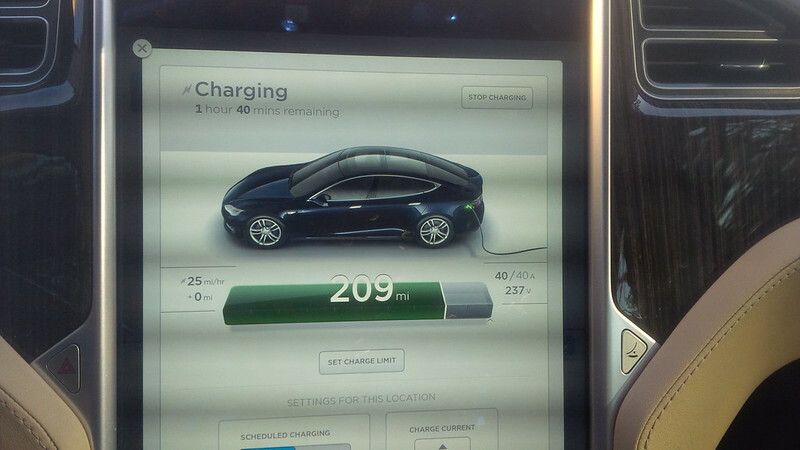 It hasn’t expanded since its original four supercharger stalls at launch. 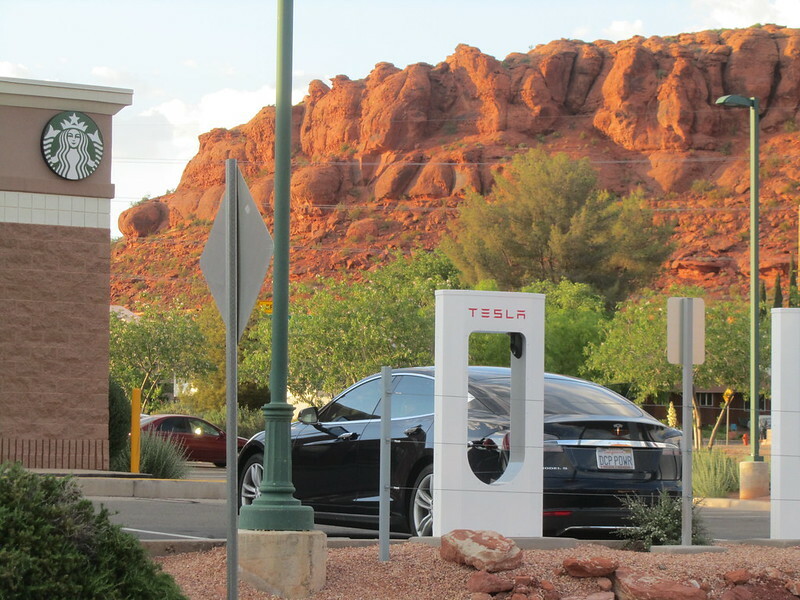 We were the only ones charging at this location on our drive, but anticipate some congestion on busy Holidays or at least during our drive back to Reno. 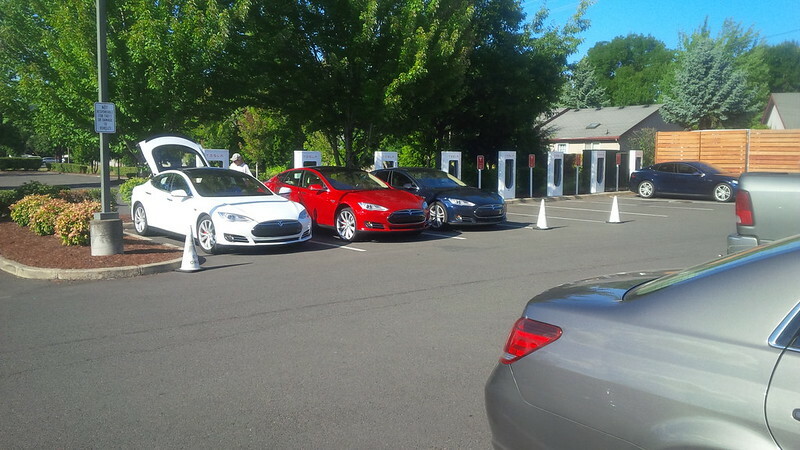 After a short charge at this location, we headed onward from our last California supercharger stop to our first Oregon supercharger stop at Grants Pass, Oregon. 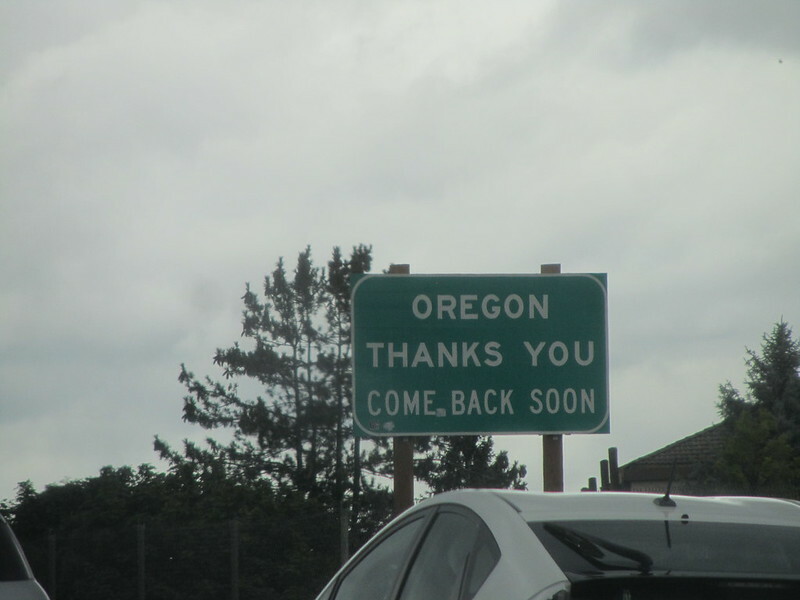 We were greeted with the Oregon state sign at the border. It was a bit understated. 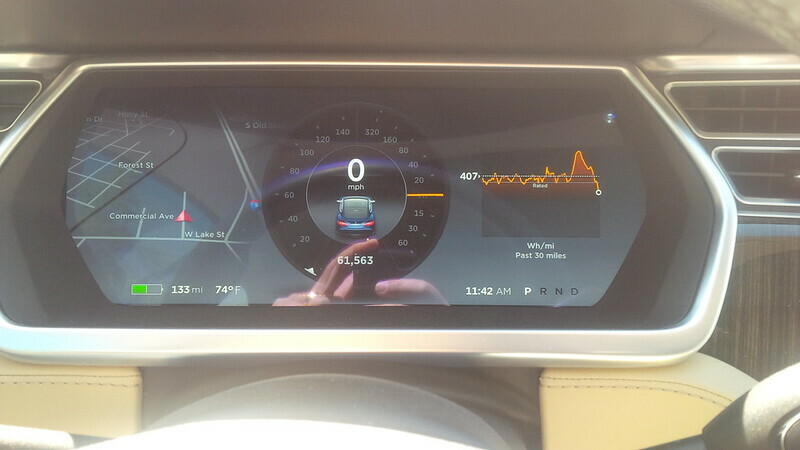 The drive itself was a bit of a hilly ride, but it looks like we were headed more downhill than uphill when we took this photo of the energy chart. This was an unexpected sight. 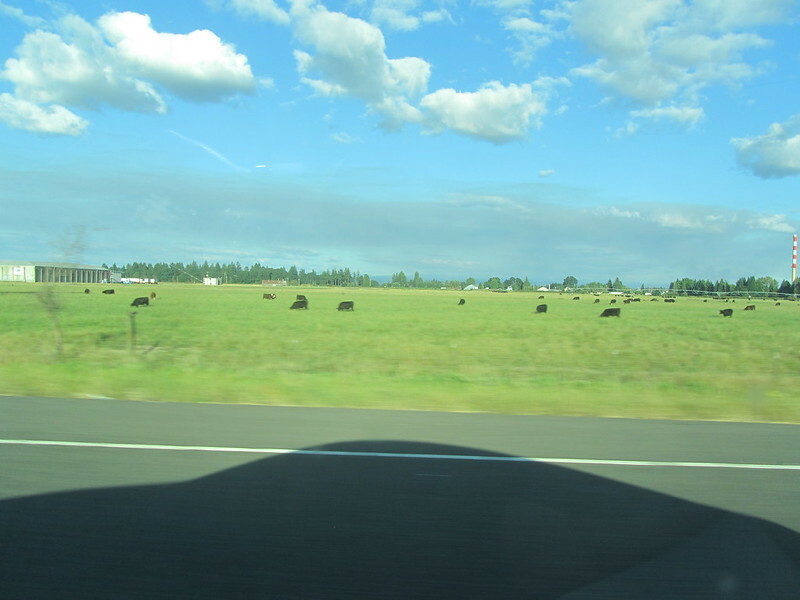 The formation in the distance hearkened us to our drive through Utah, except these were green and not barren of foliage as the Utah ones were. 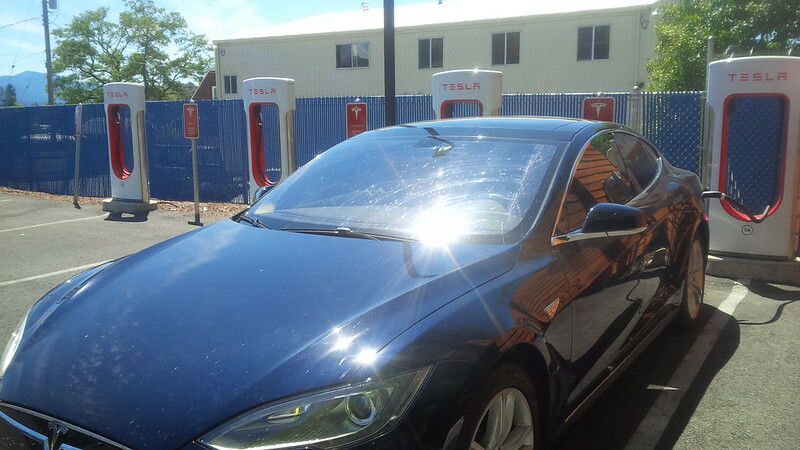 We stopped off at the supercharger in Grants Pass which was at the rear parking lot of the Black Bear Diner in town. 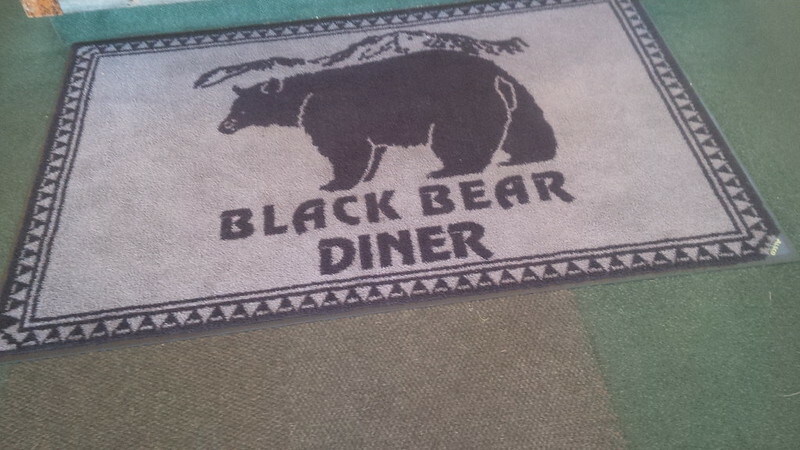 Looking at my pictures, one would think that The Black Bear Diner is a store for stuffed teddy bears, it’s not, it’s a chain of restaurants and I decided to take note of the business hours for the Black Bear Diner, just in case we decide to stop for a meal here on the way back. 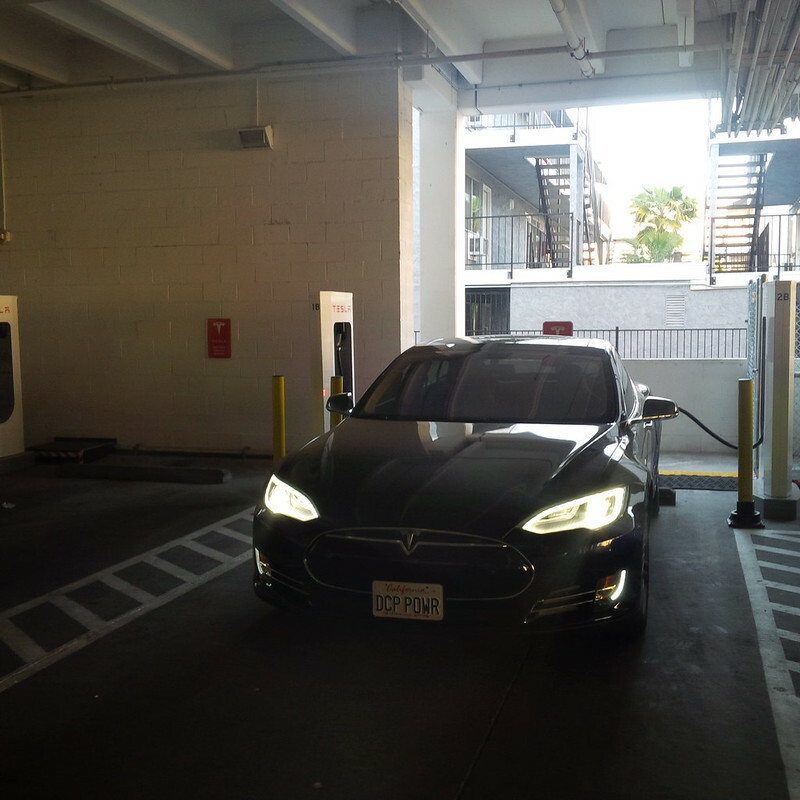 This was another four stall location and we shared the charging location with one other car for a short while and then were left alone. 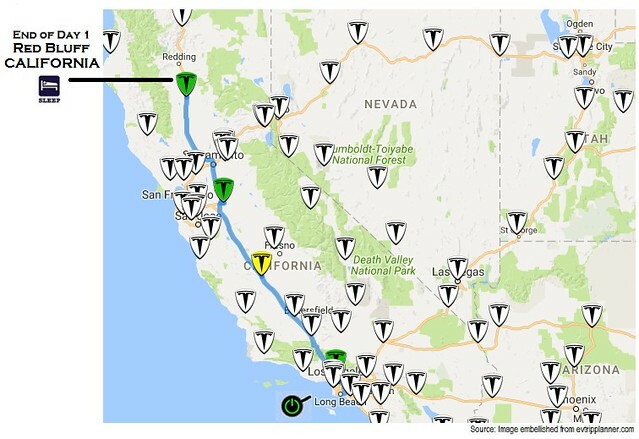 As we headed toward Oregon, we had scheduled an EV Meetup with MelindaV of Model3Ownersclub.com. 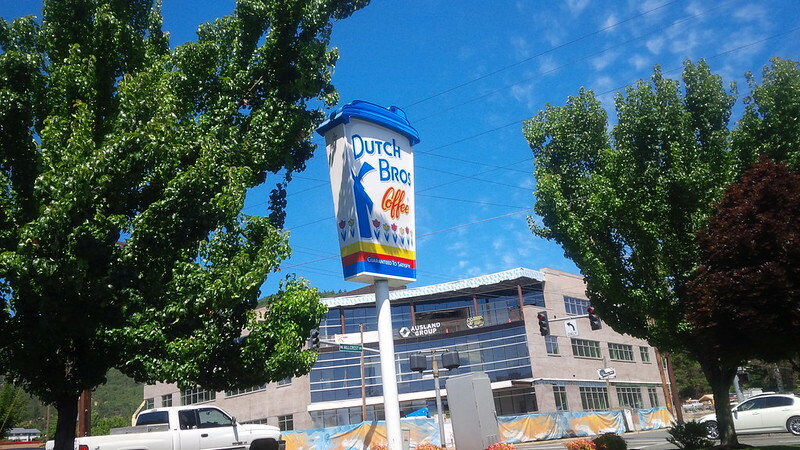 She clued us into an Oregon coffee chain called Dutch Brothers. There was one a few short blocks away, so we decided to give it a try. We tried two different iced coffees. 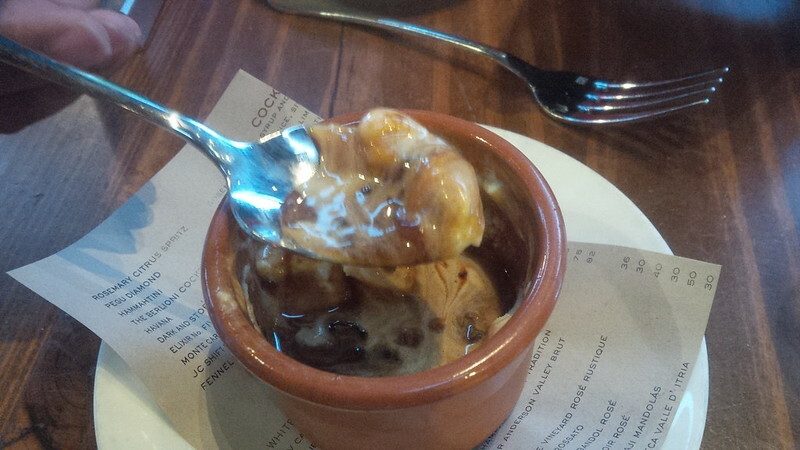 I ordered an Iced Latte with sweetener and my wife ordered the Caramelizer (on their menu.) The one I ordered was not as good as the one my better half did, so I ended up sharing her drink. 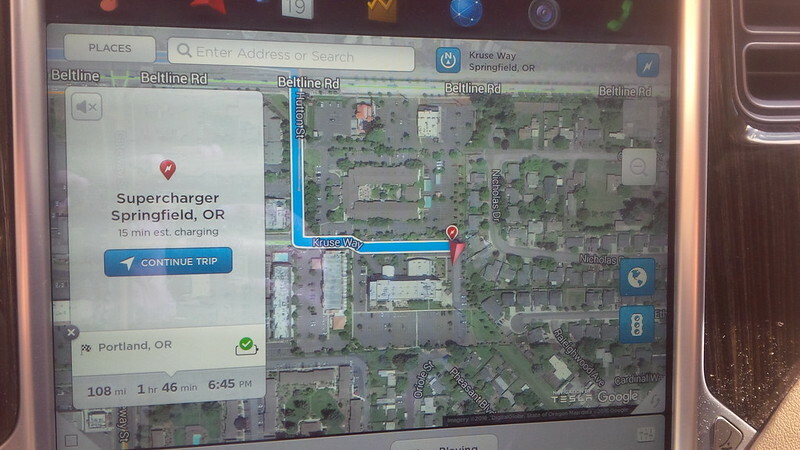 After fueling both the car and driver, we continued onward to the Springfield/Eugene, OR Supercharger. 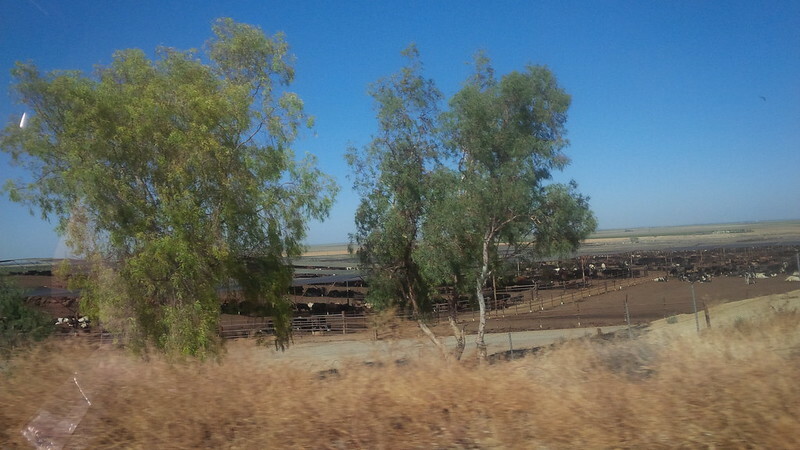 Spotted some cows that were not as penned up as the ones that we saw around Harris Ranch. We spotted a few “bald spots” in the tree lines. 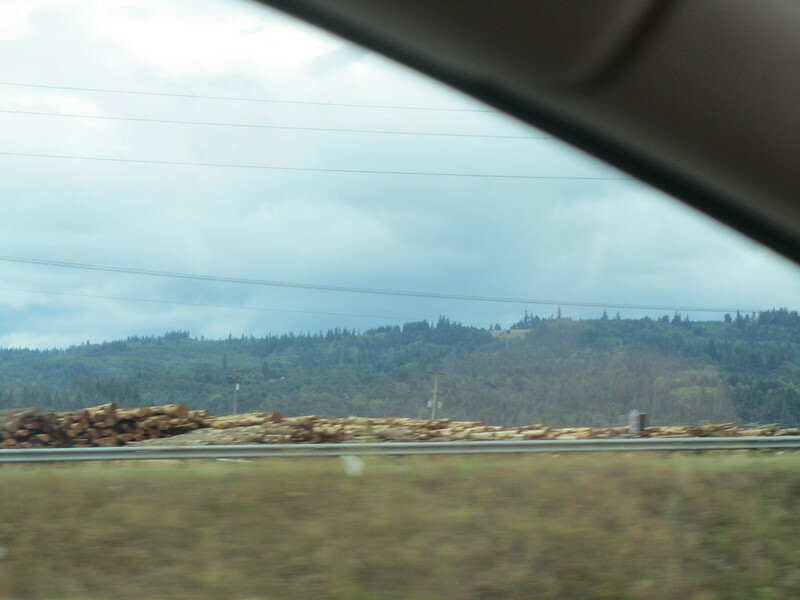 Not sure what causes tree-line pattern baldness, but hypothesized that perhaps this was the lumber industry working. 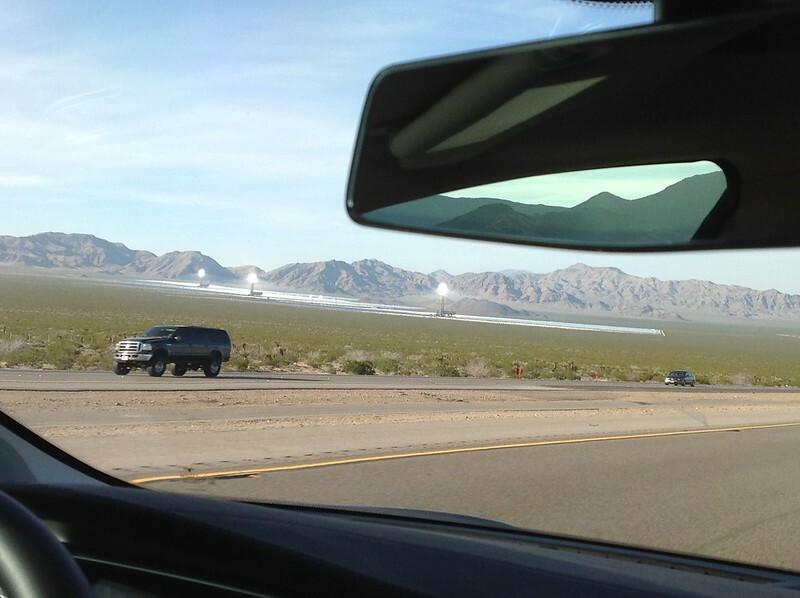 As usual, the sight of some renewable energy generation on the drive gets my attention, and this was on the drive. One of the things that tell us that we’re not in Califronia anymore. The scenery is more green than golden. 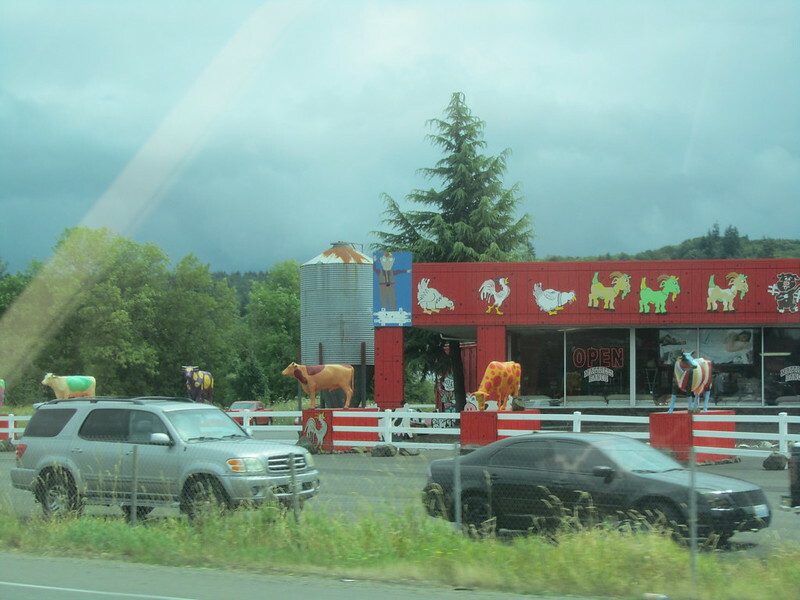 Some more “free range” cows spotted. 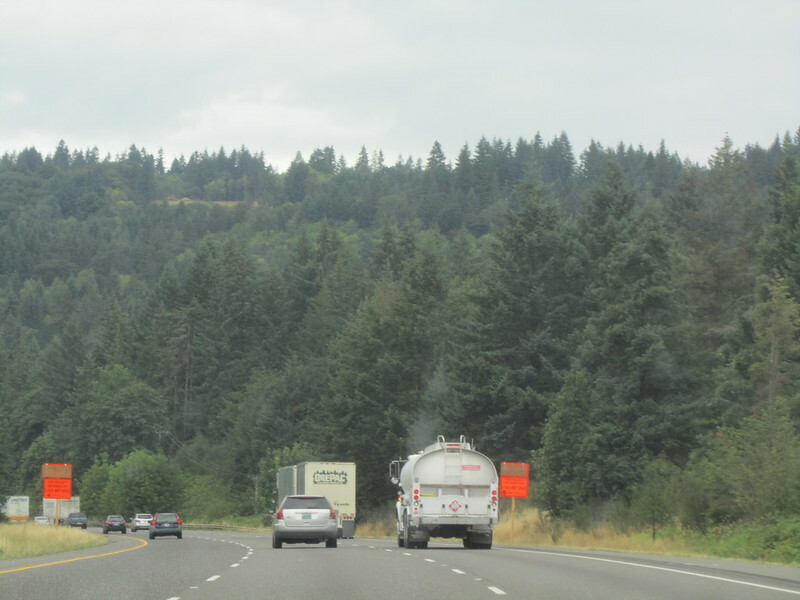 We think that we may have spotted some of those missing trees from the “tree line pattern baldness” that we’ve been seeing on this drive. 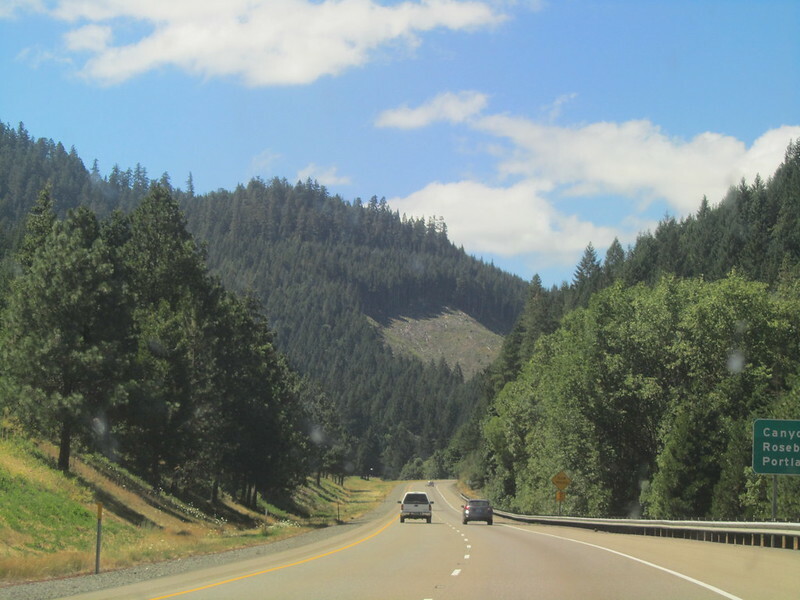 The drive was not as mountainous as Interstate 70 through Colorado, but there were still some interesting differences in elevation on this drive. 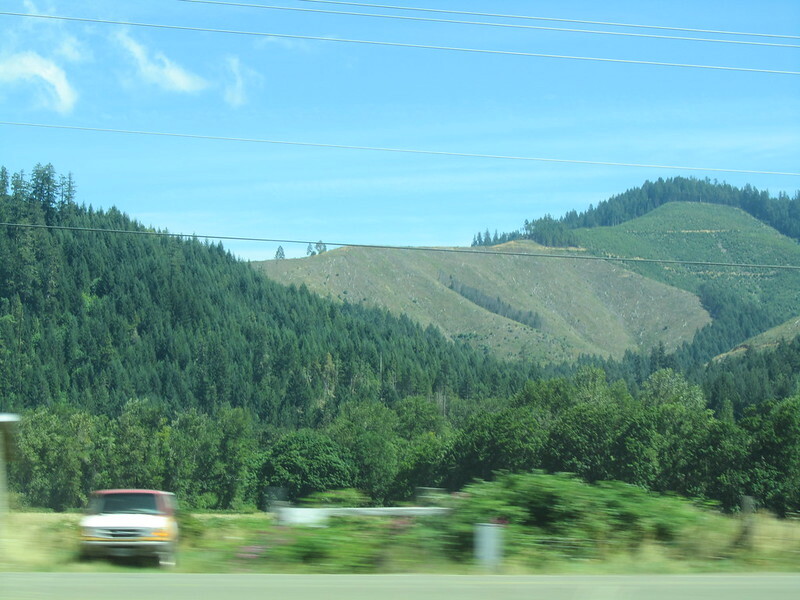 We tried to capture the sense of the rolling hills that we had on Interstate 5 between Grants Pass and Eugene/Springfield and thought this shot conveyed it best. 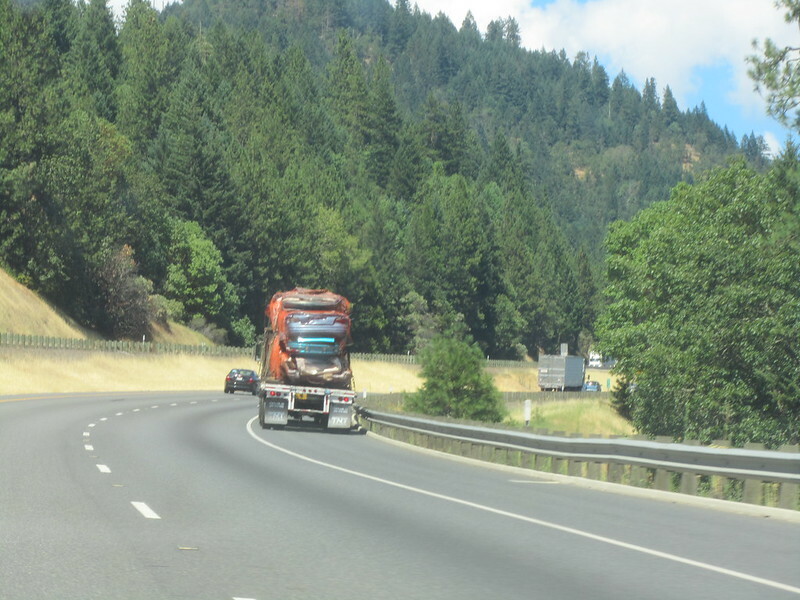 Oregon is one of the few states that still allow trucks to travel hauling three trailers for one Big Rig. 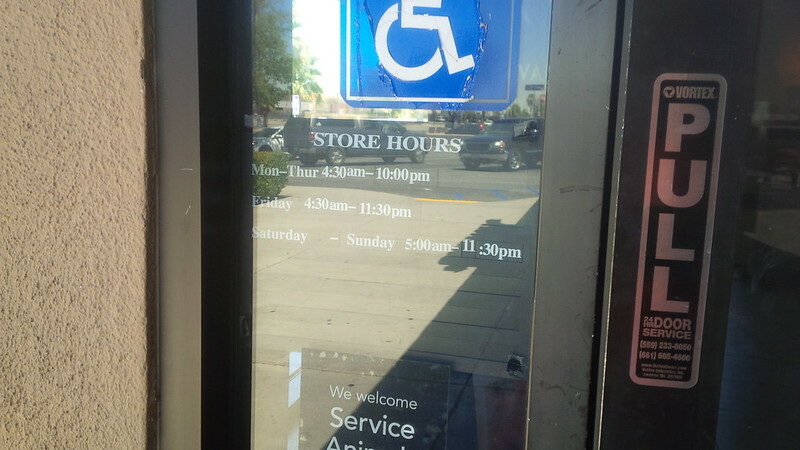 This practice was stopped in California years ago and we’re surprised to still spot the practice in other states. 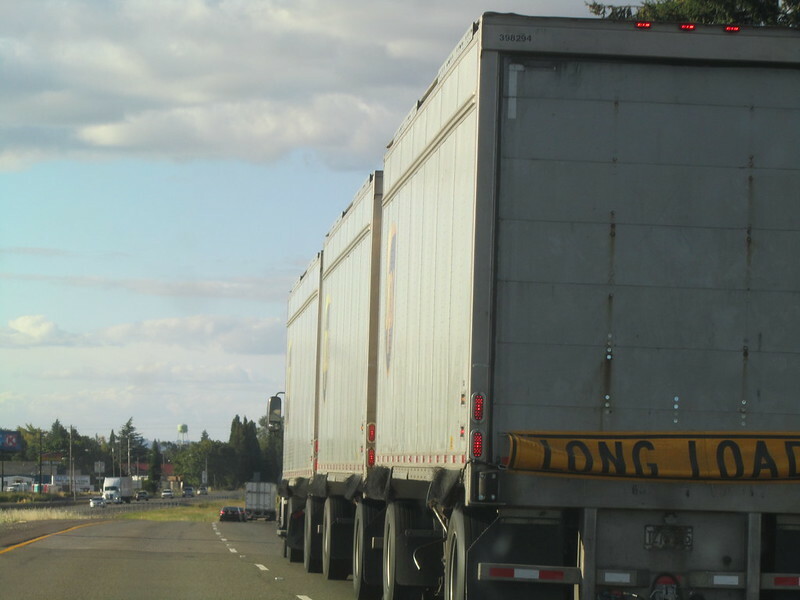 I guess that Oregon requires these Long Load signs to be placed for those hauling three trailers. 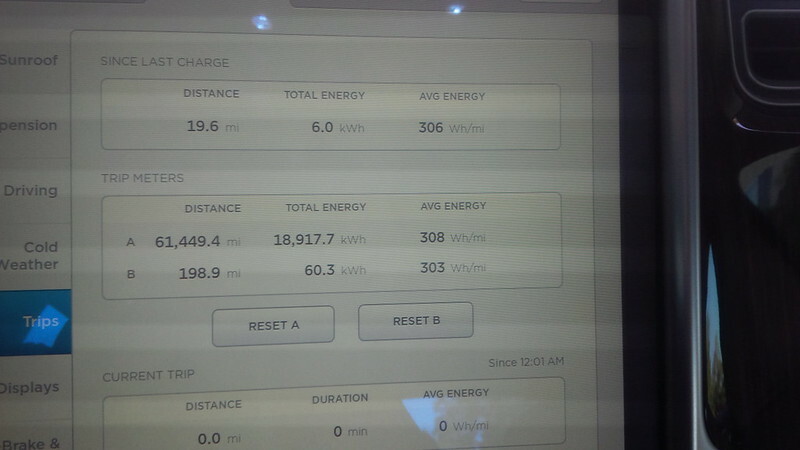 We arrived at the Eugene/Springfield Supercharger needing 108 miles to make it to our destination. 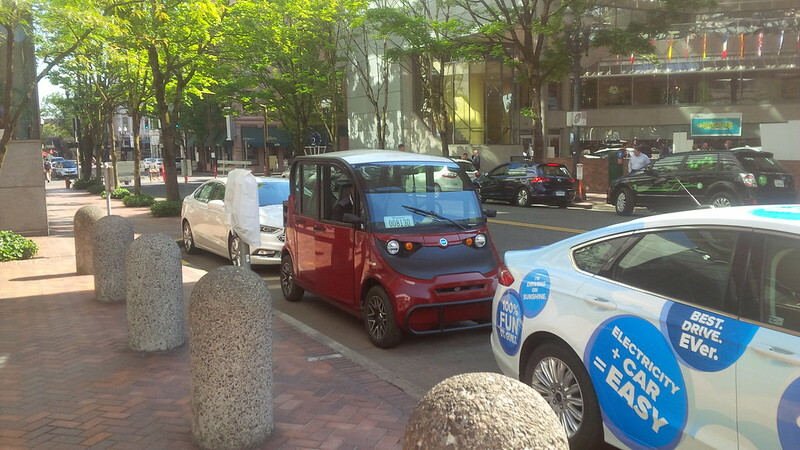 However, I wanted to put as much “in the tank” for driving around Portland charge. So, we decided to stick around. 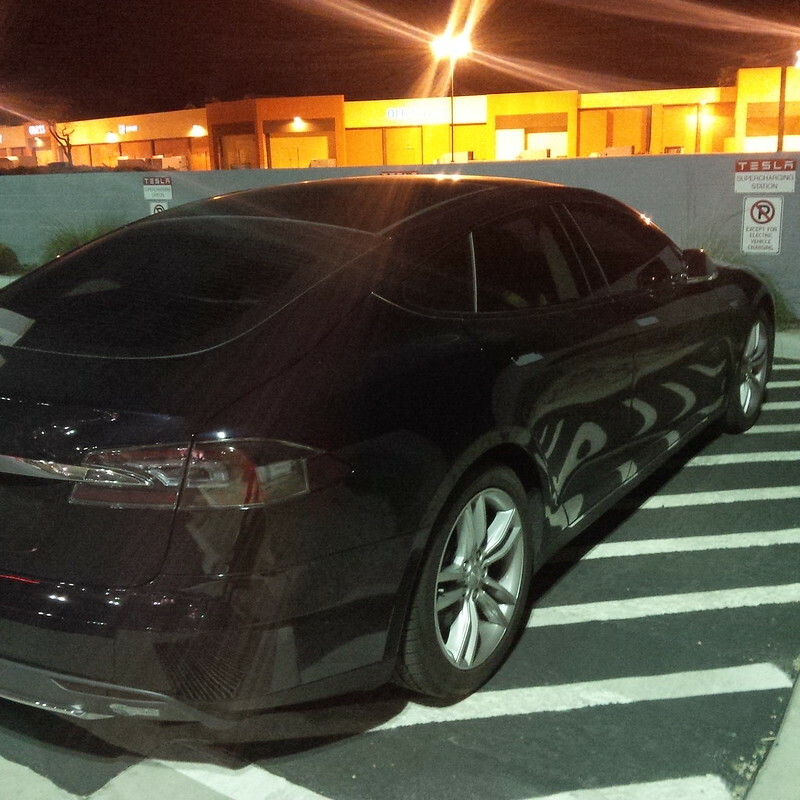 Looks like many of the owners in the area understand supercharger pairing. 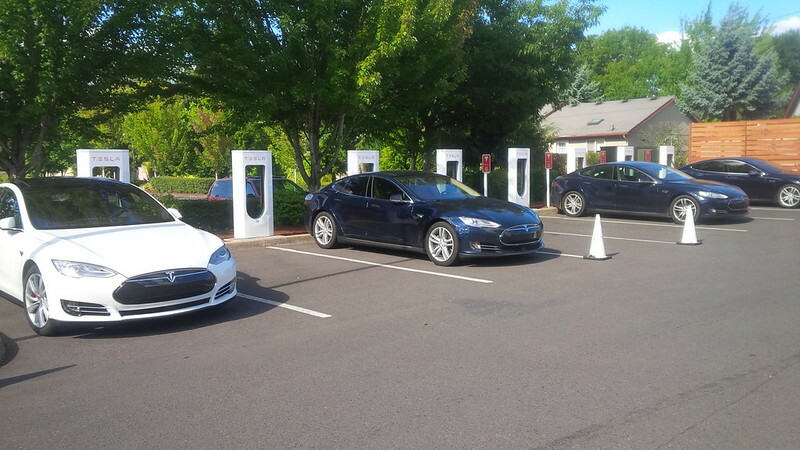 We charged at this location for a while and had the opportunity to spot the Red, White, and Blue Model S combination several times. Though in this first shot, the order is White, Red, and Blue. 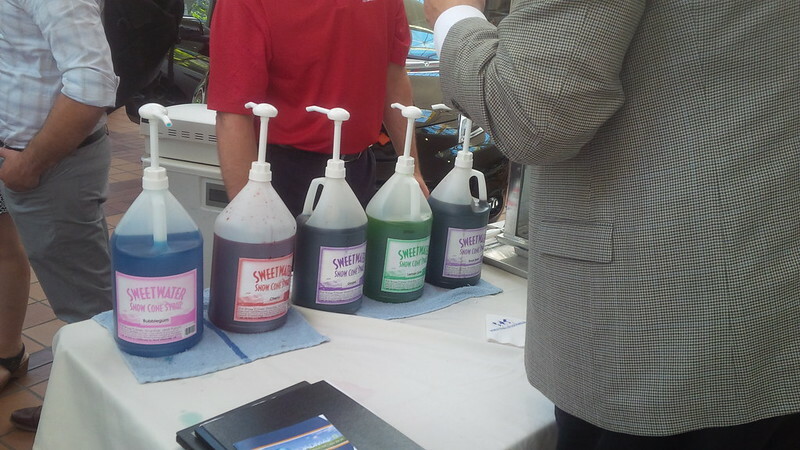 We were patient and were able to get a photograph at this angle which put it in the Red, White, and Blue order. 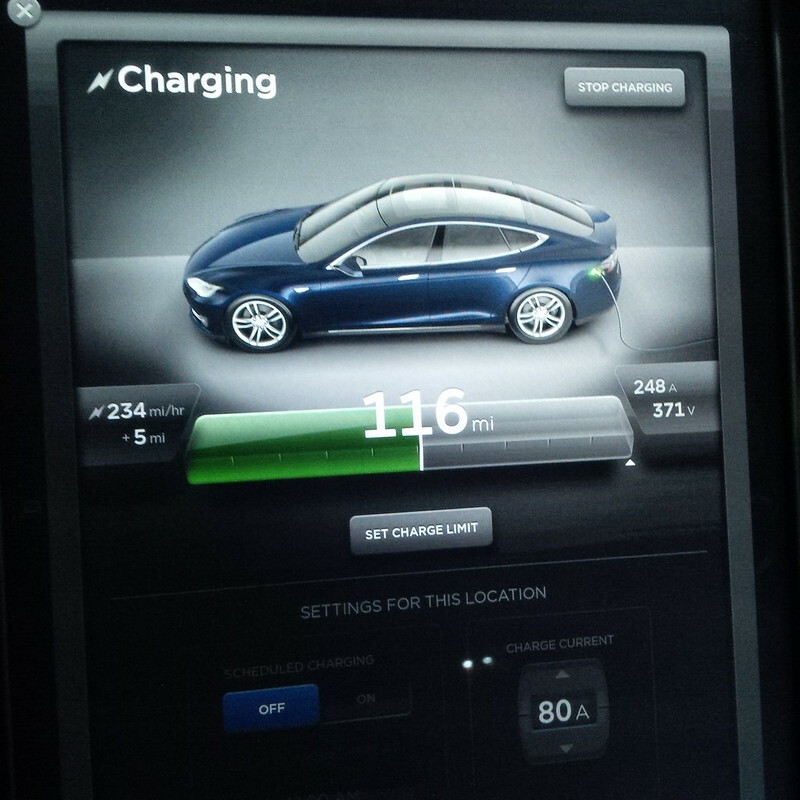 We range charged to make sure that we arrived at our hotel with as high a charge that we can. 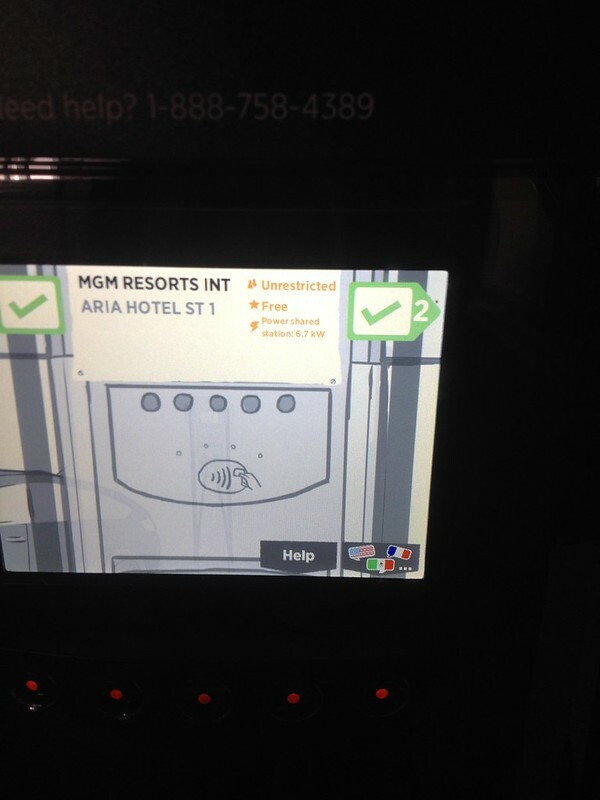 When we planned our hotel, the hotel we chose had a Level 2 charger show up on Plugshare. 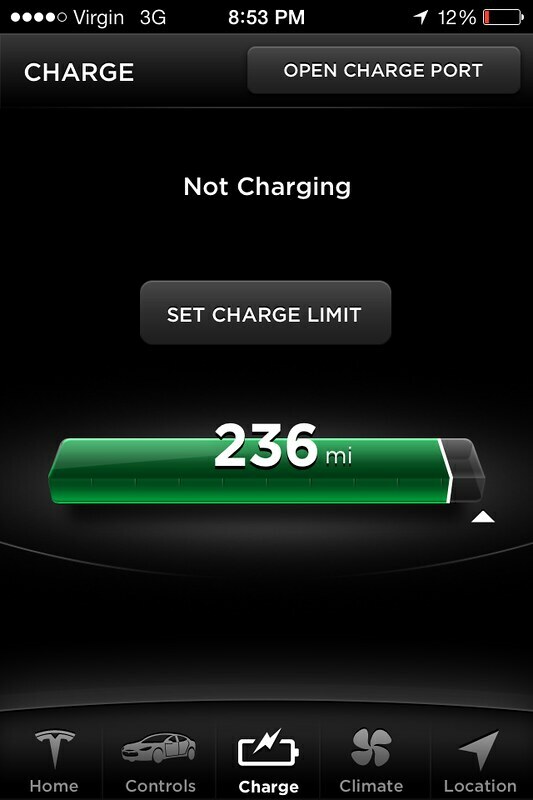 It was not a destination charger under Tesla’s program, it was a pay charger that I did not have an account with. I got an account with the provider, however, I wanted to minimize using it, if possible. Besides, I believe that the initial start-up balance required by the provider was $20. I wasn’t intending on using the network that often however I was setting it up so that I could use the network if we needed to. 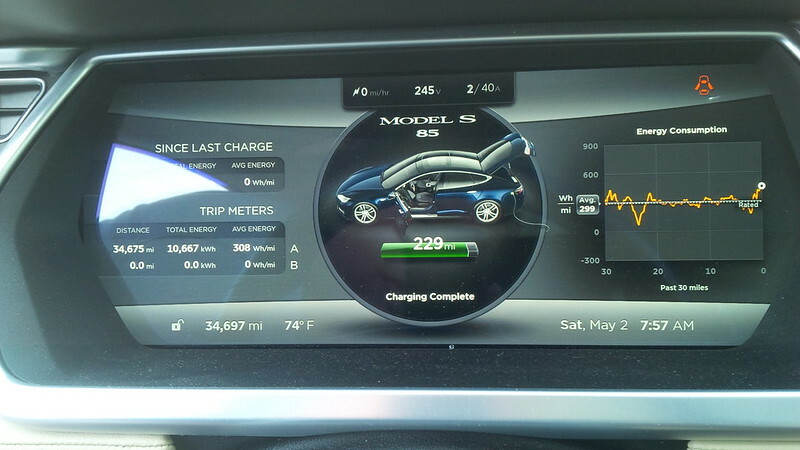 We left the charger with 248 miles and decided to head to the Electric Avenue charger in Portland. 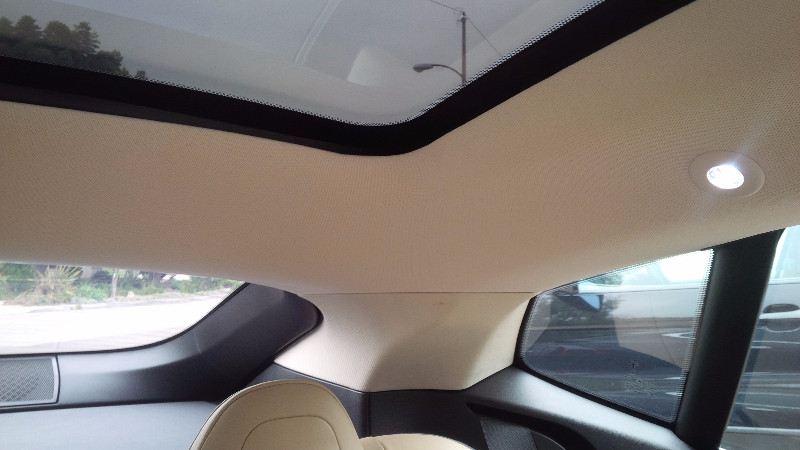 We had scheduled a meet-up with MelindaV from Model3Ownersclub.com and continued on our way. 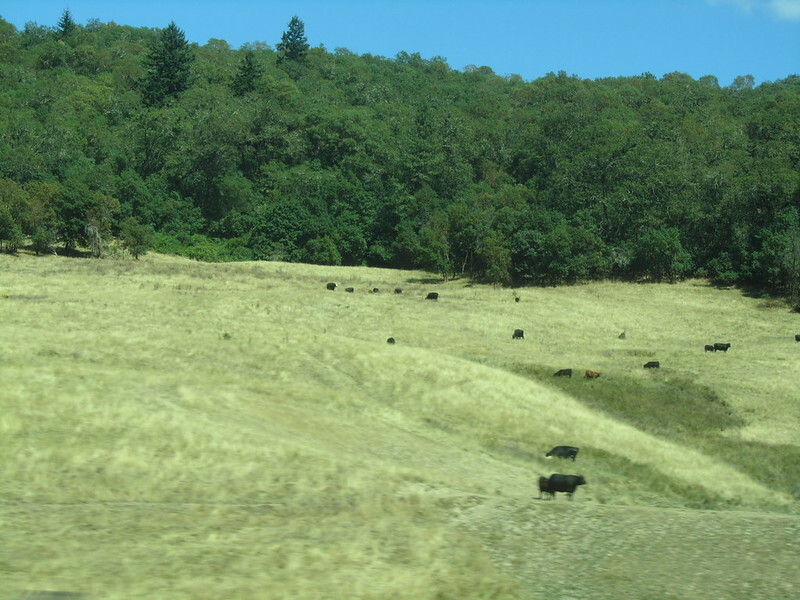 Spotted more free range cows. Some more triple trailer trucks. 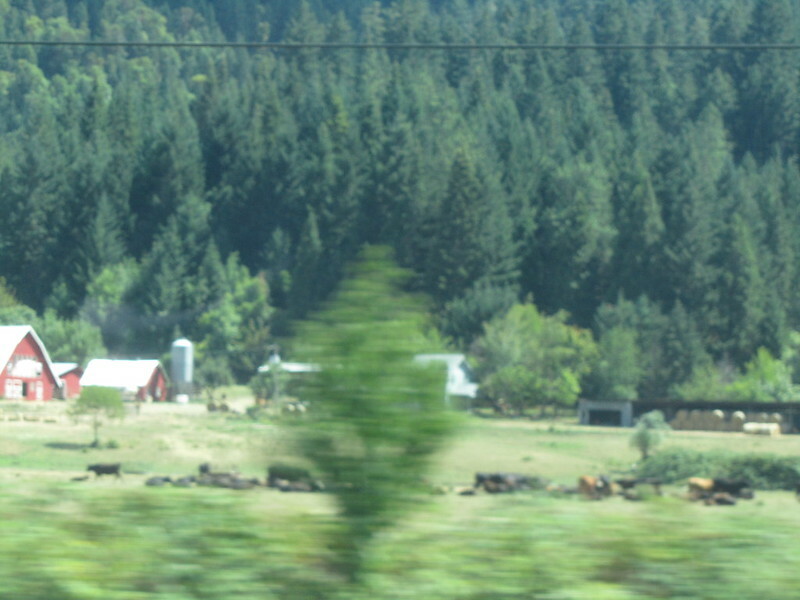 Even more free range cows. 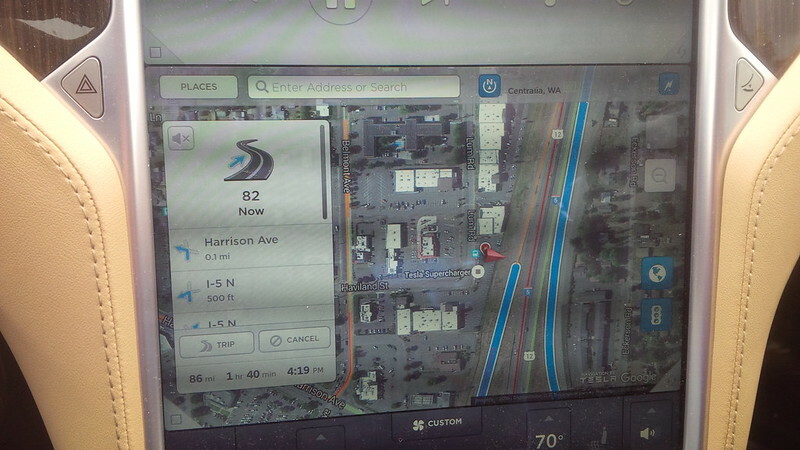 As we neared Portland, I was surprised to see a supercharger show up on my Navigation. 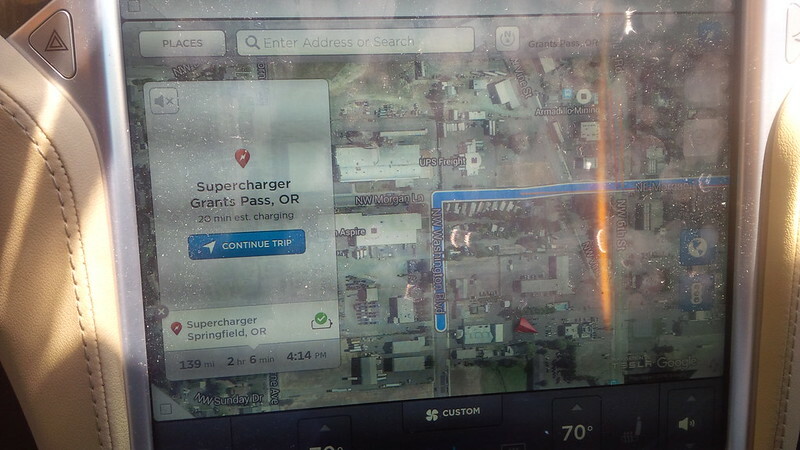 We were nearing the Woodburn Outlet Stores and our map showed a Supercharger there. 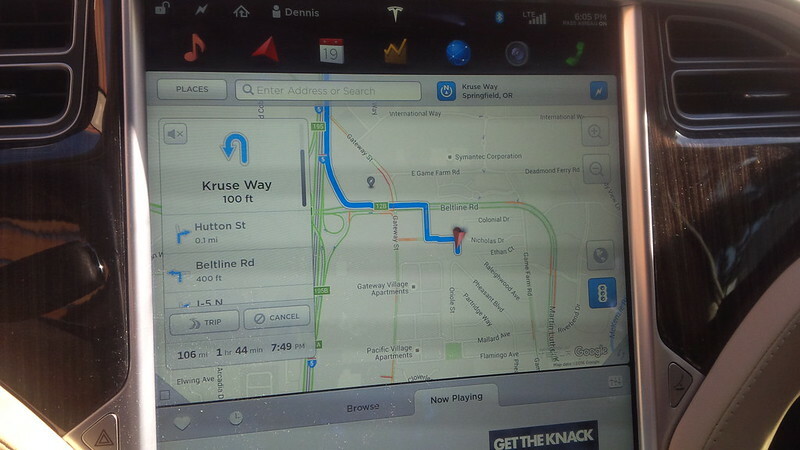 Our original routing skipped this supercharger entirely. We were getting quite hungry for dinner that we decided to combine a charge stop with our dinner. 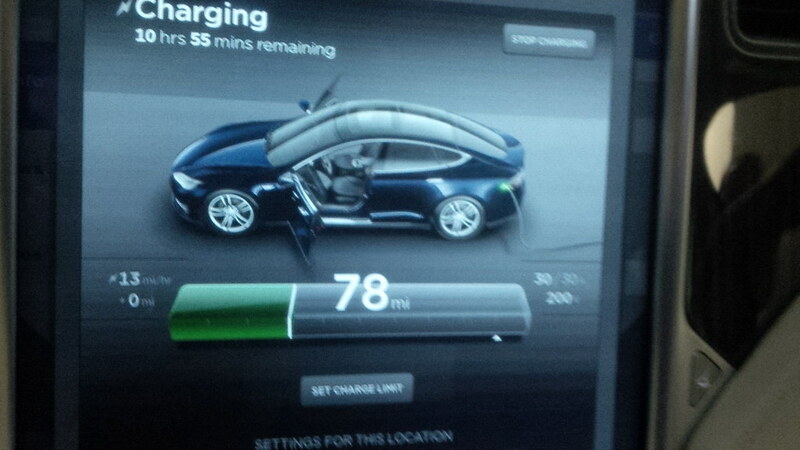 We used 79 miles since we last charged and we decided to stop at this location so that can minimize using the Level 2 at our hotel. 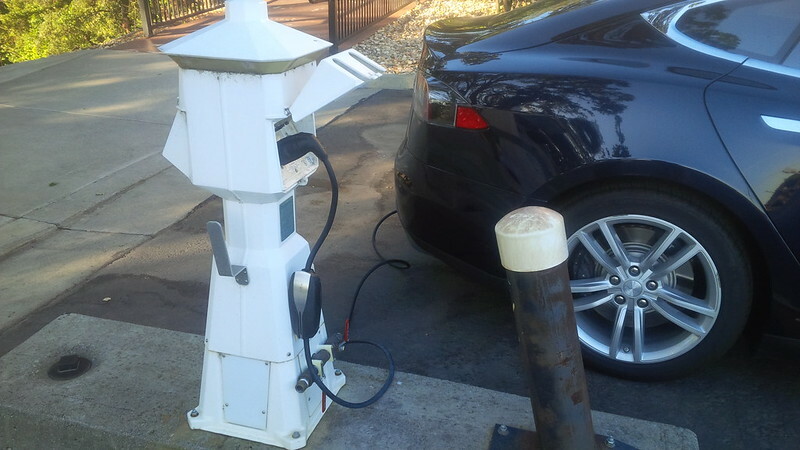 Additionally, in doing so, we can take full use of the high power Level 2 at the location to recover miles while we meetup with MelindaV rather than take up a valuable CHAdeMO station at Electric Avenue. Here’s a nice panoramic of the multiple stalls at Woodburn. 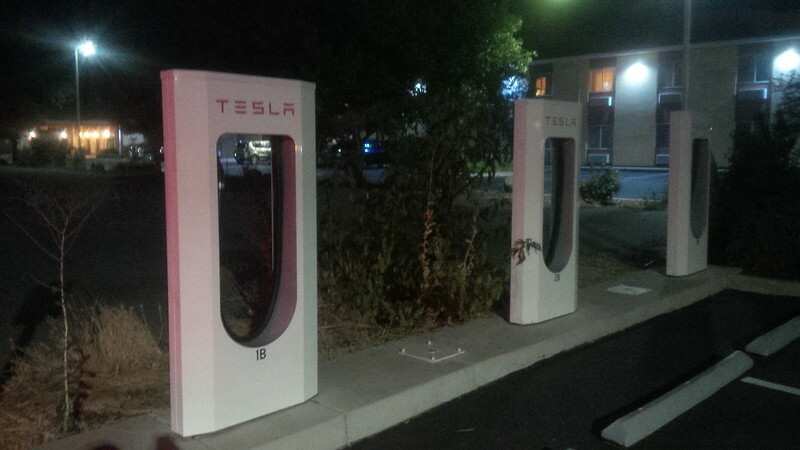 The supercharger is located at the parking lot for Elmer’s Restaurant. 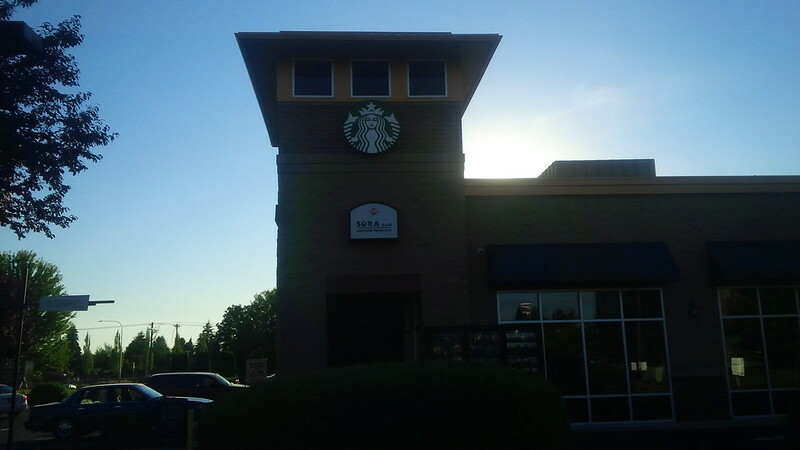 But across the parking lot is a Starbucks and Sora Sushi. 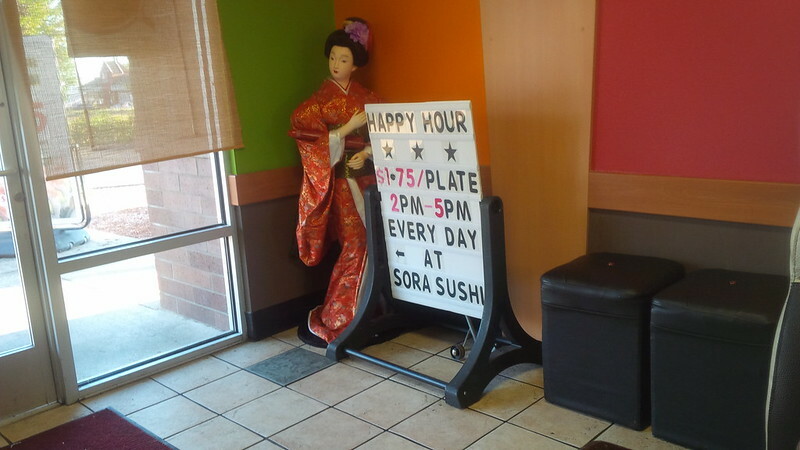 We decided to have dinner at Sora Sushi. 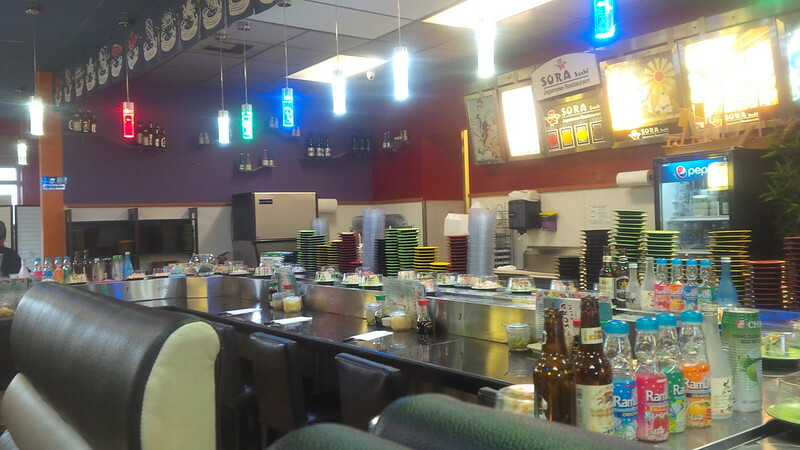 We’ve actually been to this sushi bar a few years prior on a fun weekend trip to Portland to go to the Willamette Valley for wine tasting. Part of that weekend was a quick shopping trip to the nearly adjacent outlet stores. 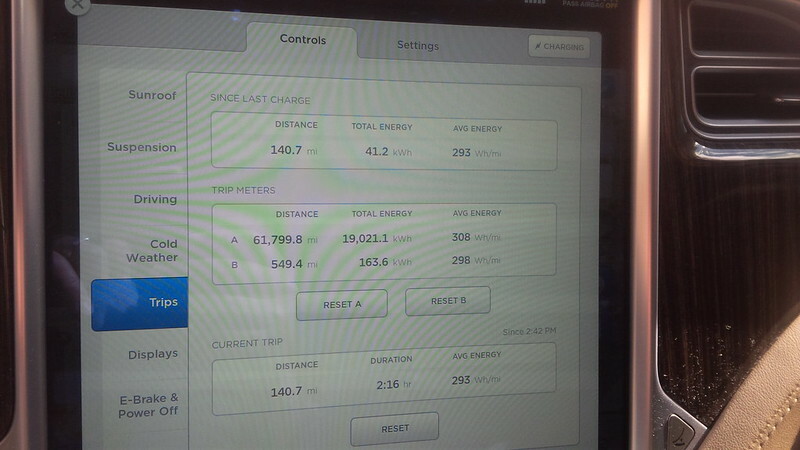 The supercharger was not even a potential location at the time that we stopped here previously. 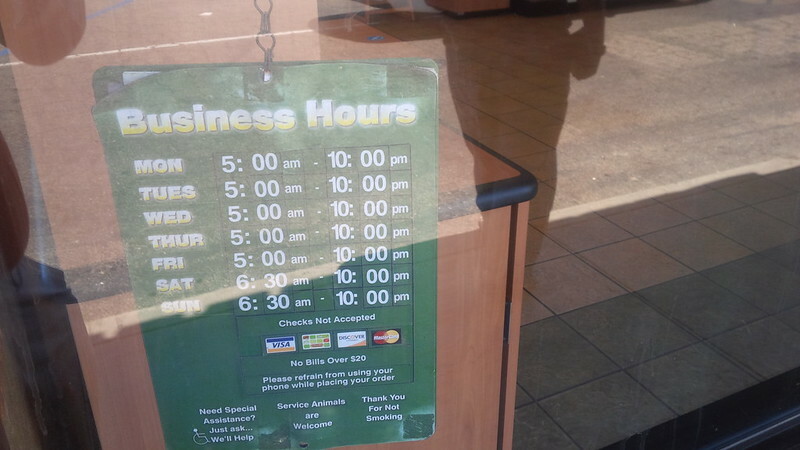 It looks like we missed half-off sushi time. 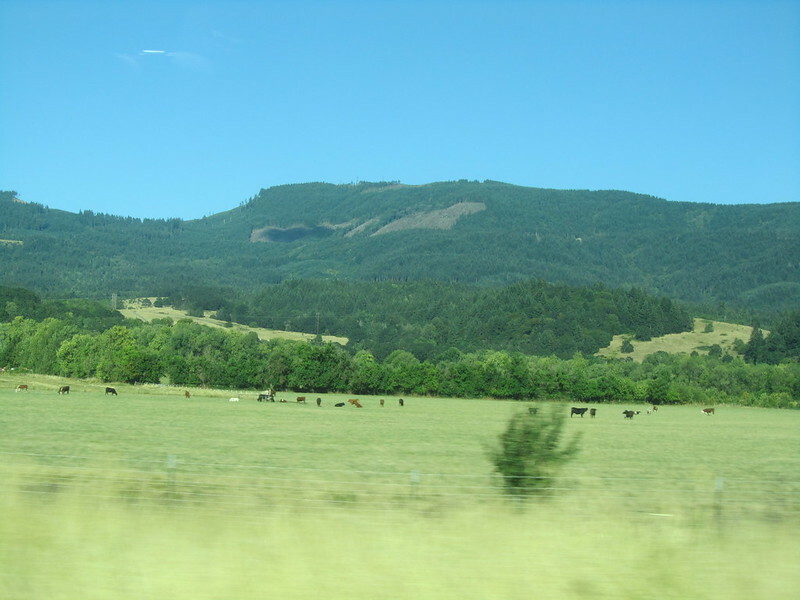 Perhaps next-time we stop off at Woodburn. 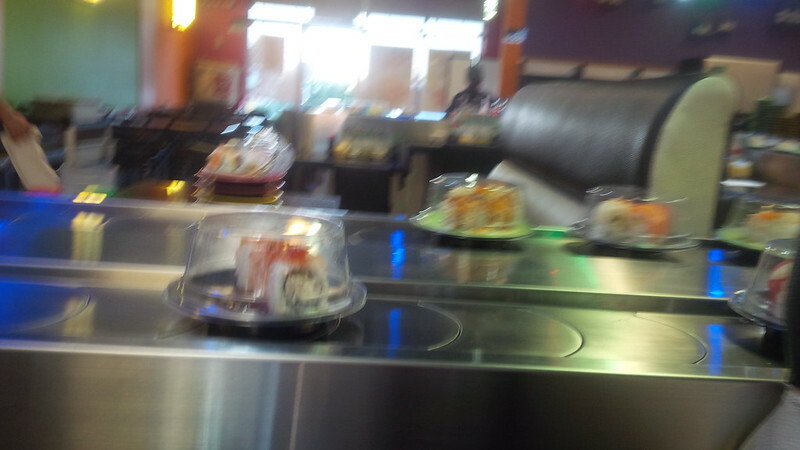 Sora Sushi is a conveyor belt sushi, so the plates zoom on by. The prices are reasonable and the fish was tasty. 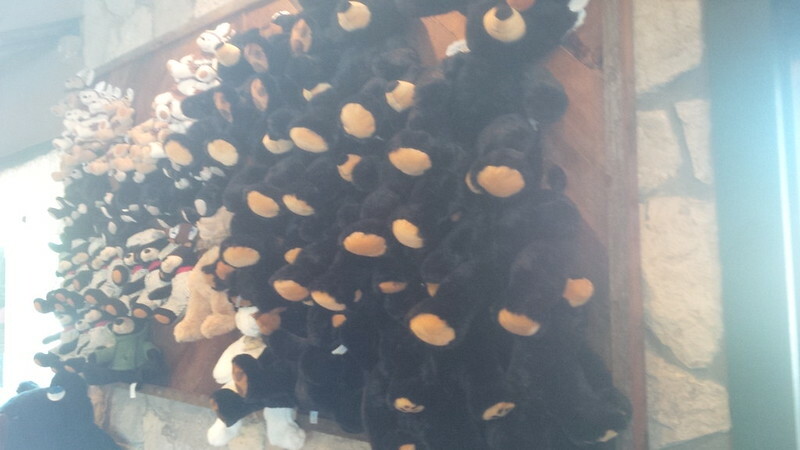 Additionally, one can also order to have something made for one’s self. 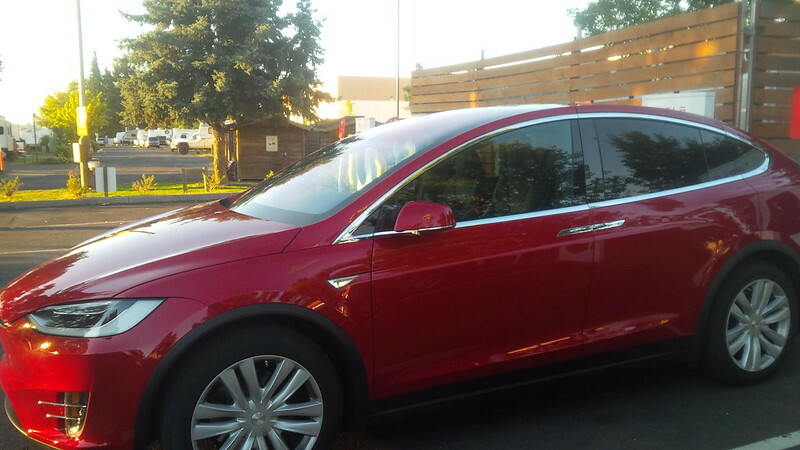 We had a quick, but satisfying meal and a very nice Red Model X greeted us upon our return to the supercharger. 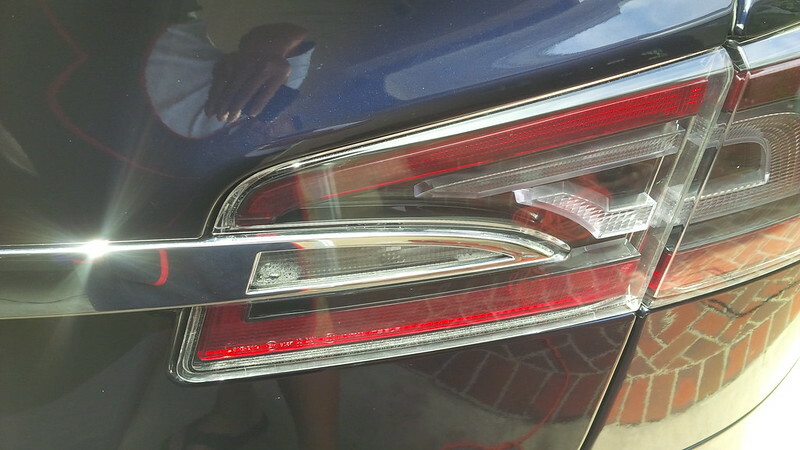 The Multi Coat Red looks great in person and this X was no exception. 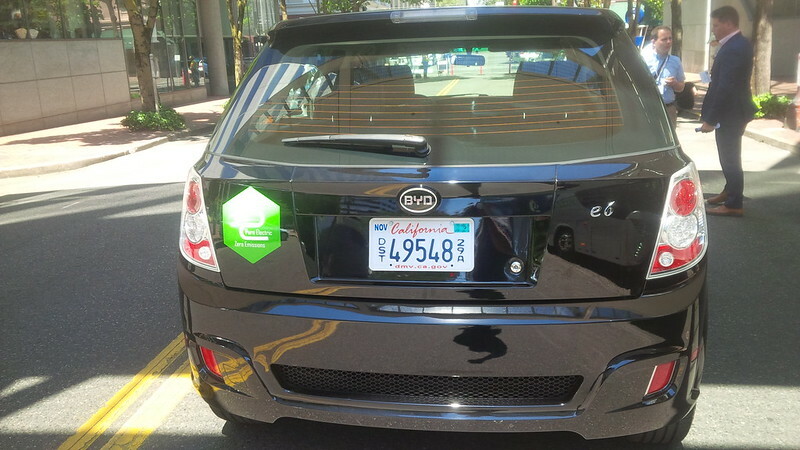 We packed up and headed to Portland’s Electric Avenue. 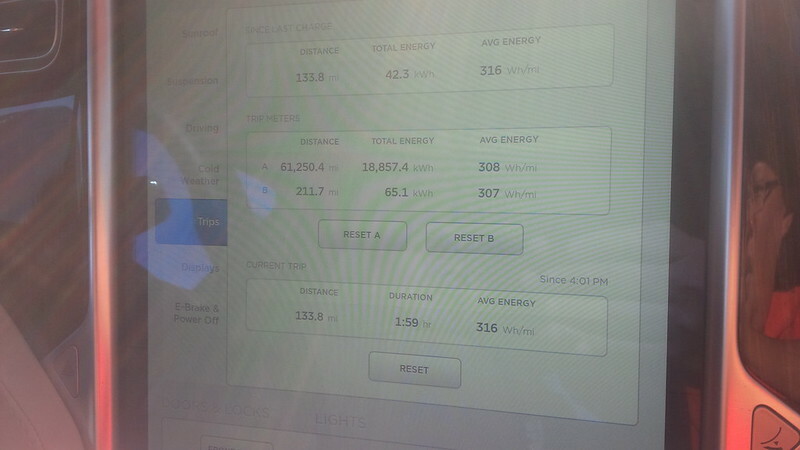 Since we had quite a bit of charge from the superchargers on our drive, we didn’t really “need” to charge. 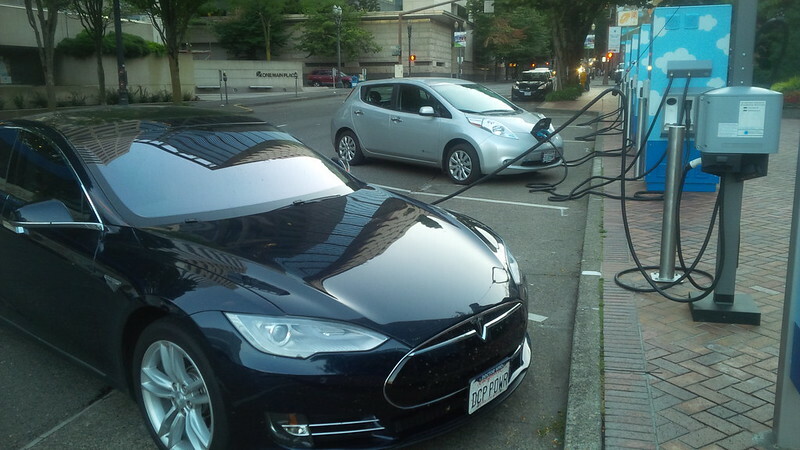 However, Portland’s “Electric Avenue” is a charging destination for long-time EVangelists. 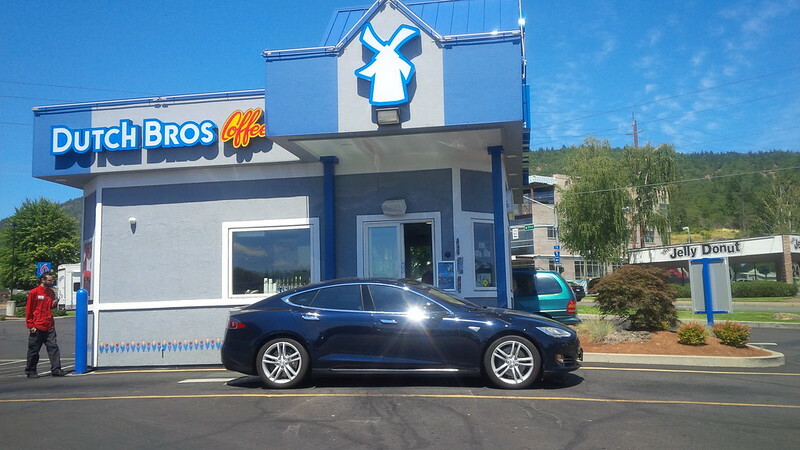 The original location was relocated a year or so back and though I never got to charge at the original, it would be criminal to visit Portland and not stop off and pay homage to EV predecessors. 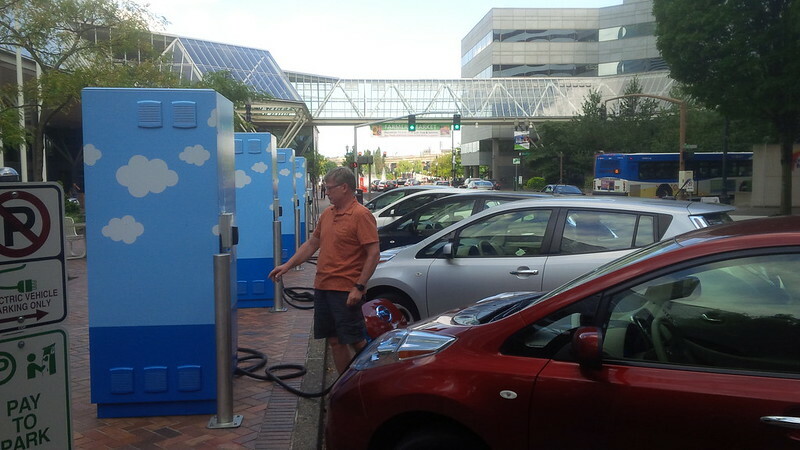 So, we stopped off to charge at the High Power Level 2 chargers at Portland’s “Electric Avenue”. 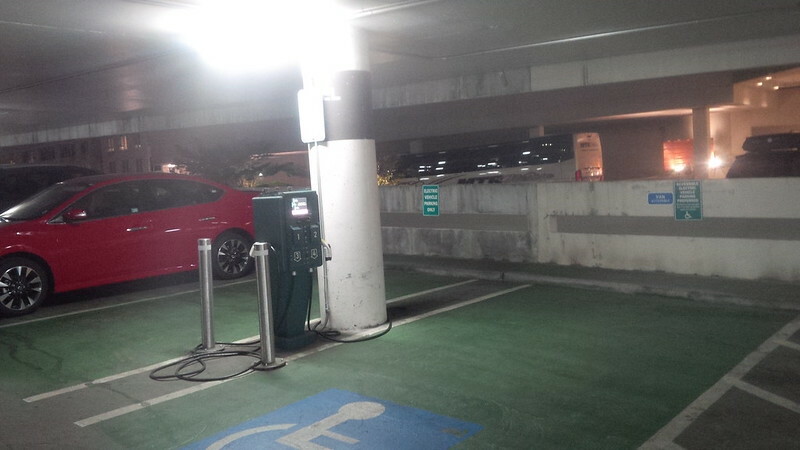 The chargers are free, however, visitors must pay for the parking spot used while charging. Since we arrived after 7pm. 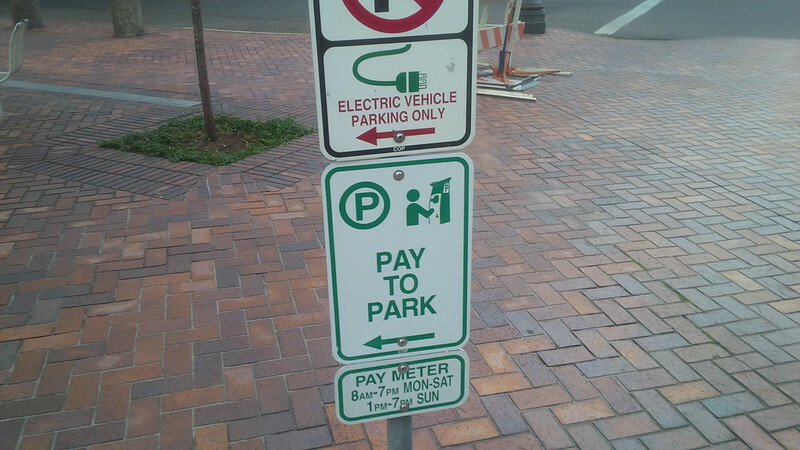 Even the parking fees were waived after hours. 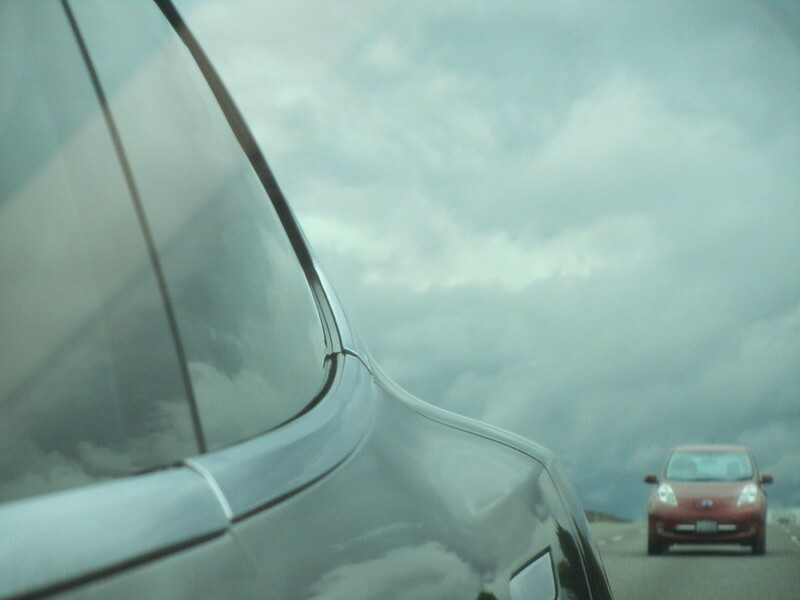 We had our meetup with MelindaV (pictured below, photograph by my better half) from Model3Ownersclub.com. 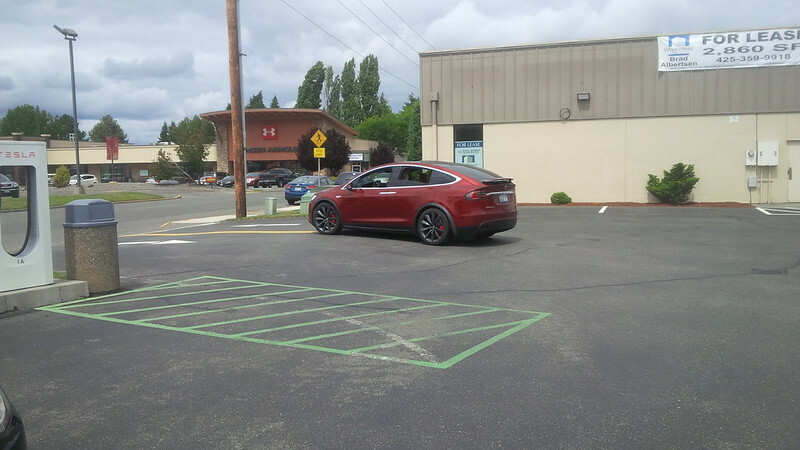 We spent some time talking EVs, her pending Model 3 order, and interesting things regarding the Portland area. 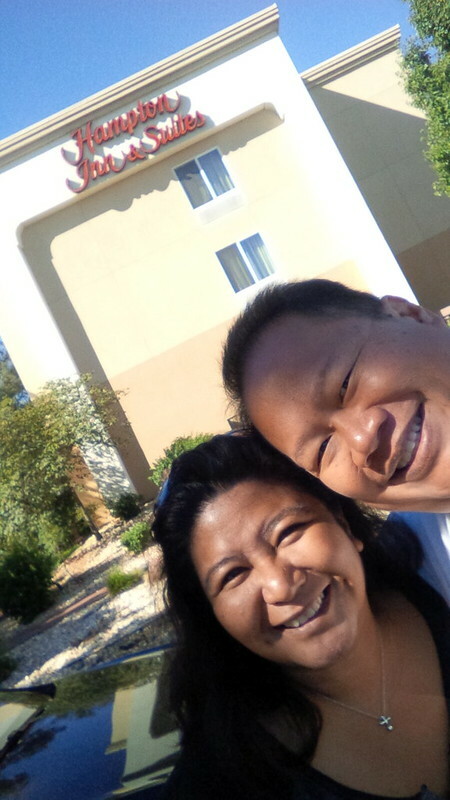 We had a good time meeting with her and appreciated the sampling of local goods she gave us for our hotel. 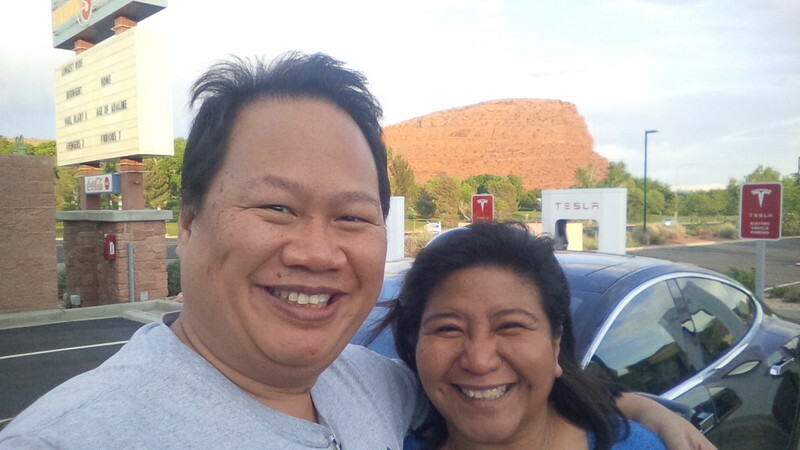 One of the pleasures for EV Roadtrips is to meet fellow EVangelists and it’s great to see someone who is passionately waiting for her Model 3. 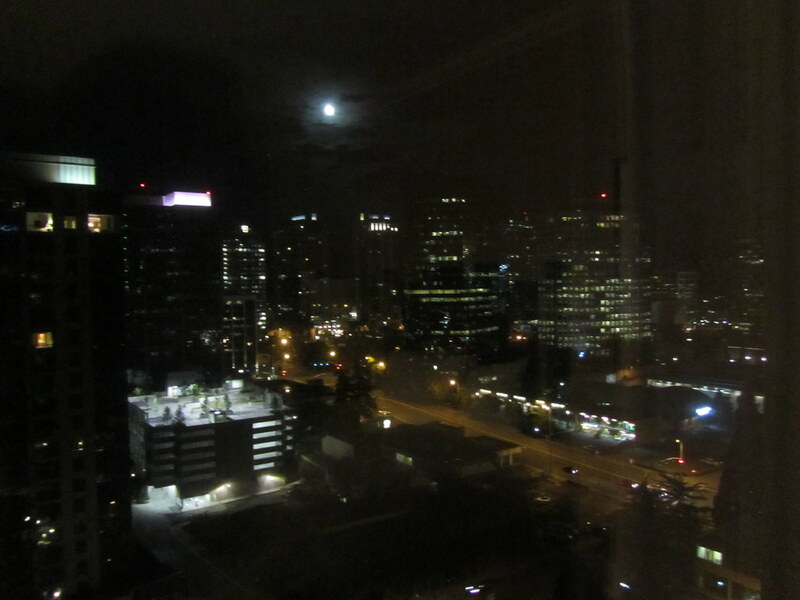 After hanging with her, we went ahead and checked into the Doubletree Hotel, Portland. As I explained earlier, the network provider for the chargers at the Doubletree required an initial $20 charge to start the account for the location. 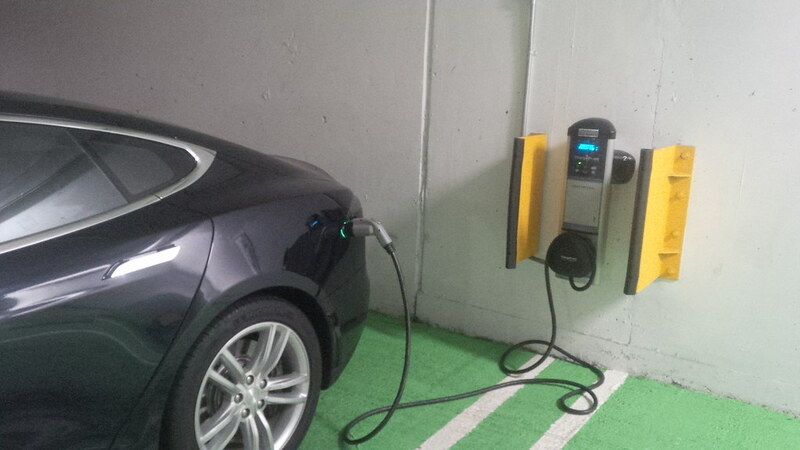 Since the network provider was not one that is common in our usual geographic area, this startup charge was somewhat expensive and we since were really close to “Electric Avenue”, we decided not to charge here. We parked at a regular spot on the other side of the chargers. 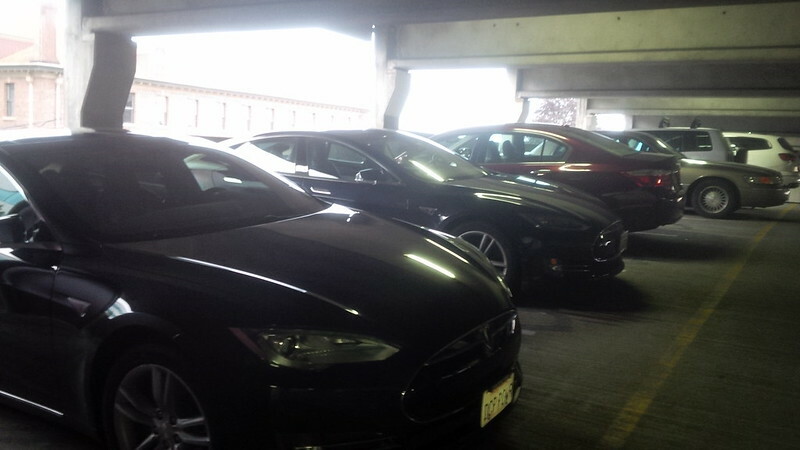 There were lots of Level 2 chargers at the lot. They did a good job getting ready for use, but it’s really more geared toward locals that would use their network on a regular basis than infrequent travelers such as ourselves. Intermediate Mission Accomplished. 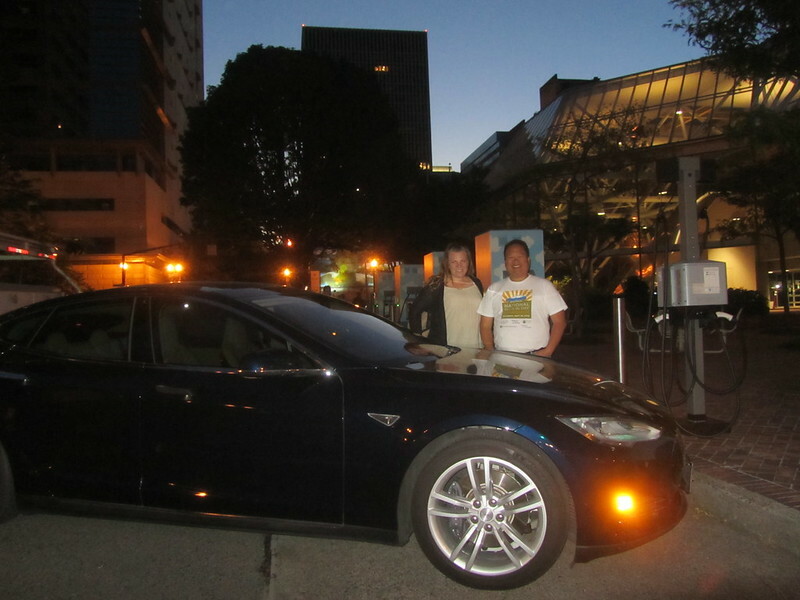 We reached Portland in time to get a good night’s rest and head to EV Roadmap 9 tomorrow. 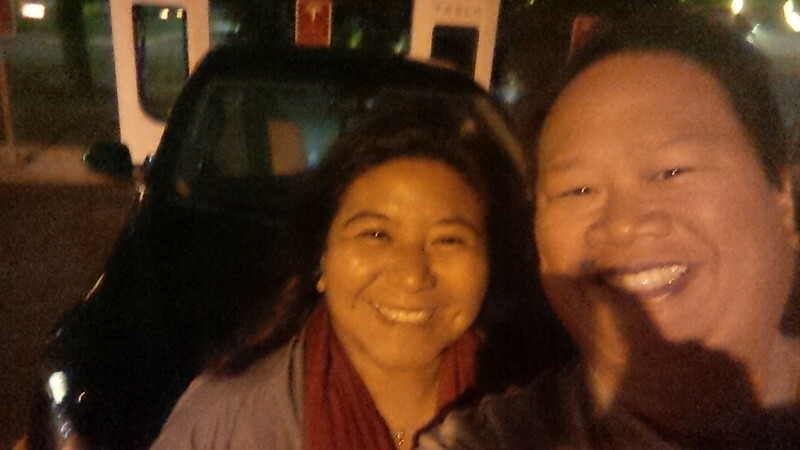 Additionally, we got to hang out and meet a fellow EV enthusiast and looking forward to the first day of EV Roadmap 9. The next day of this series, Day 3, is available here. With a hat-tip to the 2004 TV mini-series from Ewan McGregor and Charley Boorman. 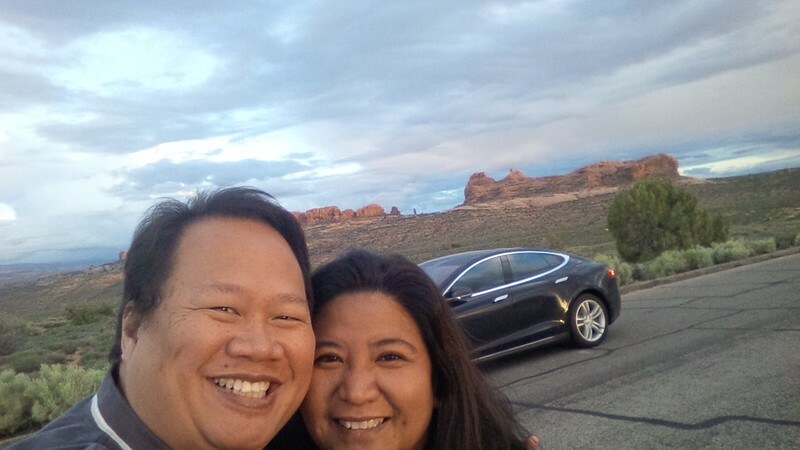 This is the first in a series of posts written about our 2016 EV Roadtrip written in the same manner as our 2015 trip. Here, There, and EVerywhere Trip – Day 01, i.e. summaries written for each day of the trip, published each day, this time two months from the day of the trip. It may seem funny to some to have a summer trip published at the start of the Fall, think of it as some daily entertainment for those that are back in their offices thinking about their past summer trips that could have been or thinking about their next trip. After taking 23 days to travel from Southern California to Maine last year, we’ve been on several “long” roadtrips. 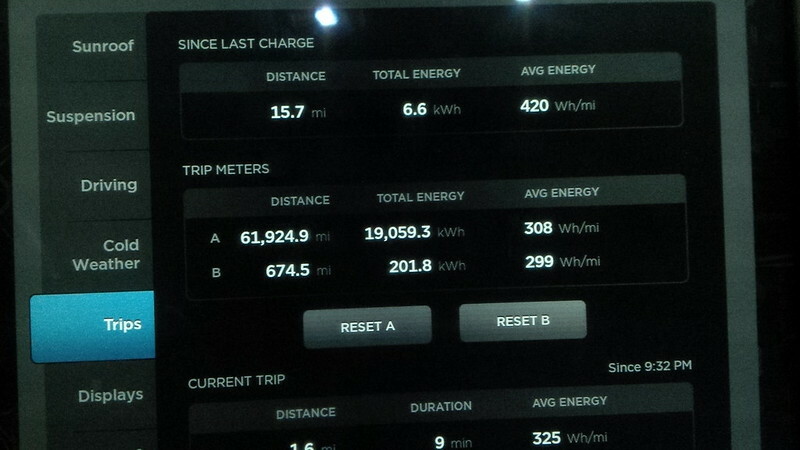 Nothing close to the 8000+ miles of that trip, until this past summer when we took off for this trip. 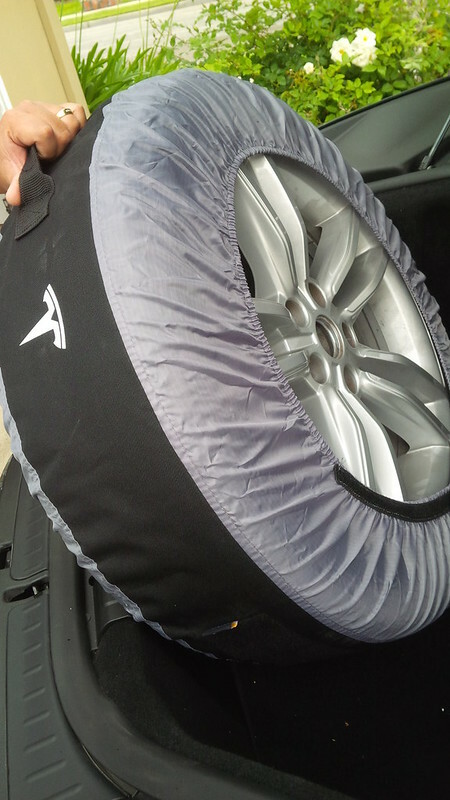 At the end of the day, I have to thank those that were convinced to pick up a Tesla Model S or Model X and decided to save some money by using our referral code. 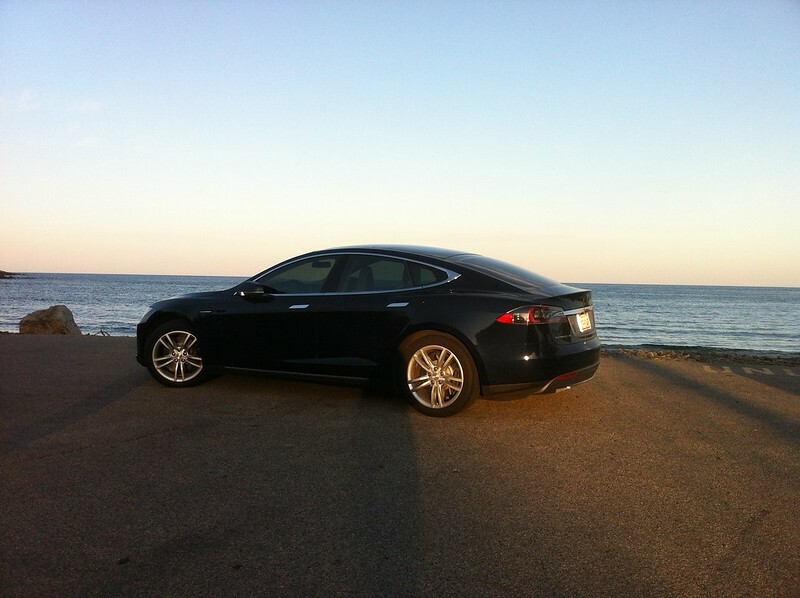 So, if you’re as inclined as those that took us up on the offer, and in the market for a Tesla Model S or Model X, you can save $1,000 USD/$1,200 CAD/£750 GBP (and whatever the equivalent is in your market) if you use our referral code – http://ts.la/dennis5317. Without further delay, put yourself back a few months, and join us on our trip. 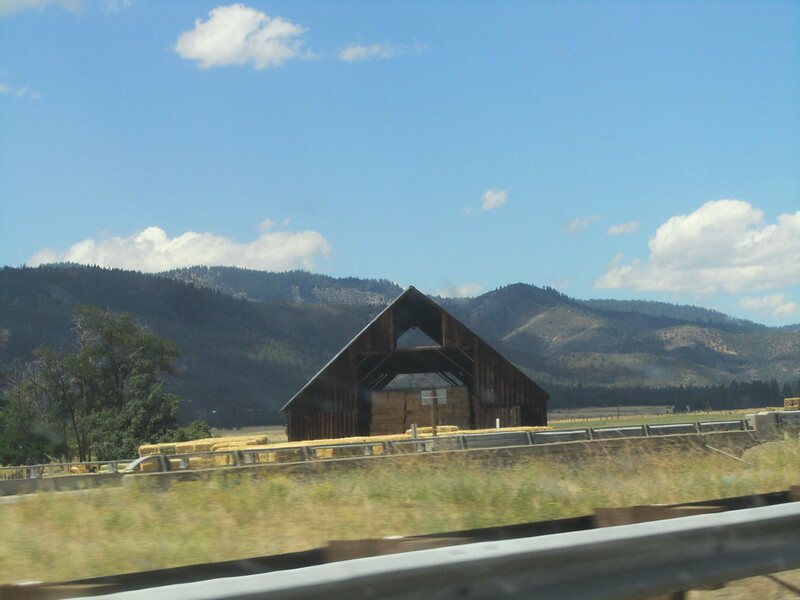 Last year, before we went on our cross-country road trip, we did a lot of pre-trip planning. We did most of the same things, but since we were planning on a trip to Canada, we added taking our passport with us…. as well as a few other things. 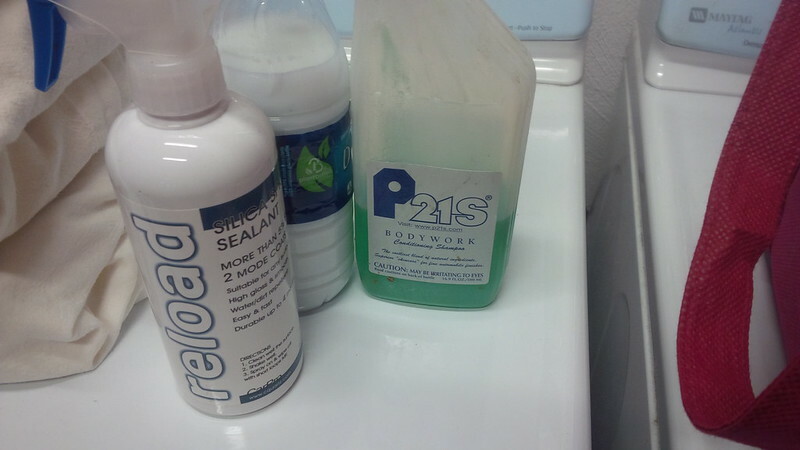 One thing that we did not have readily available on last year’s trip was cleaning supplies. So, rather than purchase these on the road, should the opportunity to clean the car were to present itself, we brought our usual cleaning supplies. 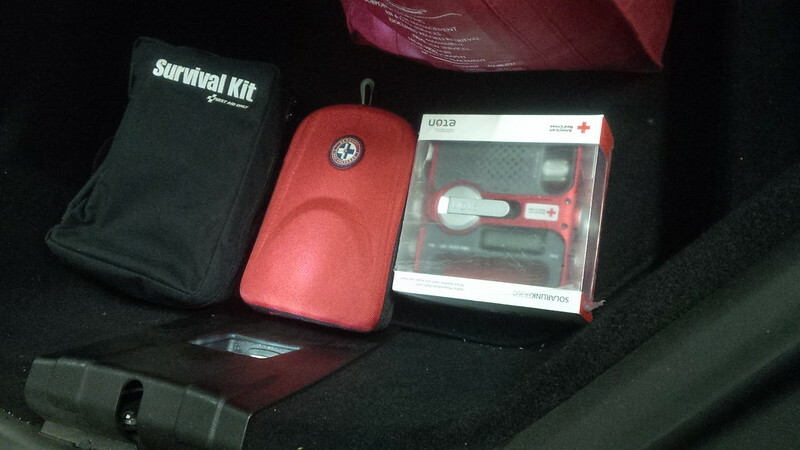 We figured to add an emergency kit for our trip as well. 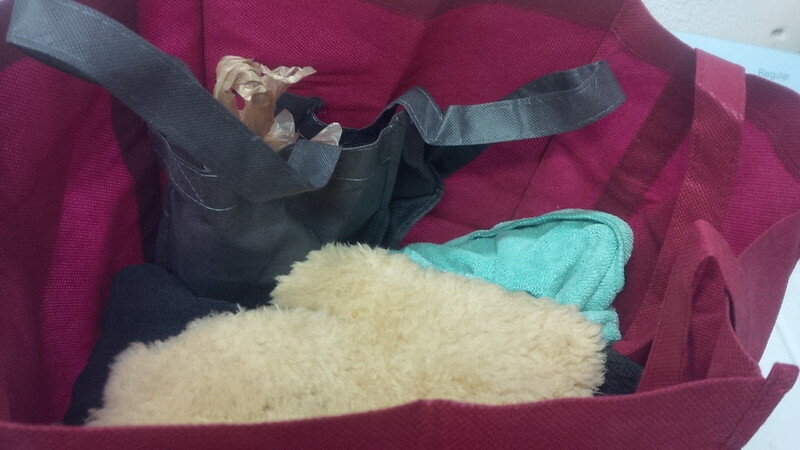 We brought a Survival Kit which we originally got for earthquakes, a first-aid kit, and an emergency radio. Just in-case. 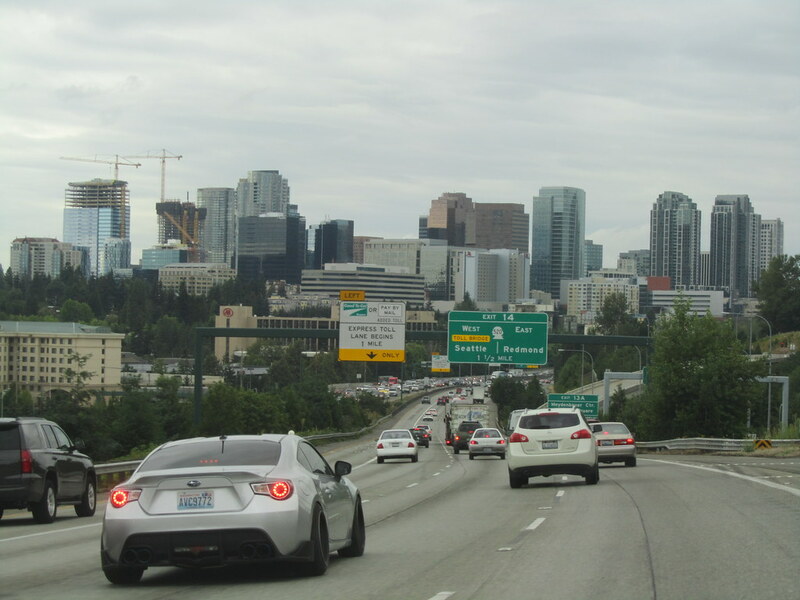 For the past few weeks, we’ve been driving around town without our spare tire in the frunk, but this trip to the Pacific Northwest is an estimated 2,600+ Mile drive. 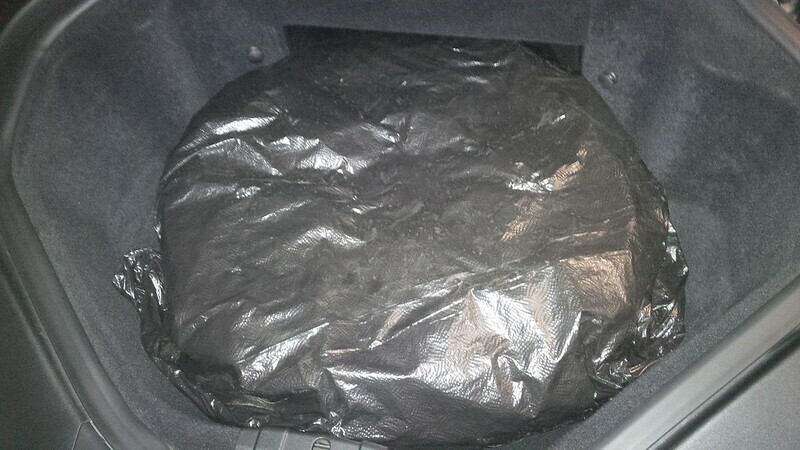 We figured to put that spare back in. 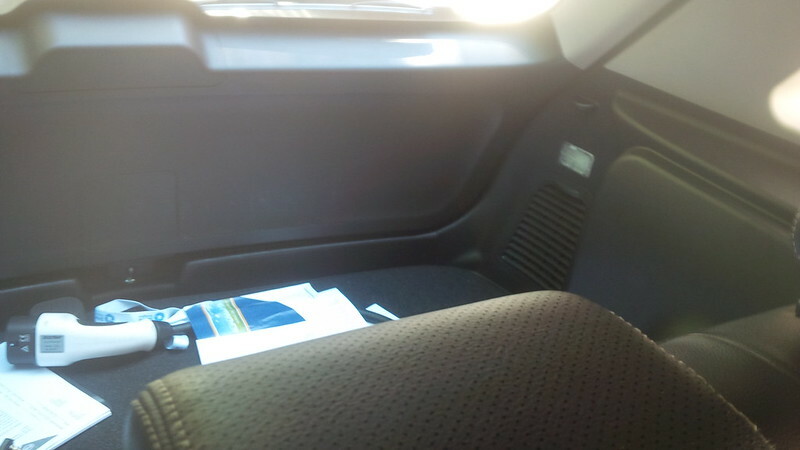 Additionally, our cleaning supplies and emergency kit fit in the “microwave” box in the frunk. 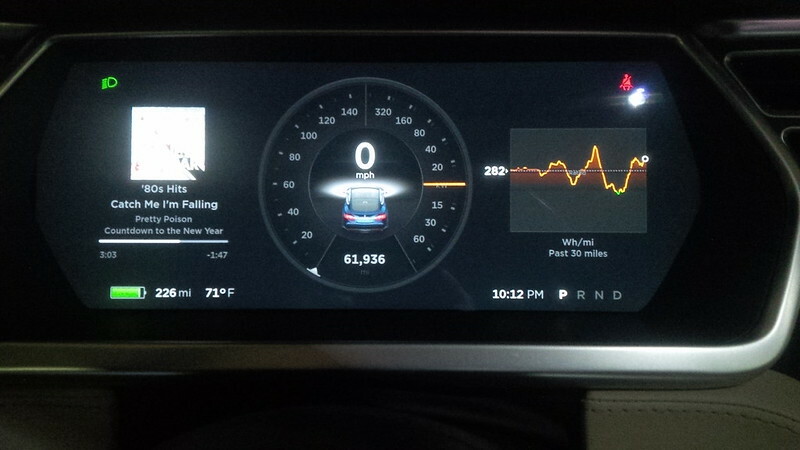 (The joys of a rear-wheel drive 2013 Model S). 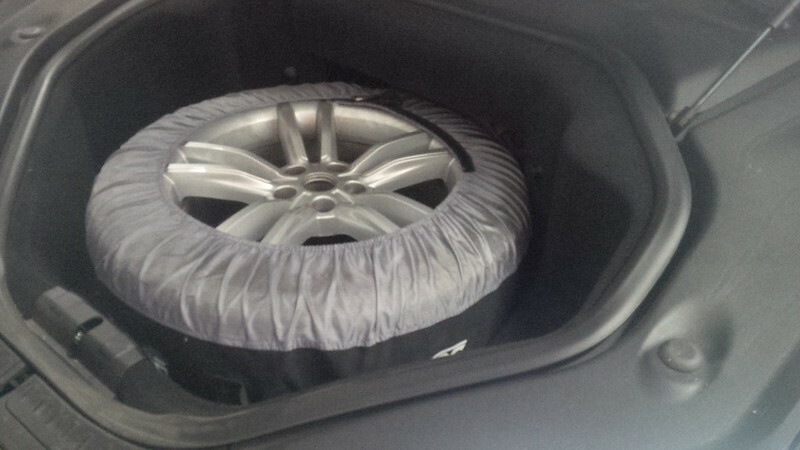 As I surmised, all our supplies fit in the “microwave” box and the spare tire keeps it in place. One thing I had to make sure was to ensure that it didn’t rattle or move about back there. 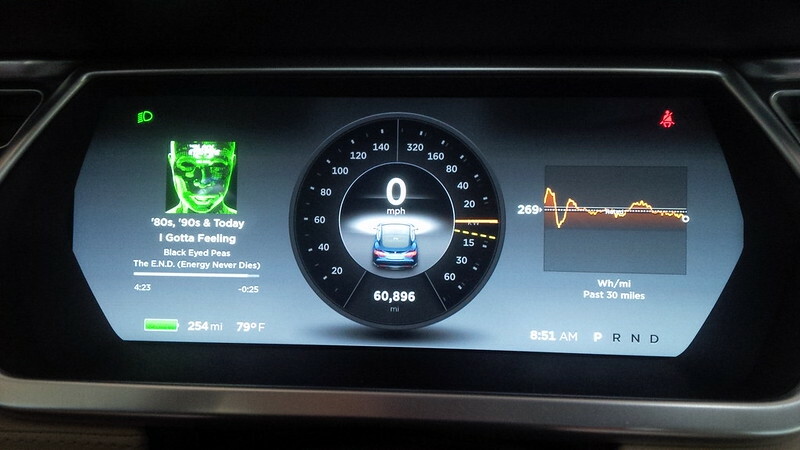 Nothing more irritating than a persistent noise in a Tesla and didn’t want to “self-inflict” noise in this instance. 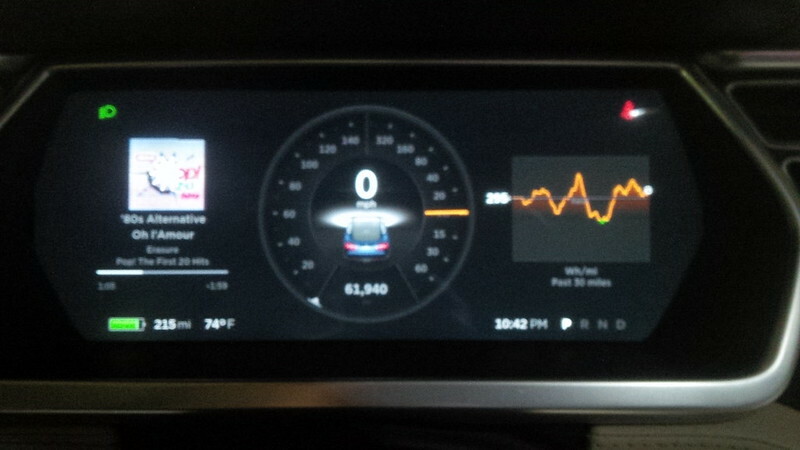 Figured to take a photograph of the mileage and other statistics for this drive. 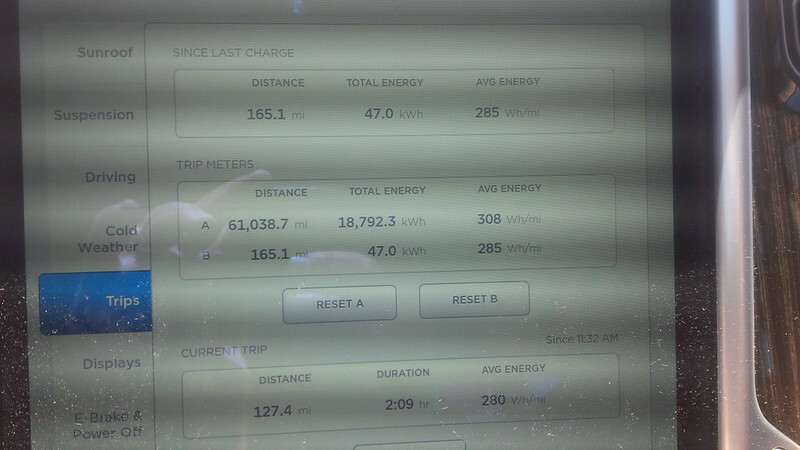 I took a picture of our trip stats at zero for B trip. 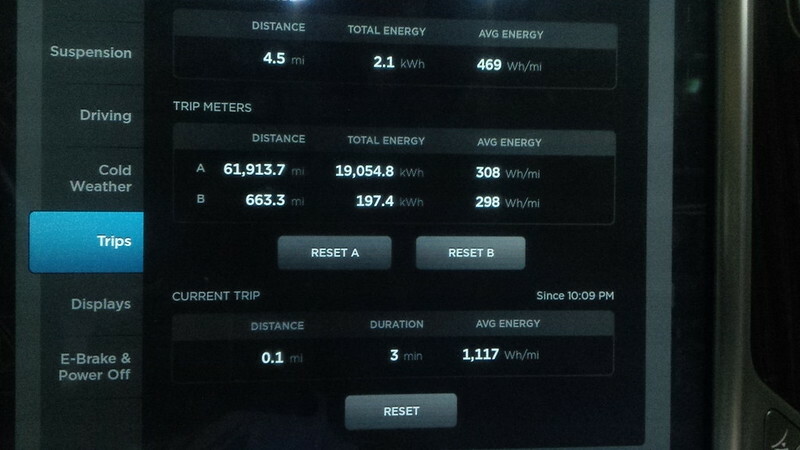 I left home planning on tracking the energy use on a daily basis… …more on what we ended up using this for later. 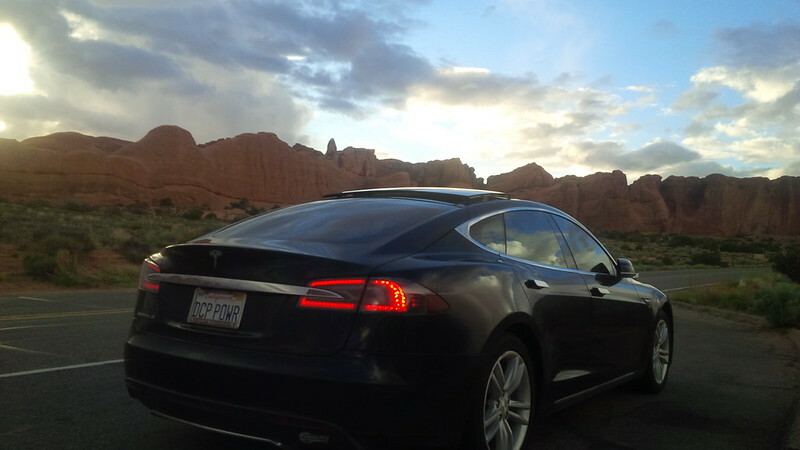 Another difference from last year’s long summer road trip is the community at Teslarati now has many other members who update entries on the the released version of the Teslarati App for the iPhone. 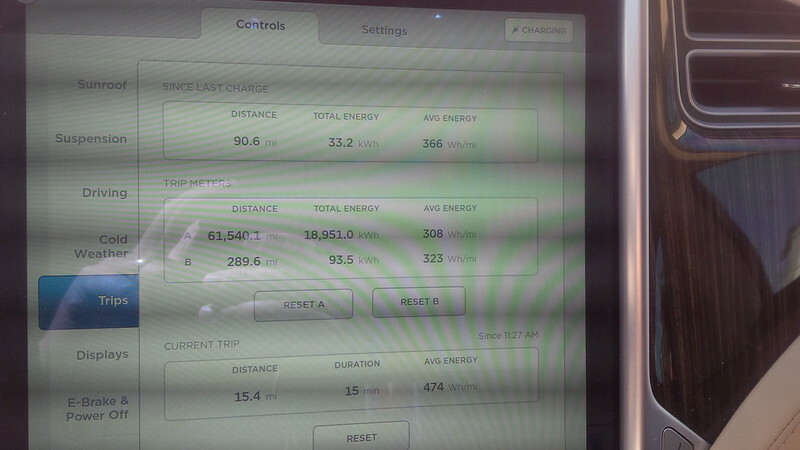 Last year’s big trip was focused on posting something on Teslarati for each stop. However, we’re not going to be adding too many new sites for this trip as the community has done a good job covering these locations. We’re actually going to be using what others have already provided for us. 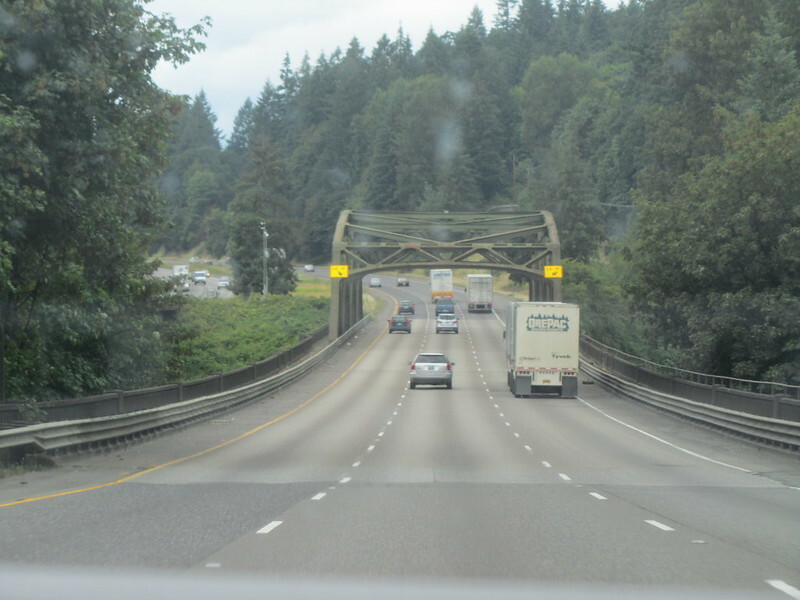 On this first day, our intermediate goal is to reach Portland, OR by tomorrow evening. 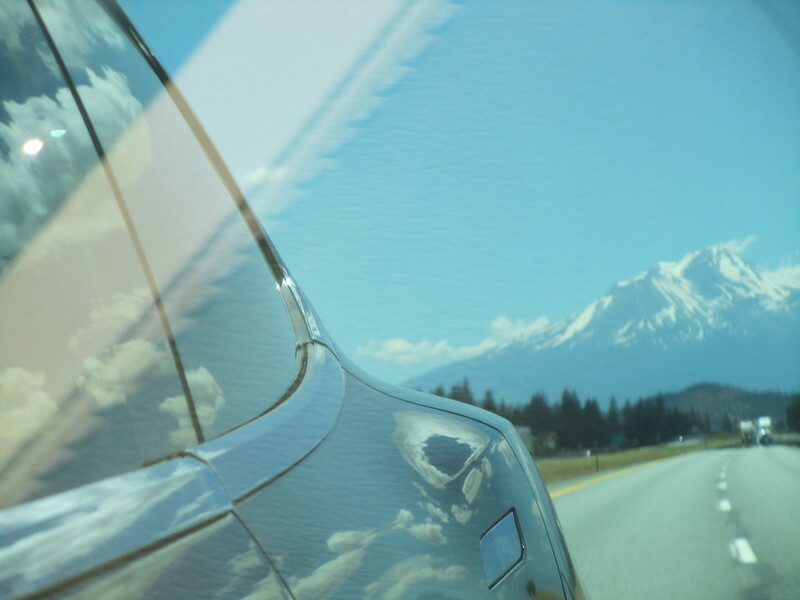 Aside from planning the long way around to the Tesla Gigafactory party on July 29, I am registered to attend the EV Roadmap 9 conference in Portland which is held on July 20 and 21. With those goals in mind, we left home and proceeded North. 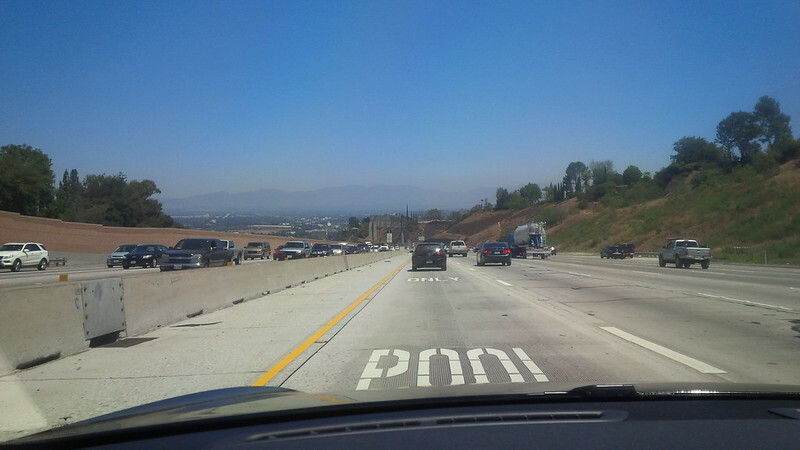 Leaving home during Rush Hour is probably not the ideal way to start a trip, but considering this was a Monday drive, it is inevitable in Southern California. 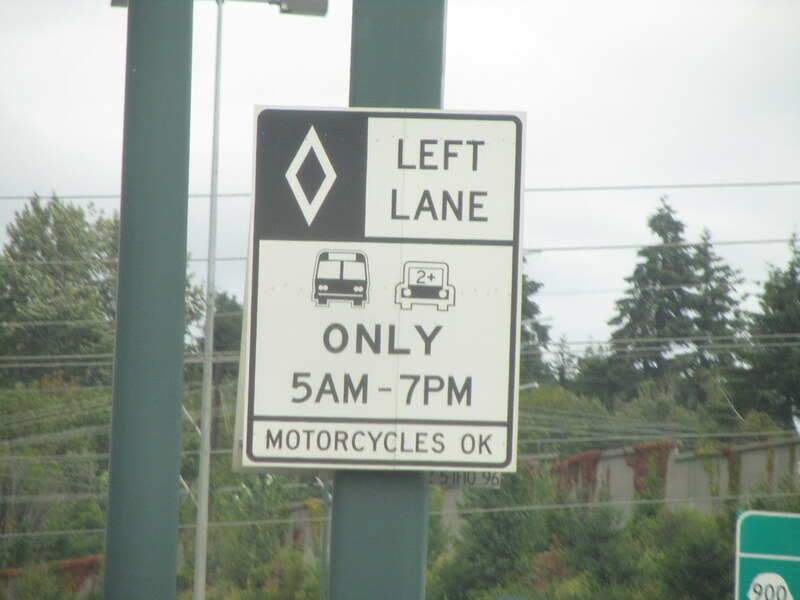 Luckily, we have access to the HOV lanes because we consider two or more people to be a “High Occupancy Vehicle” drive in Southern California, coupled with the white stickers that are available to be issued for EVs. 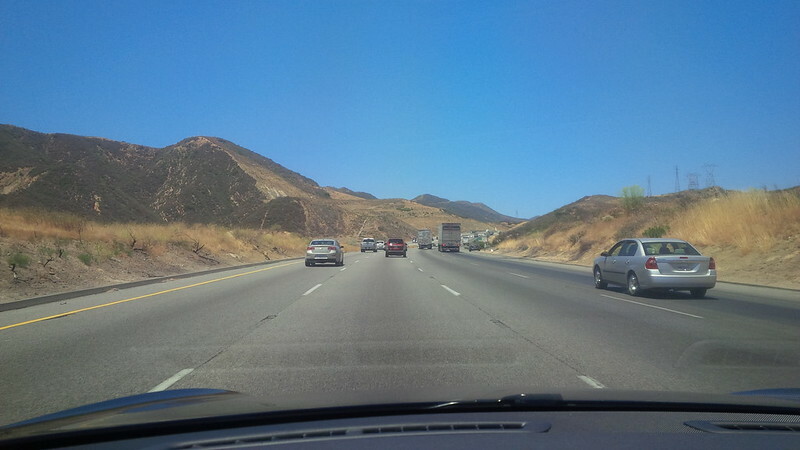 Though the HOV access throughout Southern California is vast, it’s not endless… And we encountered further traffic on our Northbound journey. 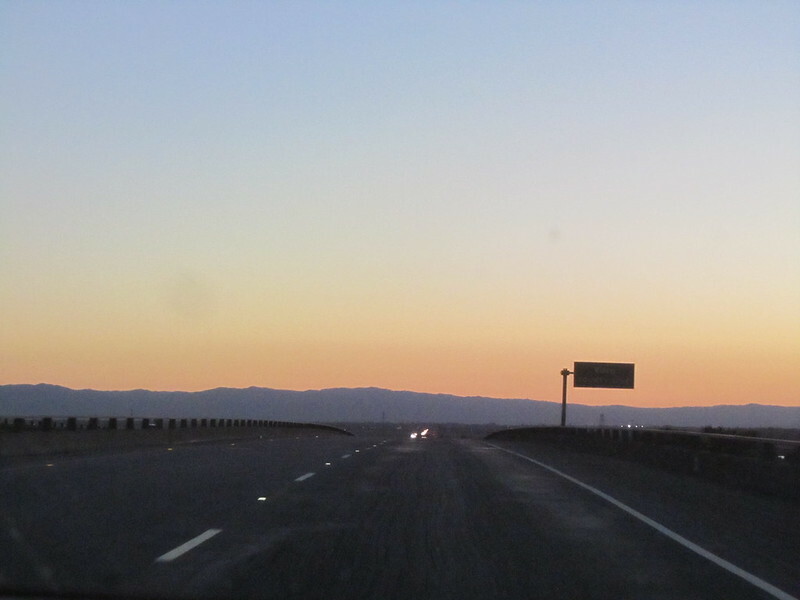 Even areas around the Grapevine, which is normally pretty open in the summer had a bit of traffic, though not to the degree we see in rush hour commute. 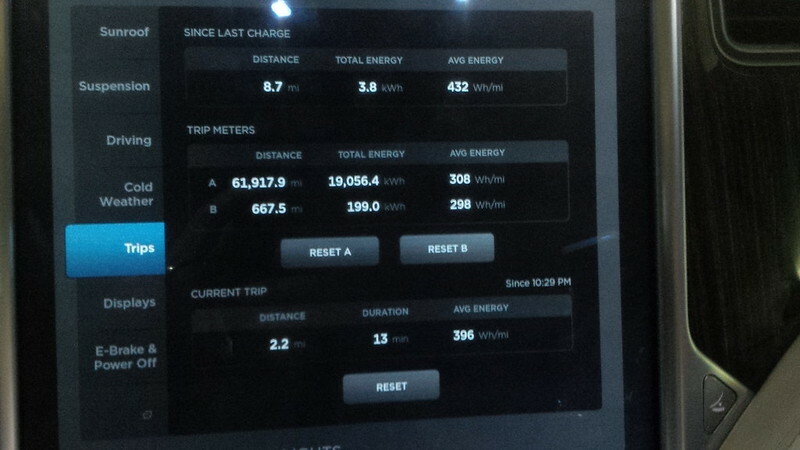 Before we arrive at our first Northbound Supercharger, we cross the 61,000 mile threshold very early on in this trip. 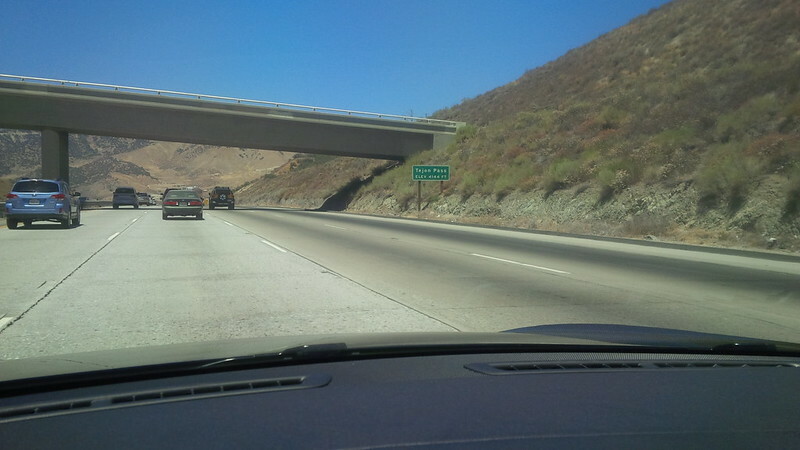 And this achievement was quickly followed by the Tejon Pass summit. 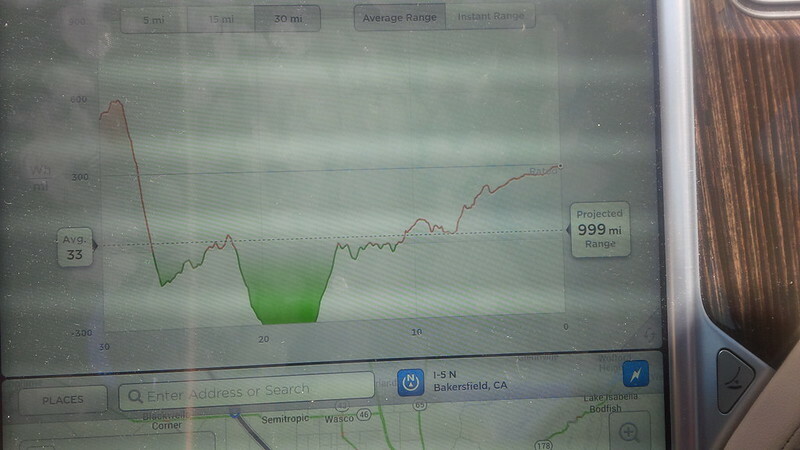 This summit is at the apex of the approach to/from the Tejon Ranch Supercharger. 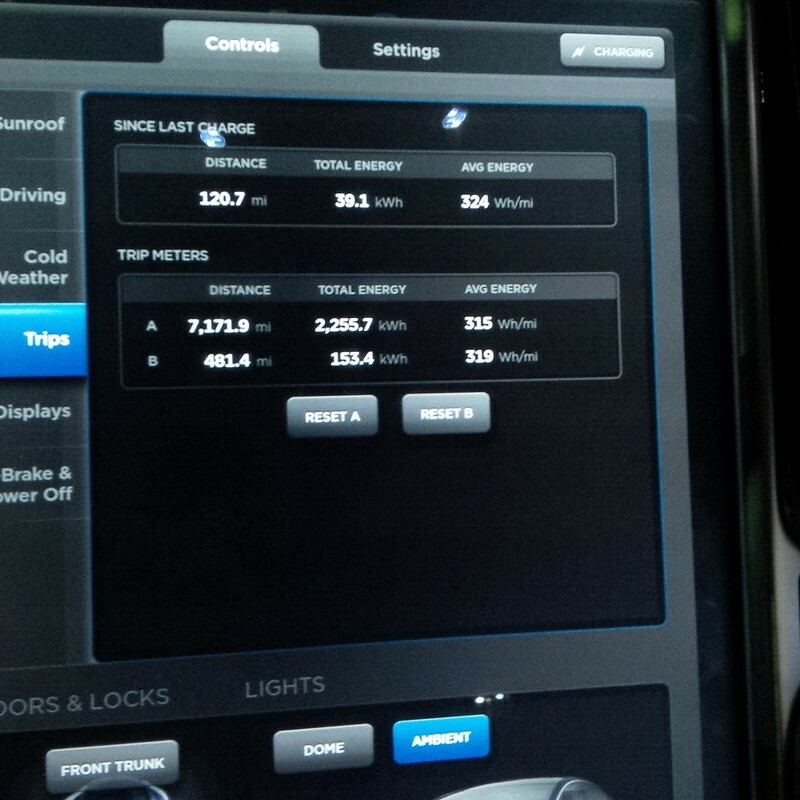 Since we had enough range to skip this supercharger, and our spot consumption says we can go 999 miles, we decided to go to the Buttonwillow Supercharger instead. 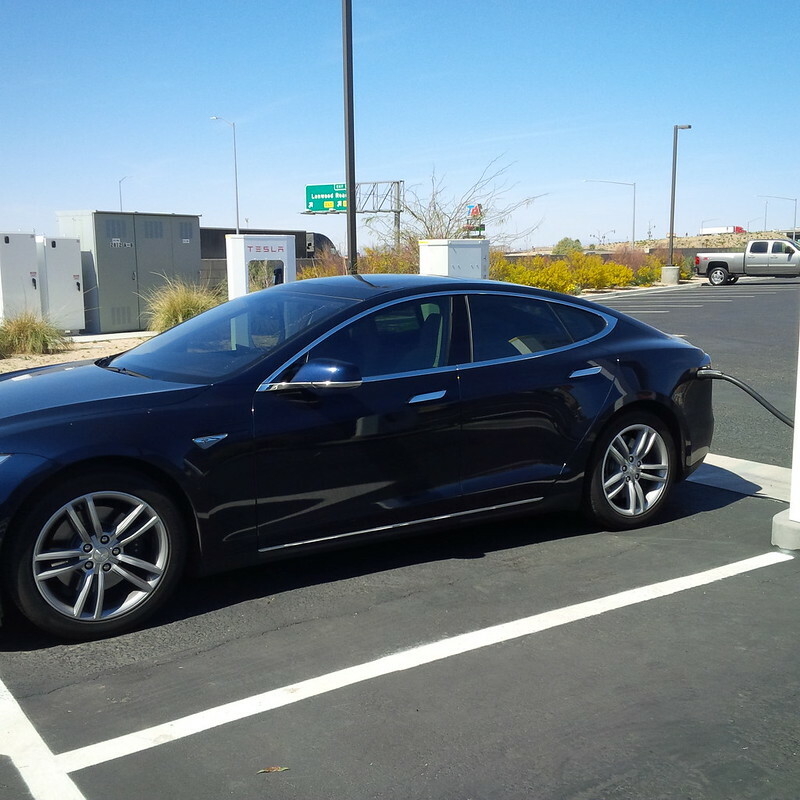 The Buttonwillow Supercharger is just off the freeway and my wife was able to catch a great shot of the supercharger from the freeway. 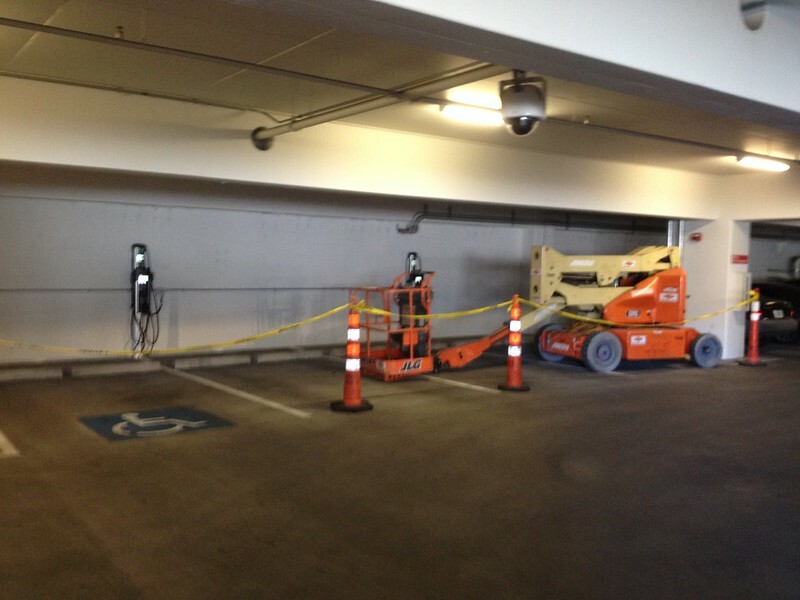 The supercharger stalls are installed in a manner where the back of the stalls face the street and the front face the freeway. 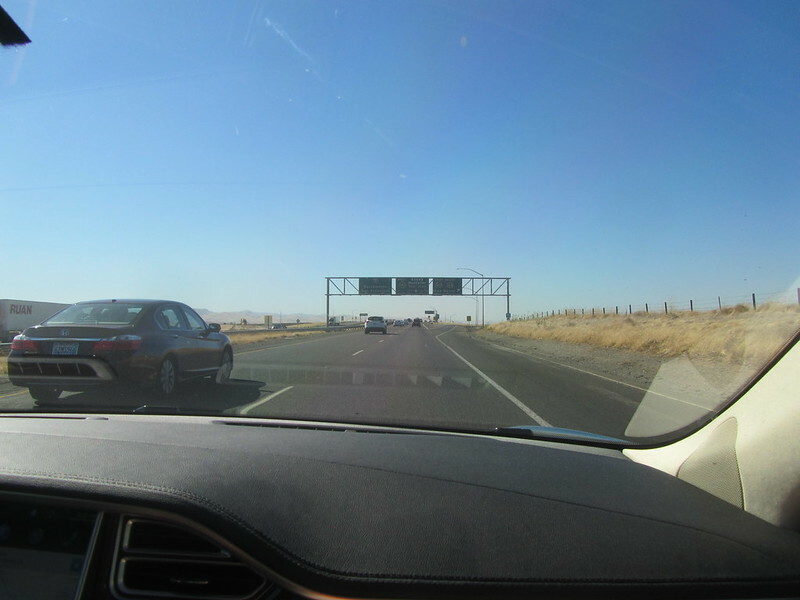 So, approximately 165 miles later, and a short visit in between, we arrived in Buttonwillow around 1:45 PM. Not as early as we had hoped. 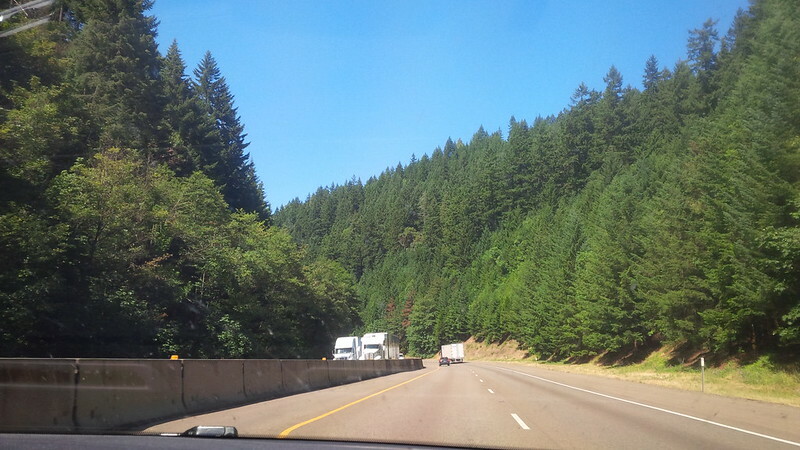 But it’s nice to be out on the open road, or at least Interstate 5. The last time we were here, it was the middle of the night. Everything in the same parking lot was closed, so we stayed in the car and charged. 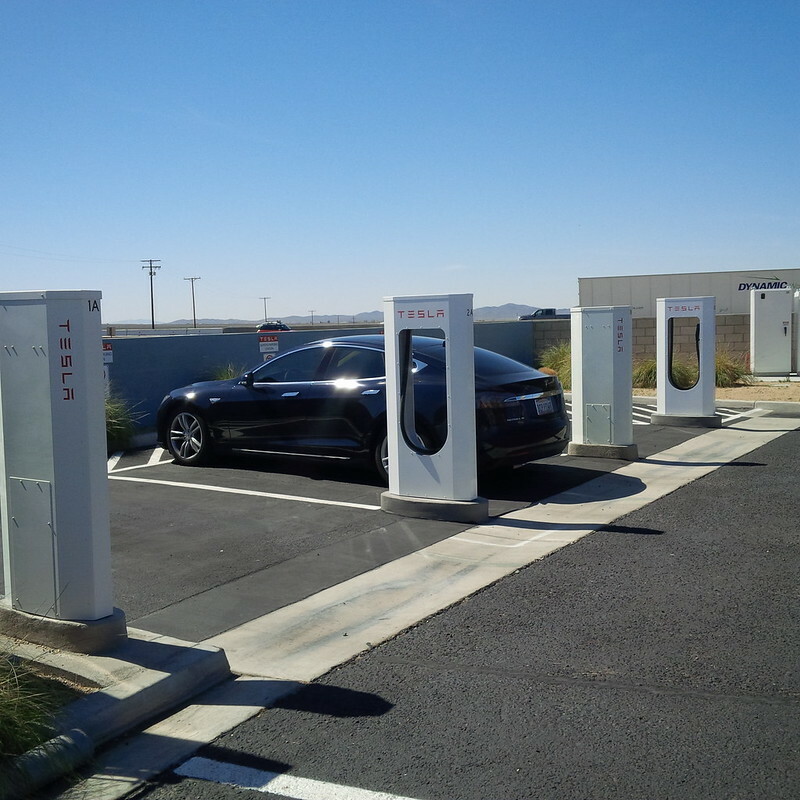 Not only that, as previously mentioned, the superchargers are located in a manner that forces travelers to park with their backs facing the street. 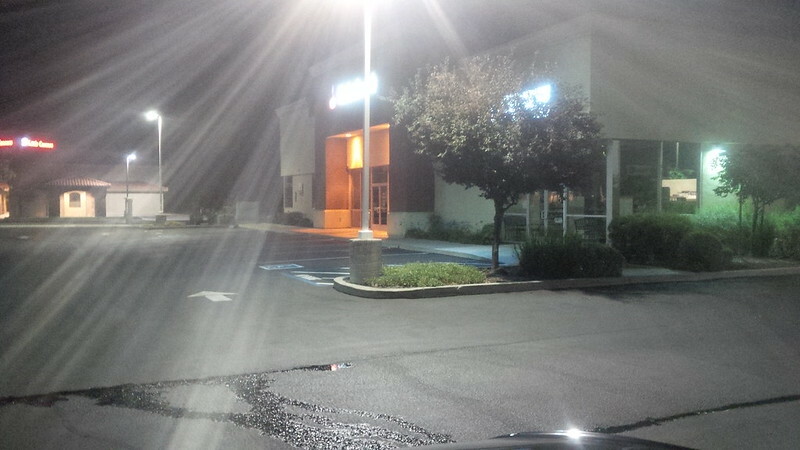 This orientation makes one feel exposed in an open, dark parking lot. However, in the bright light of the day, it’s fine. This time, not only did we need to refuel the car, we needed to refuel the driver. 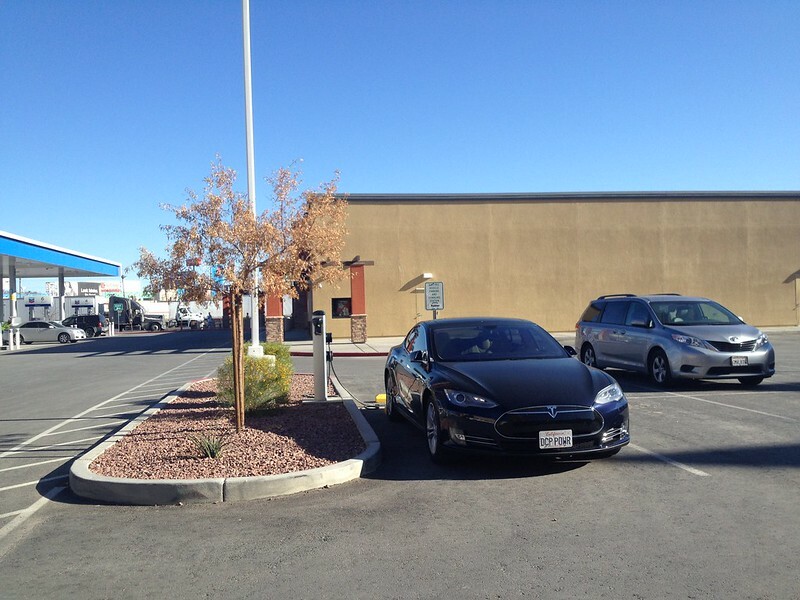 We drove out of Metropolitan Los Angeles area without getting any coffee and this supercharger is located at a parking lot adjacent to a Starbucks. 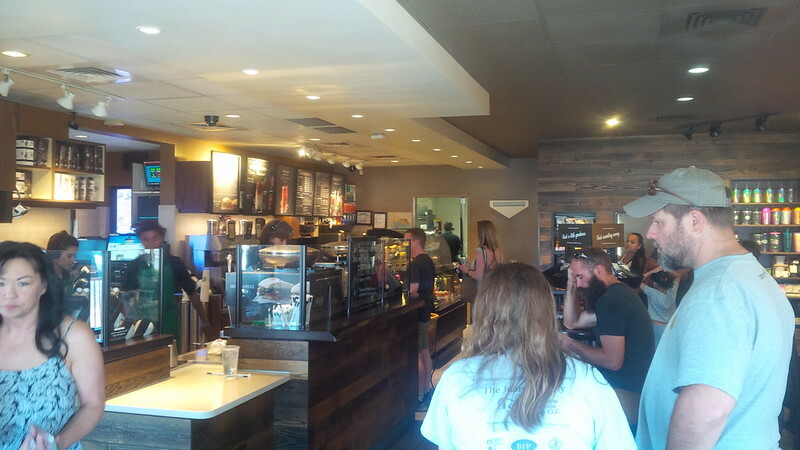 It sure looks like we were not the only ones that had the idea to stop off and get some coffee here. 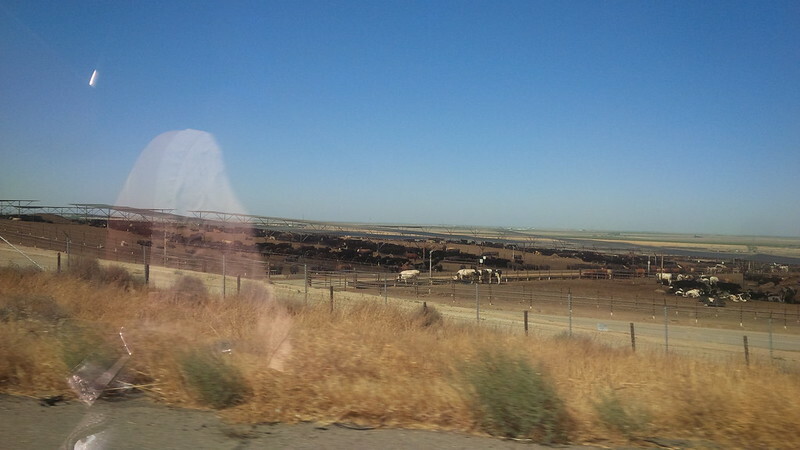 Considering this was the middle of the day, in the outskirts of Bakersfield, it’s pretty busy. 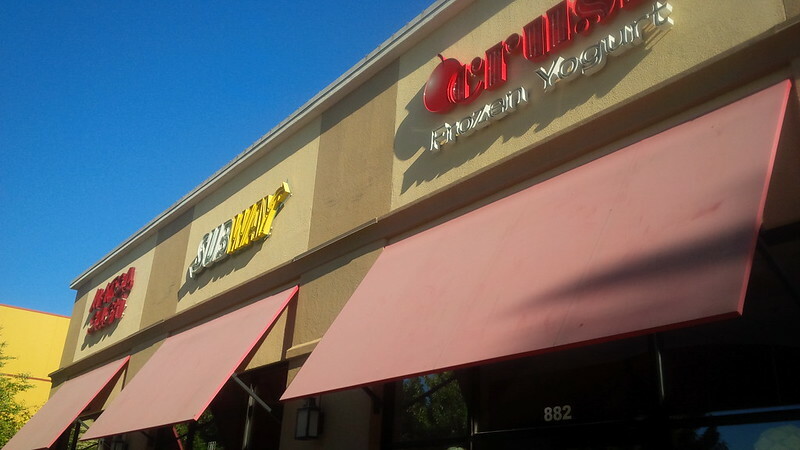 and the Subway, next door. 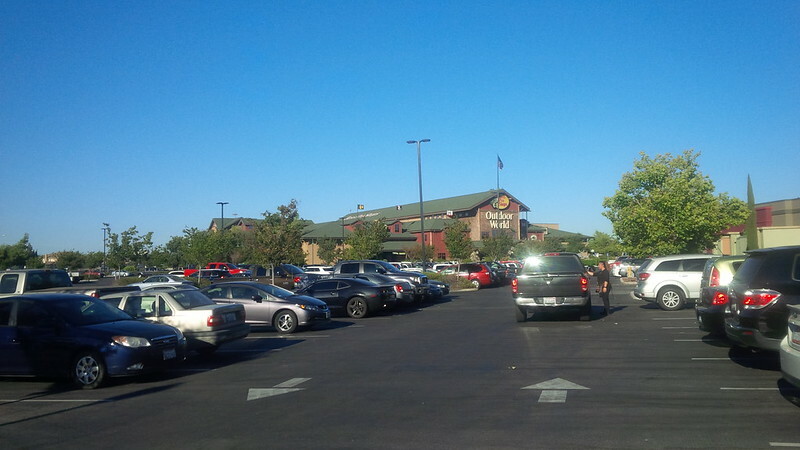 After getting charged up, we decided to head off to Harris Ranch, our next stop on our I-5 Northbound route. 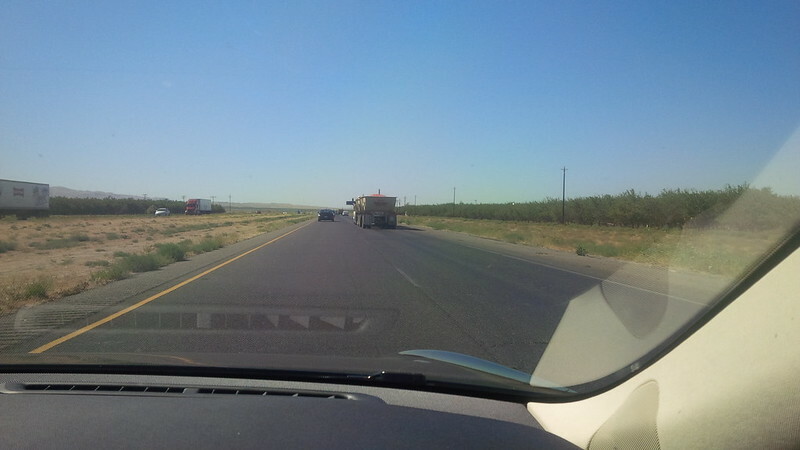 It is quite common on this route to see produce moving around in trucks. 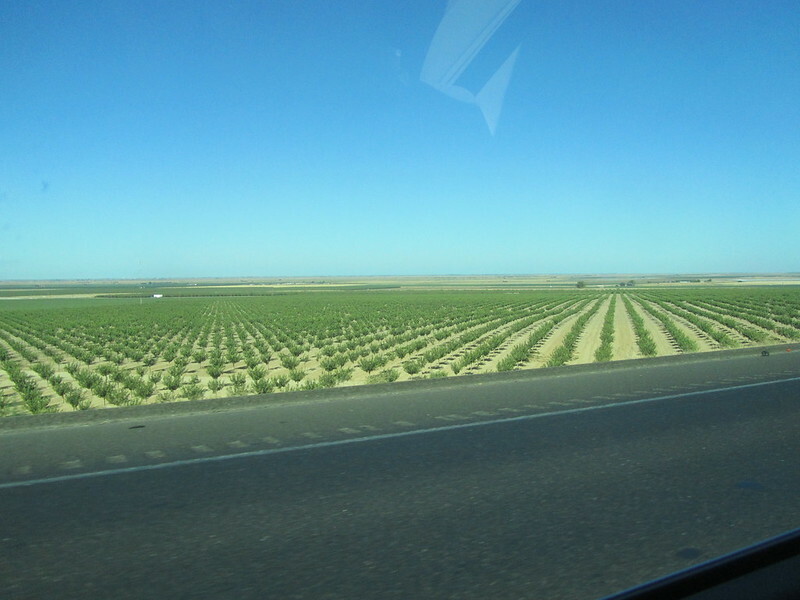 Considering that the center of California is where many of the farms are, it is only logical to see produce trucks in this route. 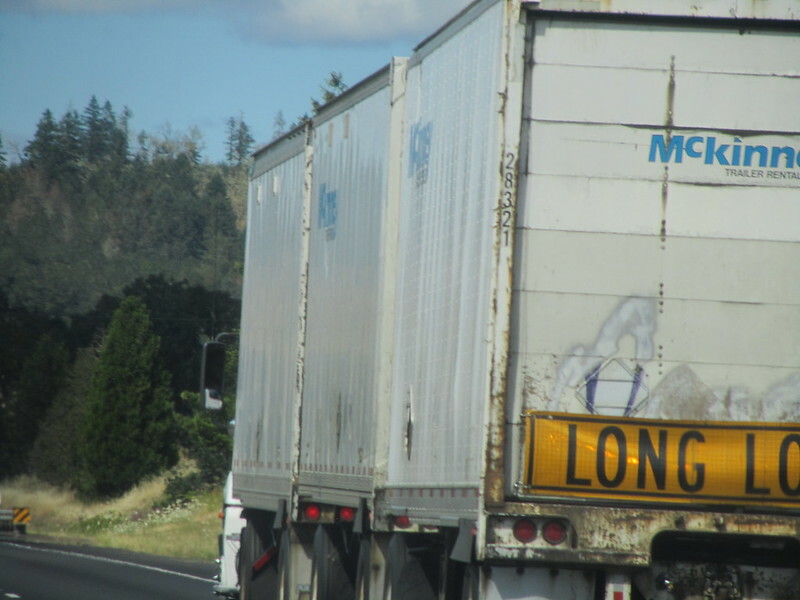 As we headed North on this route, we spotted an interesting truck which we couldn’t determine what was on it until we got closer. Sure looks like garlic. 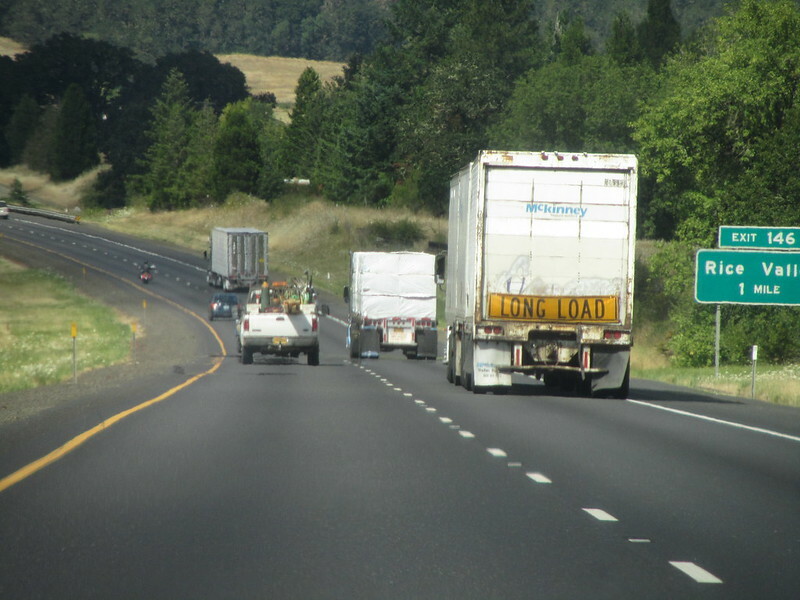 Which is interesting because the truck is South of Gilroy and headed Northbound. 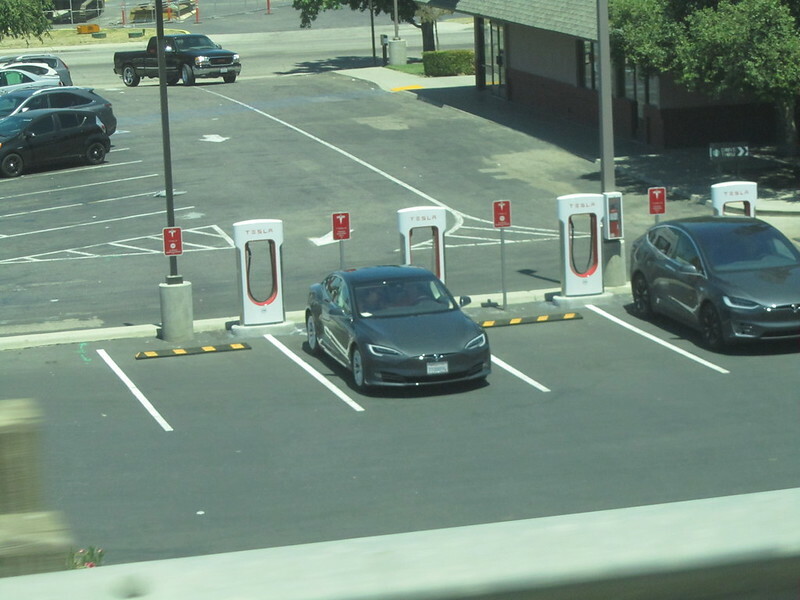 Gilroy, California is well-known for its Garlic Festival (and for one of the original supercharger locations for Tesla drivers, the Gilroy Supercharger). 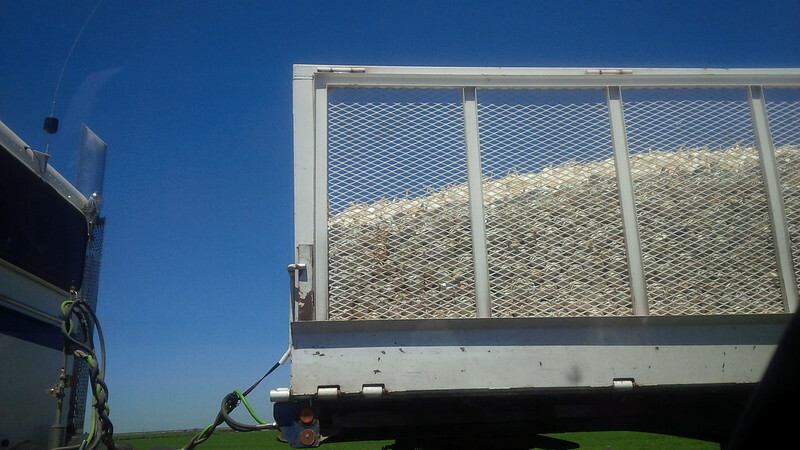 I guess there are other garlic producing areas in California. …a Tomato truck! 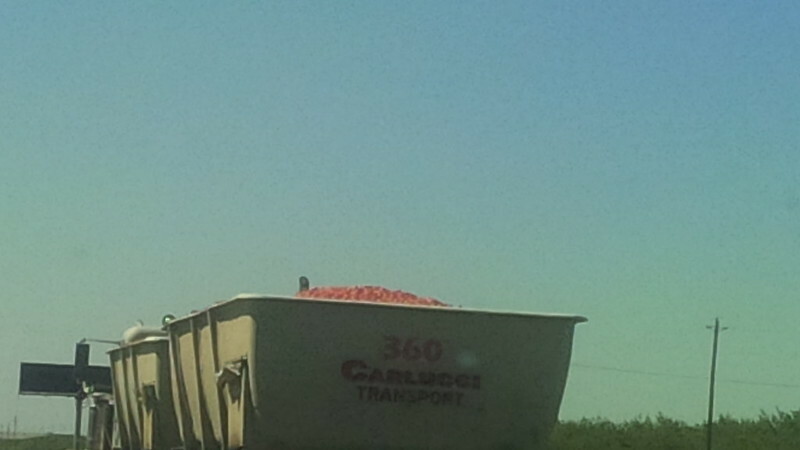 (Not necessarily the one pictured because we drove past that one…) So, a garlic truck, a tomato truck…. we were wondering where the pasta truck was going to be. Alas, we were disappointed because we never did see that pasta truck, and now I’m craving Italian food. 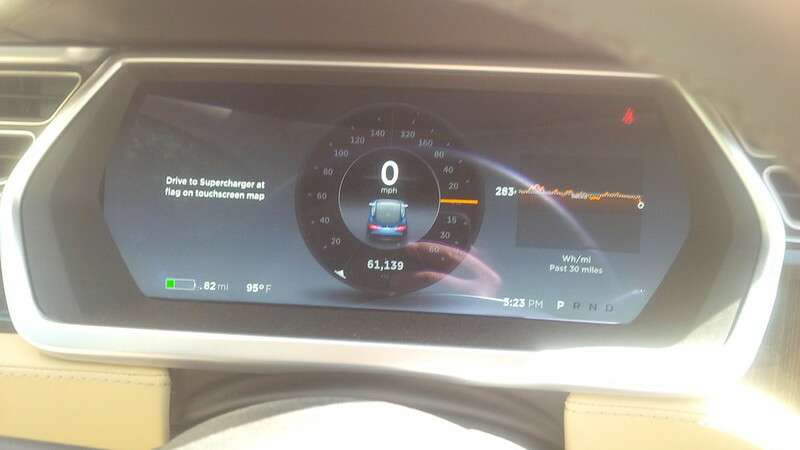 Our next stop Northbound is the Harris Ranch Supercharger. 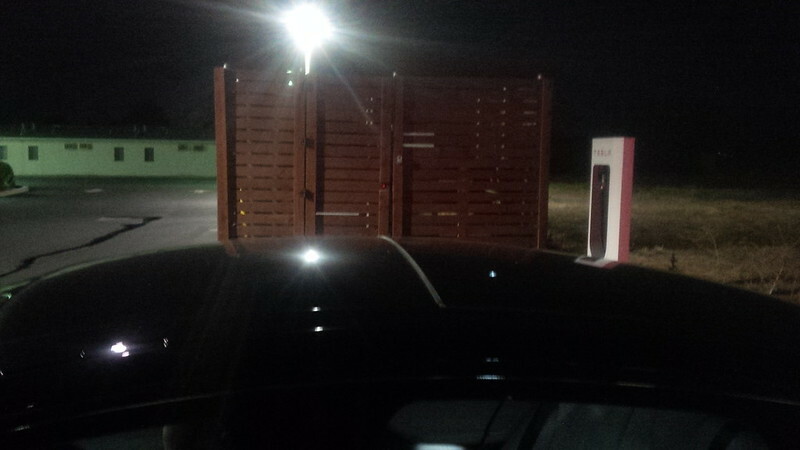 We were the seventh to arrive, and it looks like everyone else in this HUGE 13 stall supercharger have done this travel before. 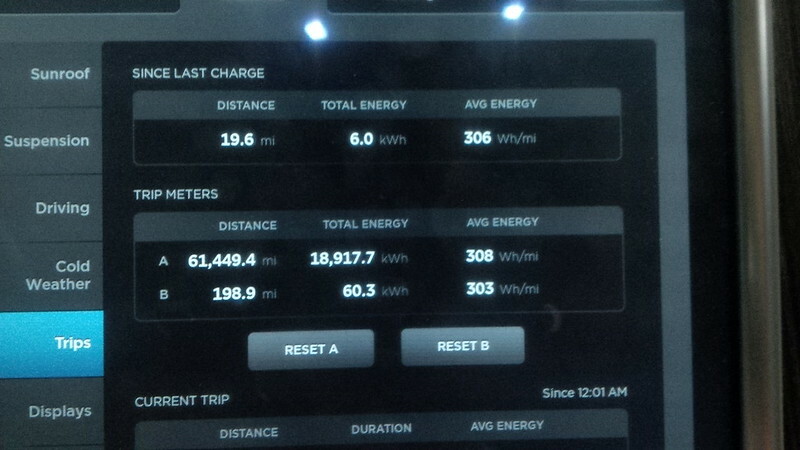 Every Tesla traveling through this location is not sharing its charge with its A or B twin. 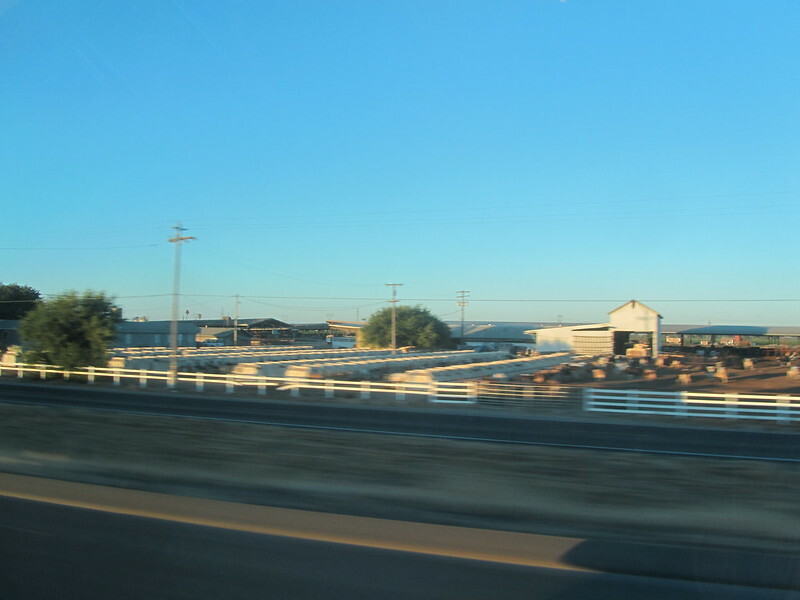 I often will try to pick stall 7A when passing through Harris Ranch. 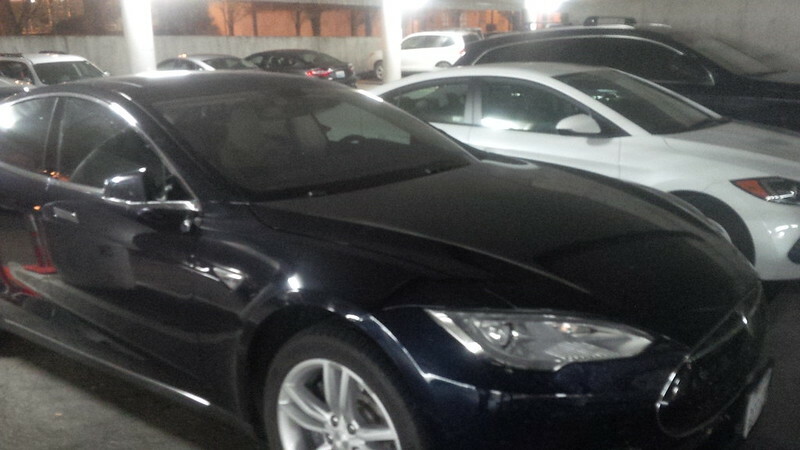 It is the one pictured on the far right, beside the silver Model X. 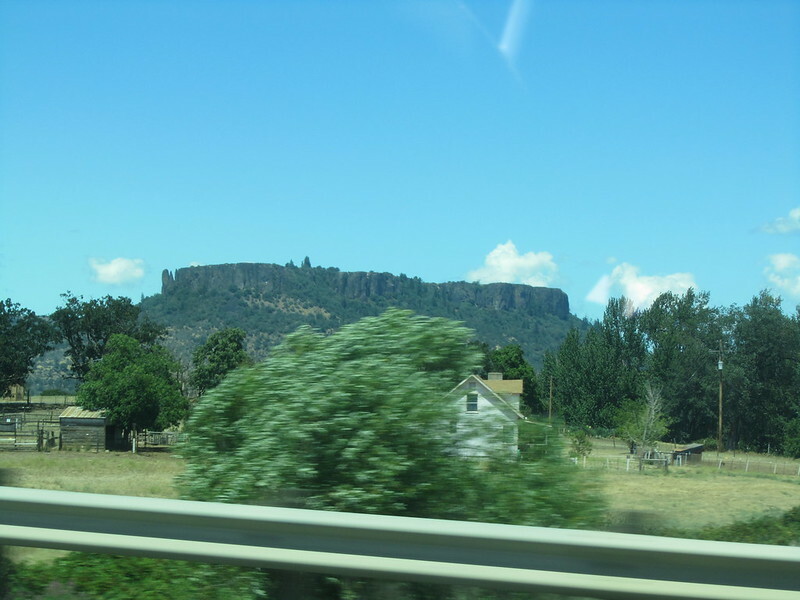 So far, our drive North has been quite ordinary. 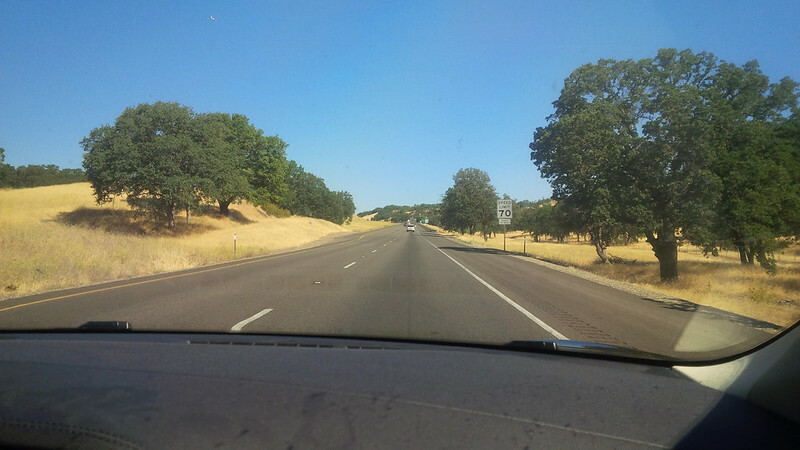 The many trips to the Bay Area that we’ve done since last year had traversed through the same routes. 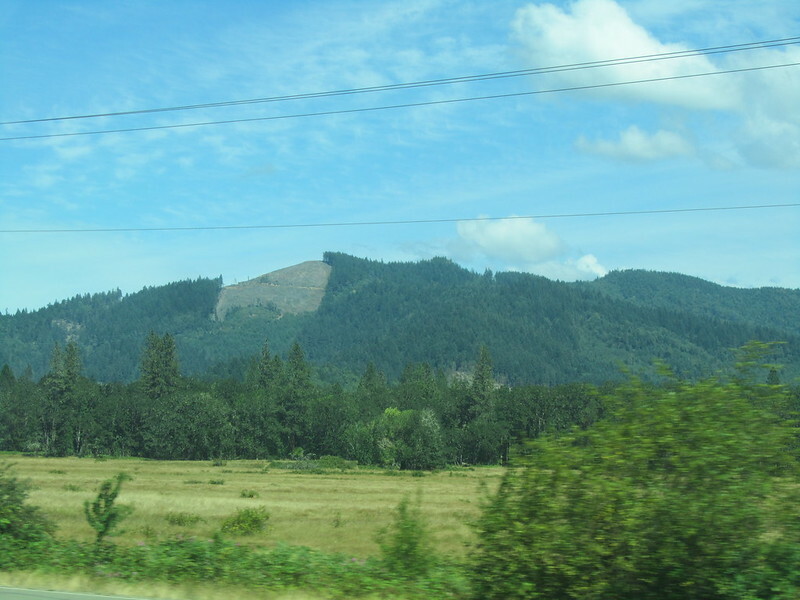 (Here is one when we tried to drive up and down the same day.) 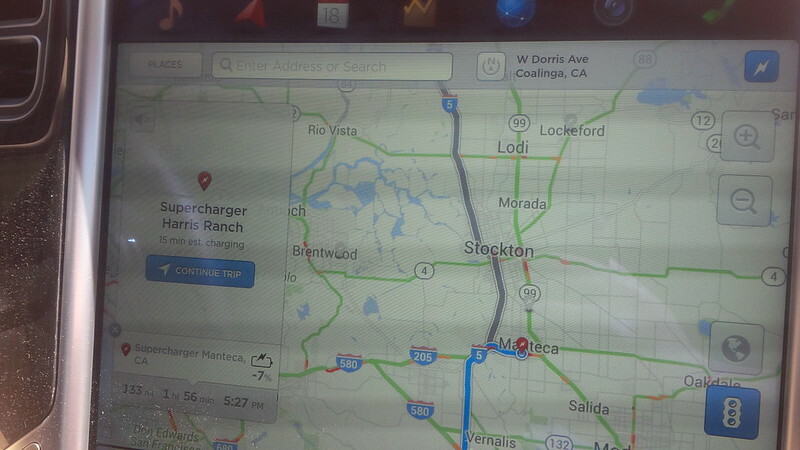 However, our next stop is the Manteca Supercharger. A location that we’ve never been to. 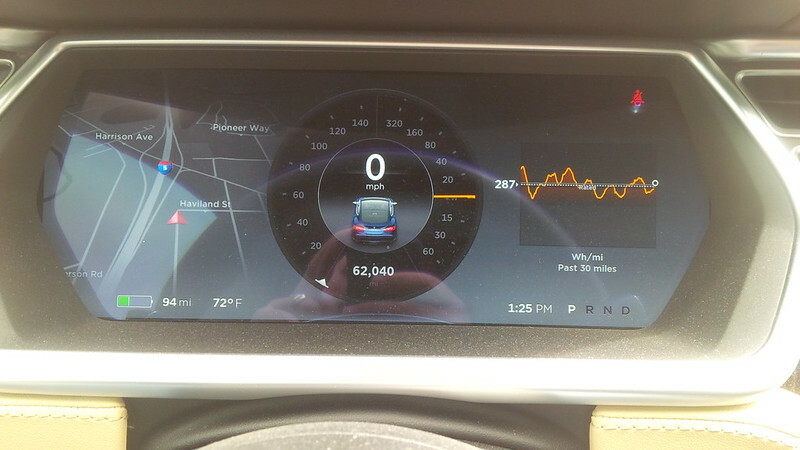 To prepare for that new location, I figured to check out the entries for the particular stop on Teslarati’s app (which is now available over a browser.) 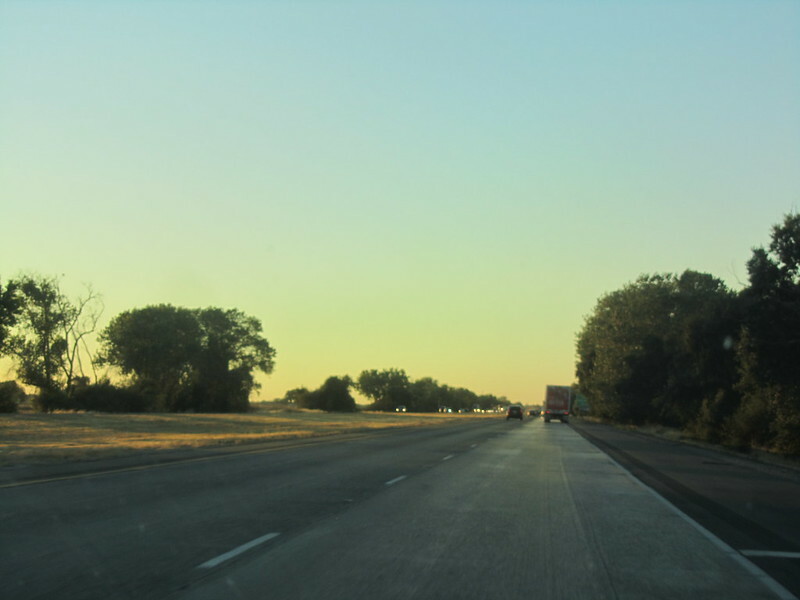 Looking at the comments, I stumble across one entry (from July 3, 2016) that put me a little “on alert.” Seeing that we won’t make it to the Corning stop (the one AFTER Manteca) I decided not to startle my wife on the entry that I read on Manteca. We were lucky in that the “wind” was favorable for us today. So, we drove North. 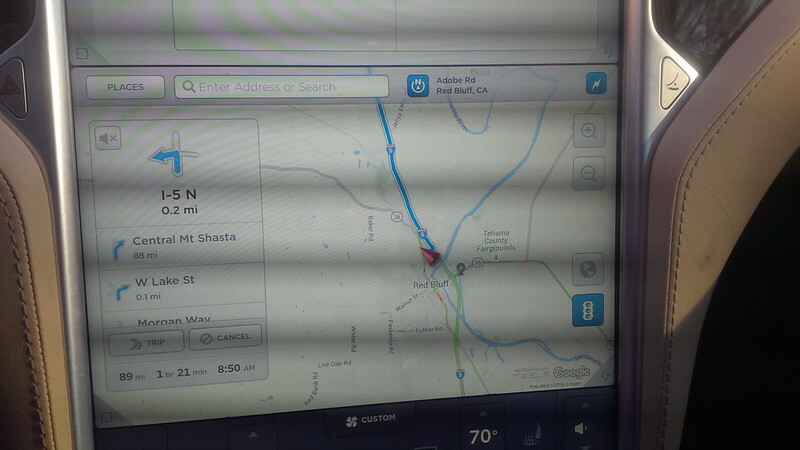 Where we normally would head toward Gilroy (the Garlic Capital of California), we stay on I-5 to get to the Manteca Supercharger. 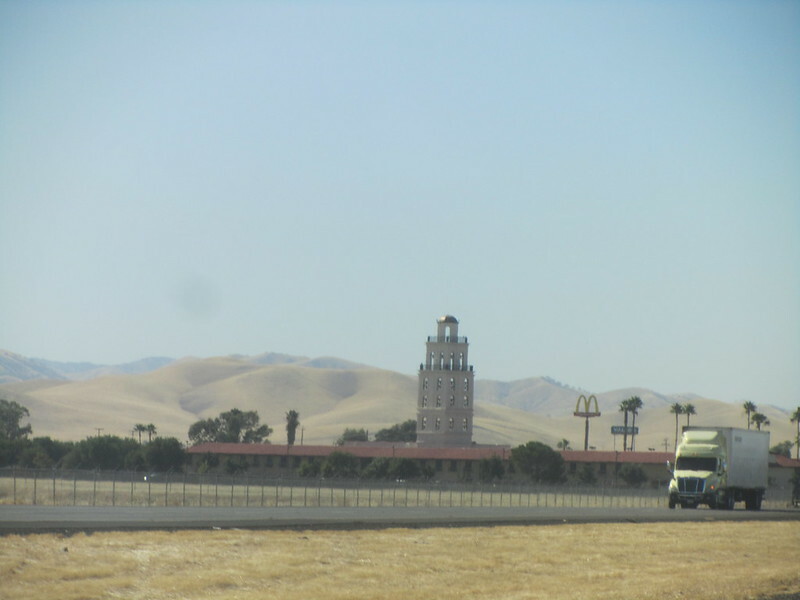 Just after the turn-off for Gilroy is an interesting site. Not sure what it was, but it looks like a cool church tower. I wonder if its one of the many “Missions” that Spain and the Catholic Church had set up throughout California. I suppose if I had spent the fourth grade in California, I would have known about the missions, but I didn’t. So, we zoom pass it. We keep seeing tomato trucks on I-5, but still no pasta truck. 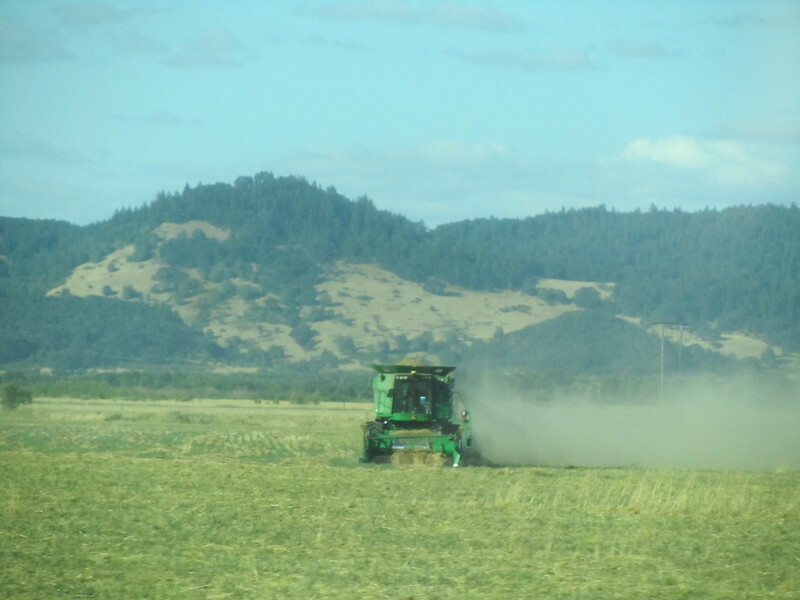 We see different crops. Not sure what these trees are, but it’s pretty orderly. 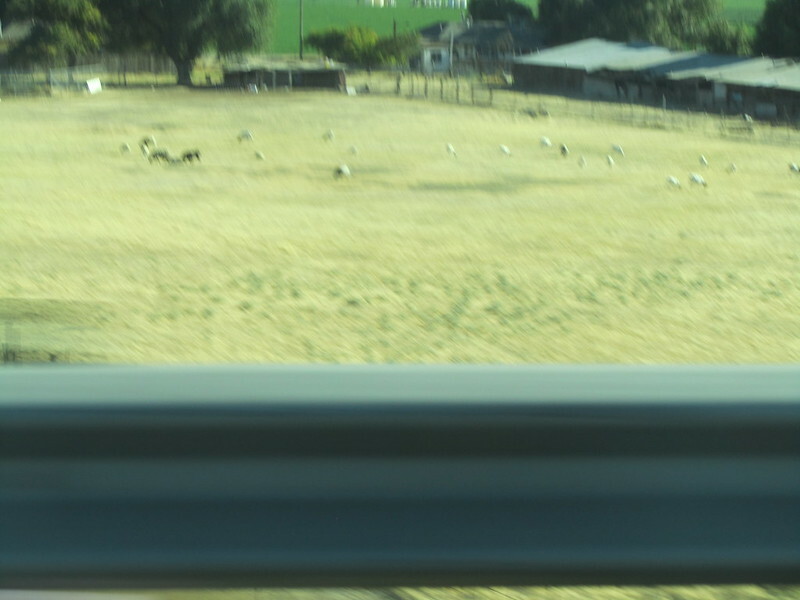 Been pretty used to seeing cows throughout the drive, but apparently, there were also sheep. 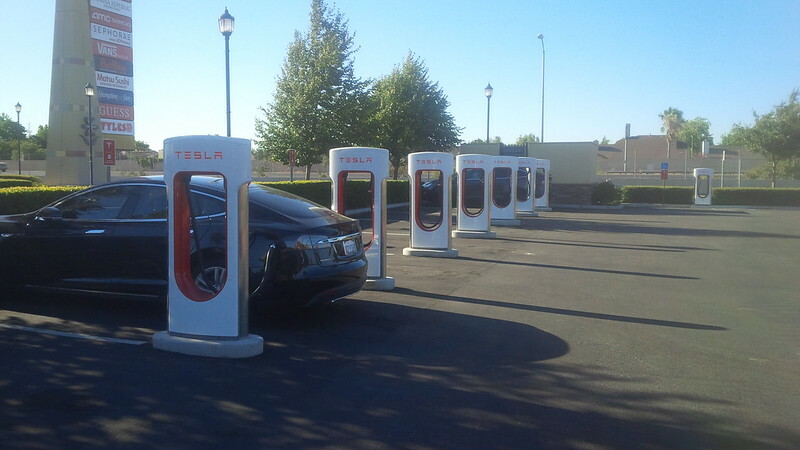 After a few hours of driving, we find ourselves at the Manteca Supercharger. This stop is going to be a longer one than our normal stops. 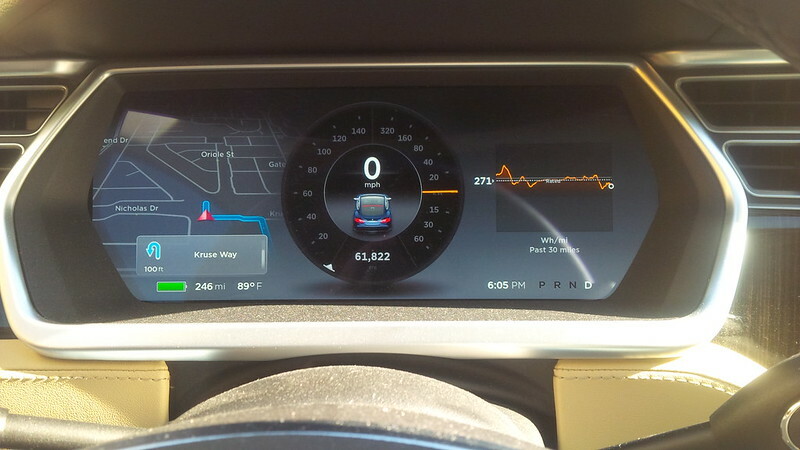 We arrived at the site with 58 miles of range left on the gauge. 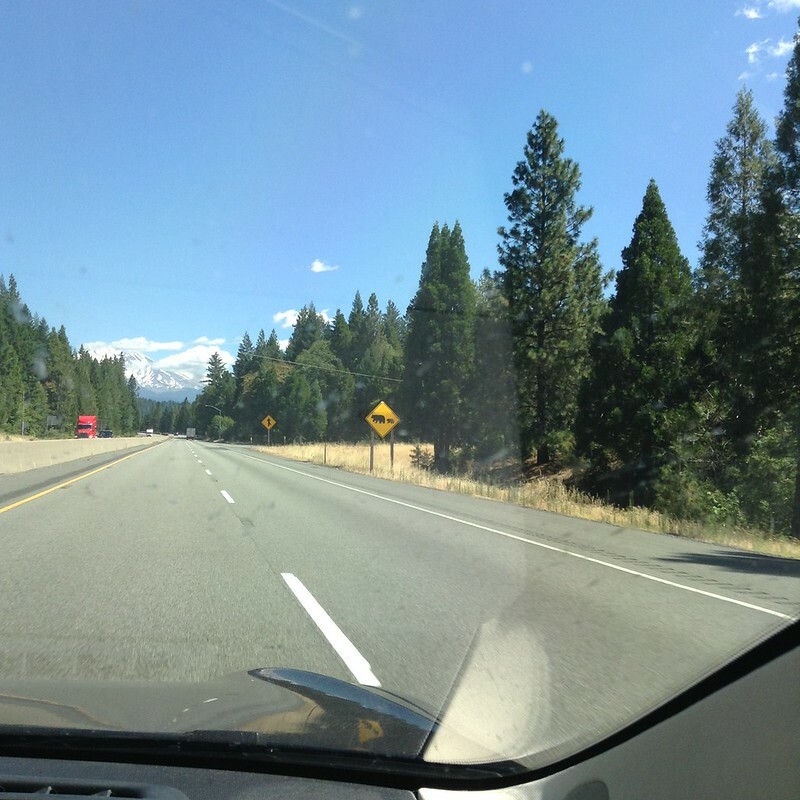 Our plan is to stay on I-5 and charge at the Corning Supercharger (177 miles away) and find a place to stay the night between Corning and Mt Shasta. 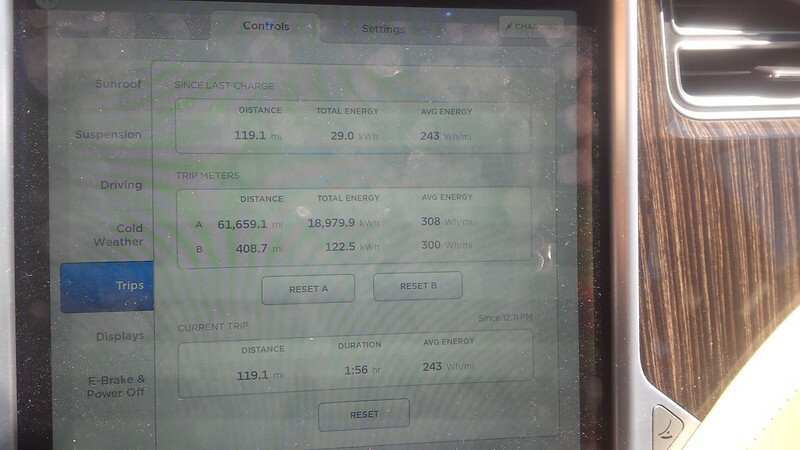 We like to have a buffer for our charge, so we planned on getting near a maximum range charge to provide us with flexibility as we head North in the evening. 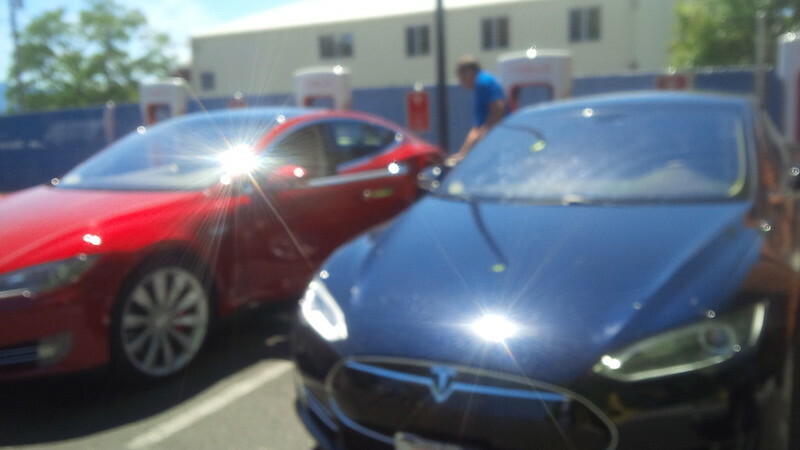 We were not alone at the supercharger when we arrived at Manteca. 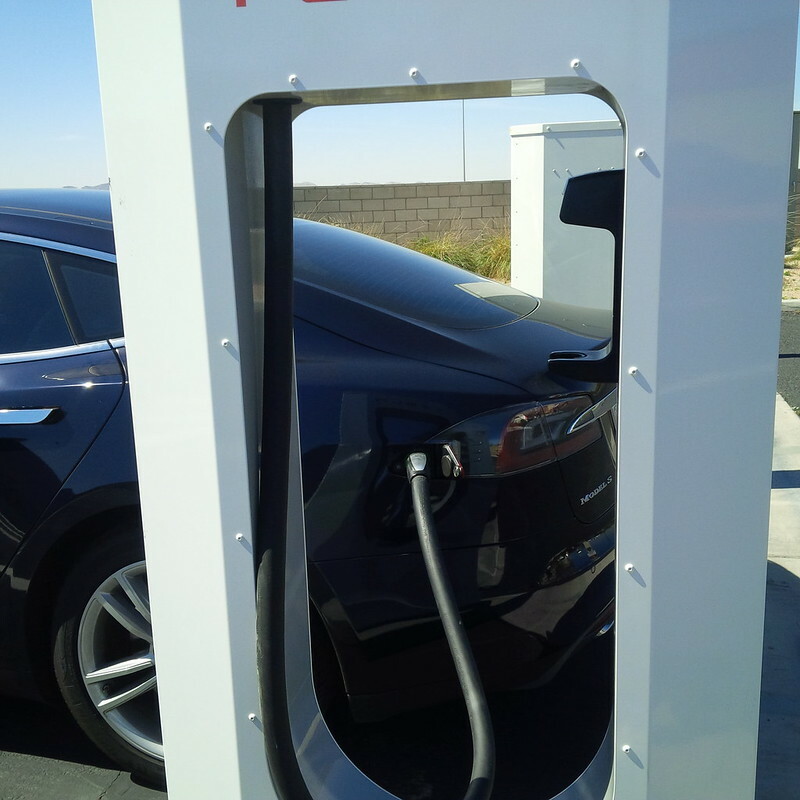 One of the things that one starts to notice on heavily traveled supercharger routes are fellow Tesla travelers or at least their vehicles. 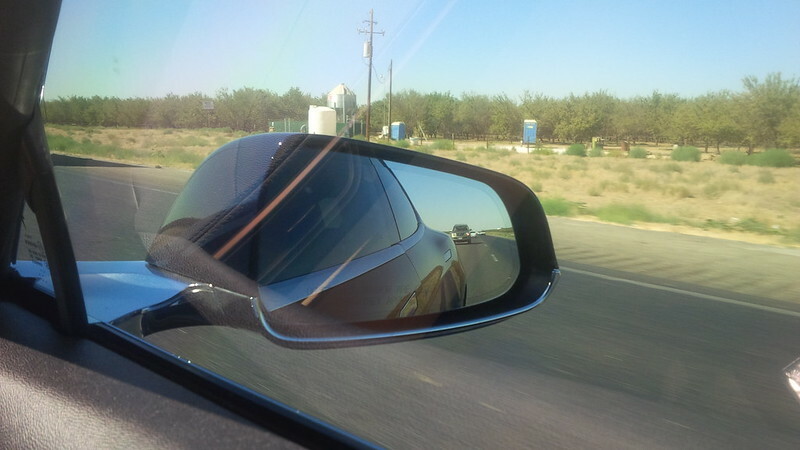 This stop was no exception, we’ve been traveling with the Model X at the far charger since Buttonwillow. 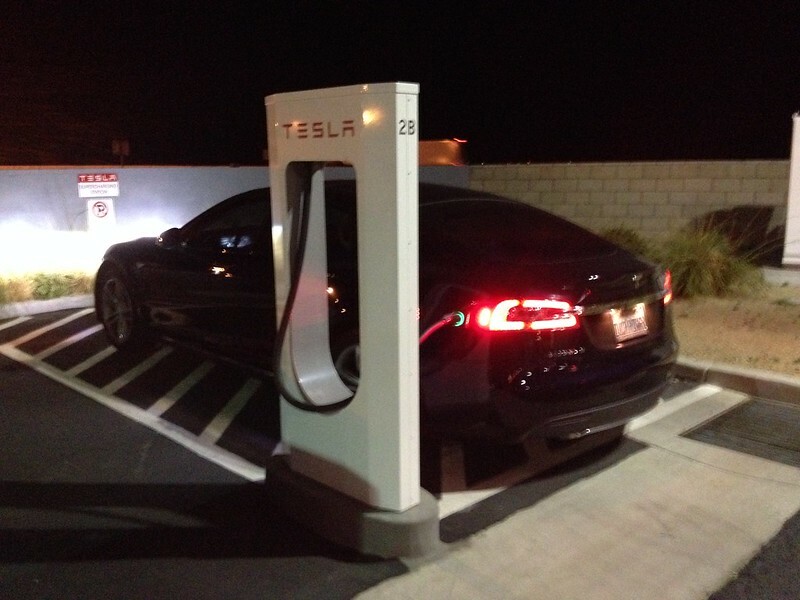 This supercharger is located in what looks like an like a recently completed shopping center. However, upon further inspection, I wonder if the center ever got to the point where it was full. I was a little comforted with seeing another car here, we figured to head out and forage. We walked toward some traveler convenient locations and grabbed some dinner. 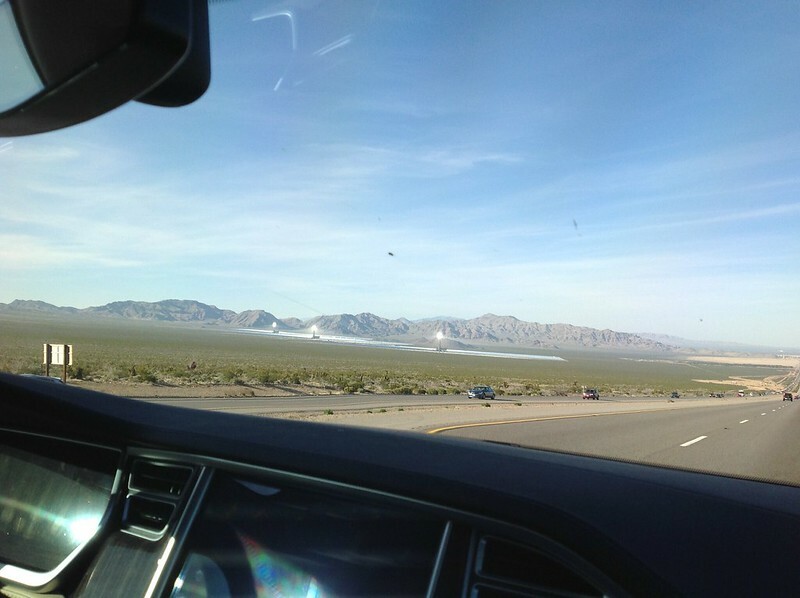 Because I was a little “on edge” from the entry on Teslarati and not wanting to leave the car unattended too long, we headed back. 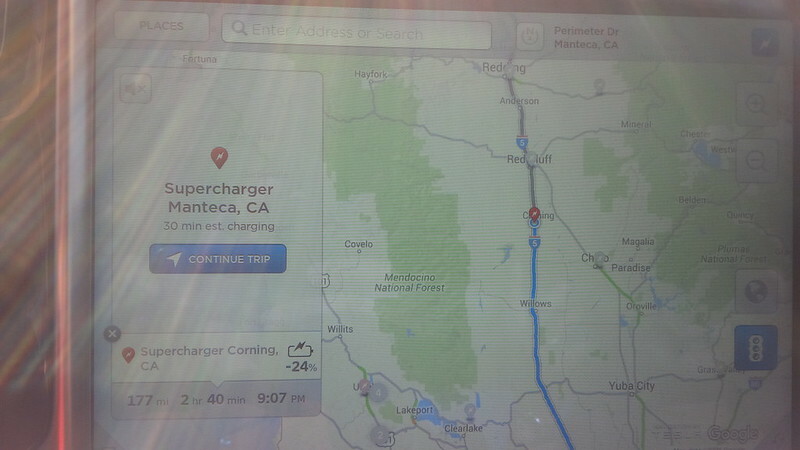 We stayed at the Manteca supercharger longer than the our fellow traveler in the X. 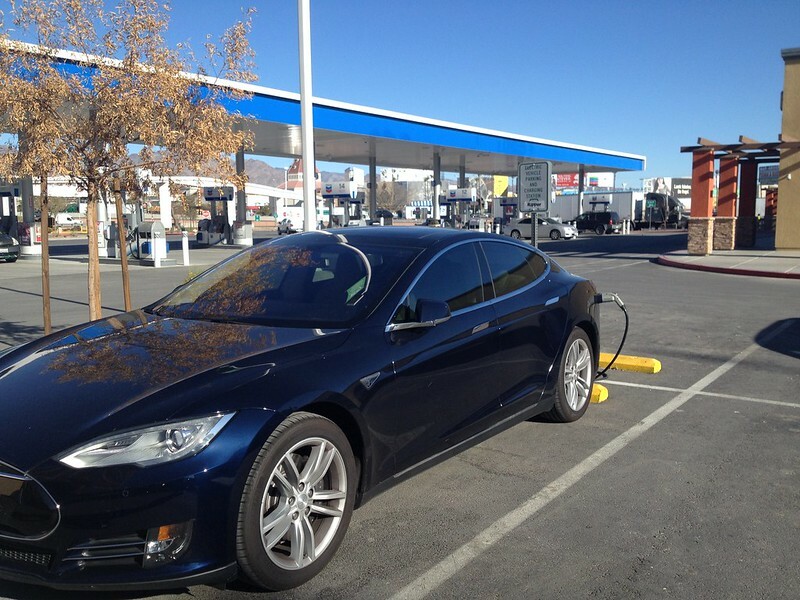 Without anyone else near us, these superchargers really feel remote from everything else. 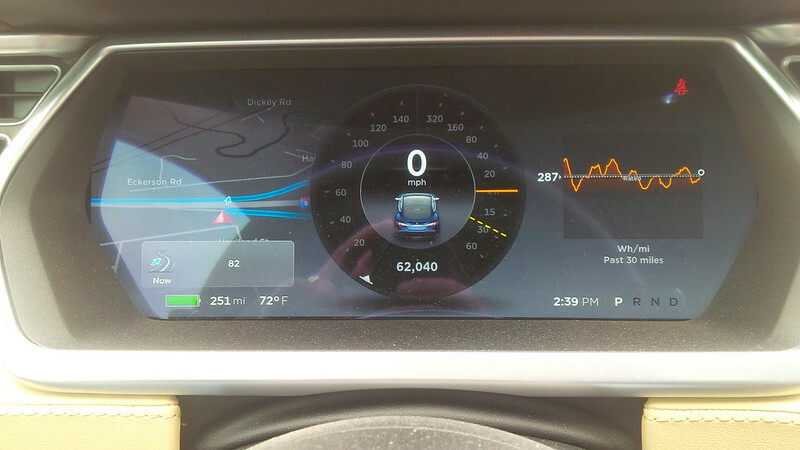 That entry on Teslarati really perked my awareness for danger, so I thought that it might be good to head out as soon as we had a “good buffer”. We proceeded Northward to the next stop for the drive. 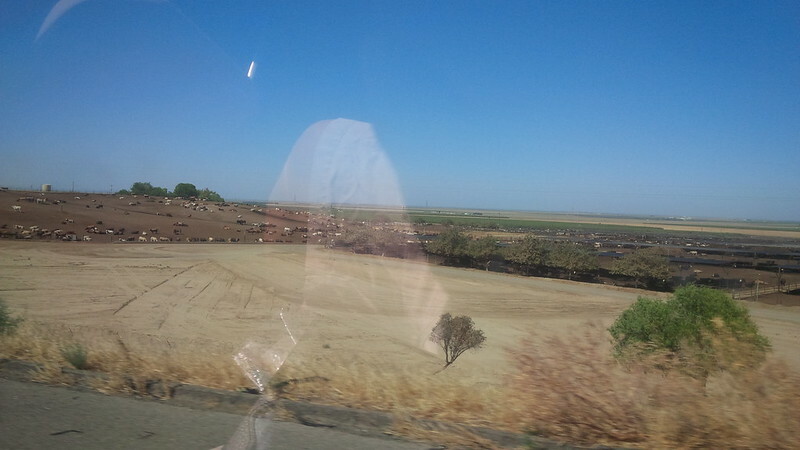 We’re definitely in the agricultural part of California on this drive. 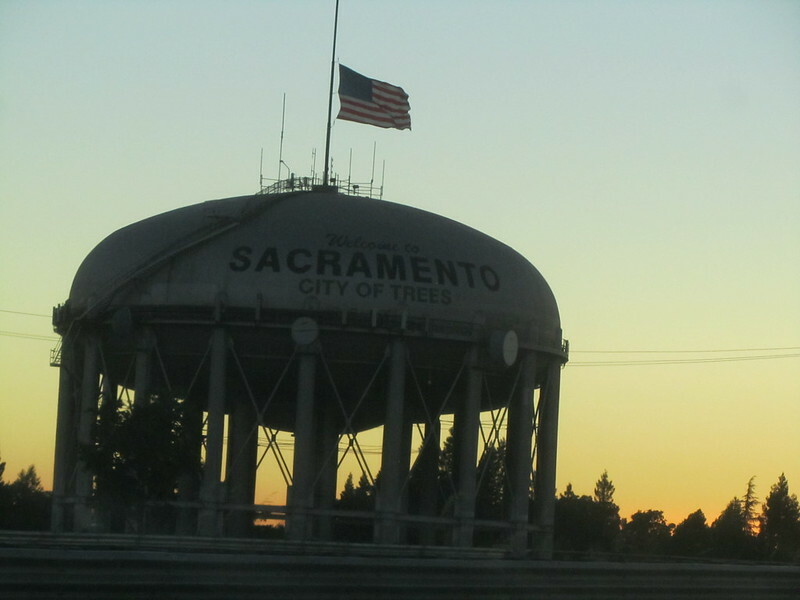 A water tower welcomes us to the State Capital. 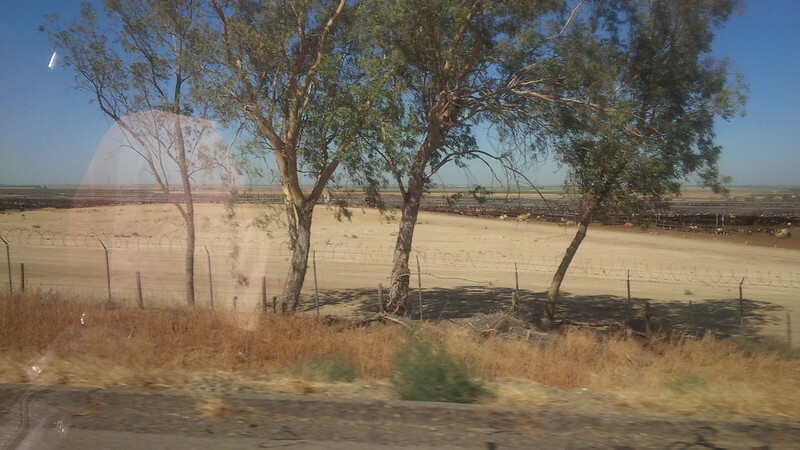 As long as the drought has been in California, part of me was wondering how full this particular water tower can be. 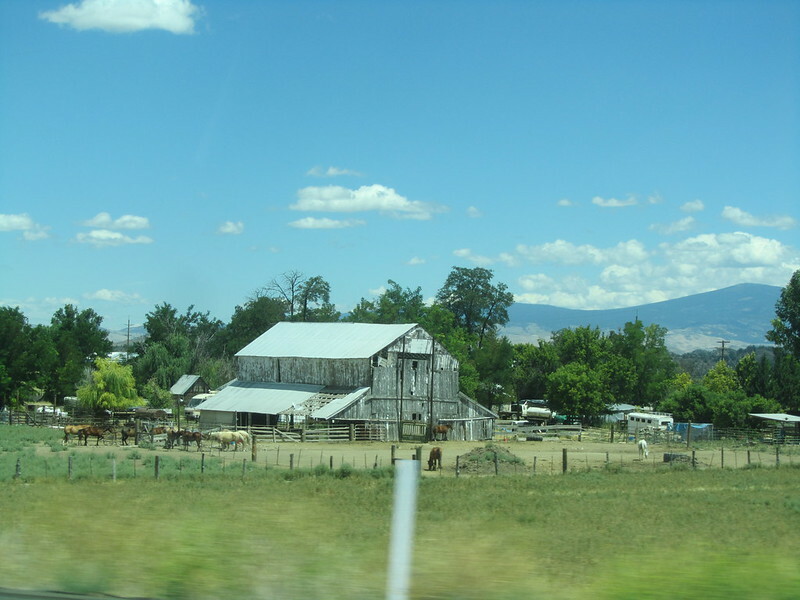 We pass Sacramento on our way to Corning and Red Bluff. 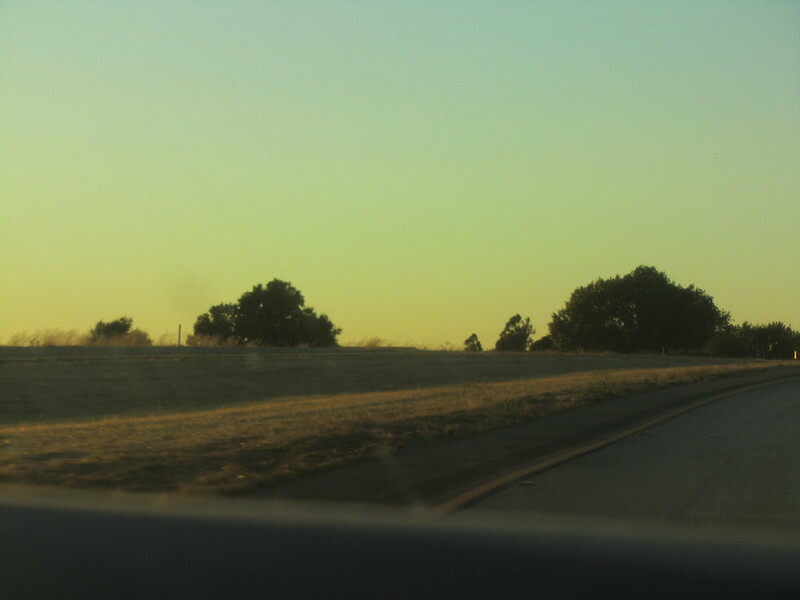 and have the open road ahead of us. 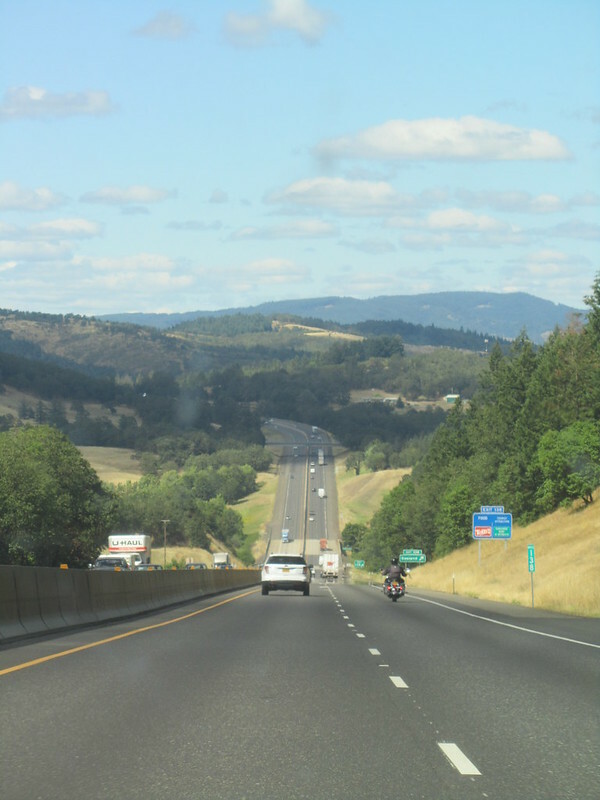 No matter how open the road is, Interstate 5 is simply not as empty as other Interstates. 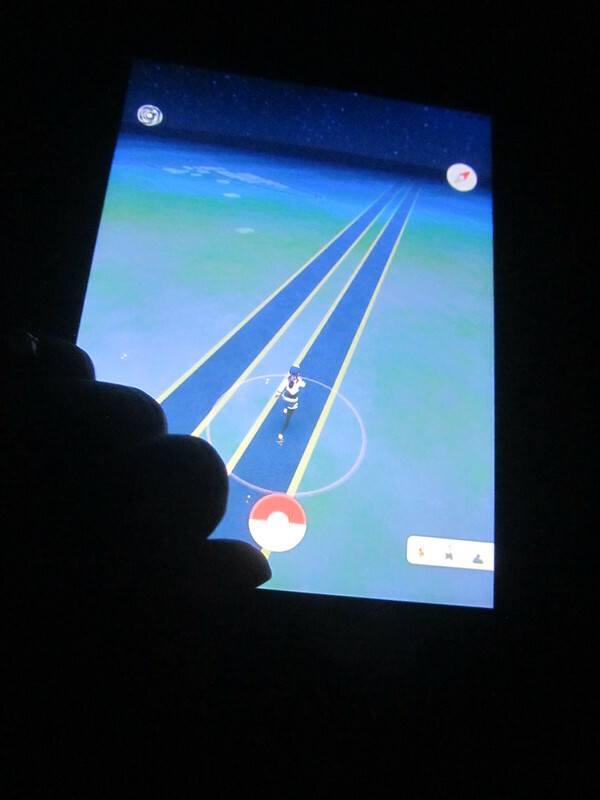 To pass the trip, one of the things that we’ve decided to do on this trip was to see if we can catch up to our 20+ year old nephews in Pokemon Go. Our thesis was that the makers of Pokemon Go would make different Pokemon common at different cities, so we tested this hypothesis and started playing the game. Here is a picture of my better half playing while I drove to Corning. We arrive at Corning in the evening and the parking lot was somewhat empty. 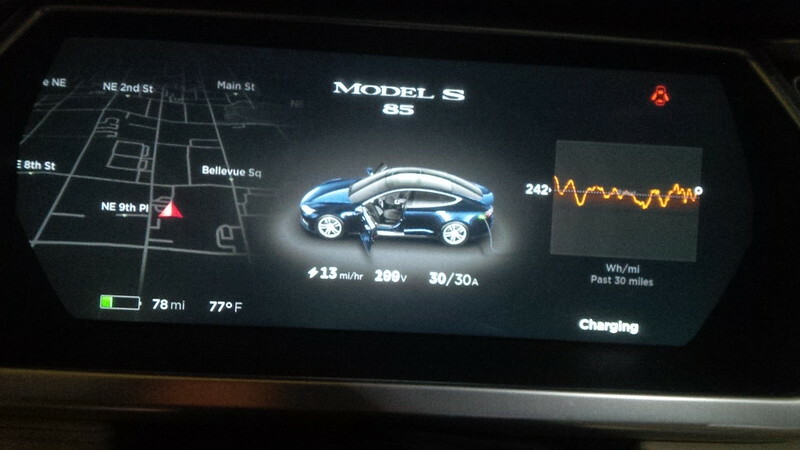 It was at this stop that I noticed that I was instinctively resetting Trip B on each supercharger stop. I basically sabotaged my plan on tracking daily usage and decided to measure TOTAL drive from this point forward for this trip rather than a day-to-day total as we’ve done in past trips. 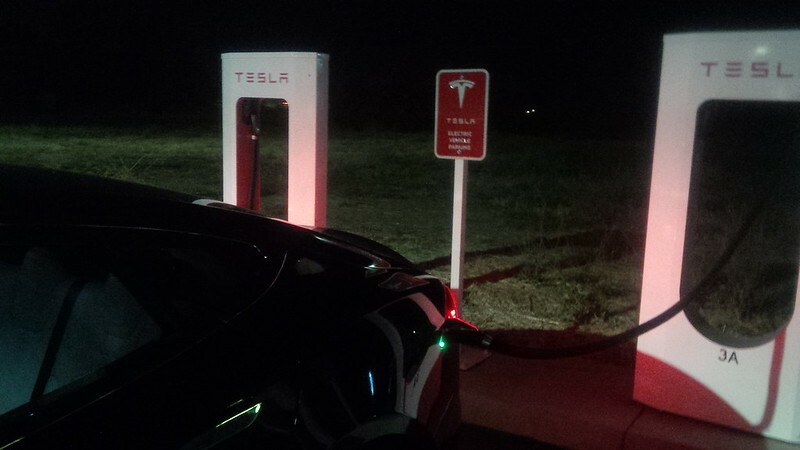 This location was a little “scary” at night, not Green River, UT “scary”, but a little more unnerving than the Buttonwillow, CA Supercharger at night. There was a strange person hanging about, so we stayed for as long as we felt safe and headed twenty miles down the road to our hotel for the evening. 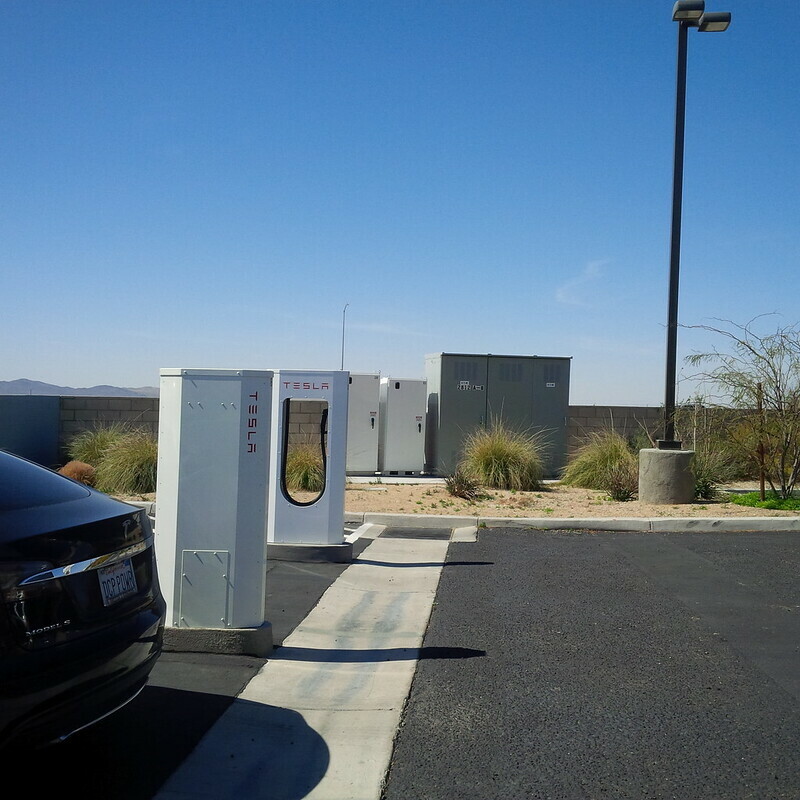 I was glad that we decided NOT to rely on charging at the Hampton Inn overnight as the NEMA 14-50 chargers for the hotel is located on the extreme side away from the main desk and at a location of the parking lot that seems to be exposed. It turned out that the new desk clerk I spoke to was incorrect and that we could have parked and charged for free at this hotel. 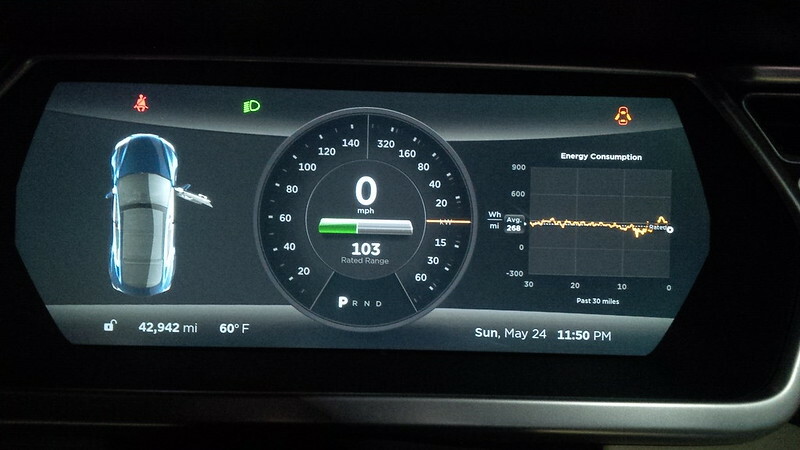 Having the car parked closer to where I felt the car would be safer was more important than getting a slow charge overnight. 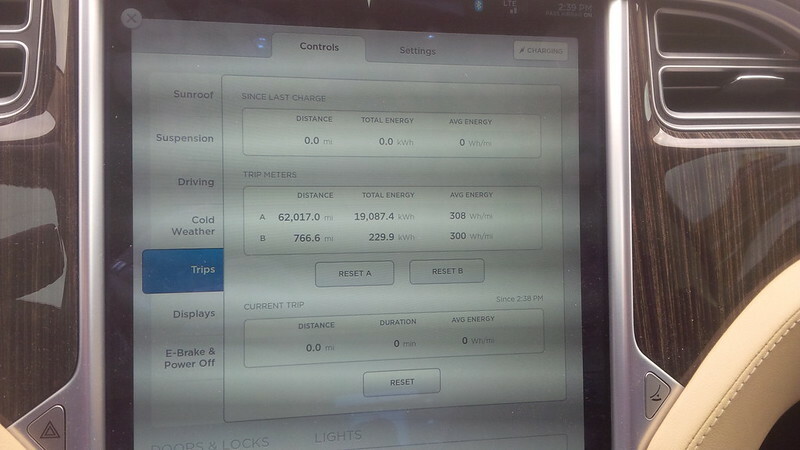 We decided to park the car near the front with a full 200 miles of range left and left the car on “always connected mode” rather than let it go to charge saving mode as we turned in to the hotel for our overnight rest. 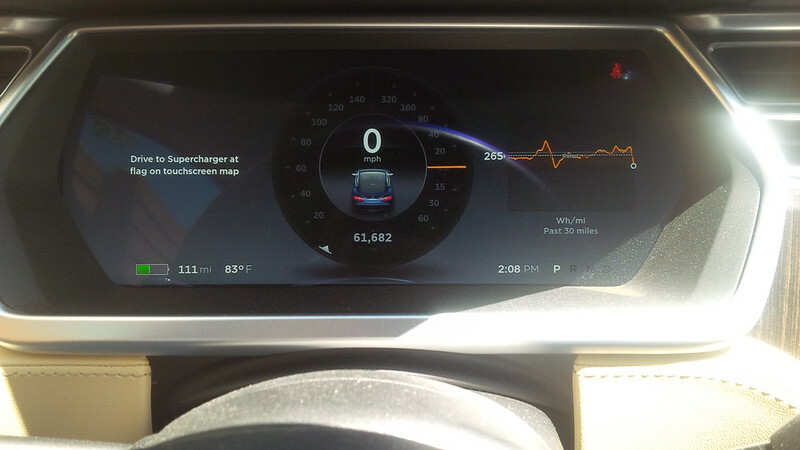 I planned on plugging the car in for a slow charge in the morning so that I can familiarize myself with this location and to “add it” to my car’s “places that I charged” database. With the plan in place, and shelter found for the evening, we turned in after driving over 575.8 miles for the day. 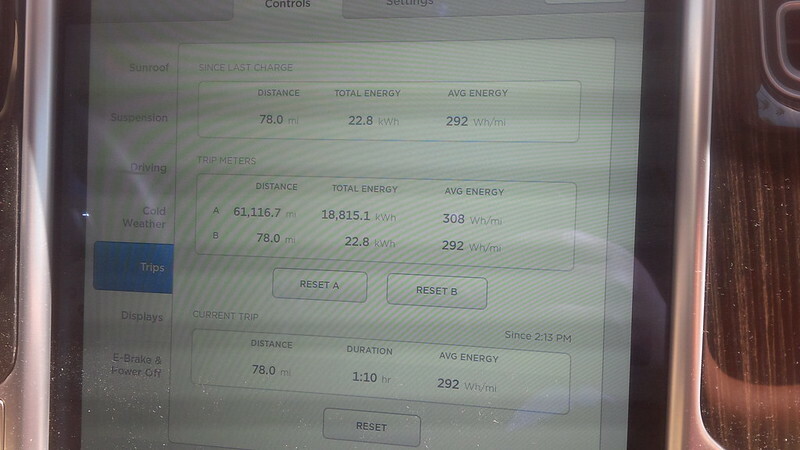 Not quite the power-drive from last year, but definitely not a leisurely stroll. Click here to continue on to the next day of this series, Day 2. 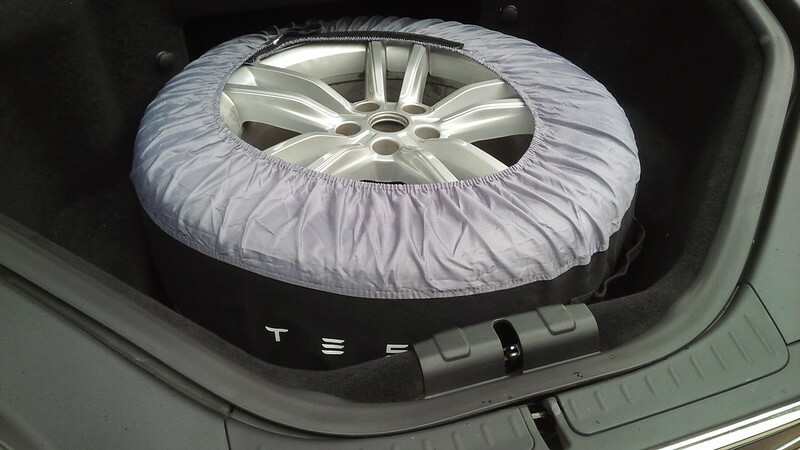 It’s another year that we’re committed to things around Southern California, so, we’re missing the East Coast festivities for the Tesla Roadtrip (2016 theme is “Future Meets the Past”.) Typically, as the weather warms up, many of my Twitter friends start driving around. 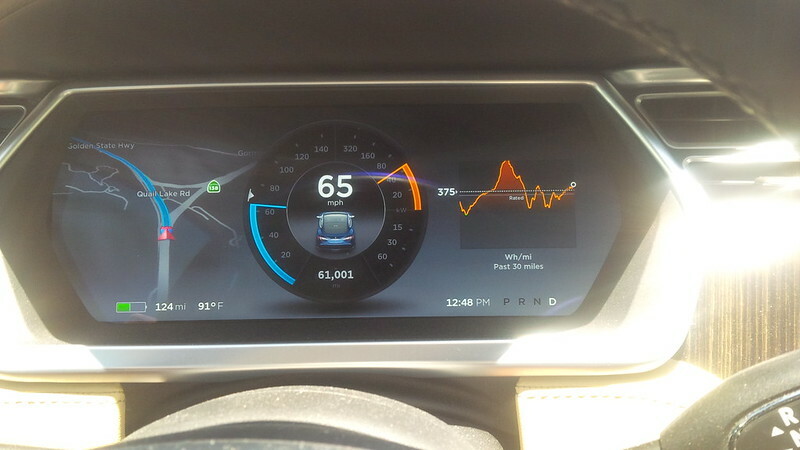 When we’re unable to make a nice long drive in our Tesla, I like to use Twitter and the forums to read about folks who are taking nice long drives in their cars. 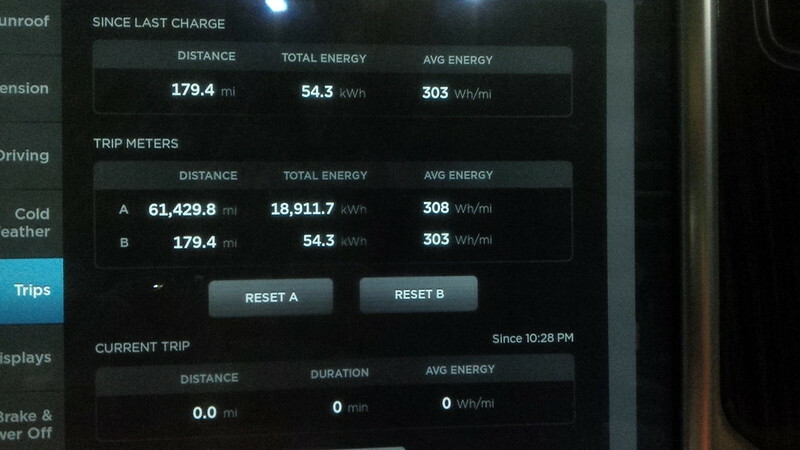 I’ve tracked @EnduranceDriver and @p85ddeena set some records last year. Not the sort of coast to coast driving that I’m accustomed on doing. 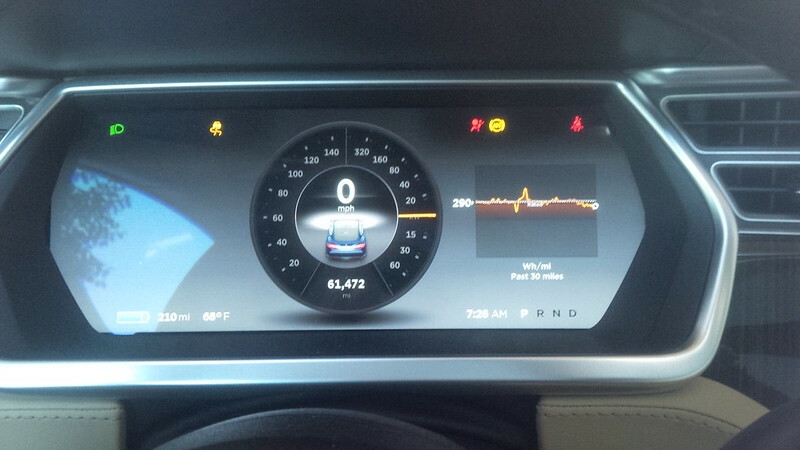 But it was entertaining to see this team break the Cannonball Baker or Cannonball Run using Autopilot in a P85D Model S followed with another drive that went from LA to NY to LA. Similar to this new one that caught my eye recently. Which brings us back to the latest trip to catch my eye. On May 1 in the United States, an interesting Twitter account popped up on my timeline. One BIG thing to note with these guys trip is that the Superchargers in Australia are only currently between Melbourne and just North of Sydney. 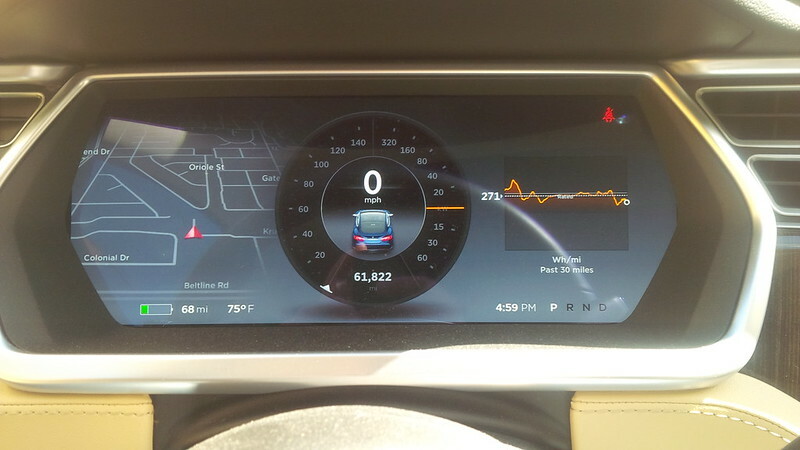 That distance is approximately the distance between driving from the Tesla Supercharger in Redondo Beach, CA to the Tesla Supercharger in Grants Pass, OR plus an additional 40 or so miles. 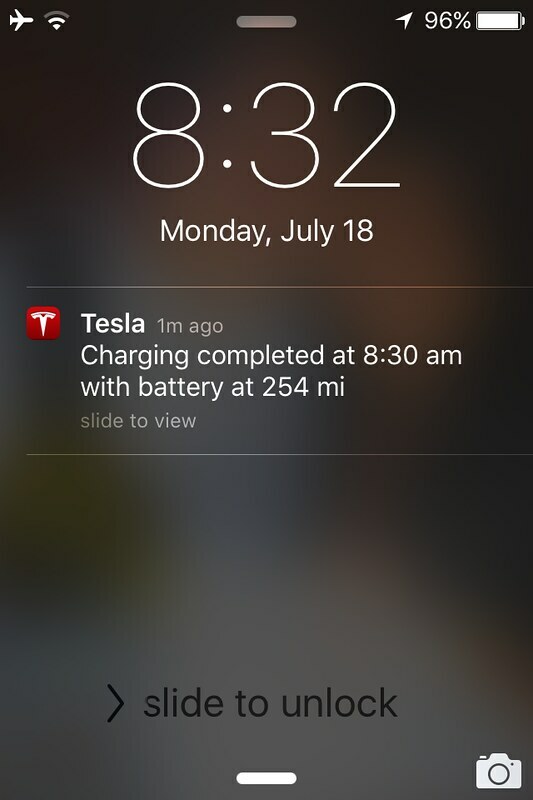 This means that the majority of the drive for this team will NOT be on Superchargers. 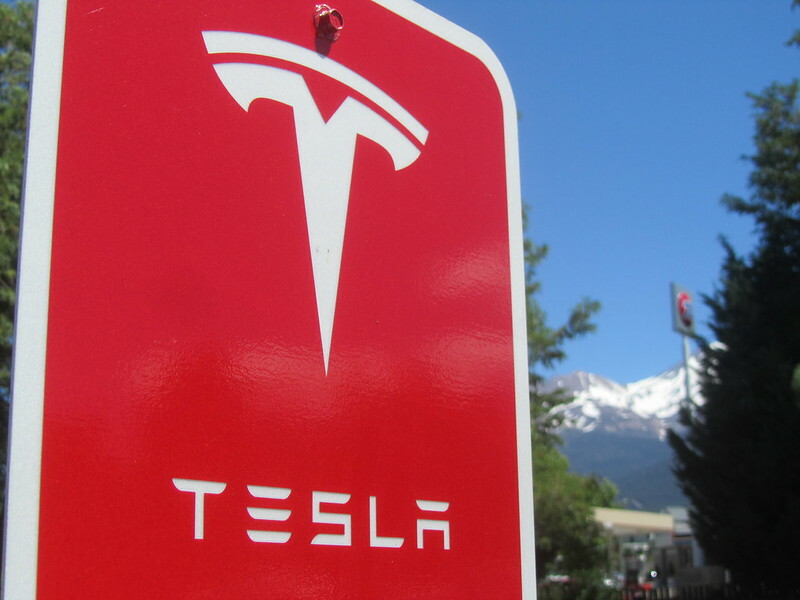 They won’t experience the joy and speed of supercharging their car until they reach Melbourne and the one at the other end of their journey in Brisbane is “in permit status” according to supercharge.info. 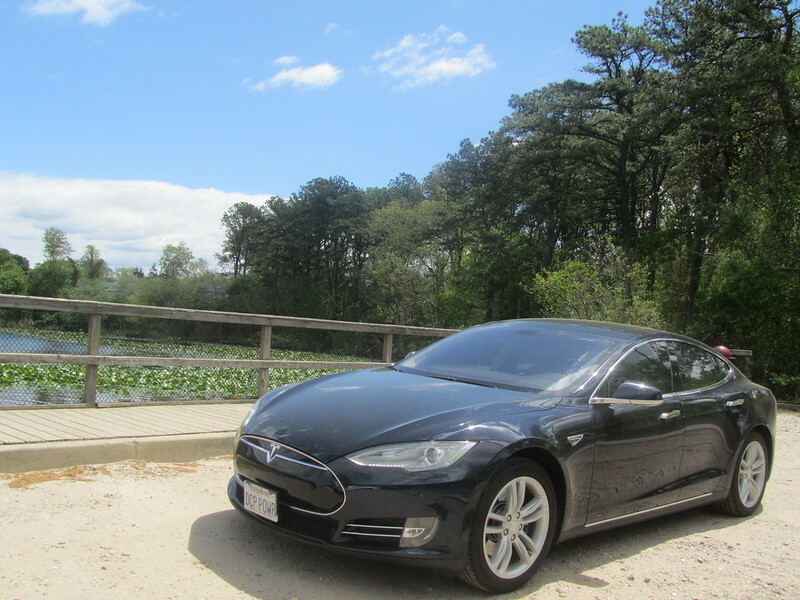 In doing further research into this trip, I notice that Nullis Arbor, Unum Tesla was hashtagged on the second tweet for these adventurers, and being a Latin Scholar (2 years of high school) I translated this to be no trees, one Tesla. 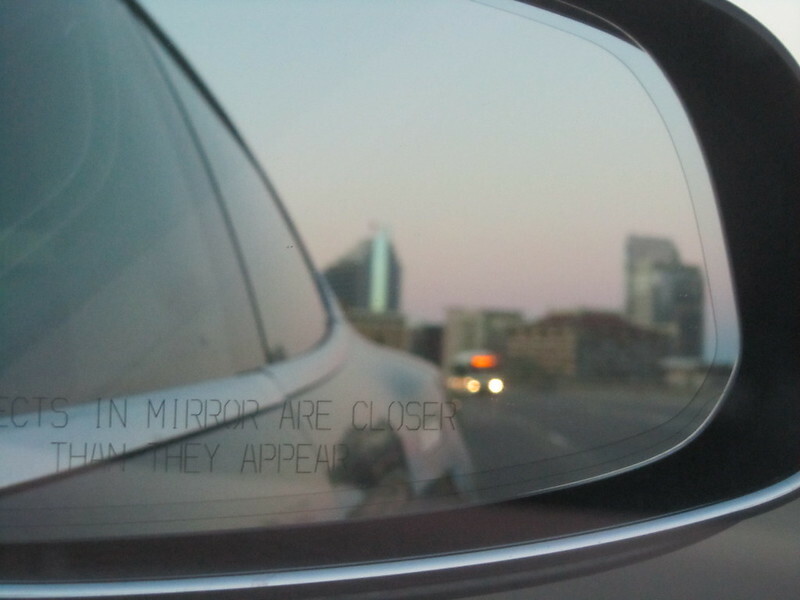 This interesting hashtag is how I found out that the team doing this drive is also posting their adventures on teslamotorsclub.com from the account MDK. Here are a few of the first few Tweets from the @TransOzTesla account. 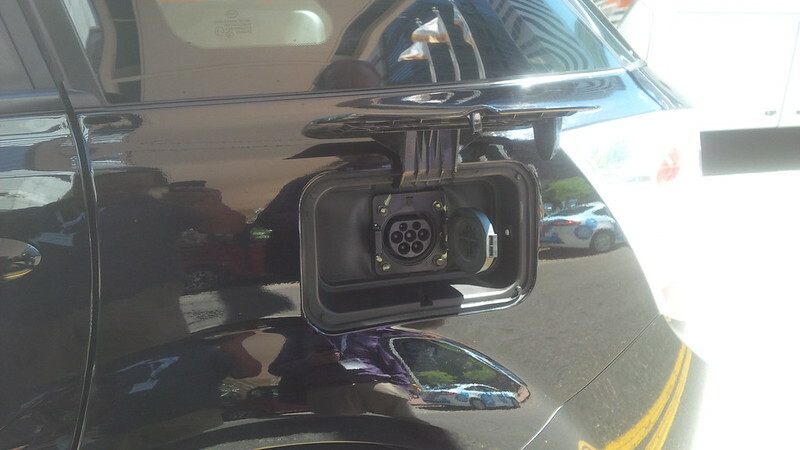 Like a good EV Citizen, the guys are also adding in to some of the user contributed EV charging network apps by verifying and inserting available charging plugs for future drivers to know about. 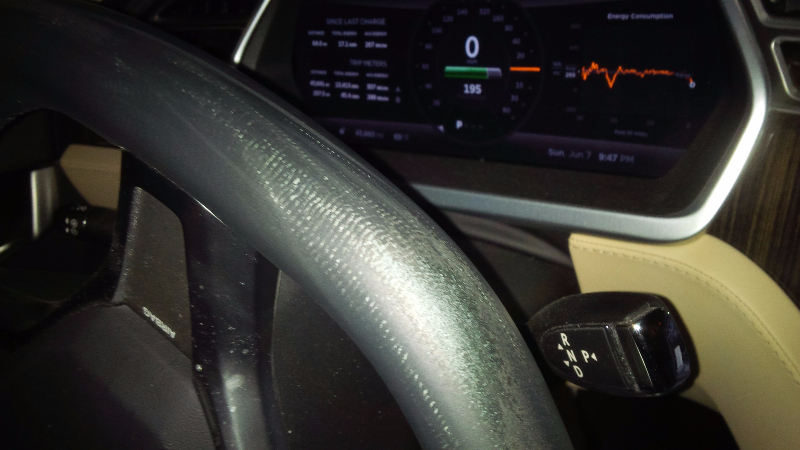 As I write this, I assume they’re sleeping (Perth is GMT+8 and I’m located PDT=GMT-7/BST-8) and recharging the driver(s) and the car (it was at 70%) when I looked using the Visible Tesla link that he provides on his tracking website. BMW Active E, Signature Green Roadster #40, and an 85kwh Tesla Model S with delivery of early November in Blue/Tan, Pano Roof, WITH Sub-zero Package in Southern California… Because COLD is a relative term. BMW Active E, Signature Green Roadster #40, and an 85kwh Tesla Model S in Blue/Tan, Pano Roof, WITH Sub-zero Package in Southern California… Because COLD is a relative term. Stay tuned. 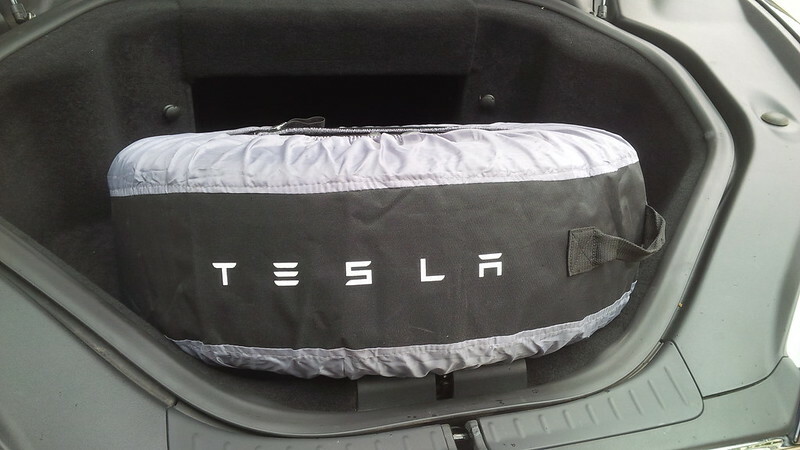 I’ll probably be updating the blog more often and/or teslamotorsclub.com and my new Flickr group – Tesla Model S Delivery weekend. 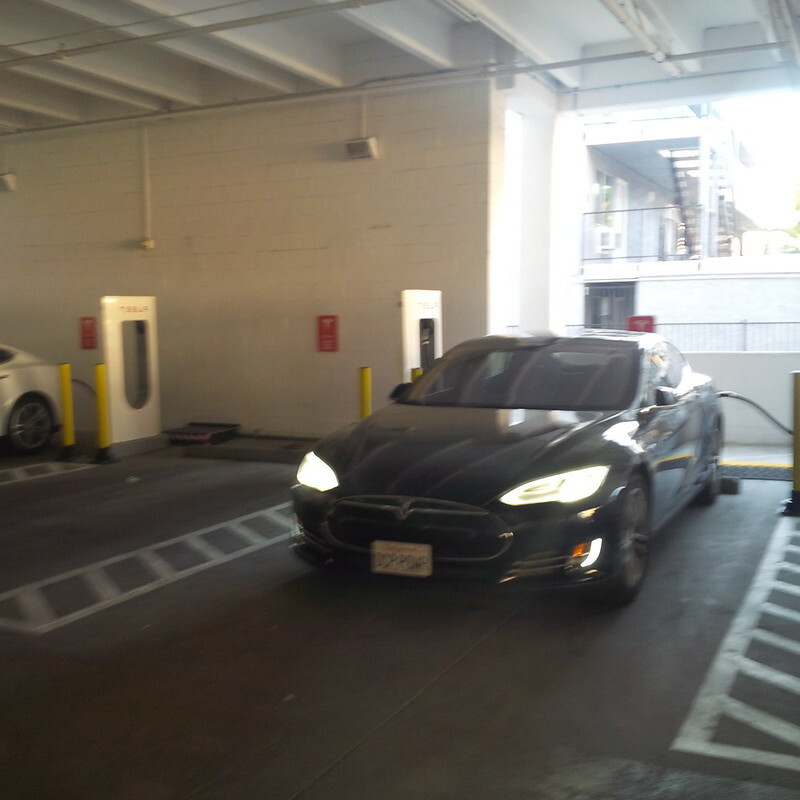 Until we pick it up and start uploading pictures, I’m using a picture of me at the Hawthorne supercharger as a place holder. Can you tell that I’m excited?